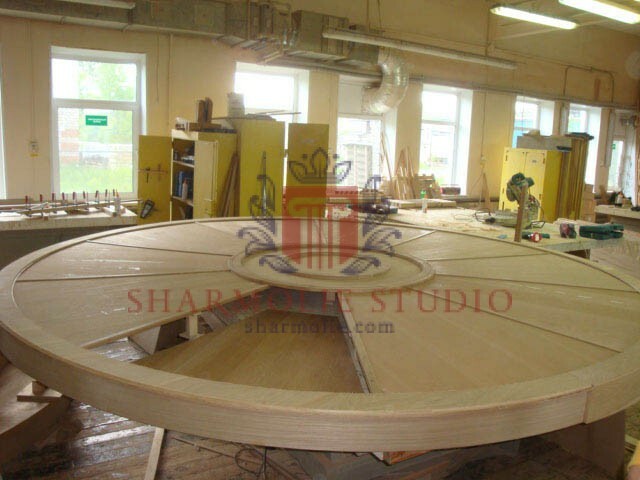 Production time from 5 days from the date of approval of the project Delivery and installation in the Nizhny Novgorod region as a gift! 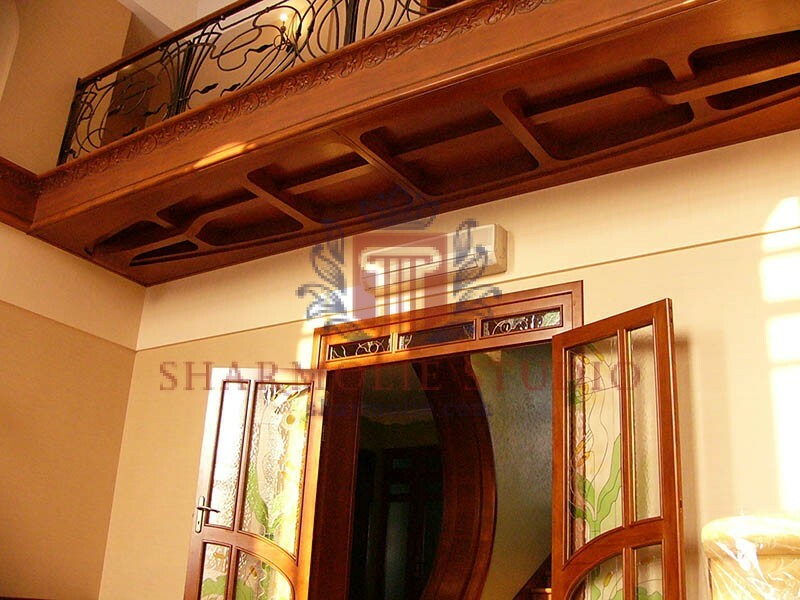 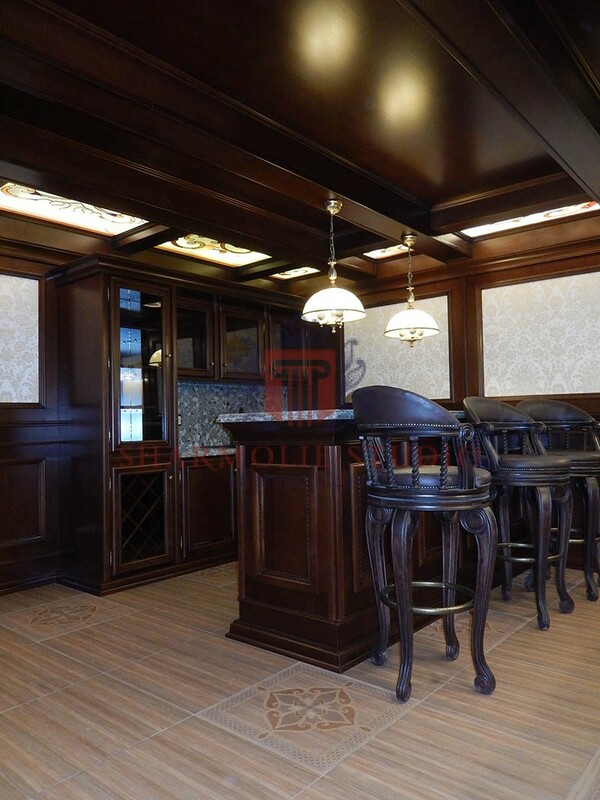 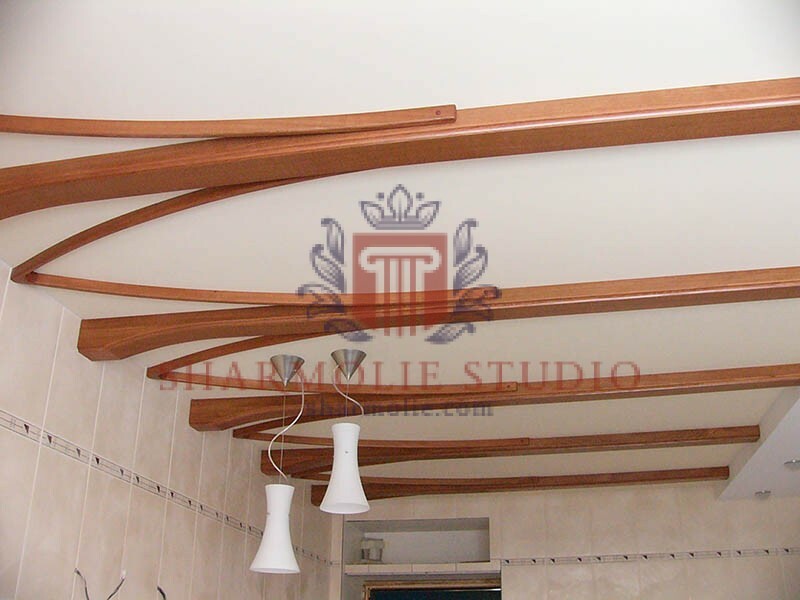 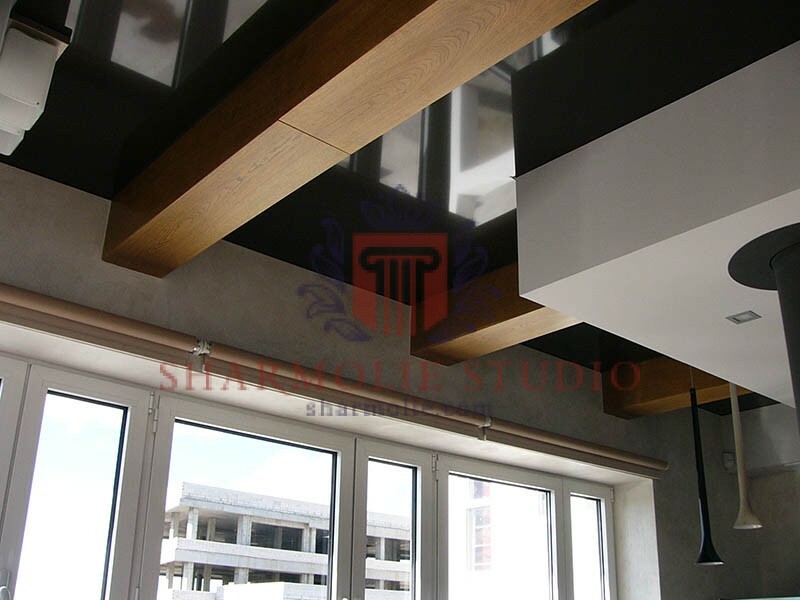 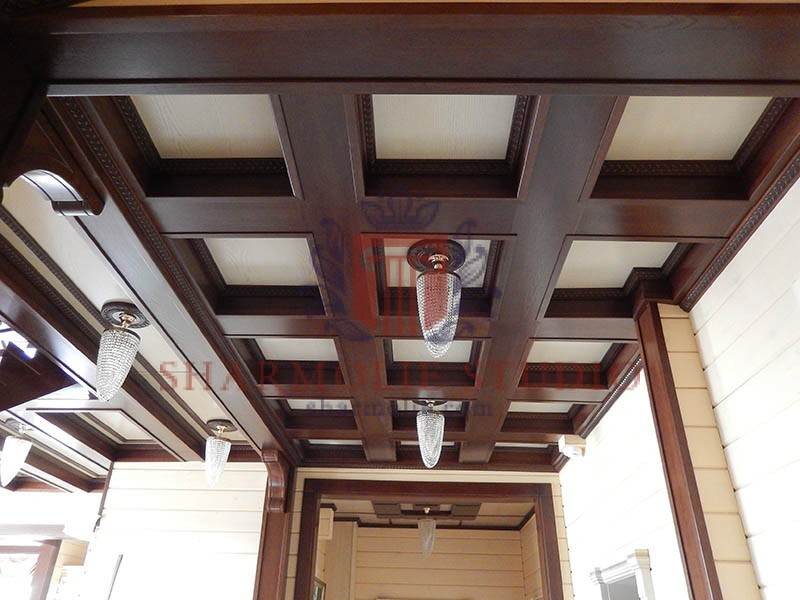 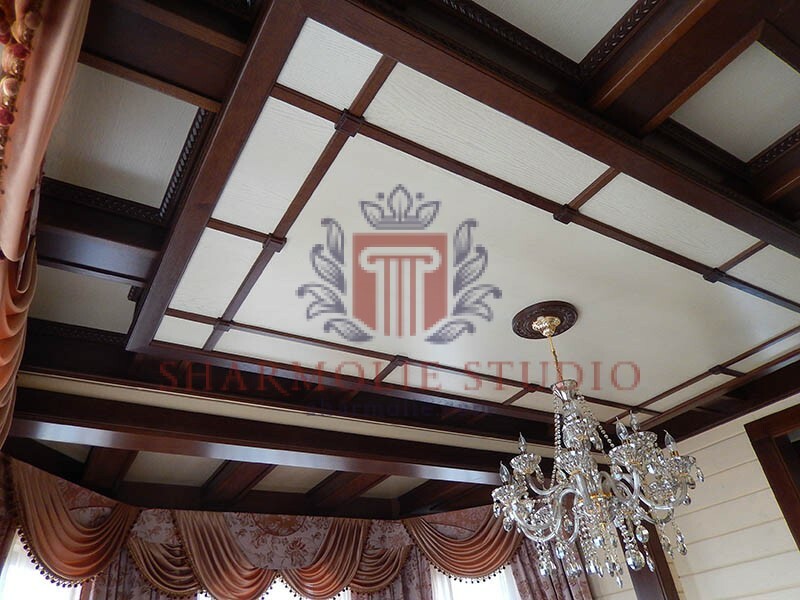 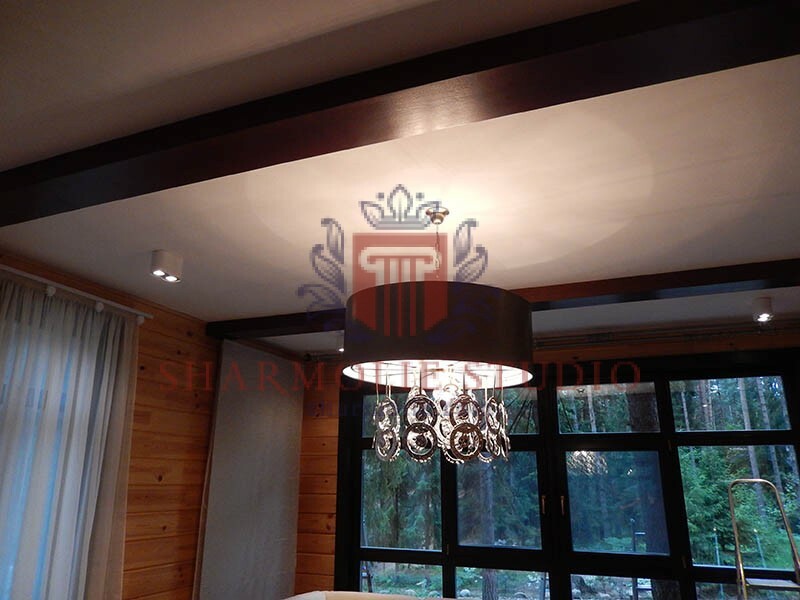 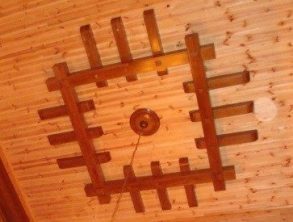 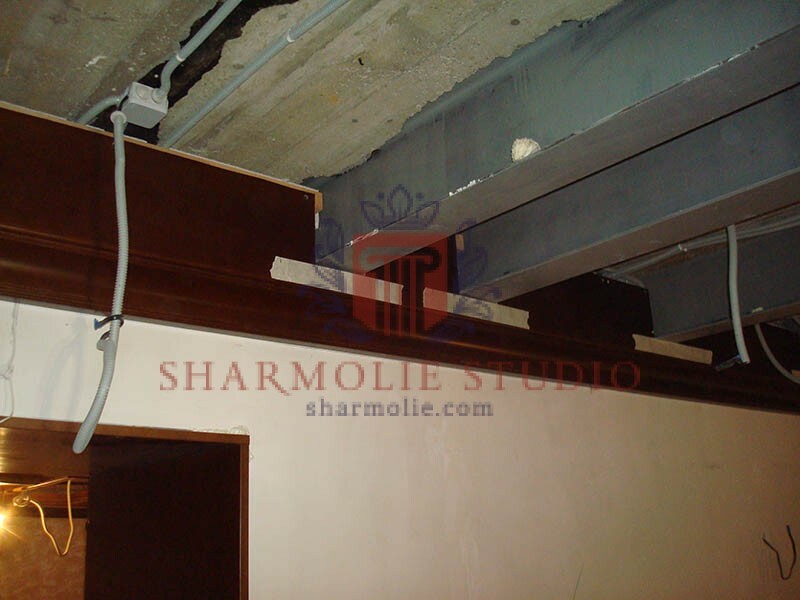 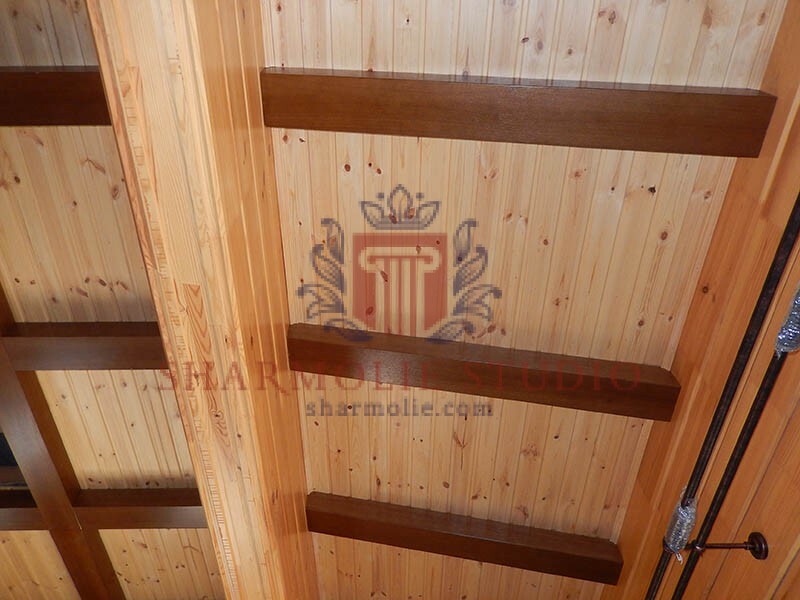 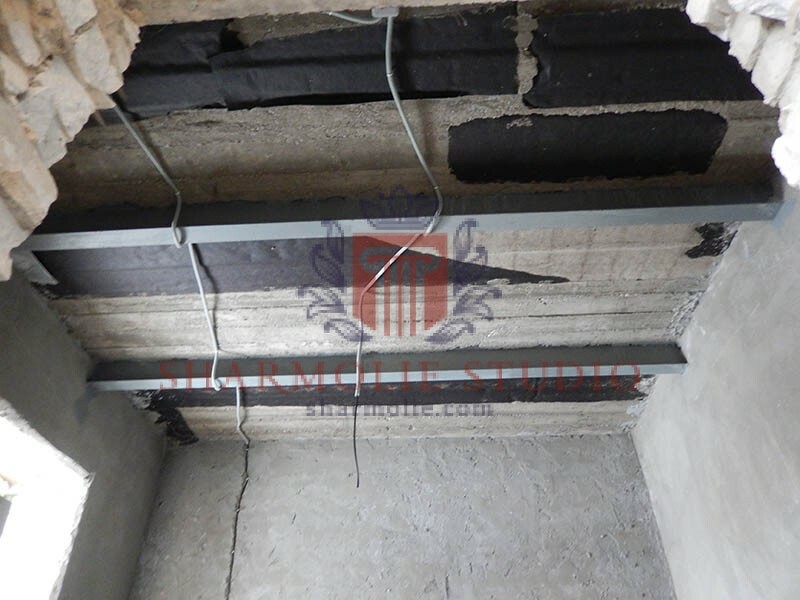 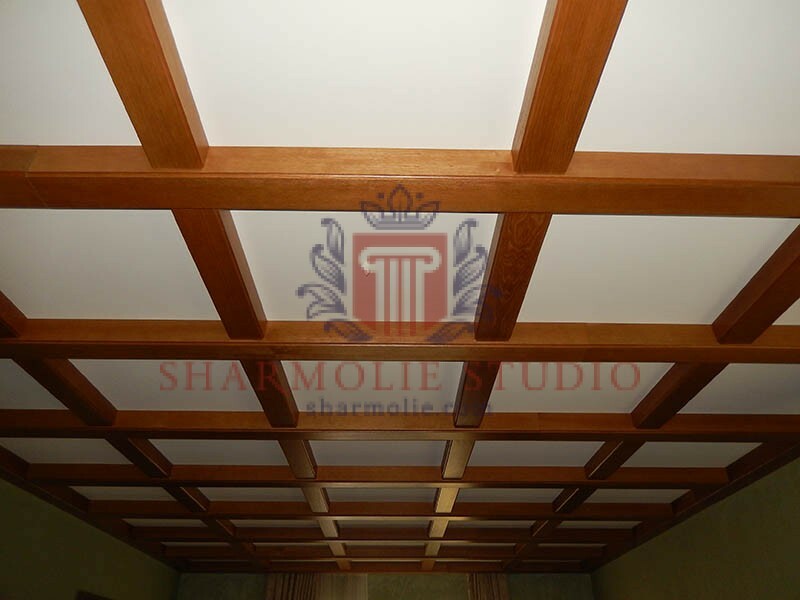 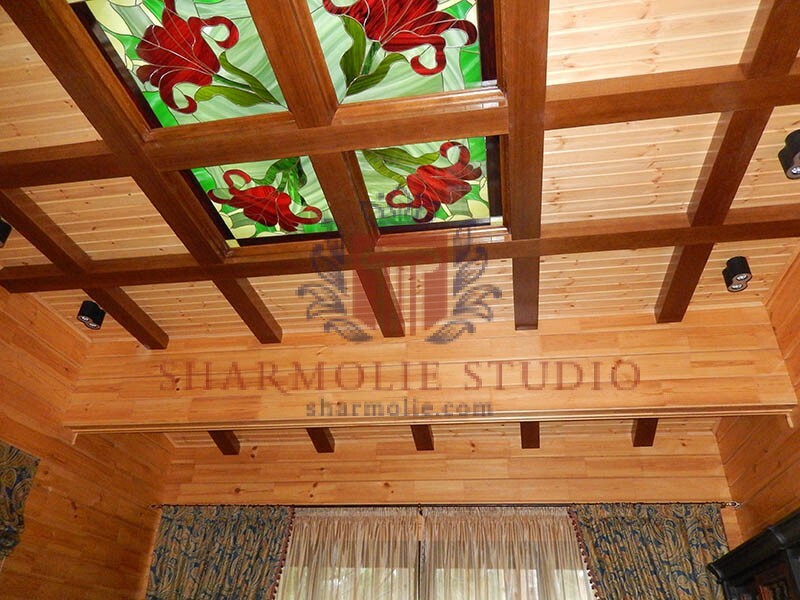 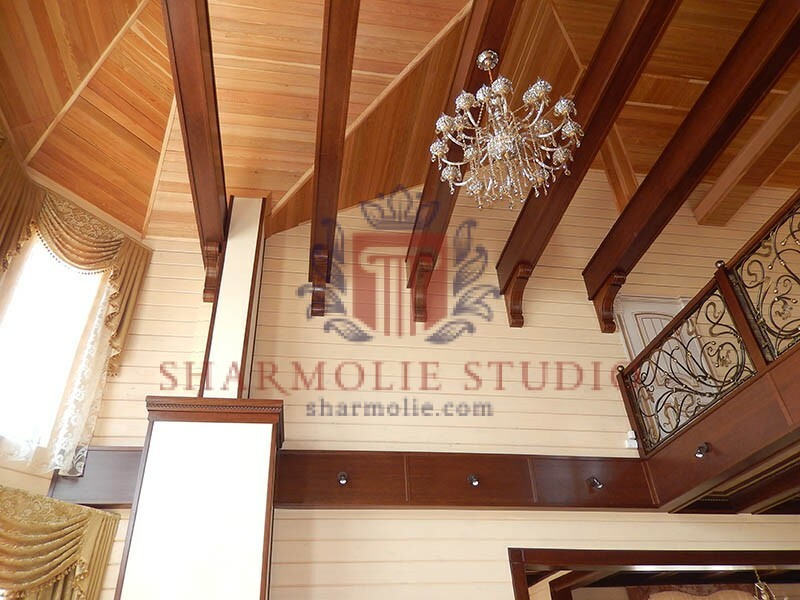 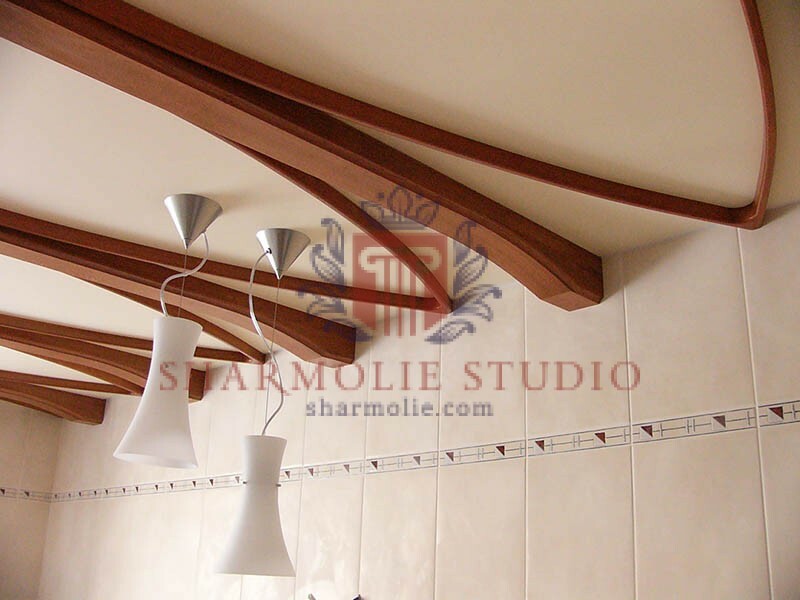 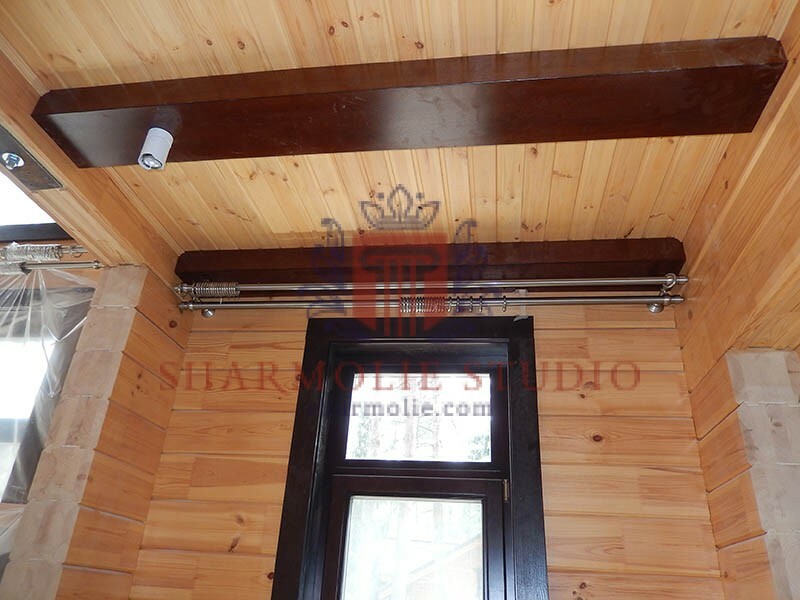 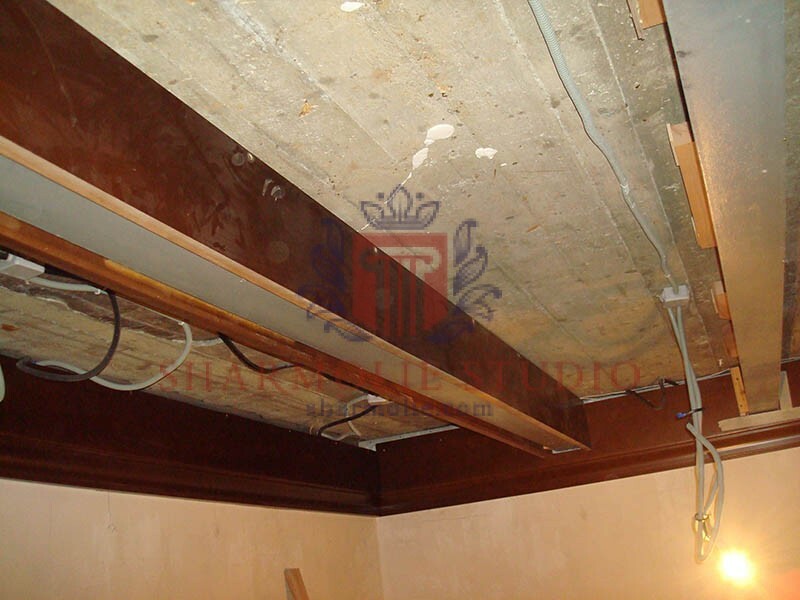 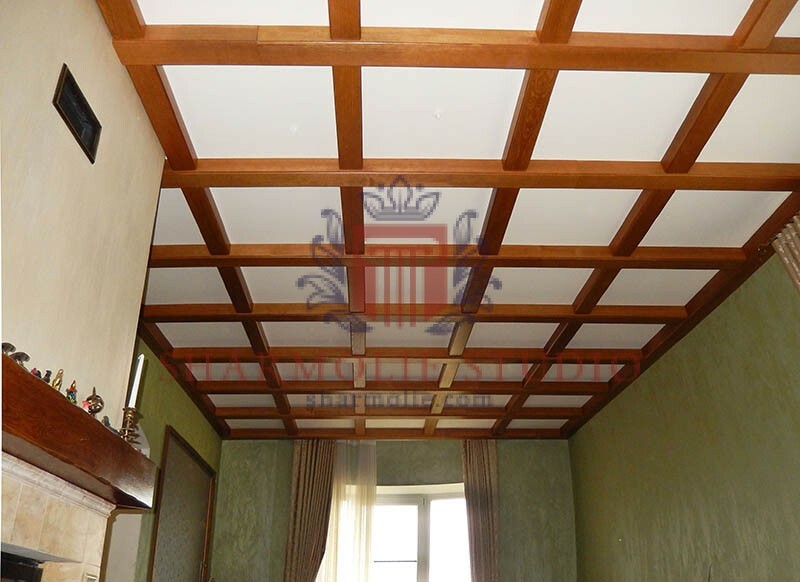 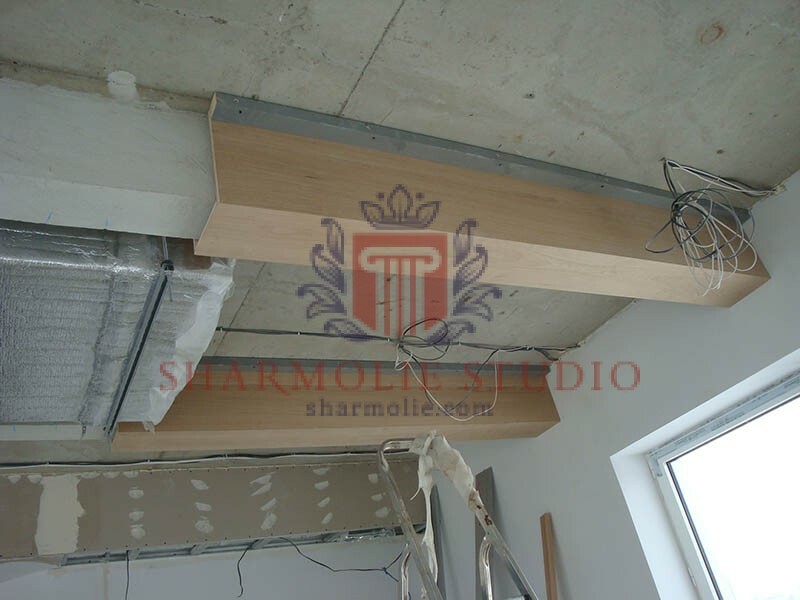 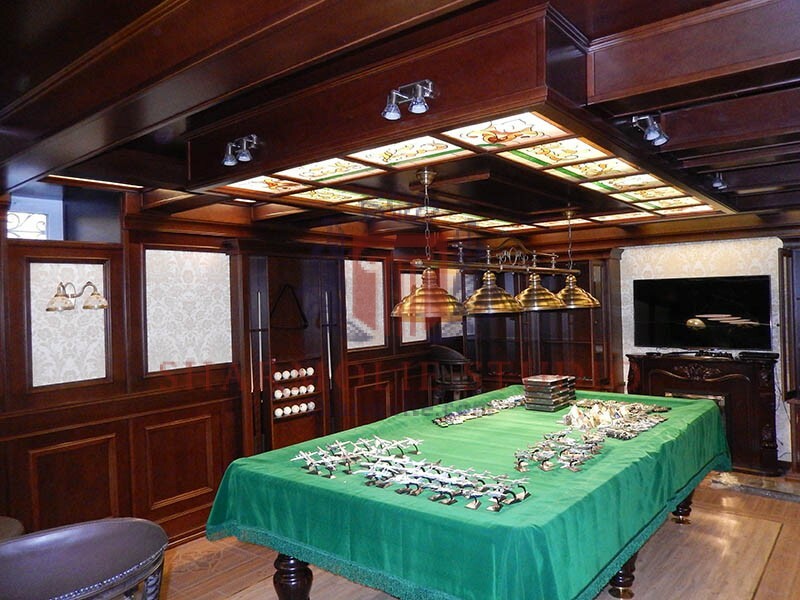 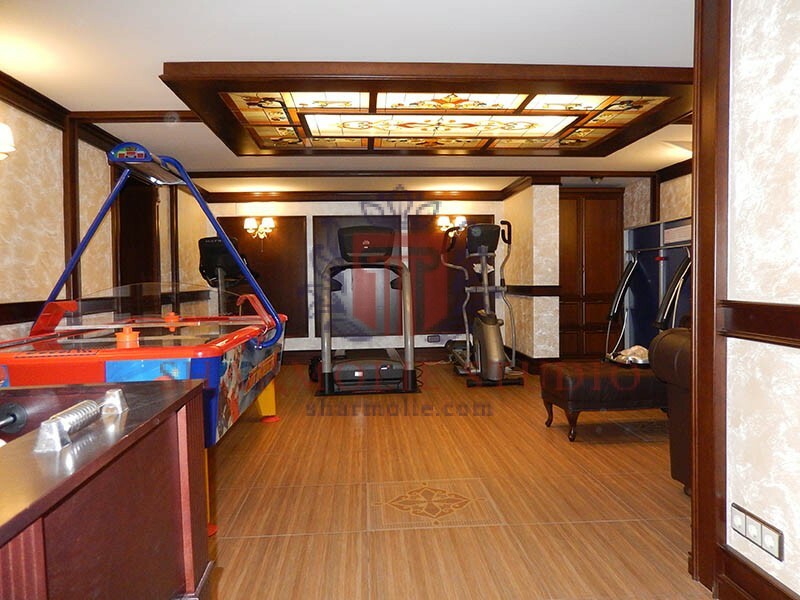 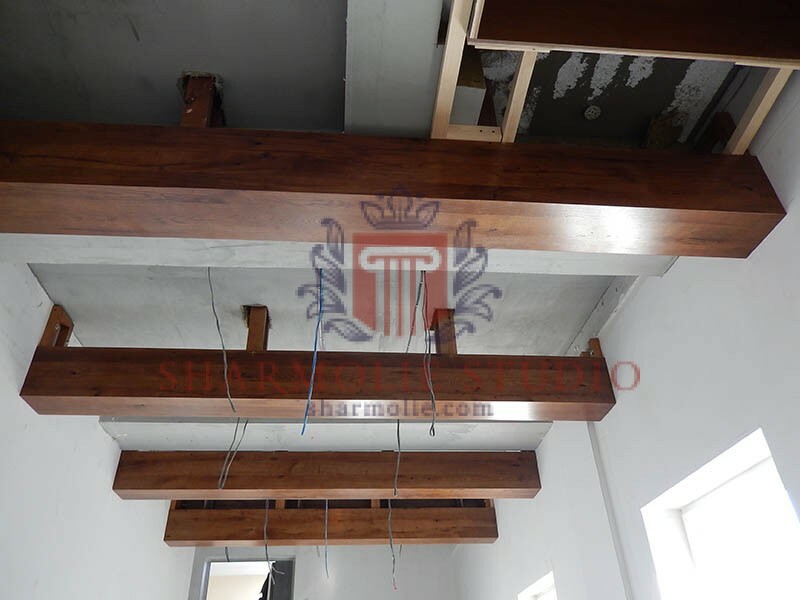 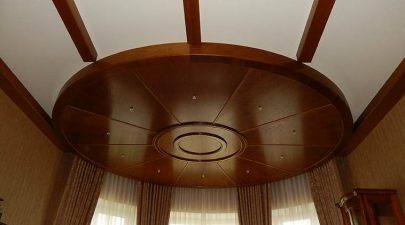 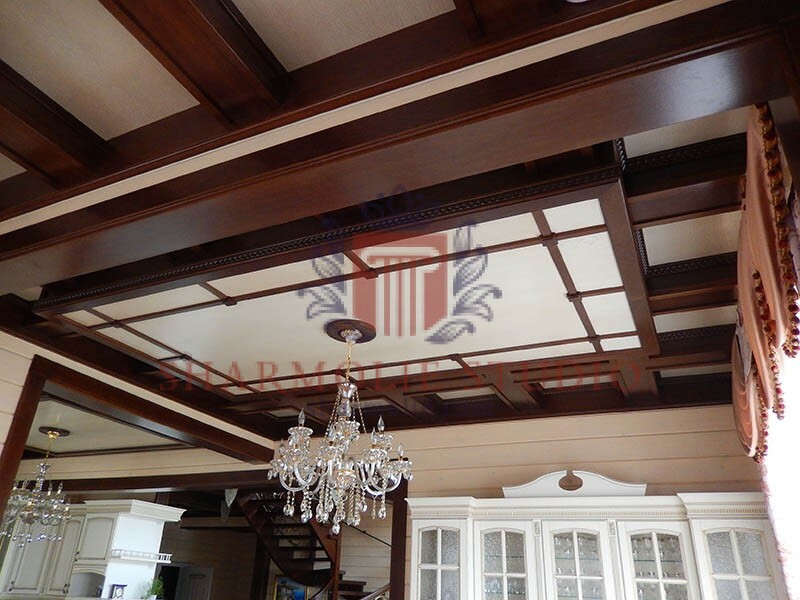 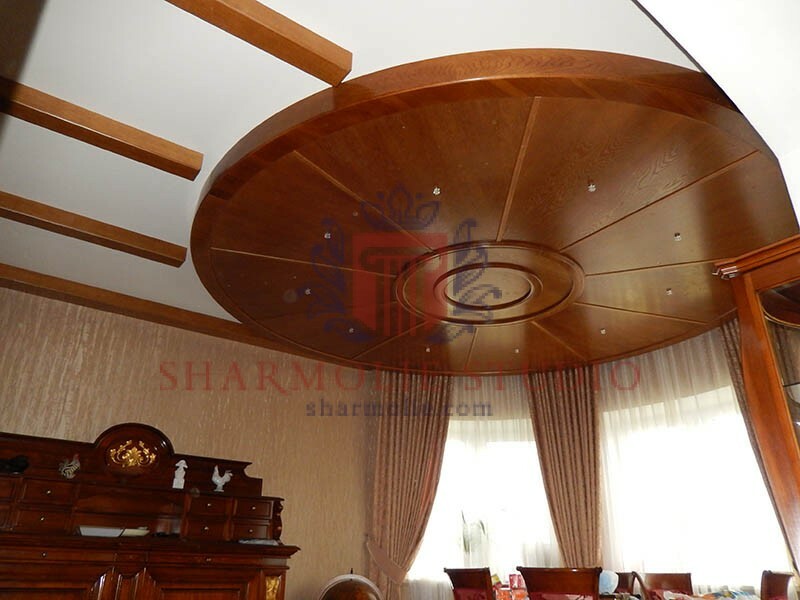 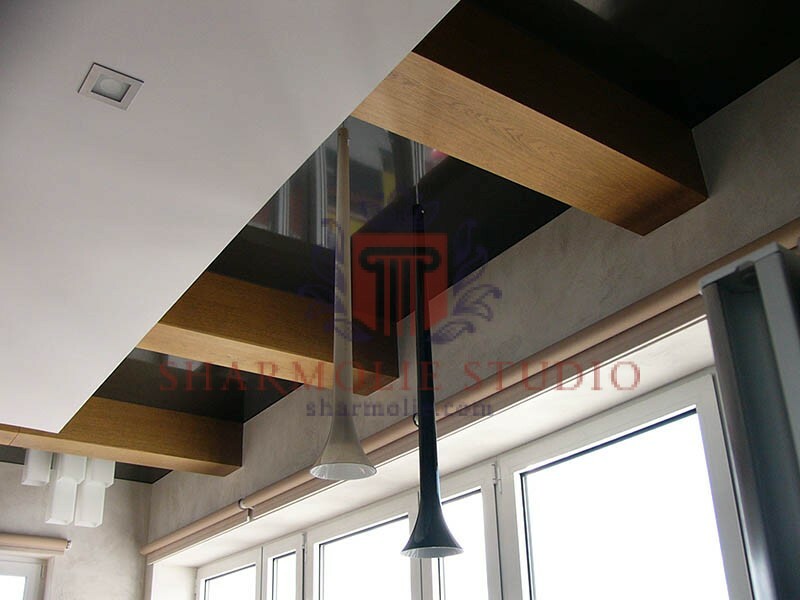 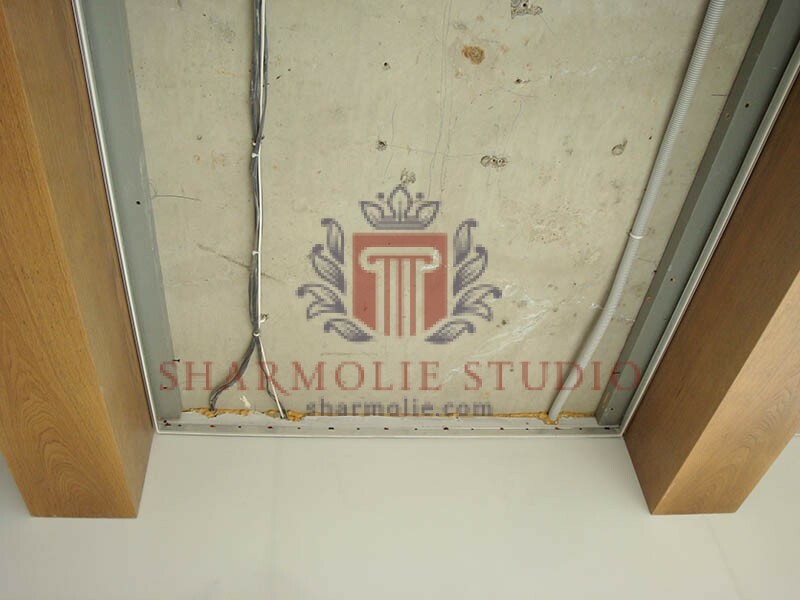 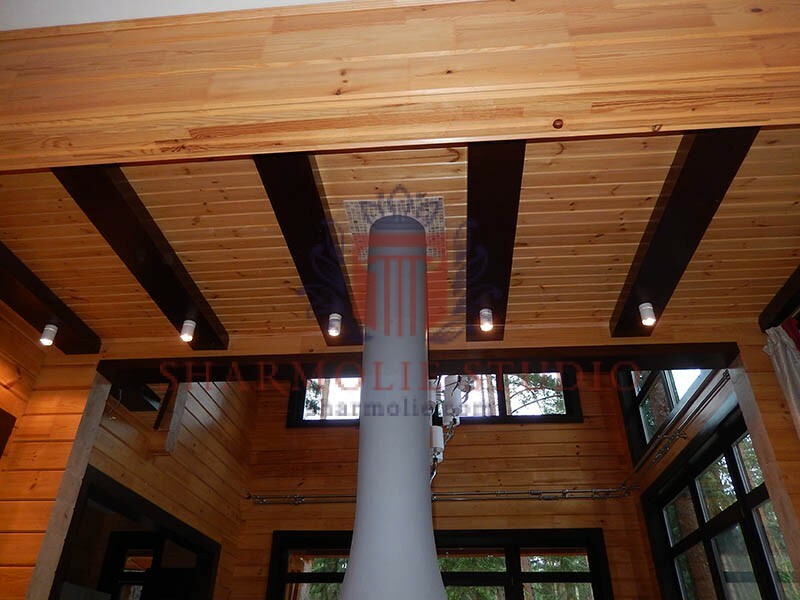 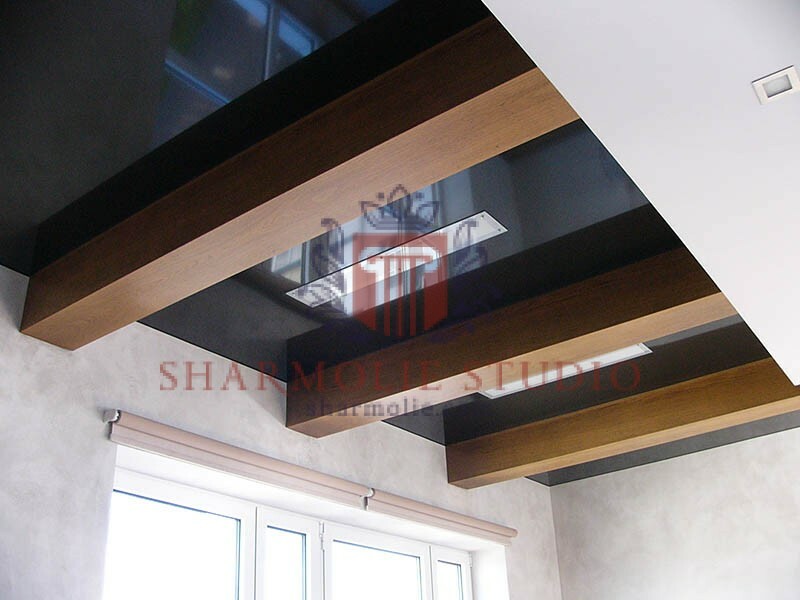 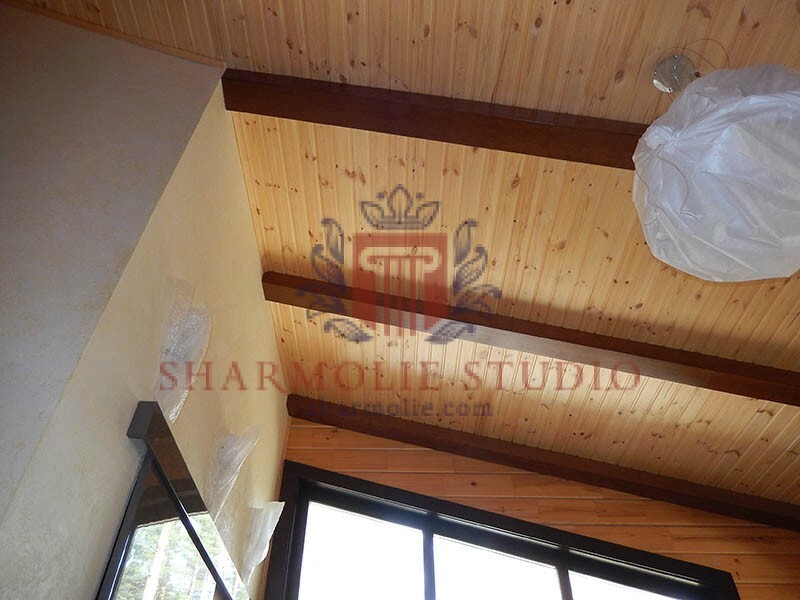 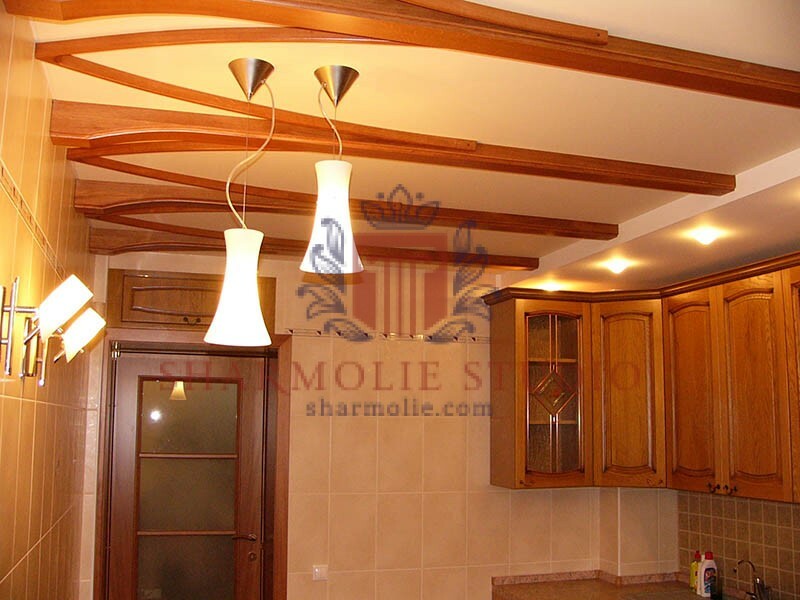 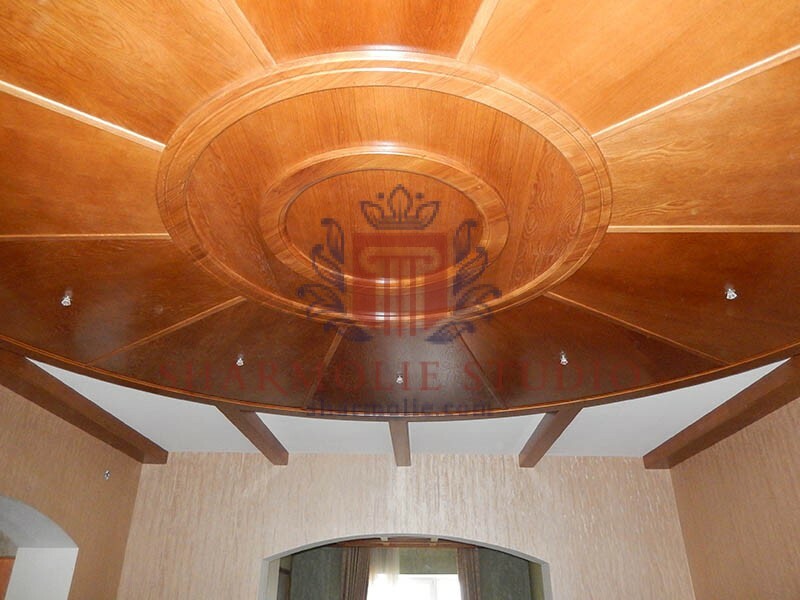 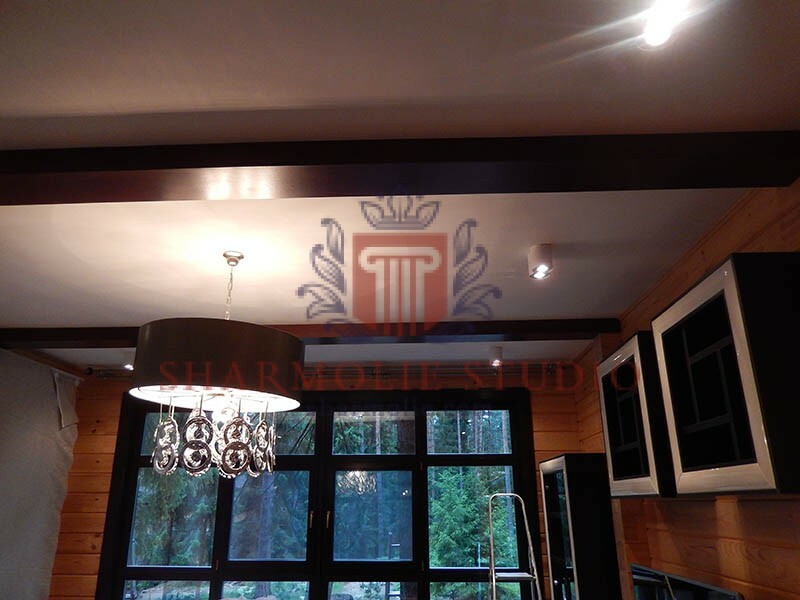 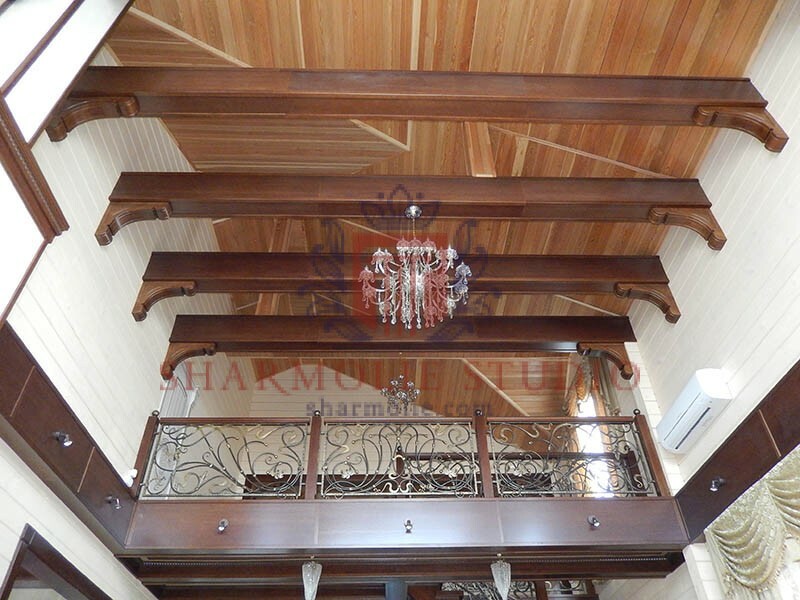 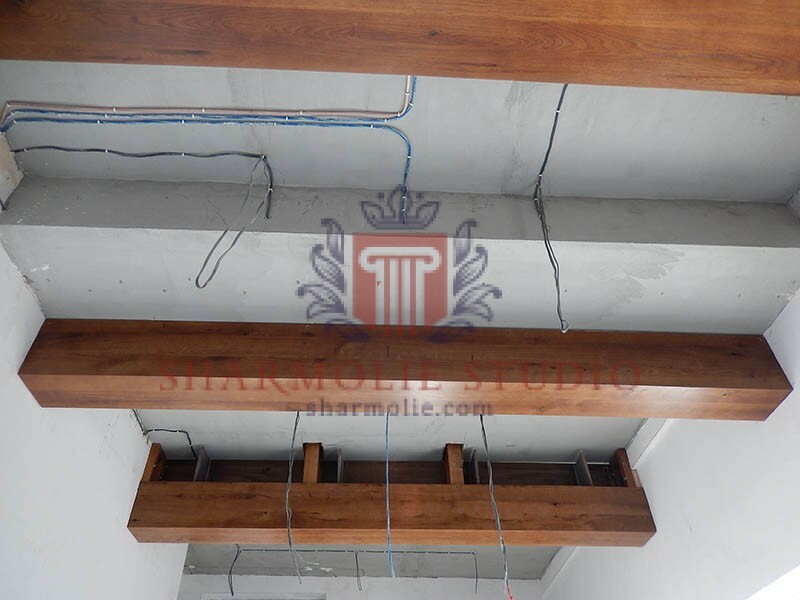 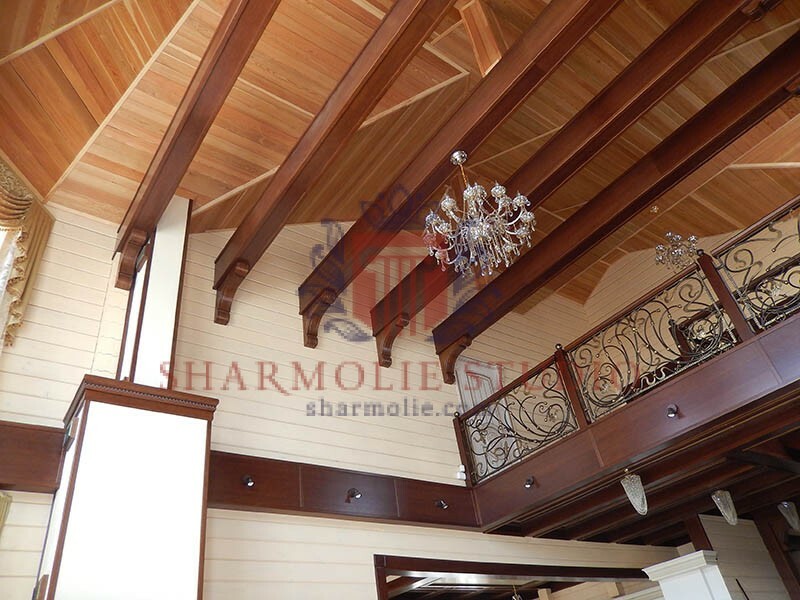 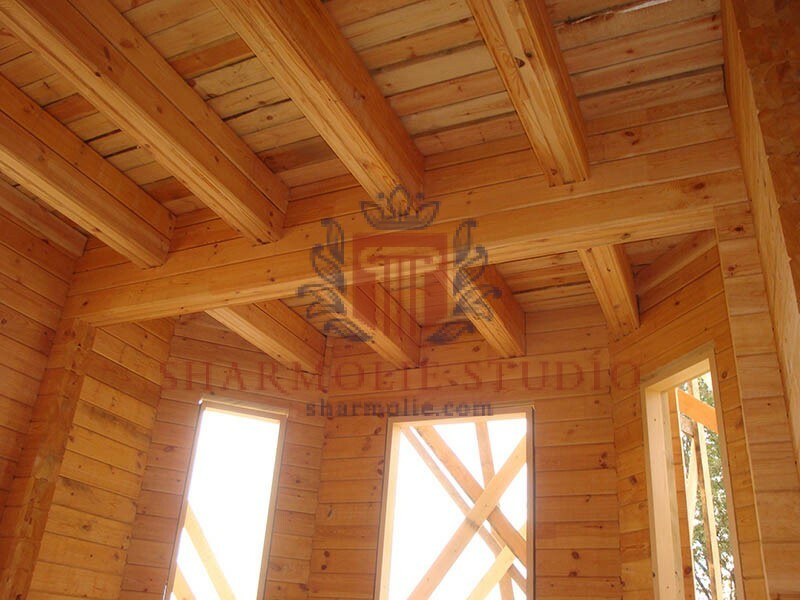 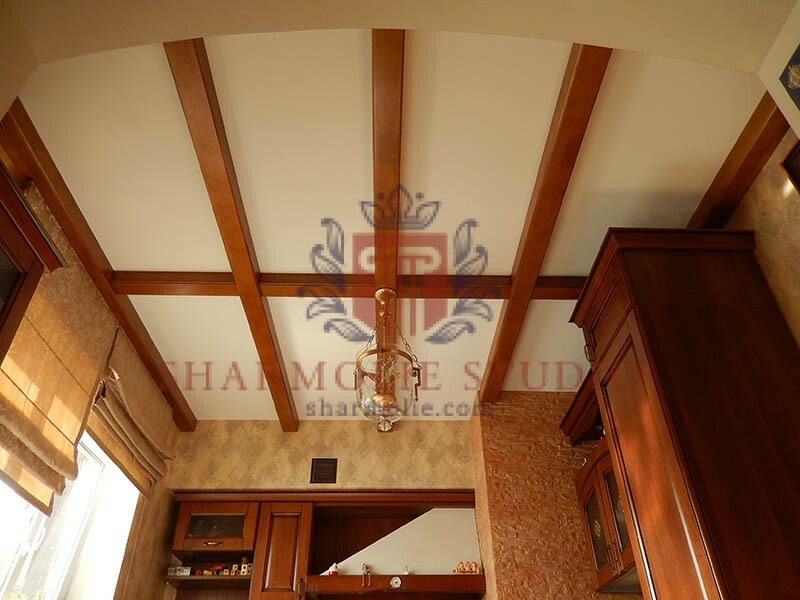 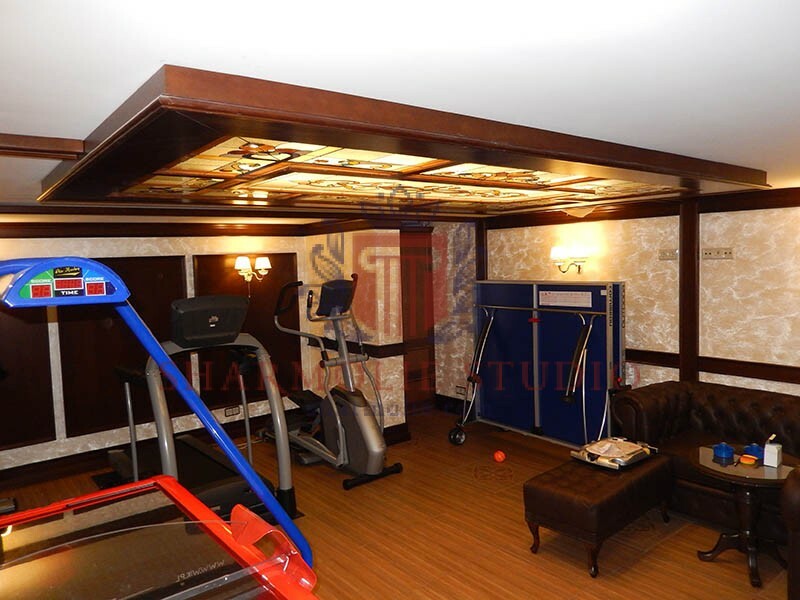 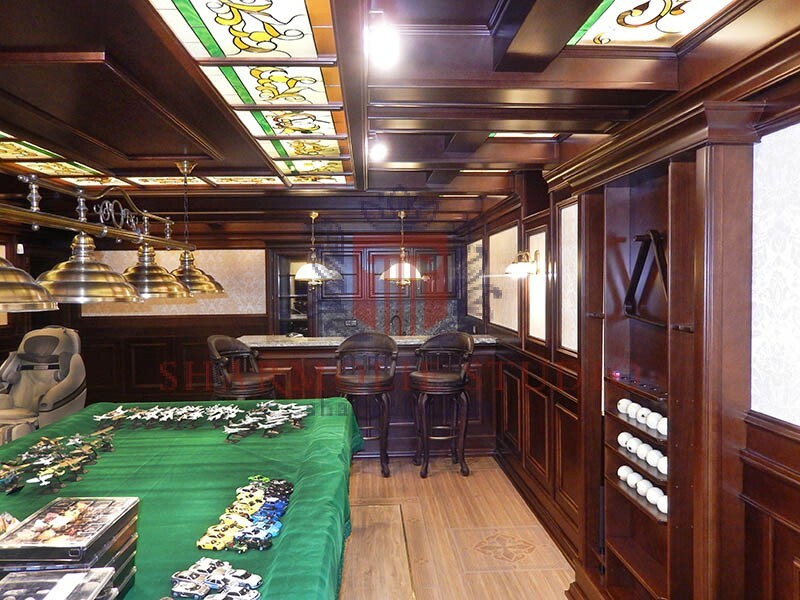 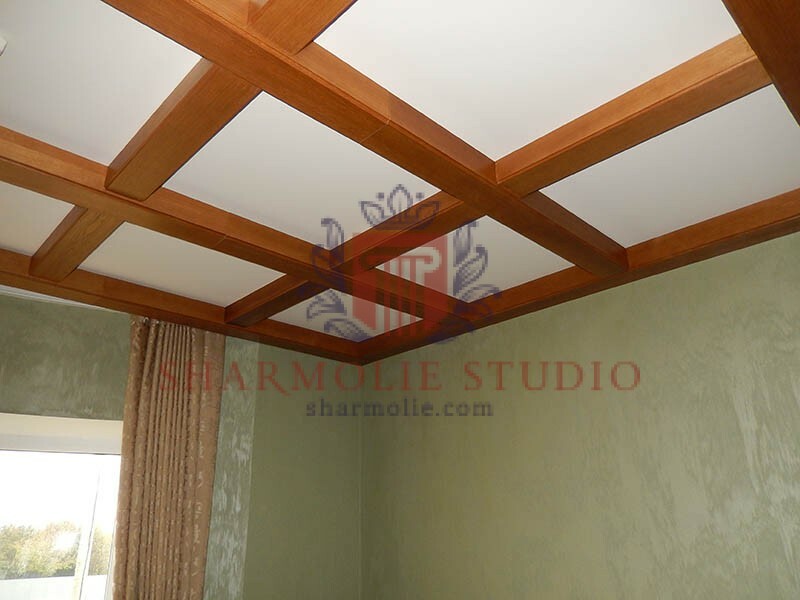 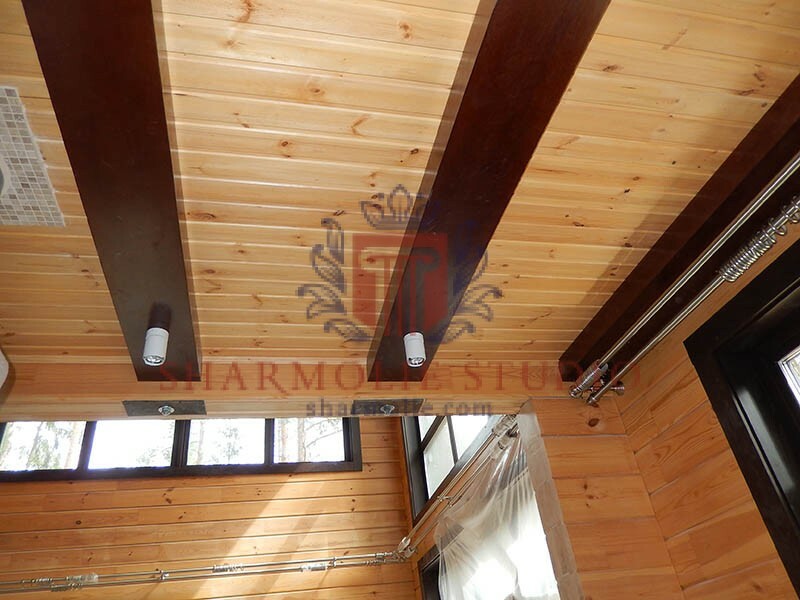 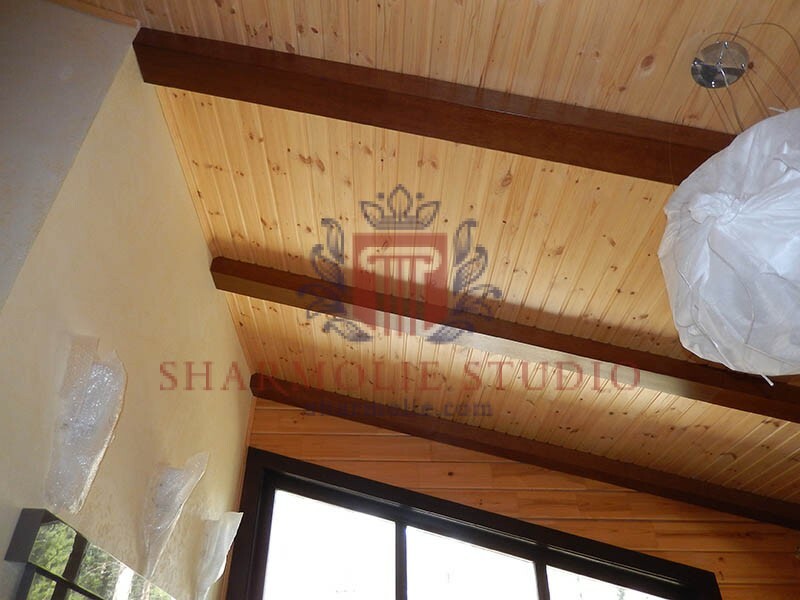 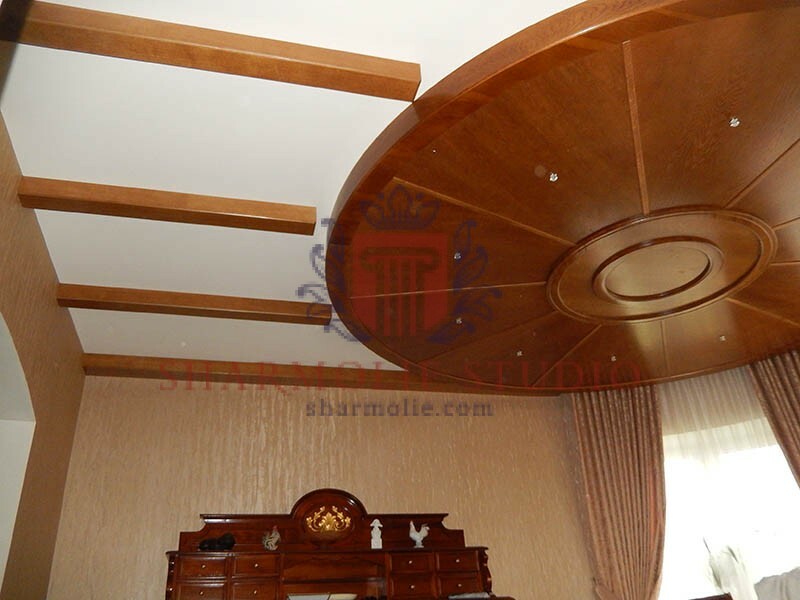 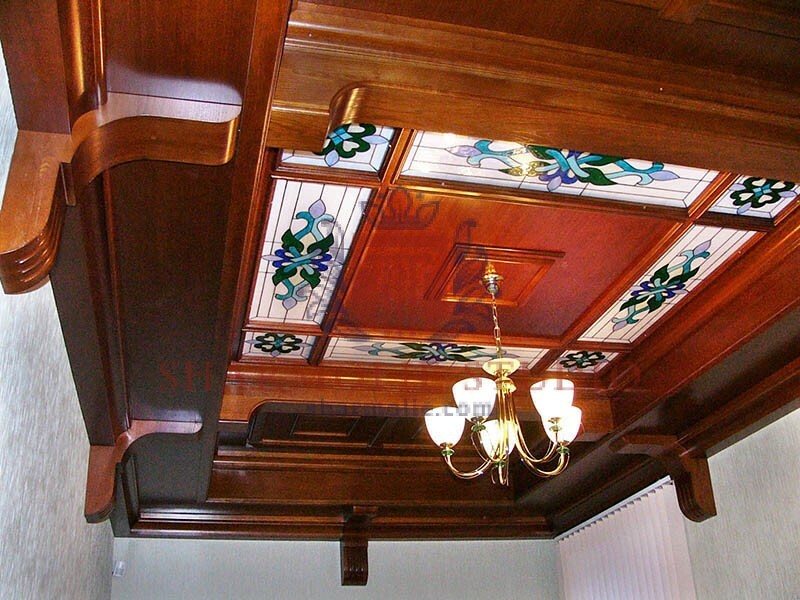 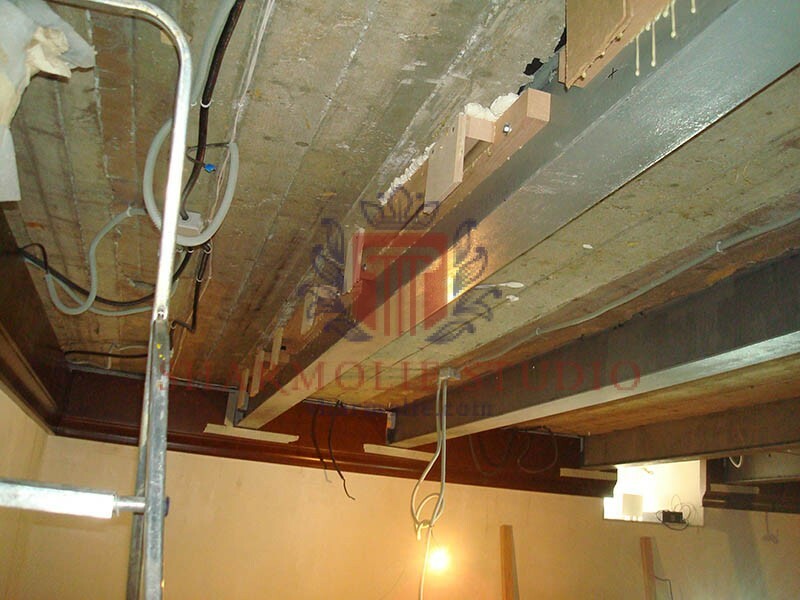 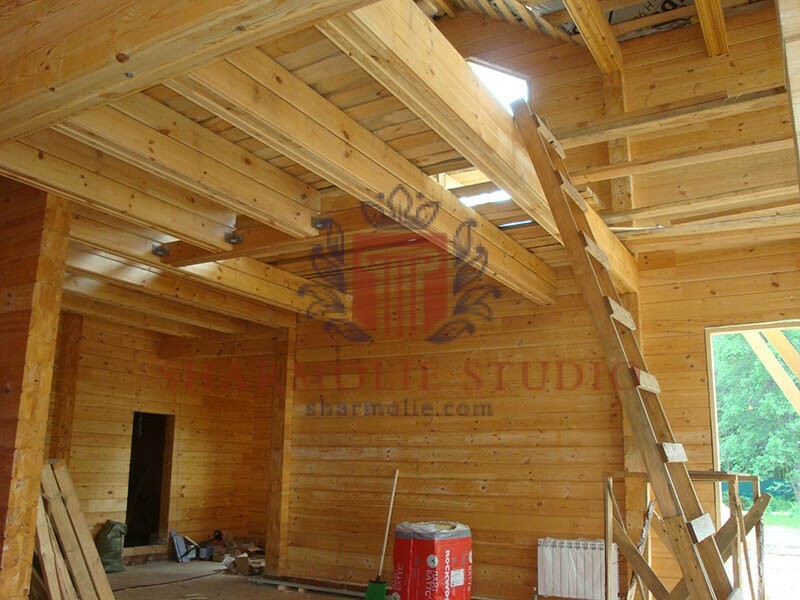 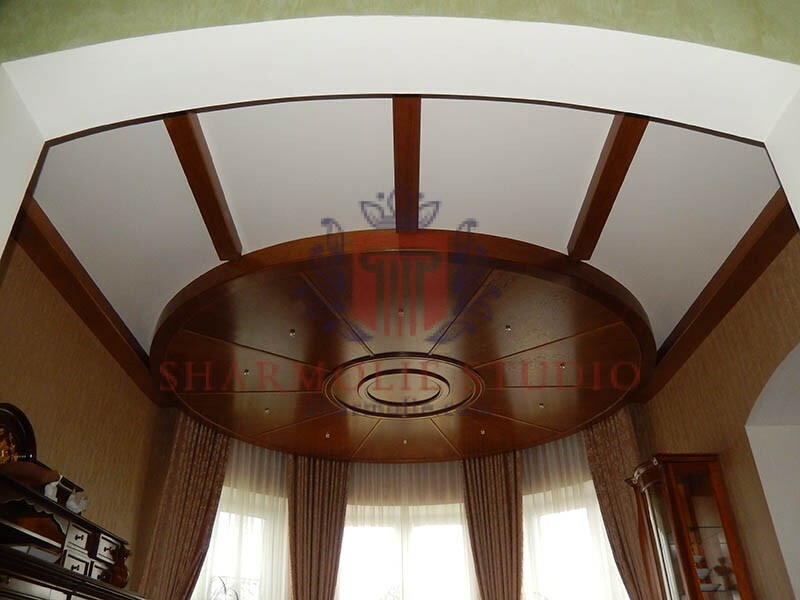 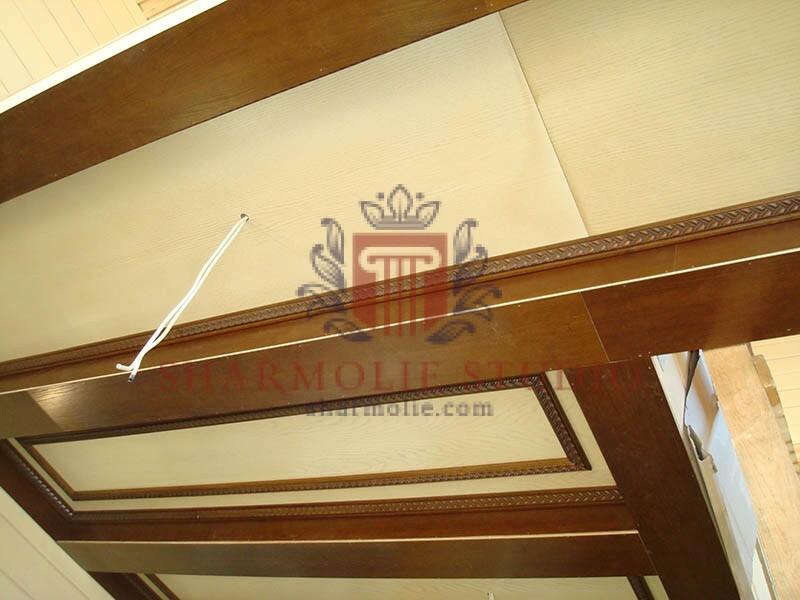 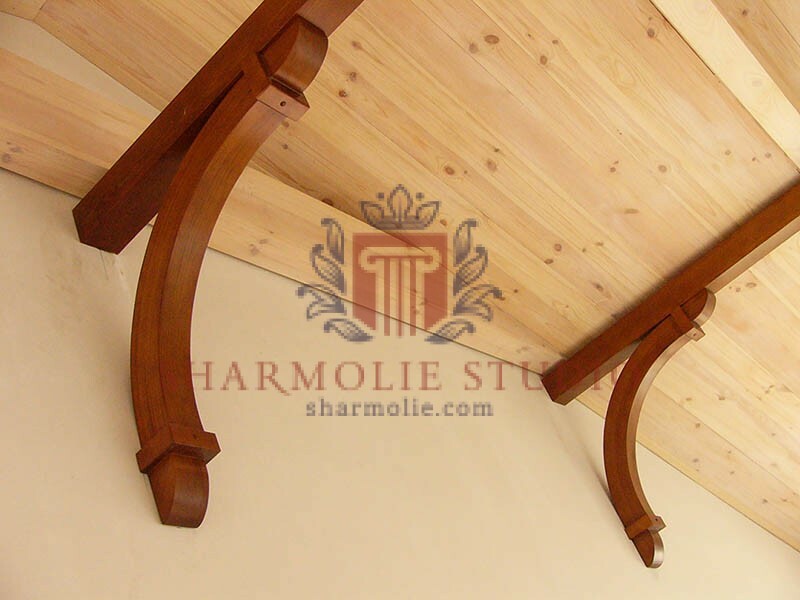 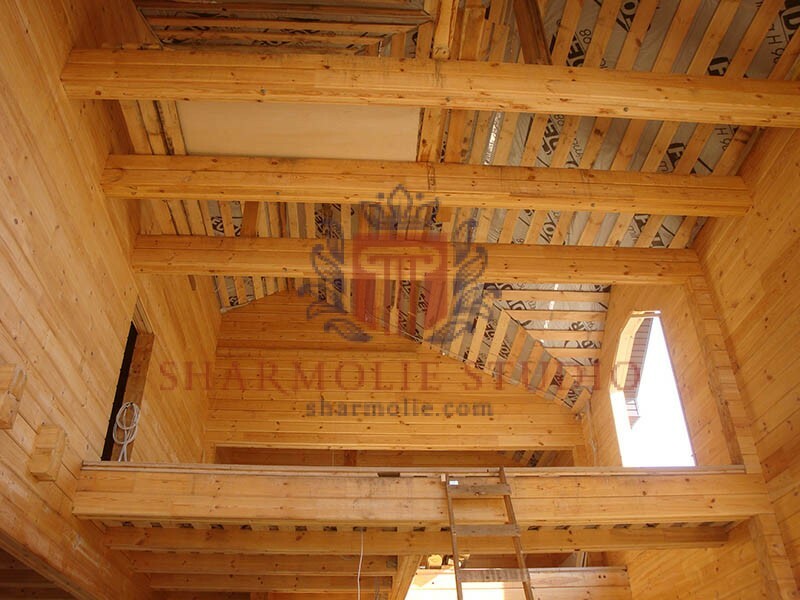 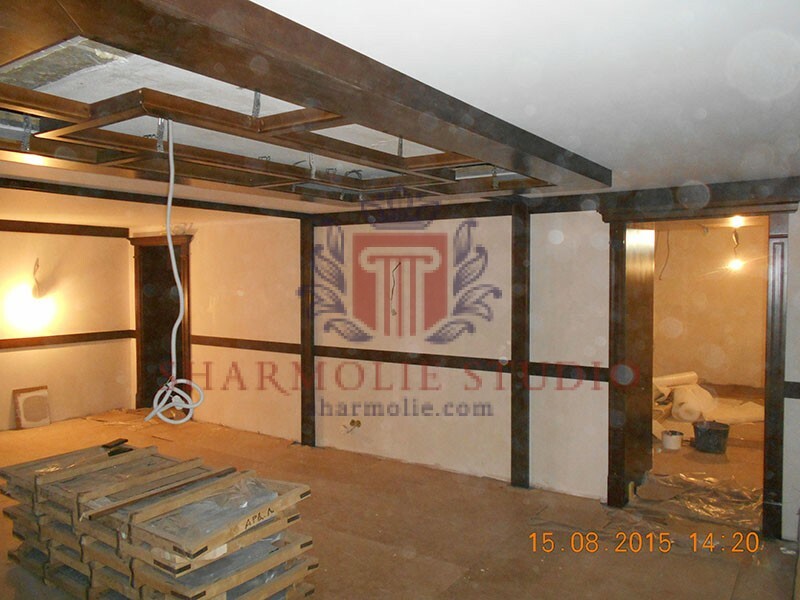 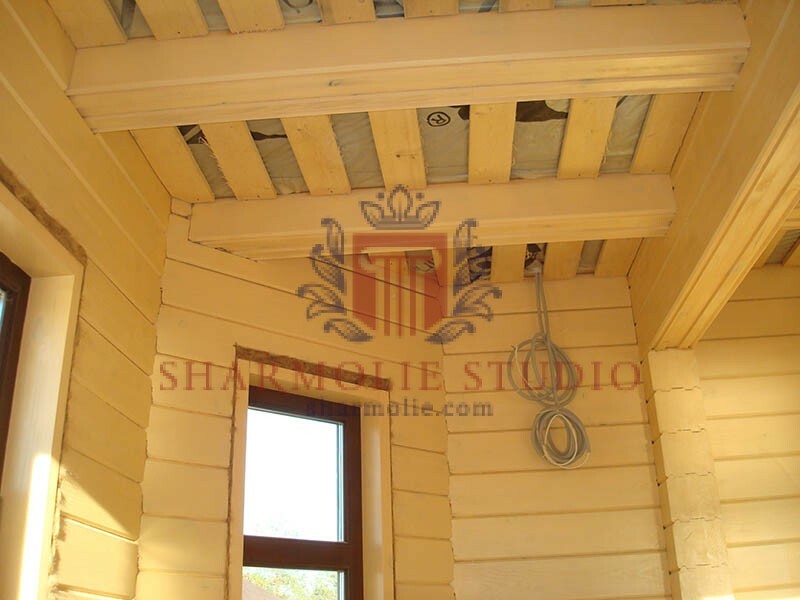 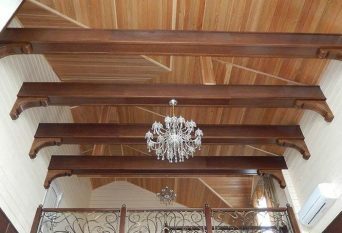 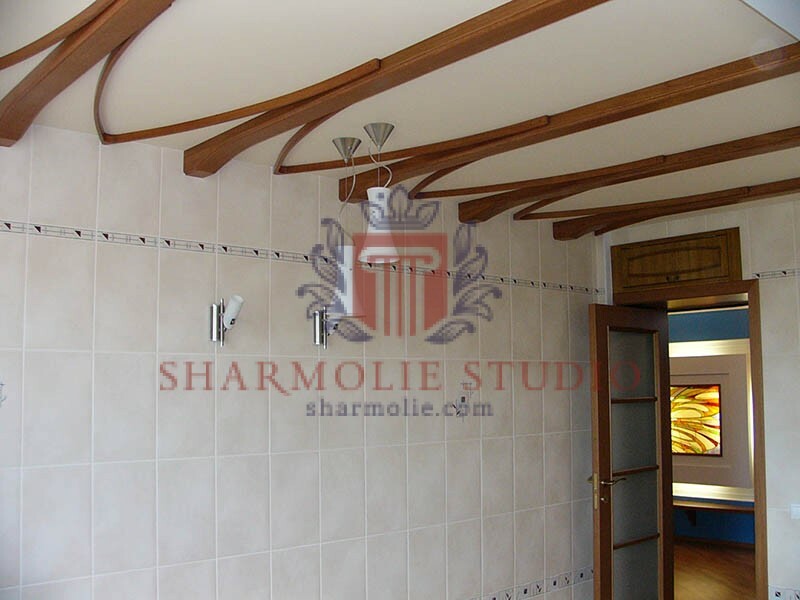 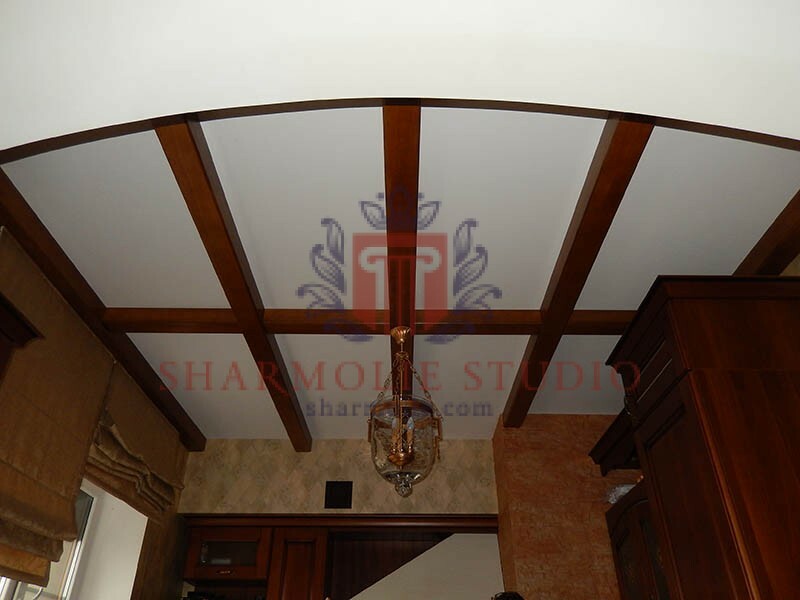 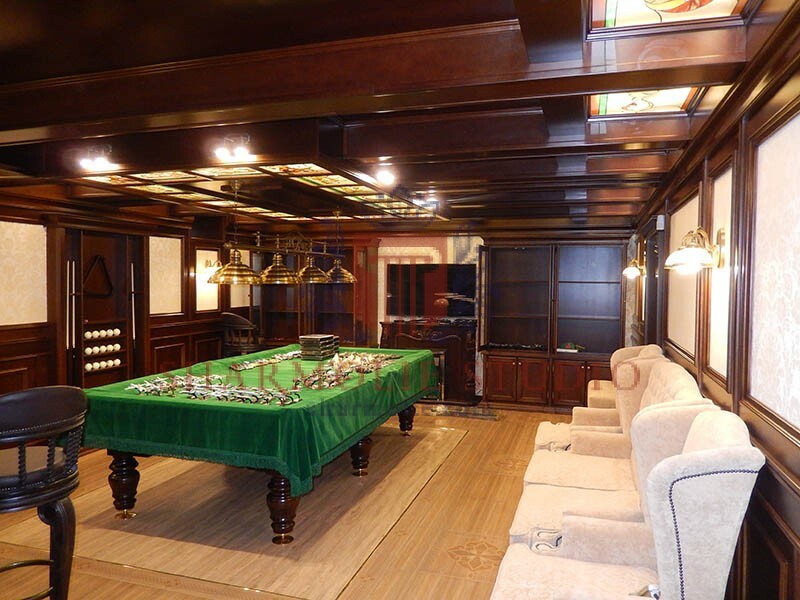 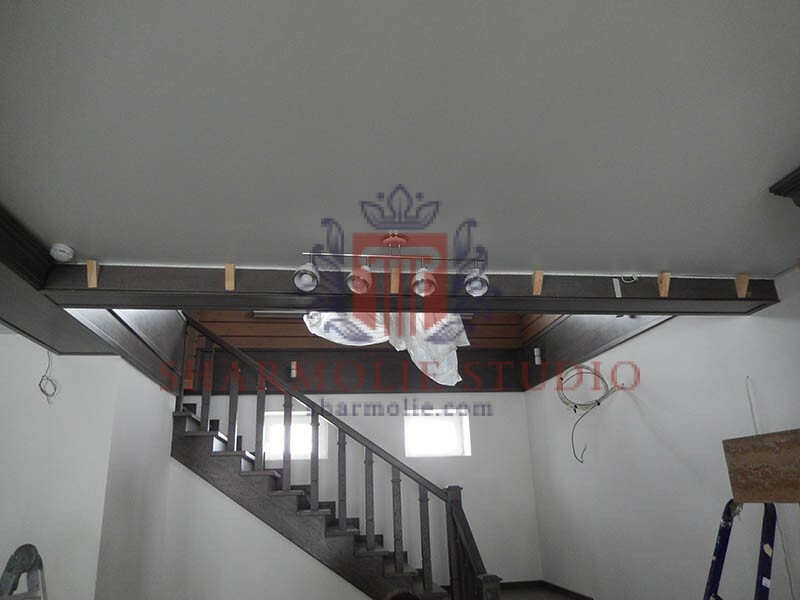 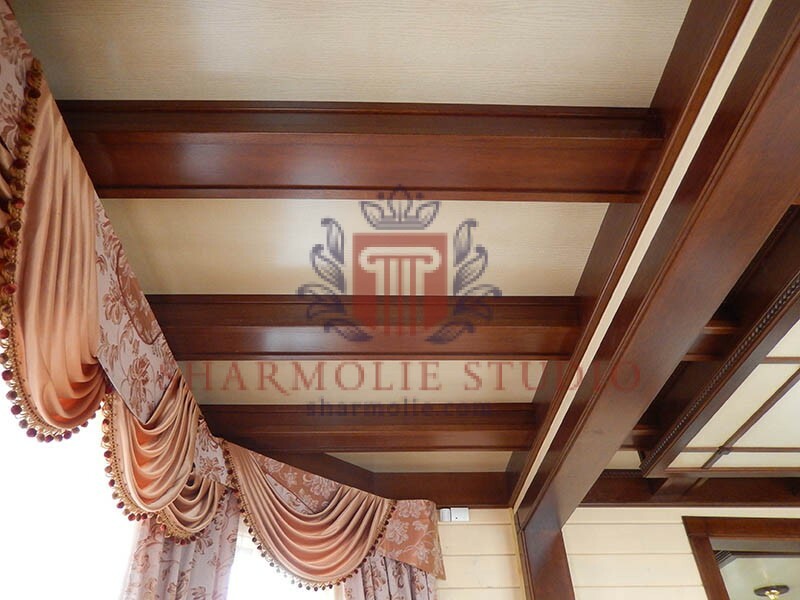 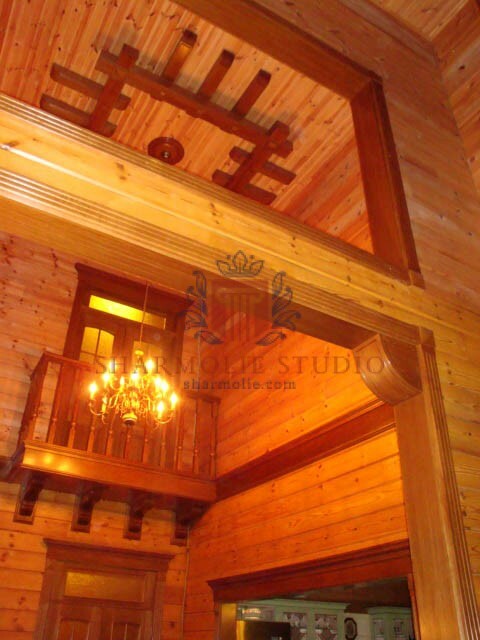 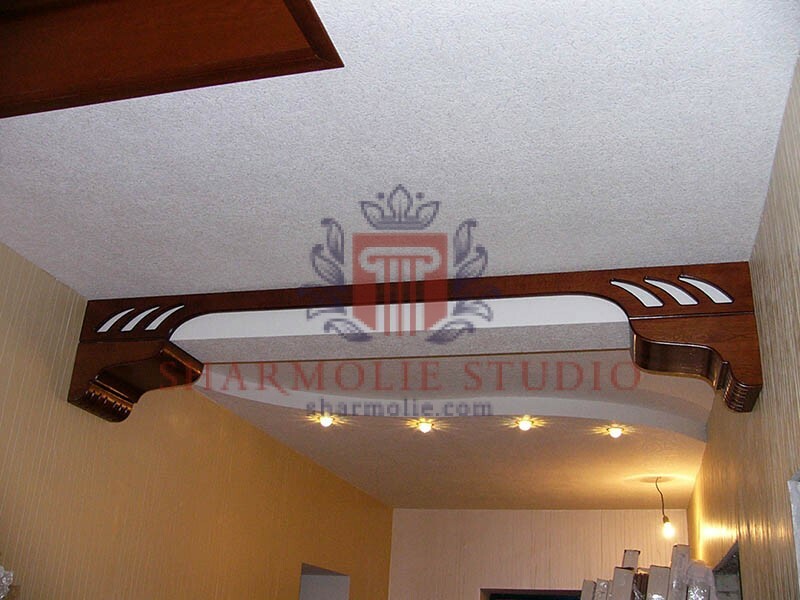 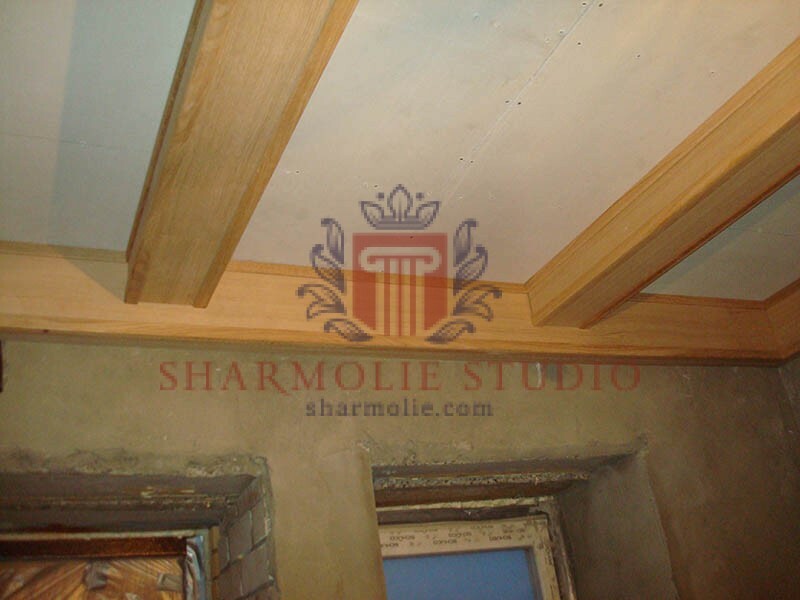 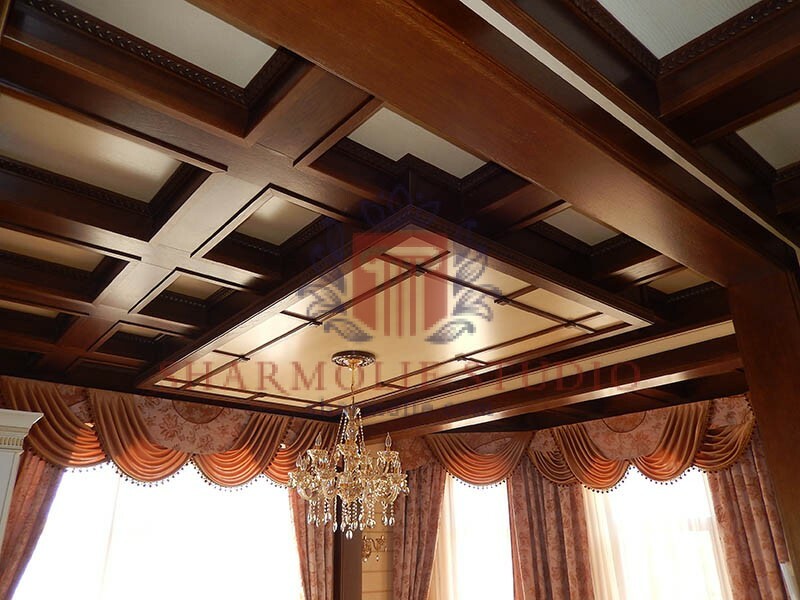 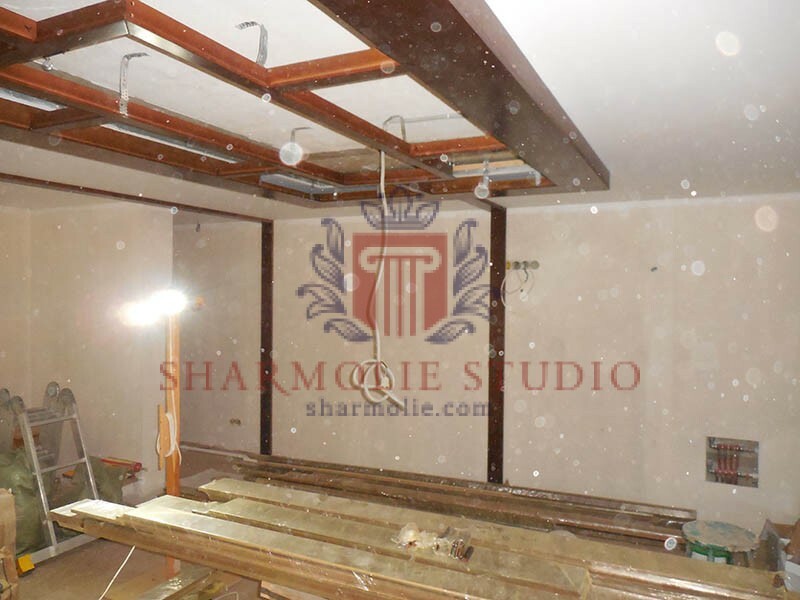 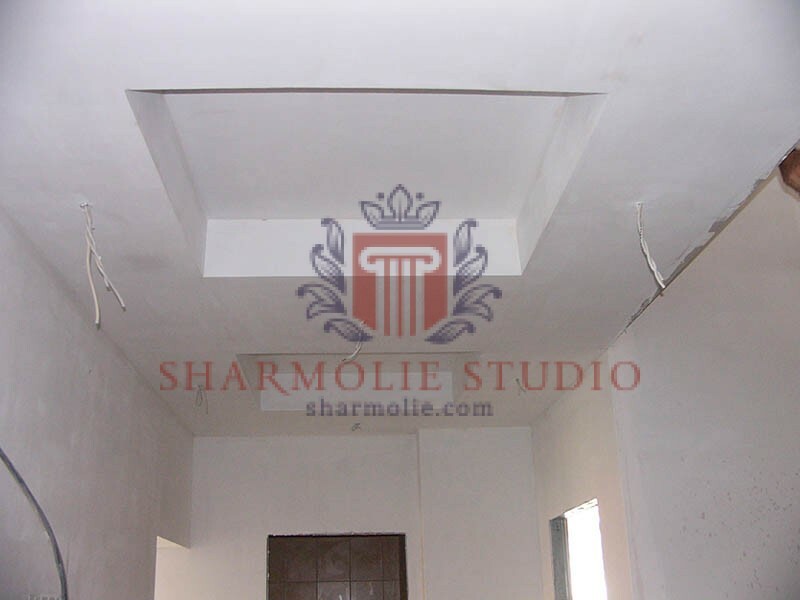 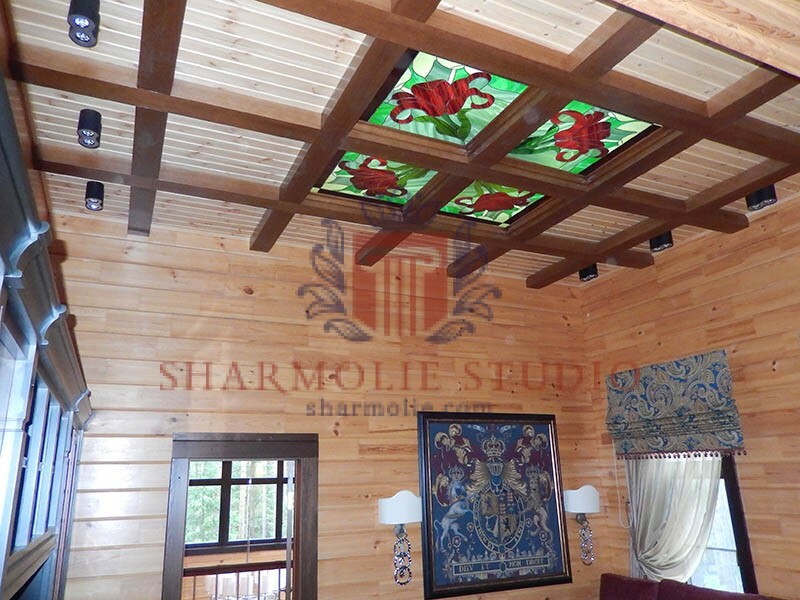 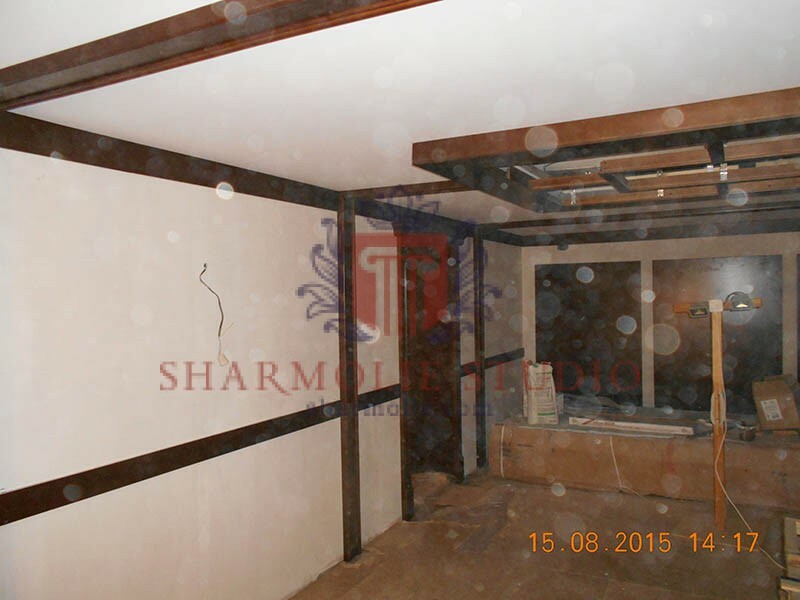 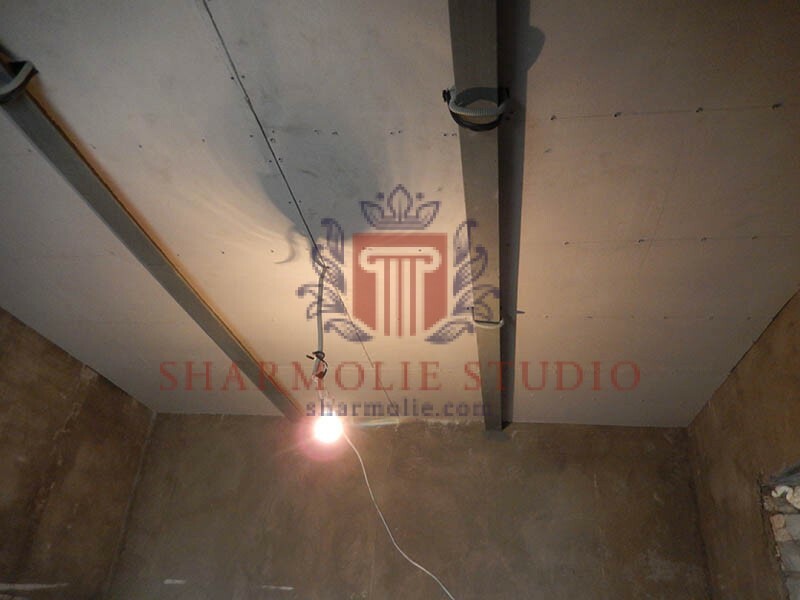 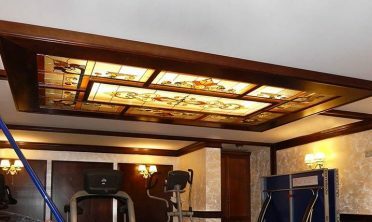 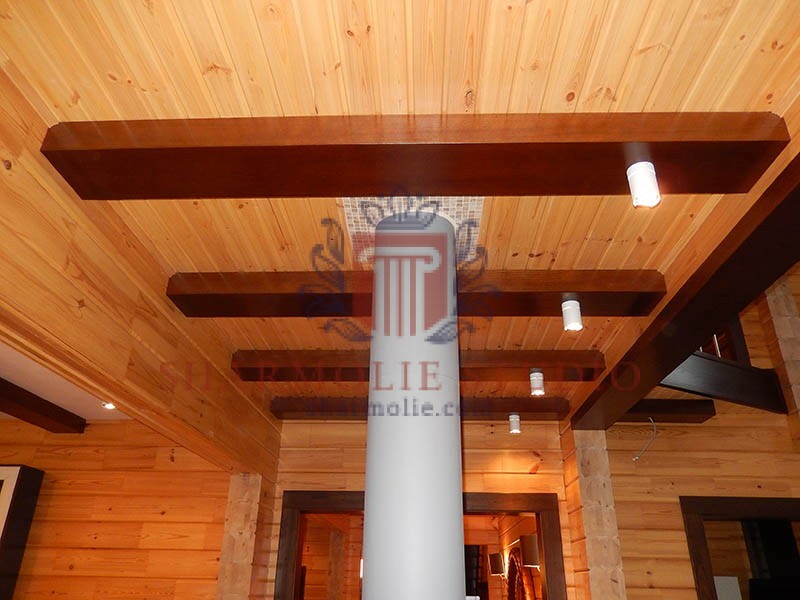 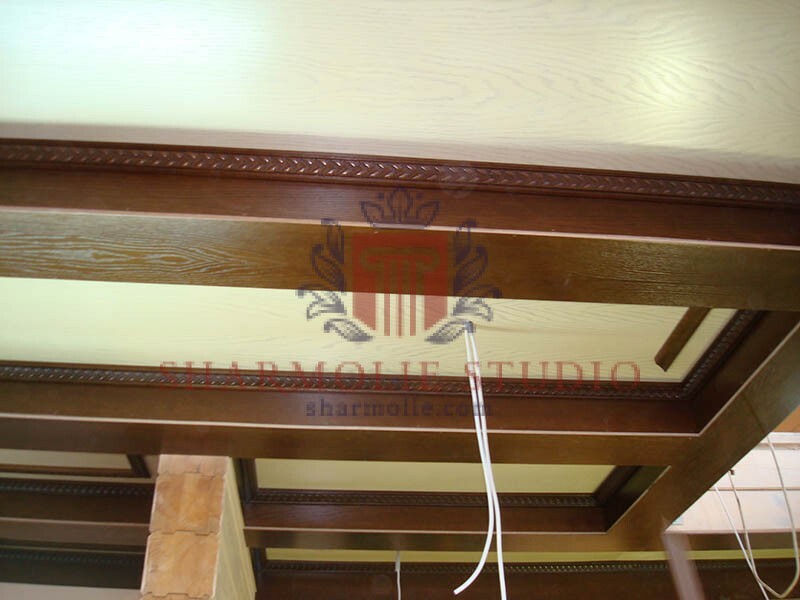 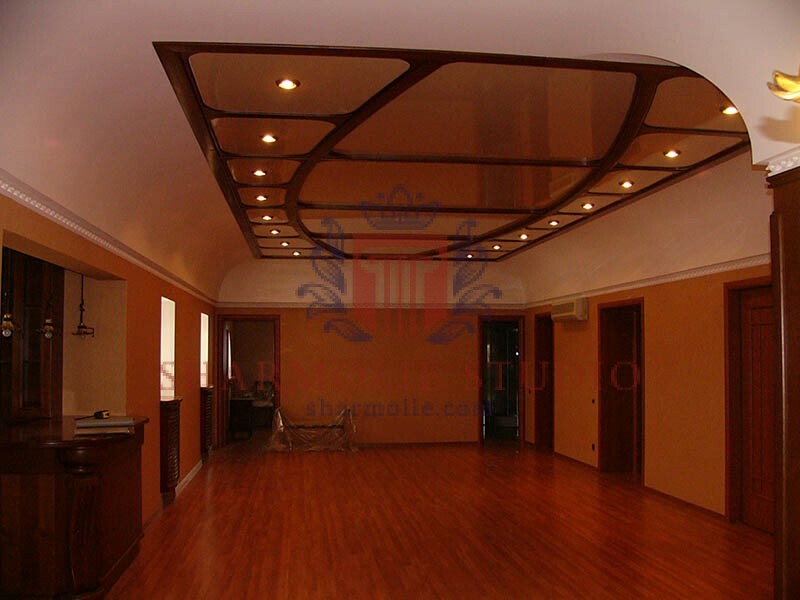 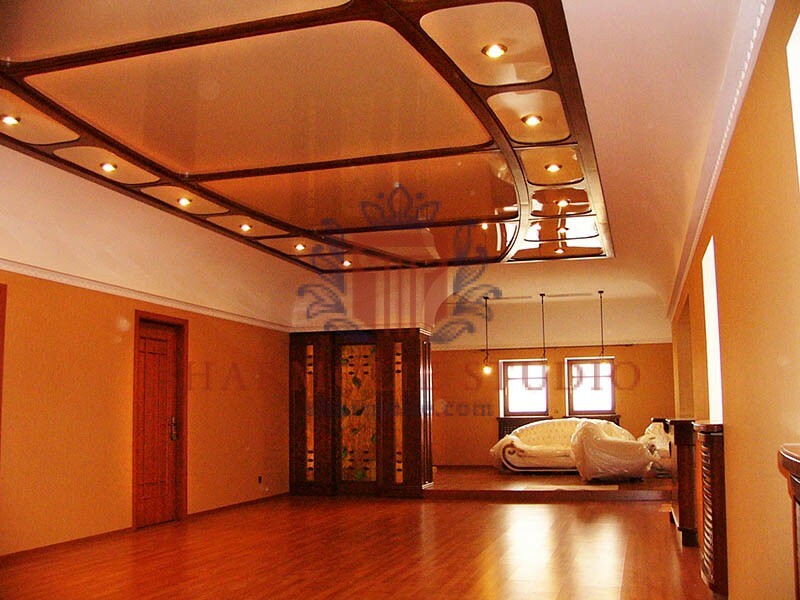 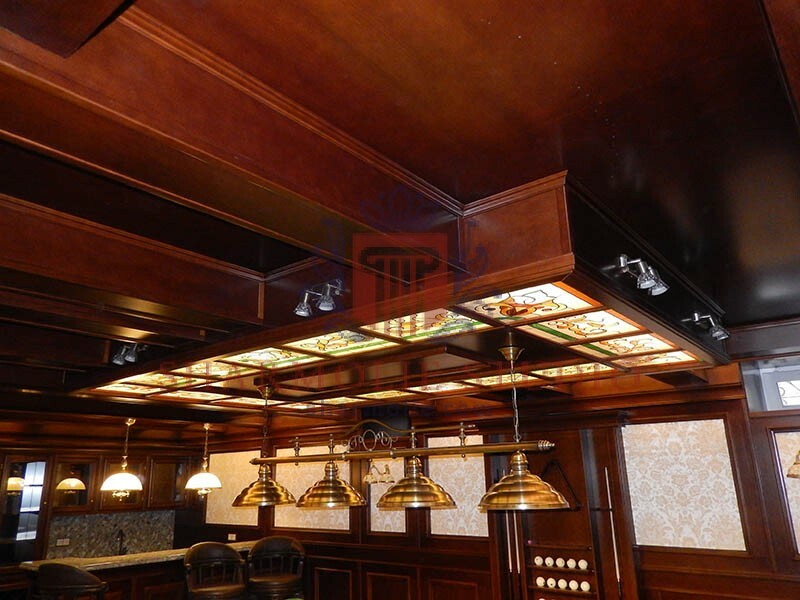 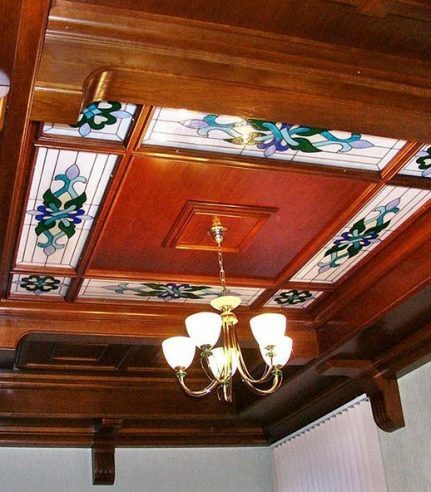 Why customers choose exactly our production of ceiling beams? 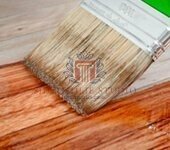 More than 20 years we are advancing only one direction! 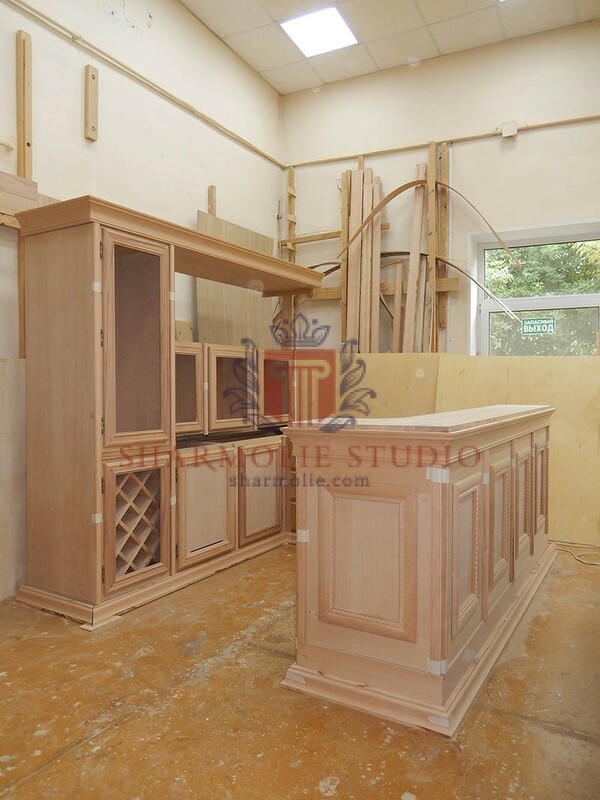 Lots of clients trust our expert designers and technical teams to transform living and working environments into pleasing, elegant, modern displays! 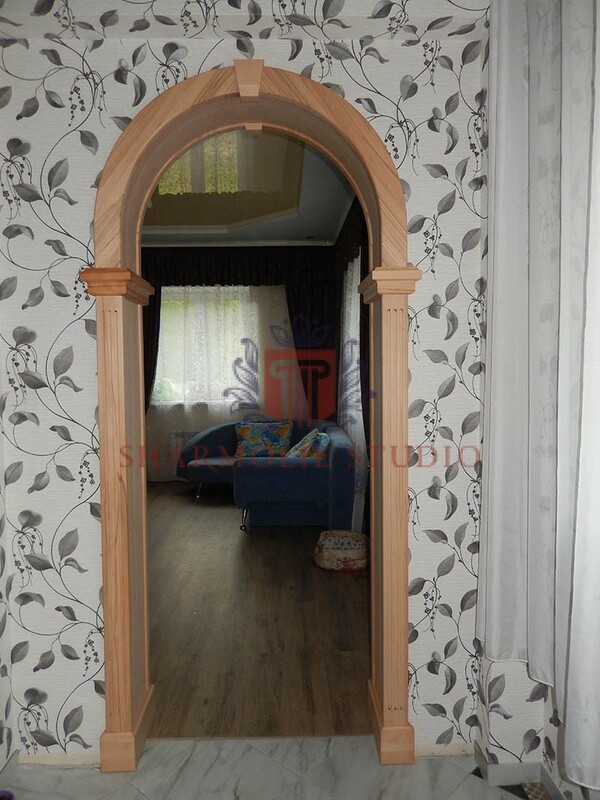 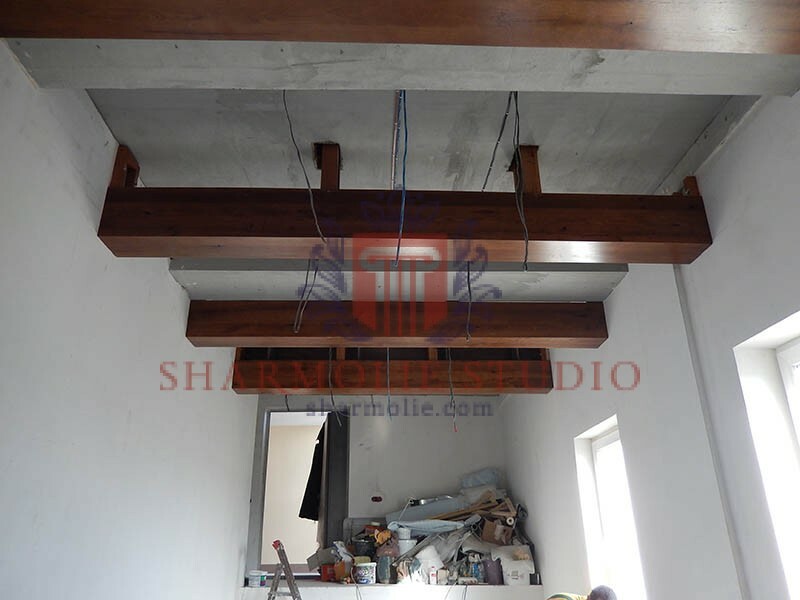 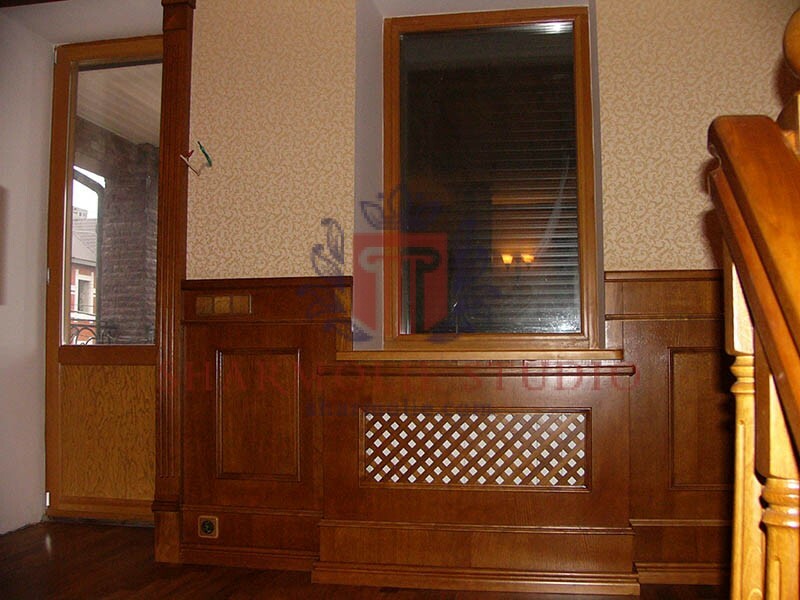 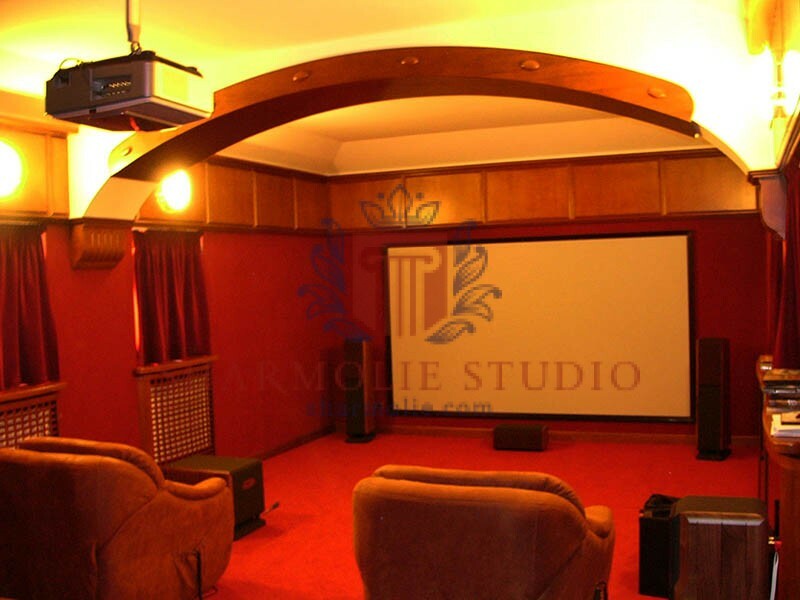 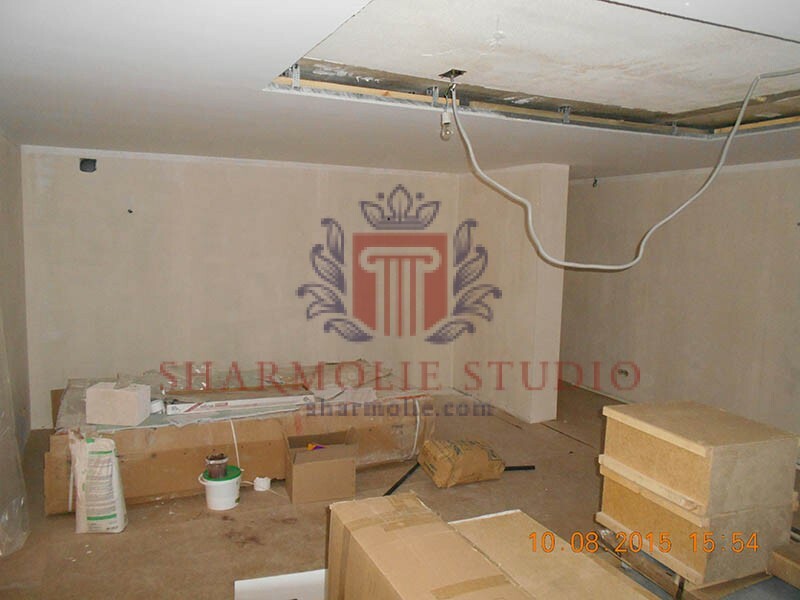 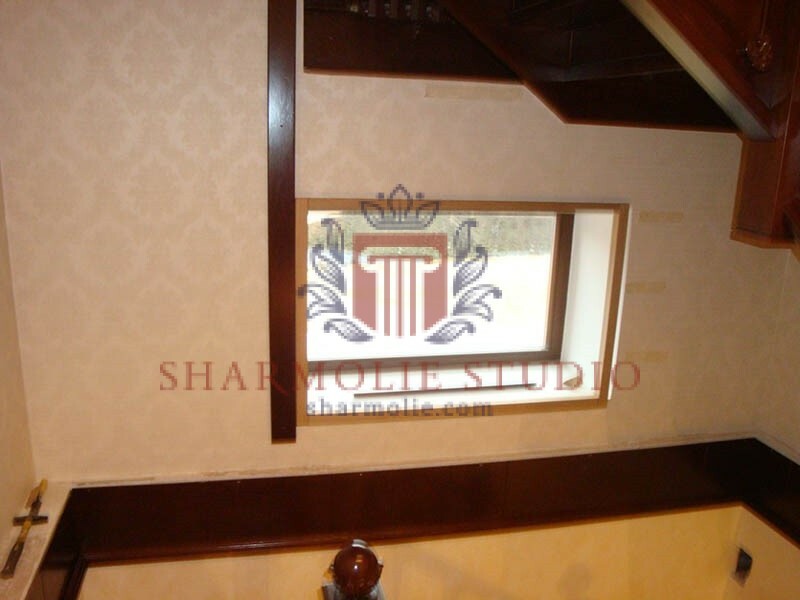 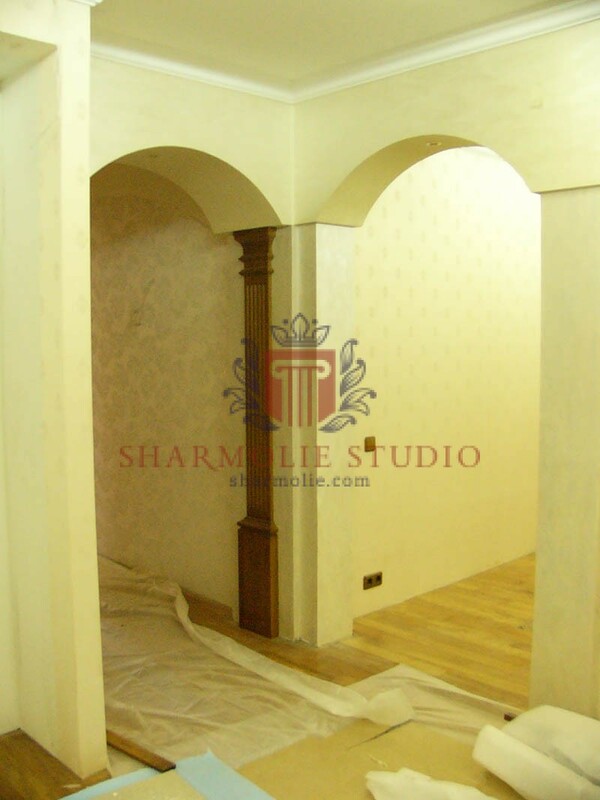 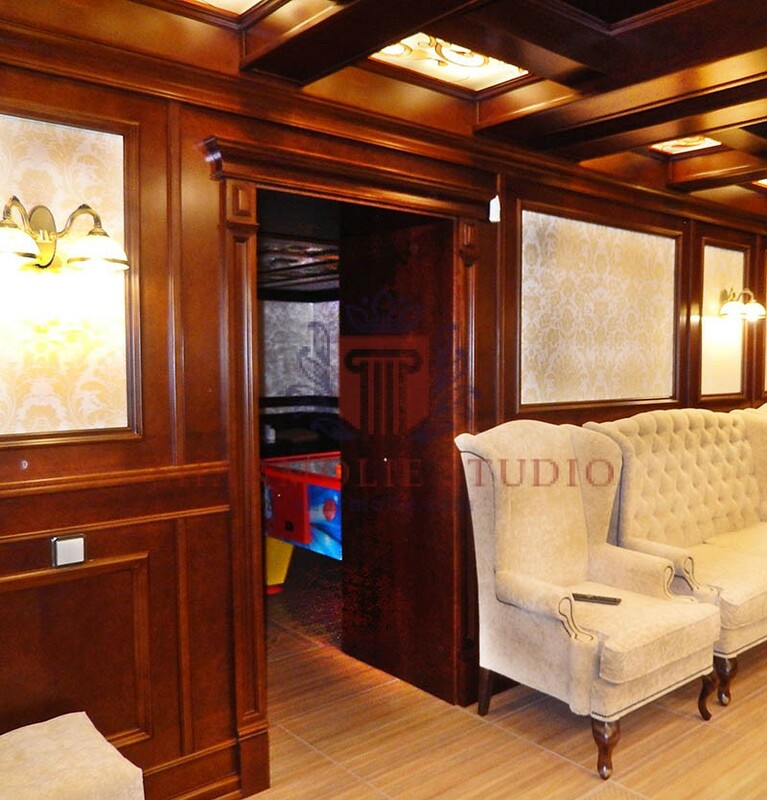 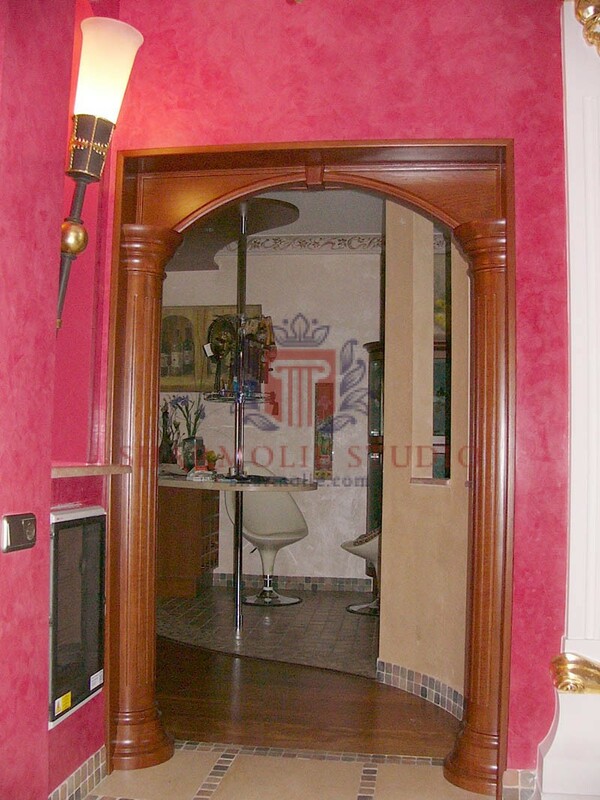 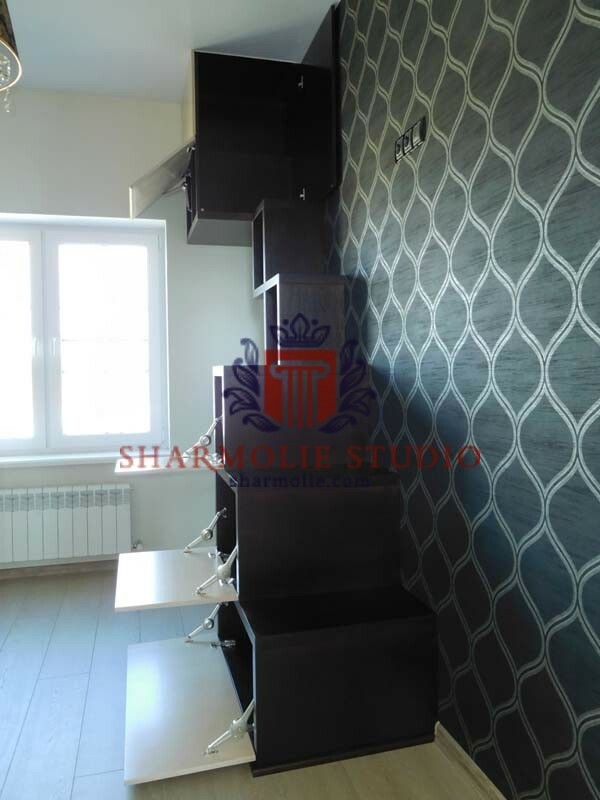 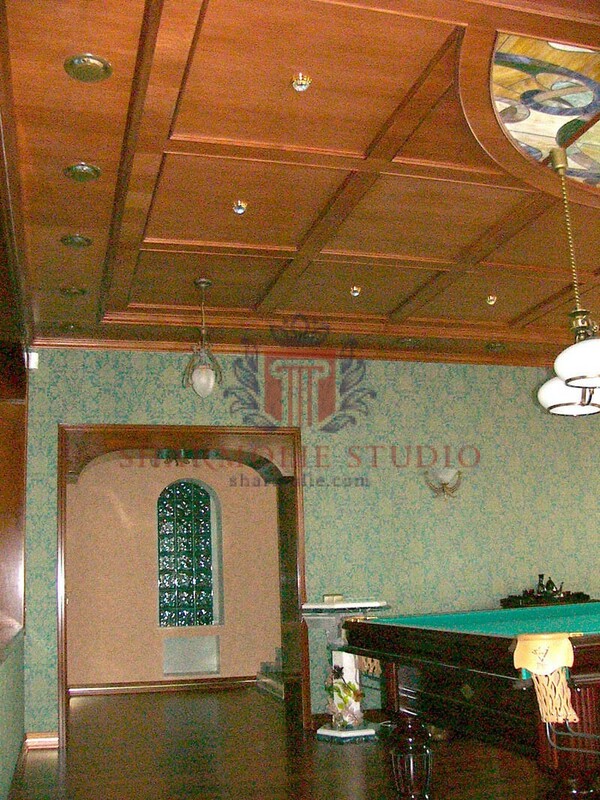 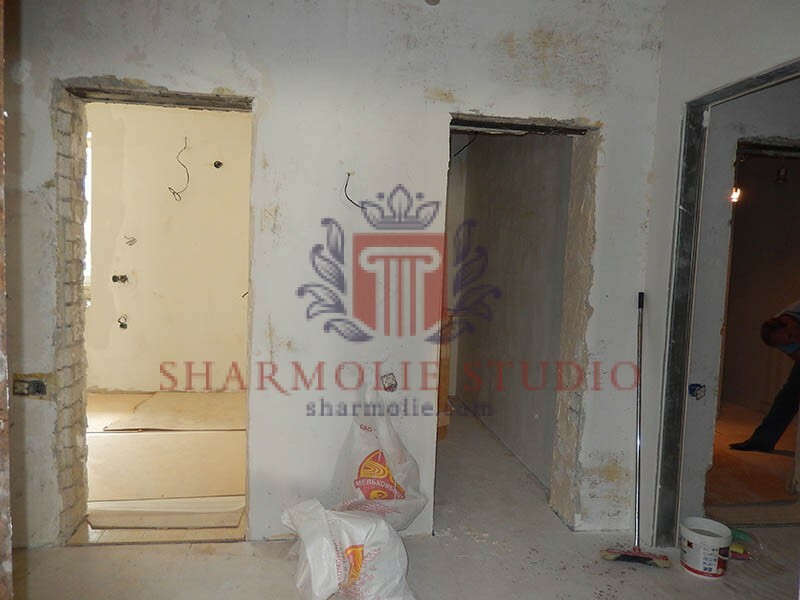 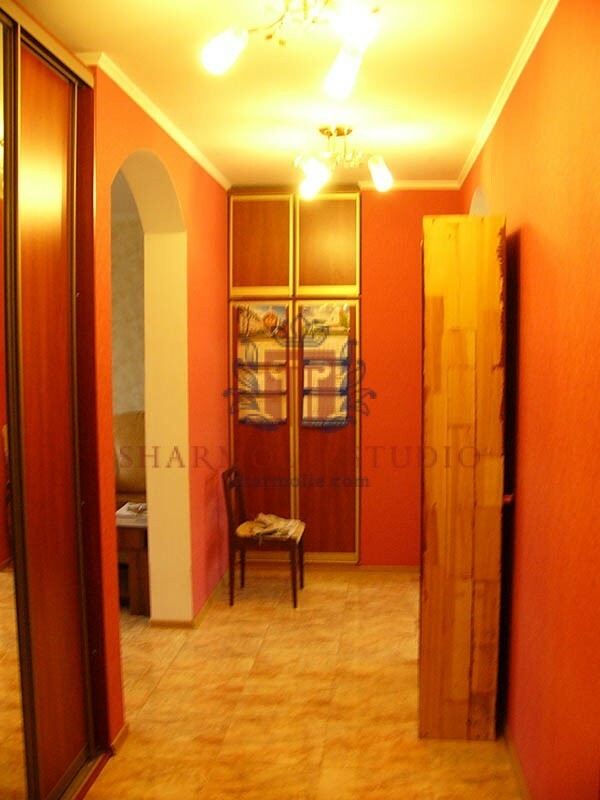 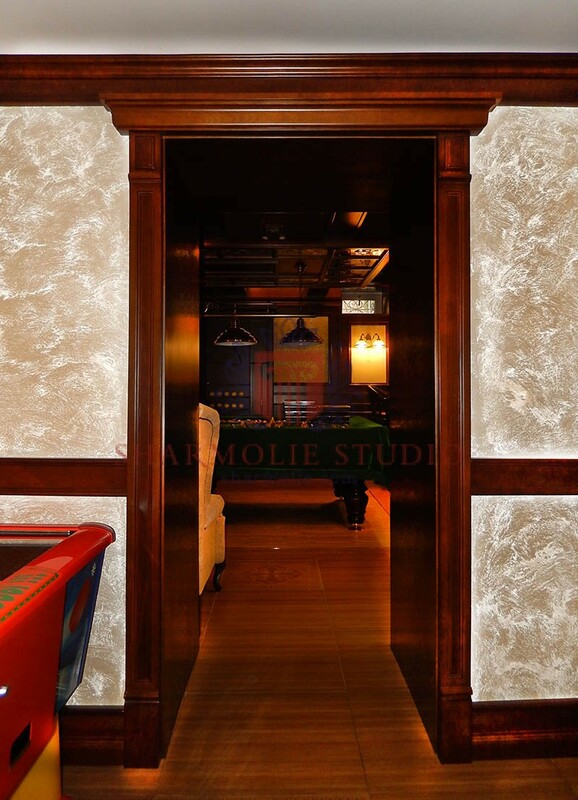 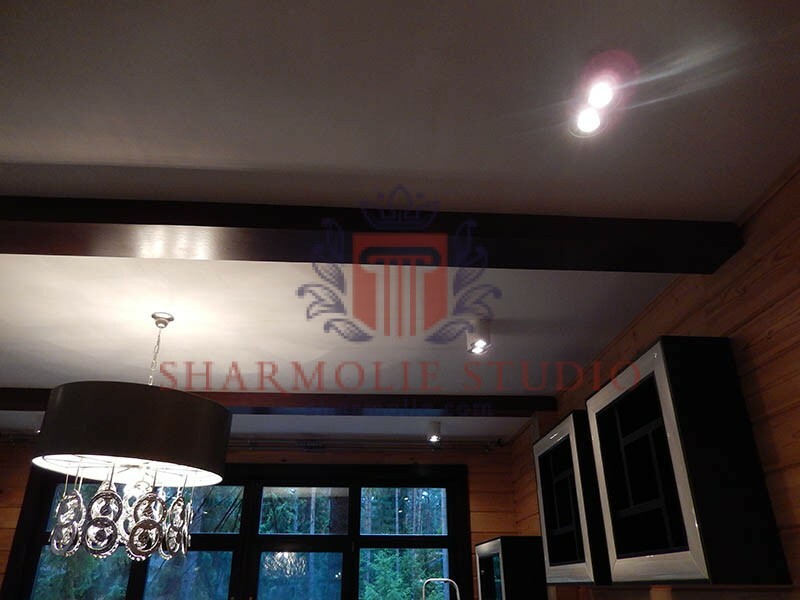 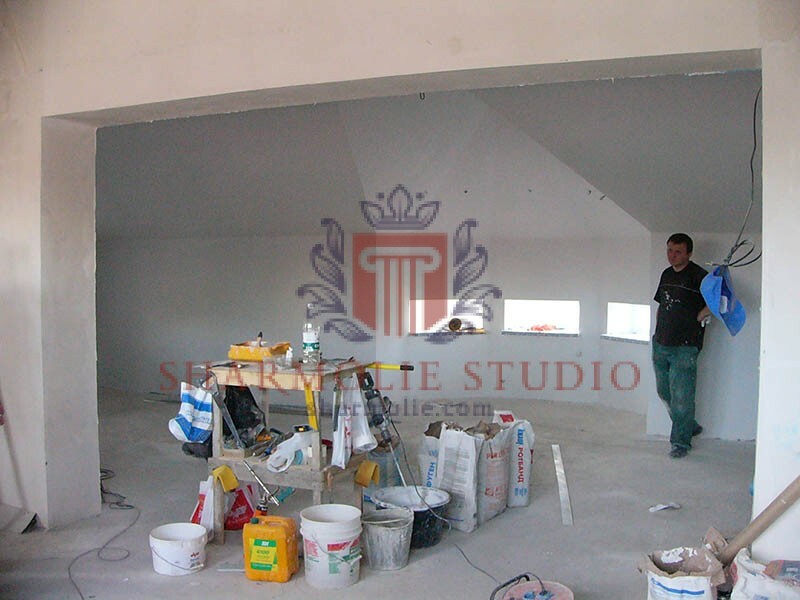 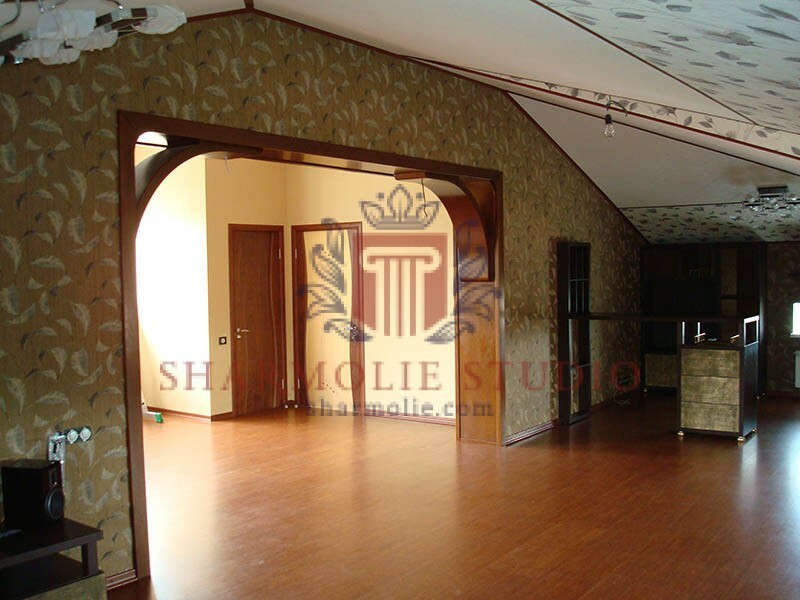 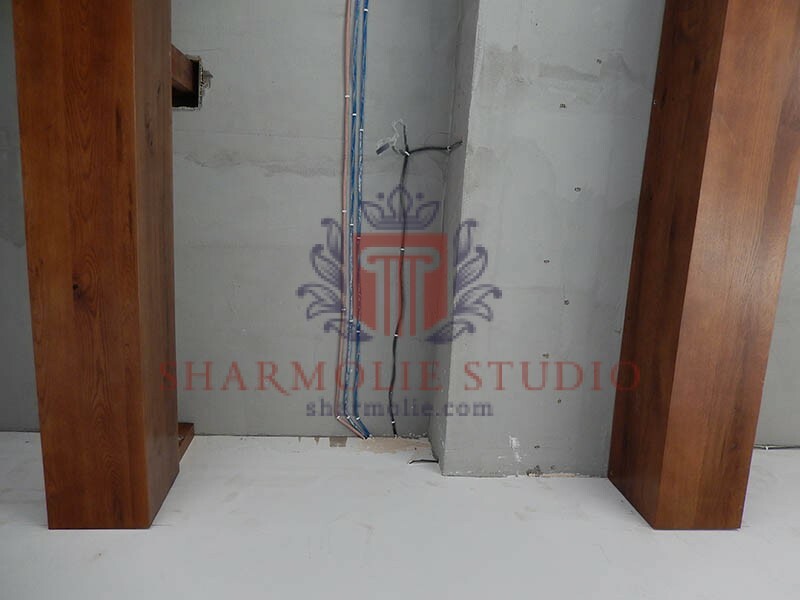 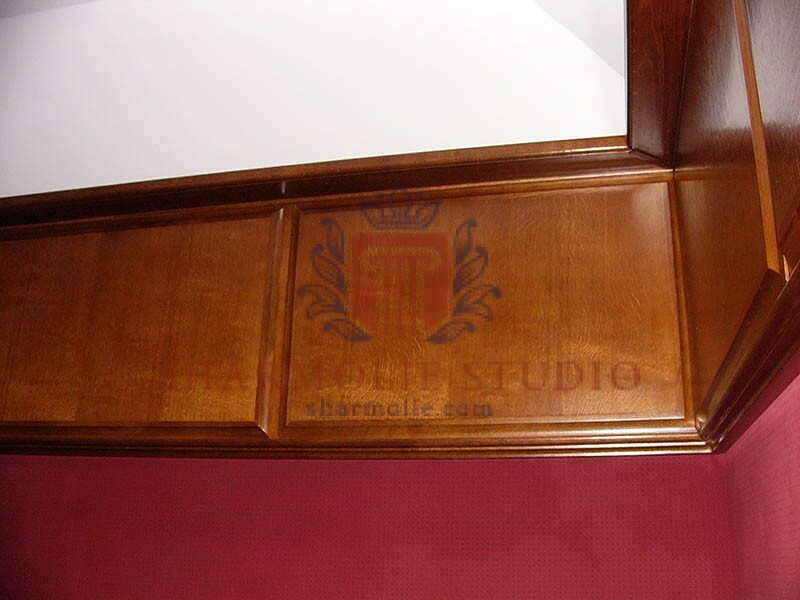 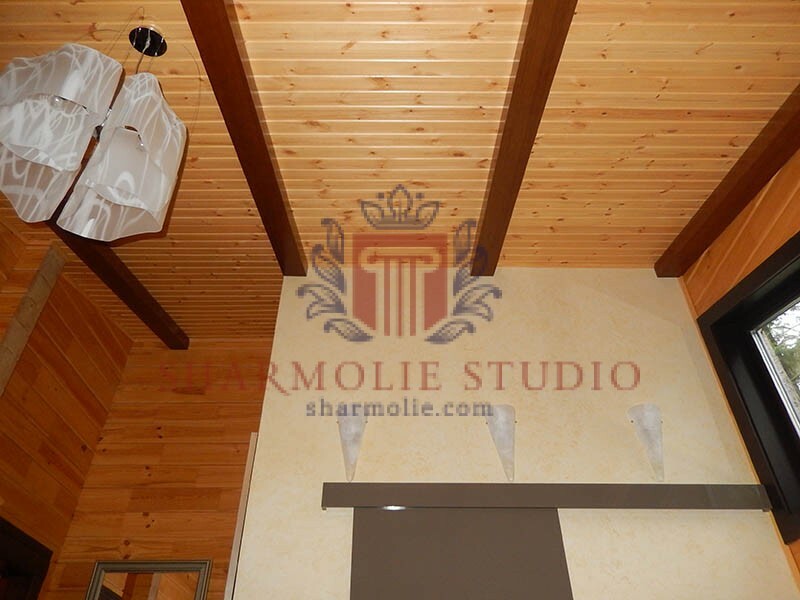 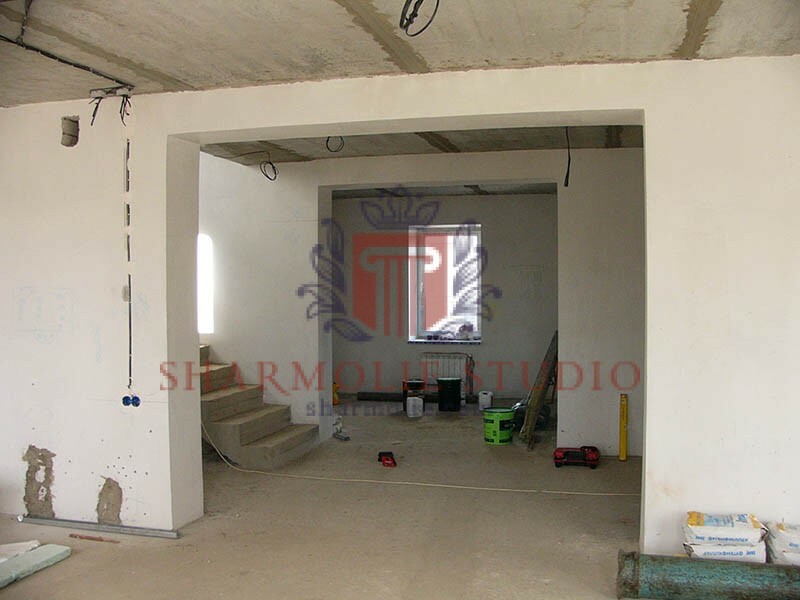 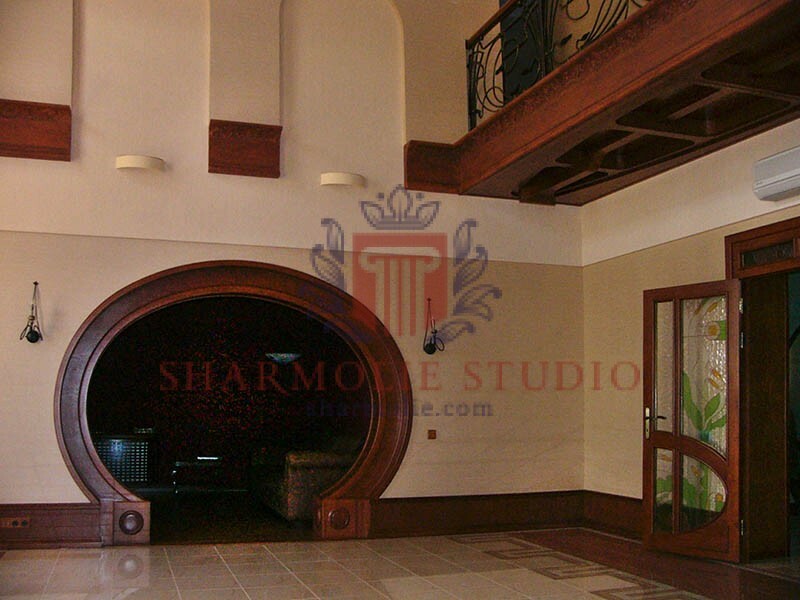 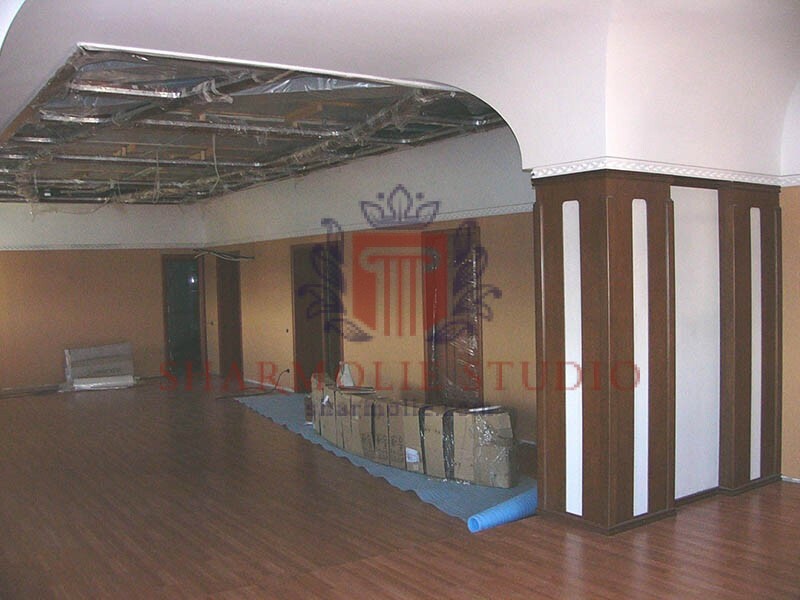 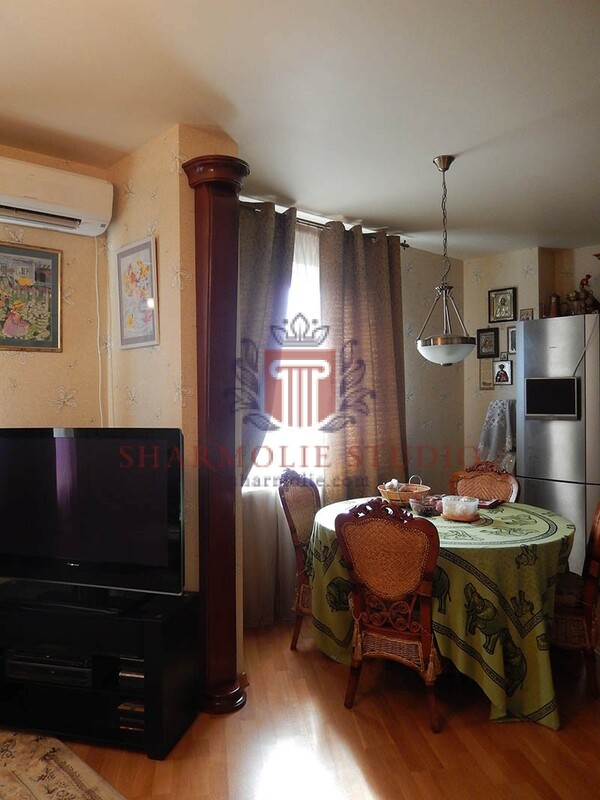 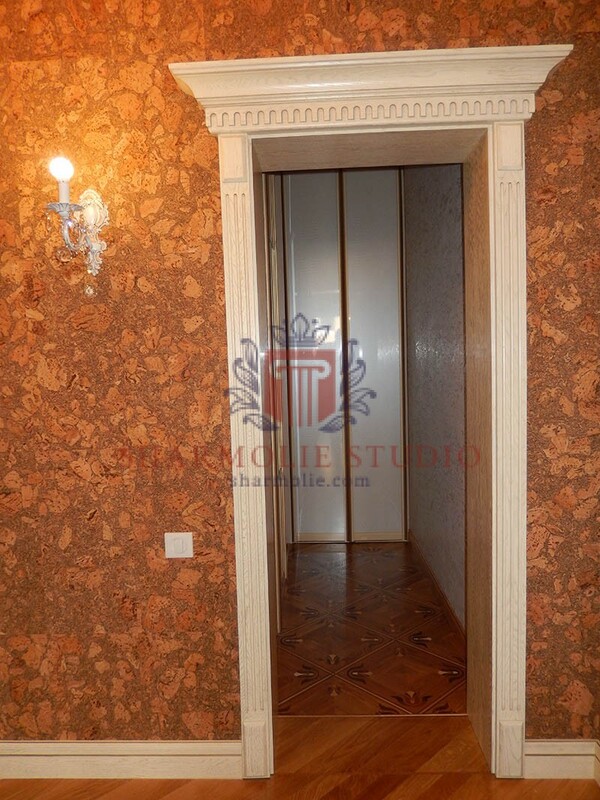 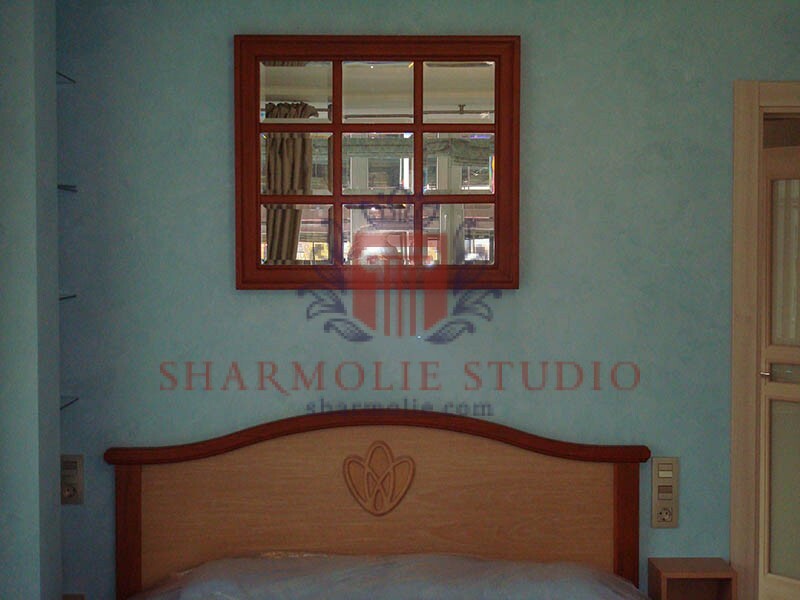 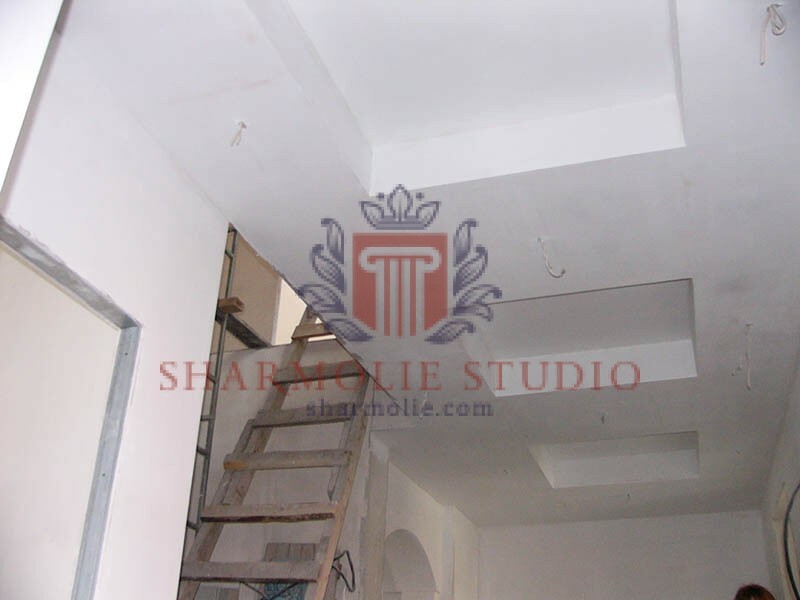 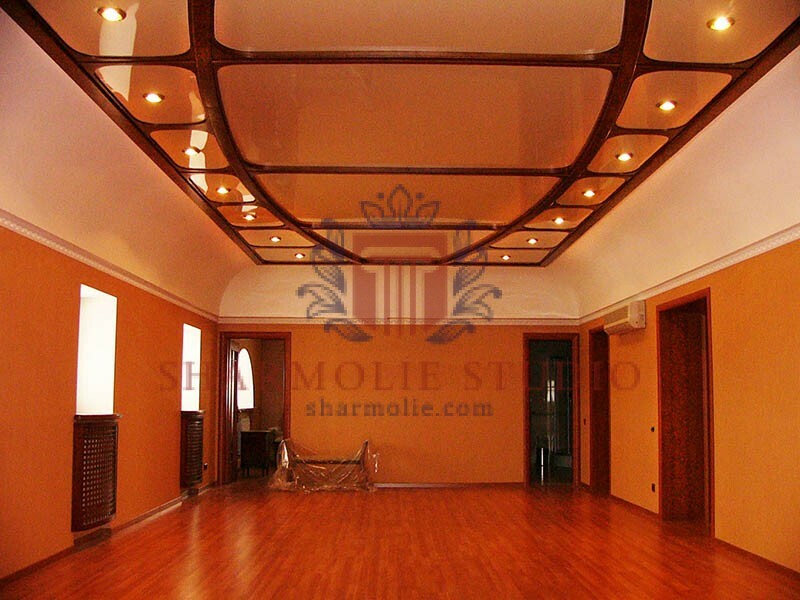 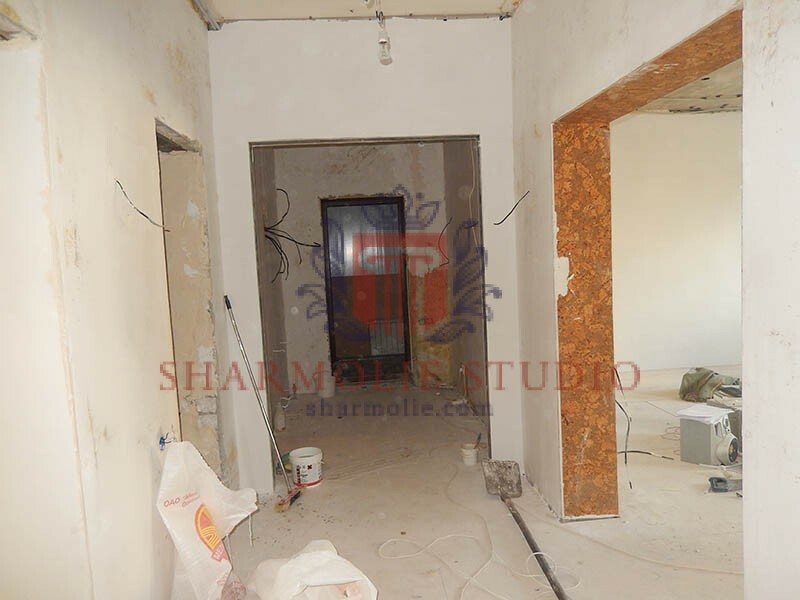 What can reflect professionalism and a decent level of Decor-Studio? 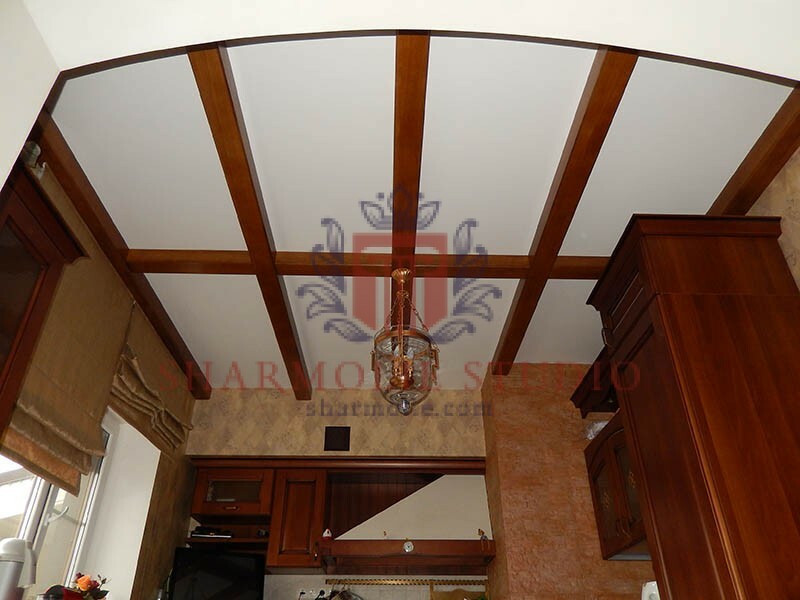 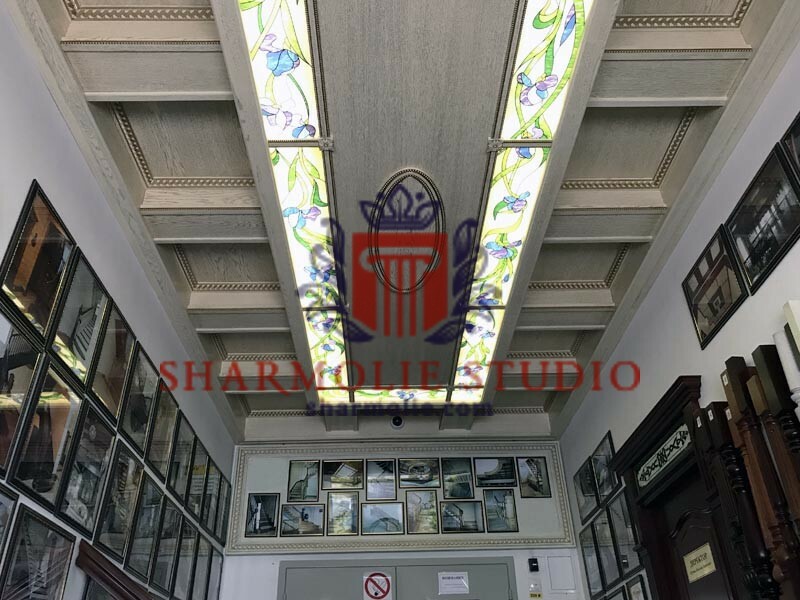 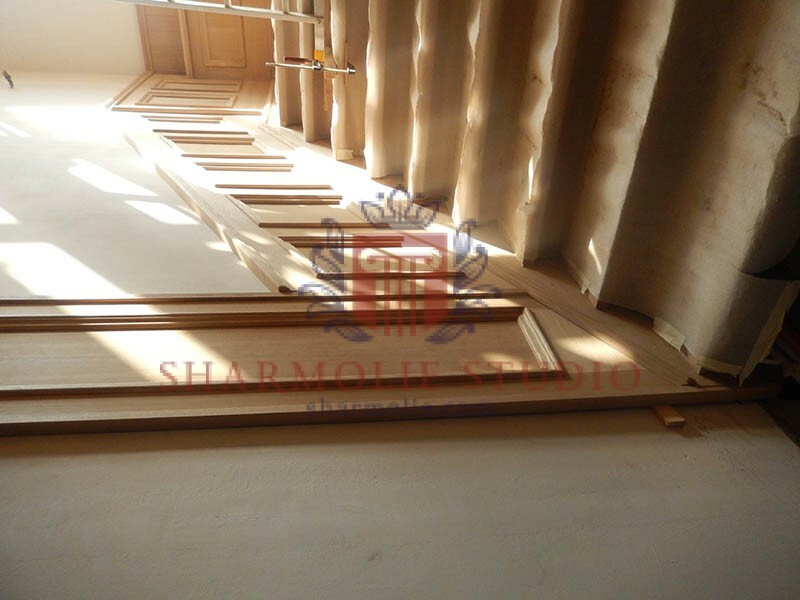 – Our customers consider, this is an absolute guarantee for the quality of materials and the preservation of the original appearance! 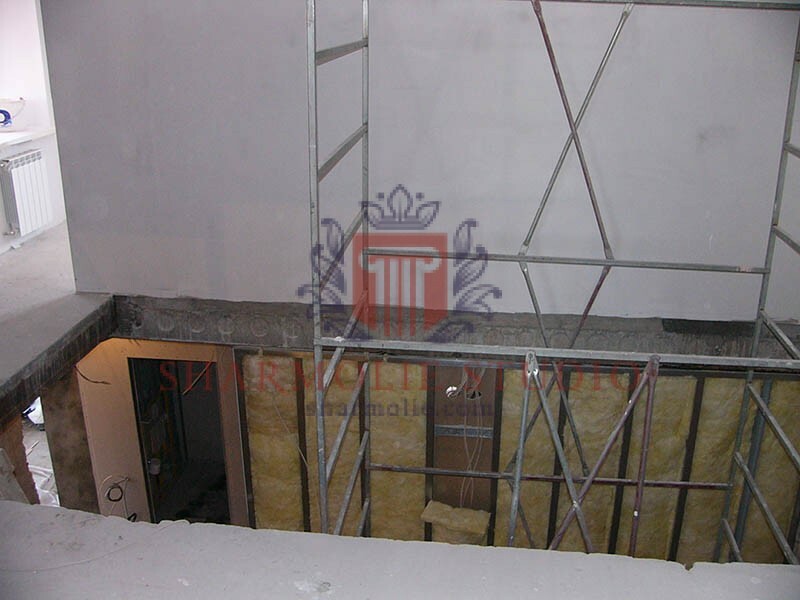 That's why we give a guarantee of 3 years for the completed projects after its installation! 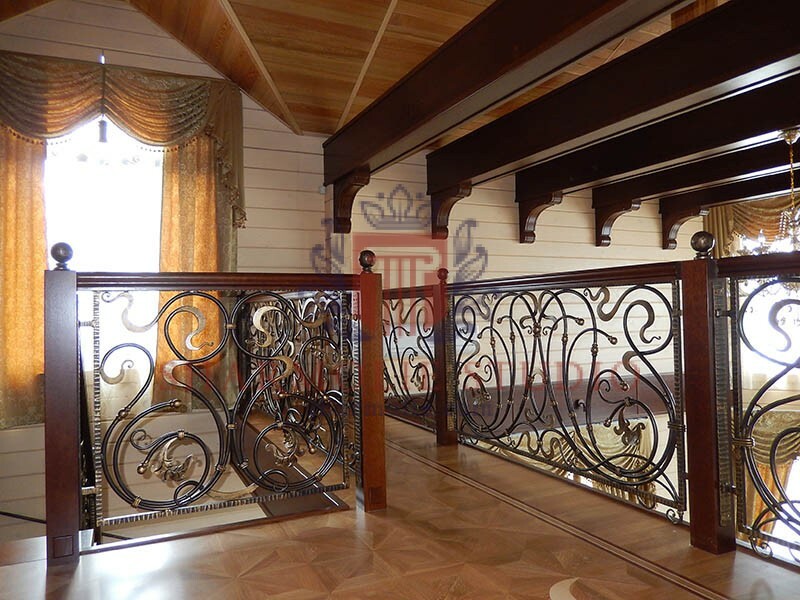 We have extensive experience in the decoration of different surfaces of their products as a mechanical means, and chemical materials. 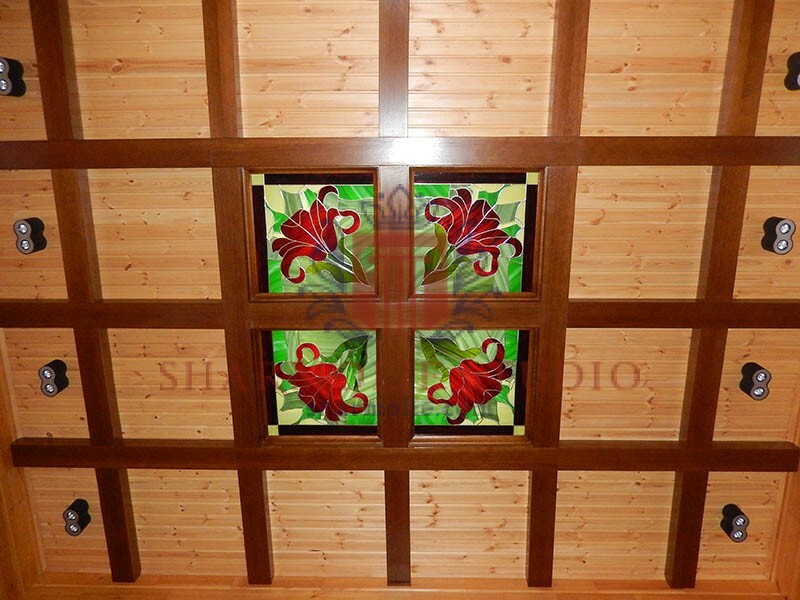 We use only eco-friendly materials. 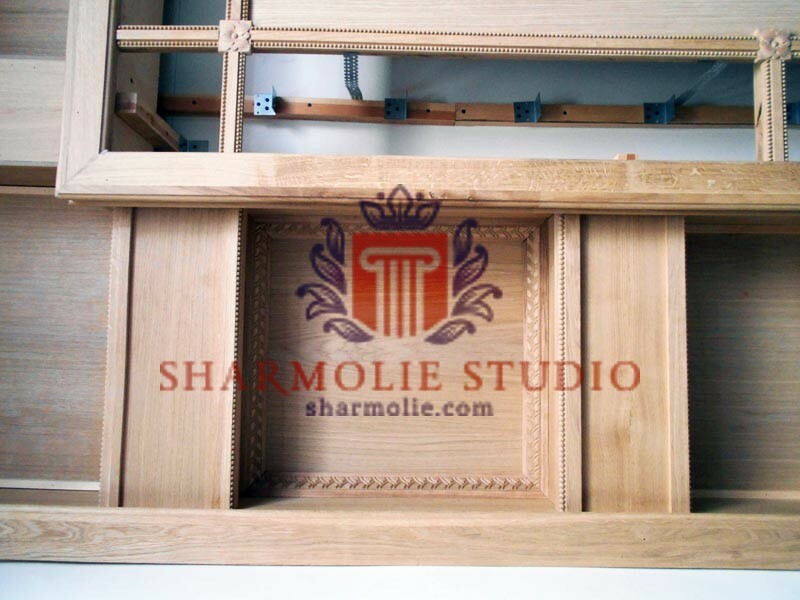 Which are none-allergic and absolutely safety for people's health. 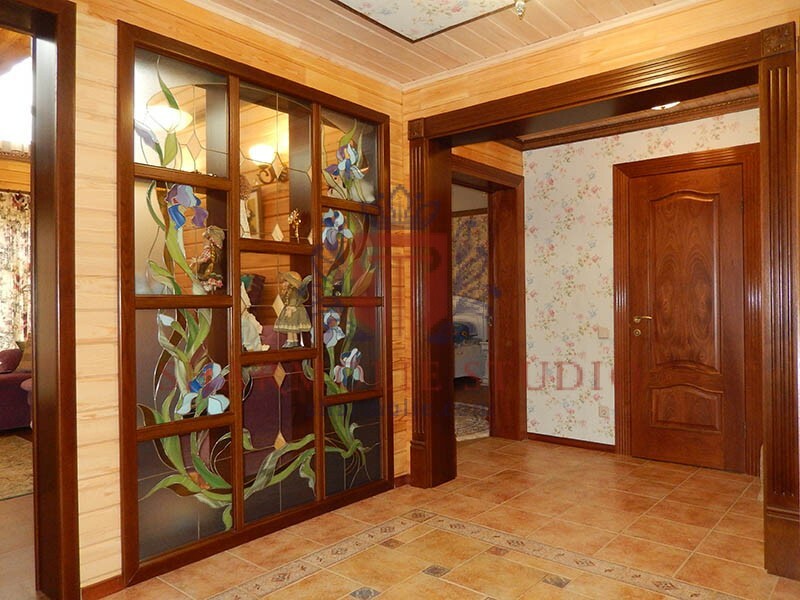 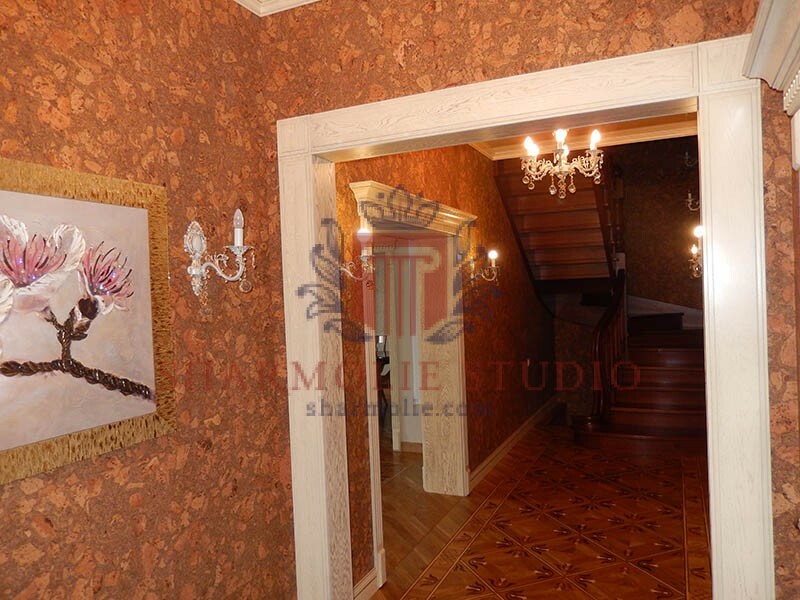 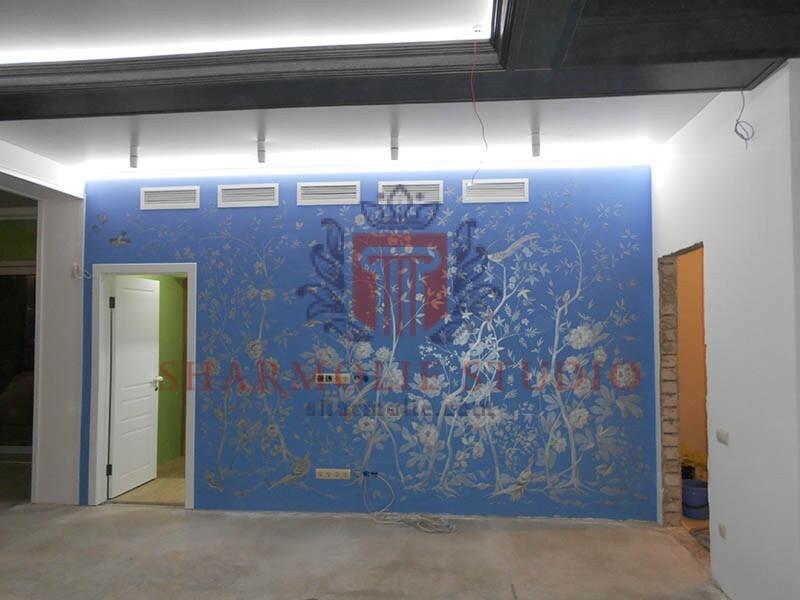 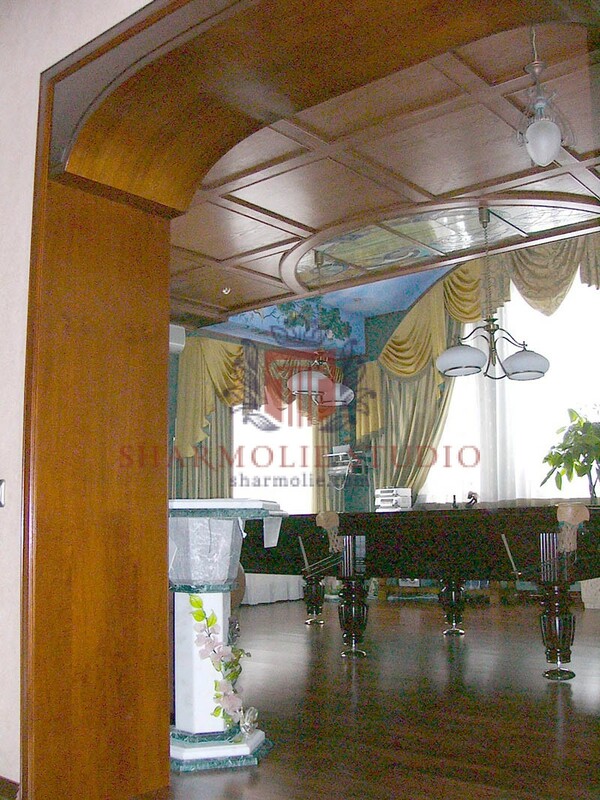 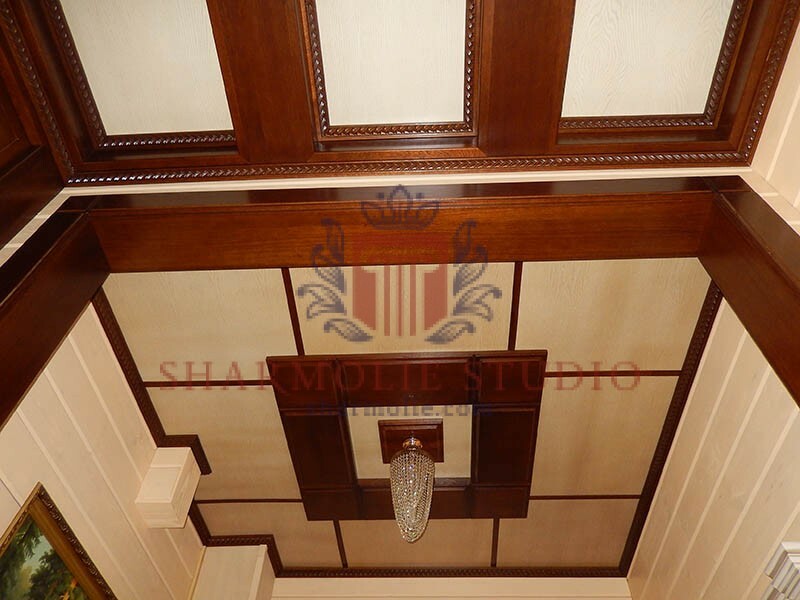 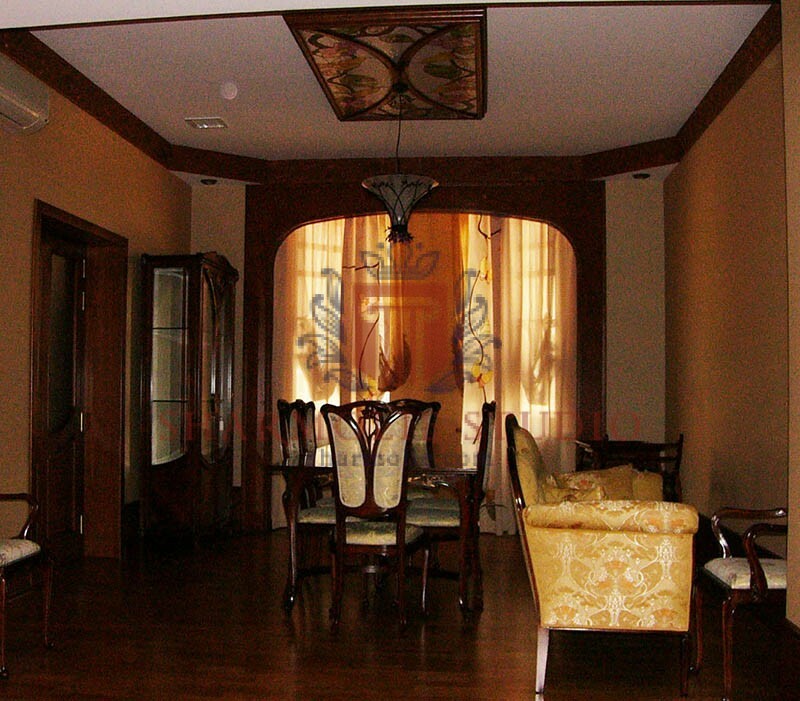 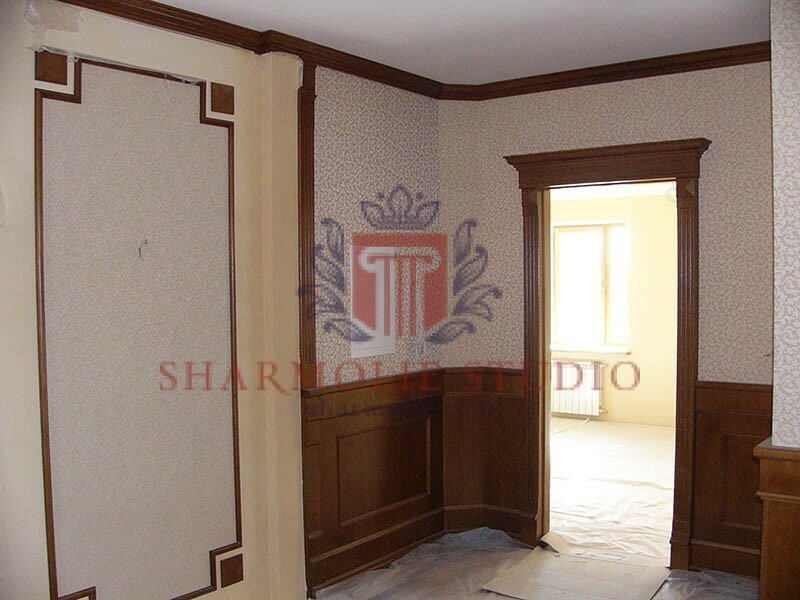 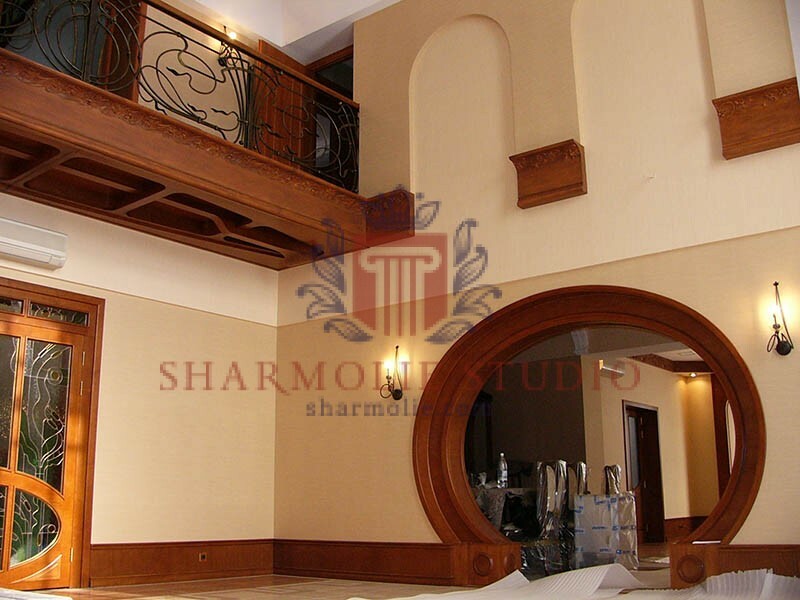 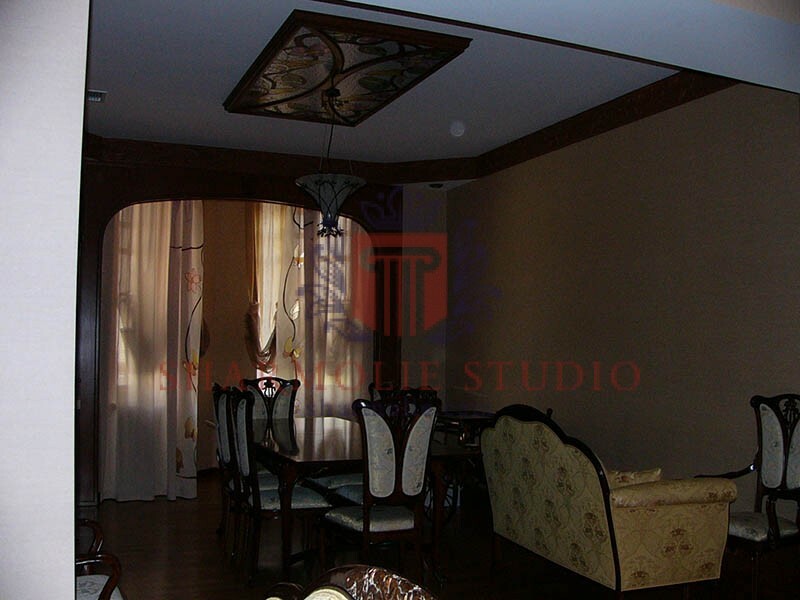 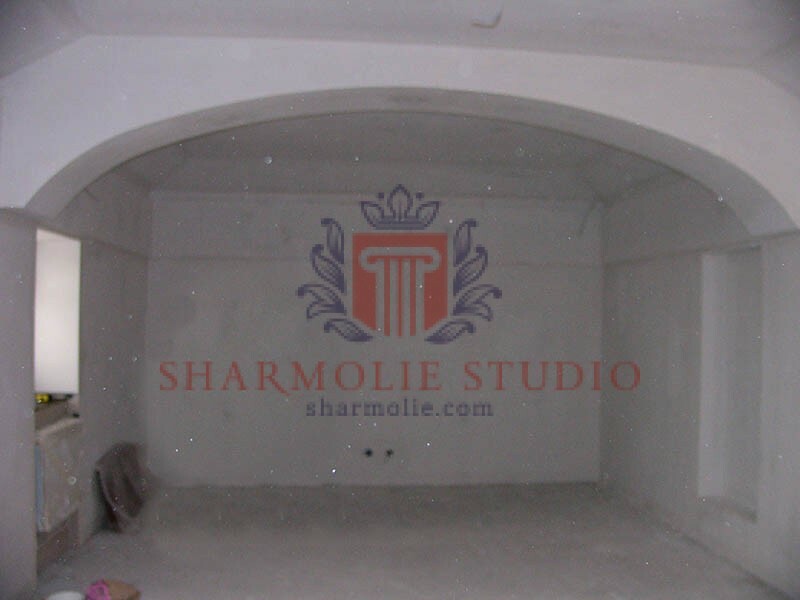 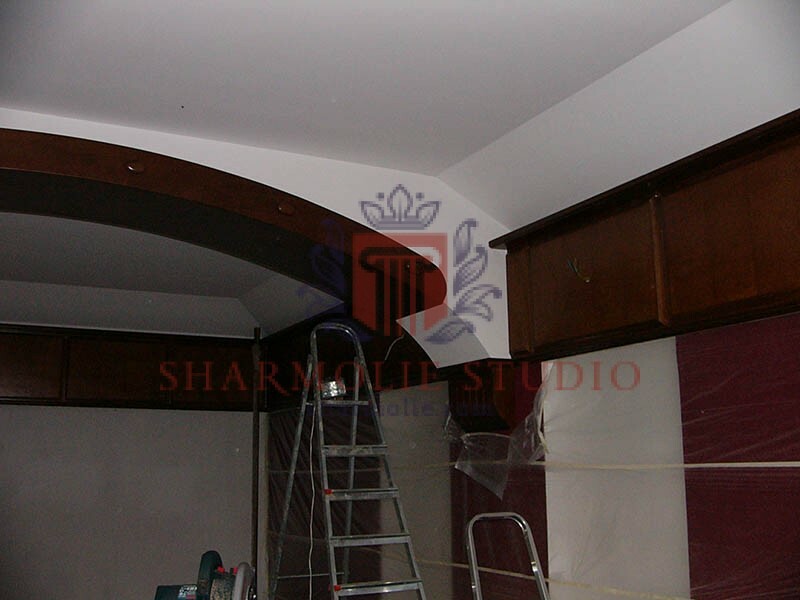 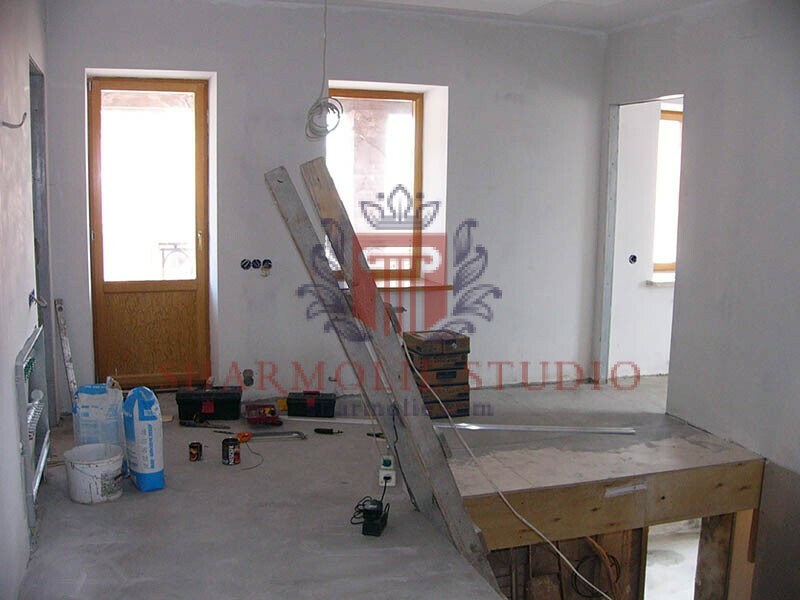 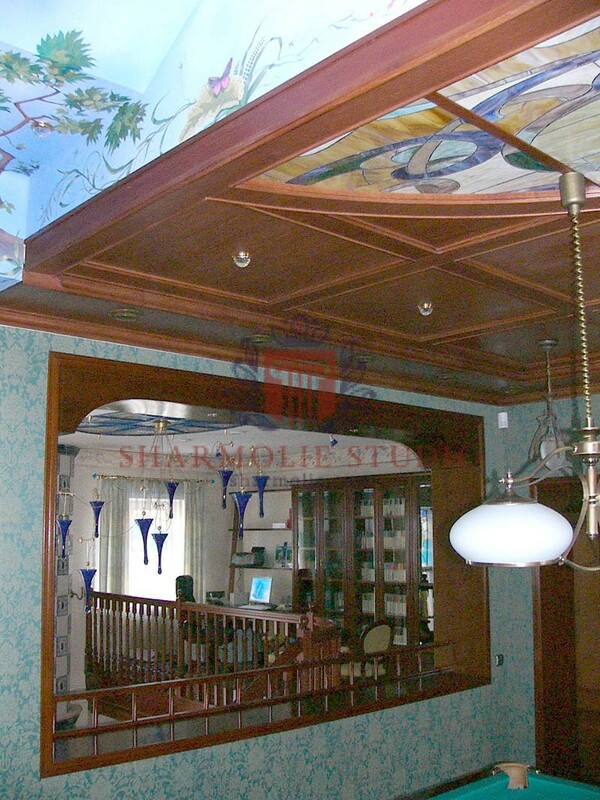 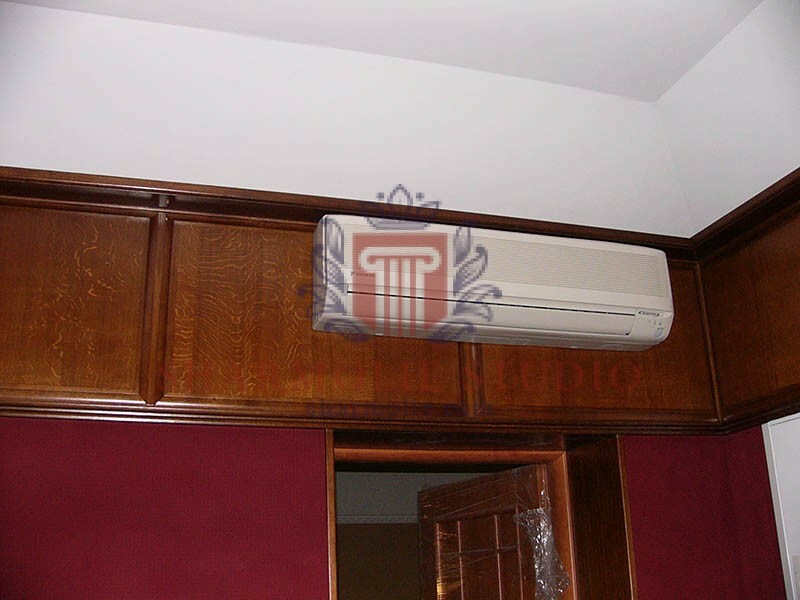 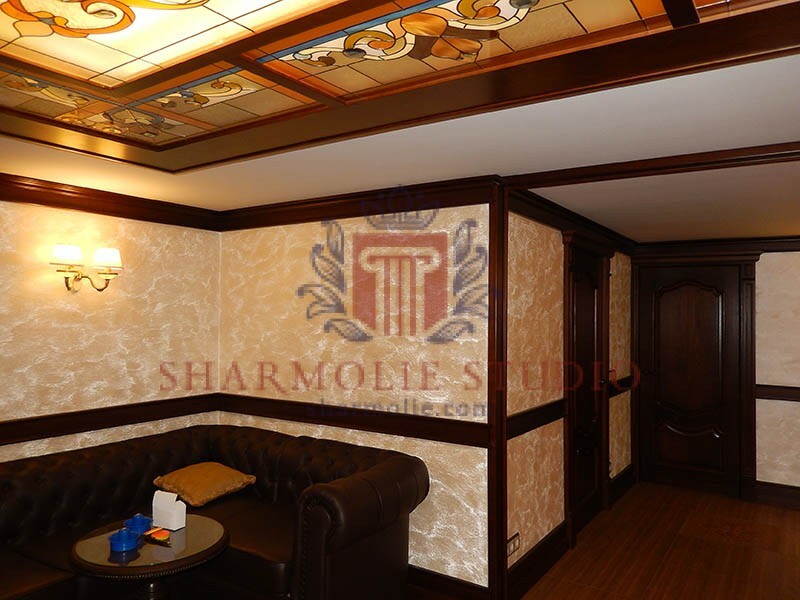 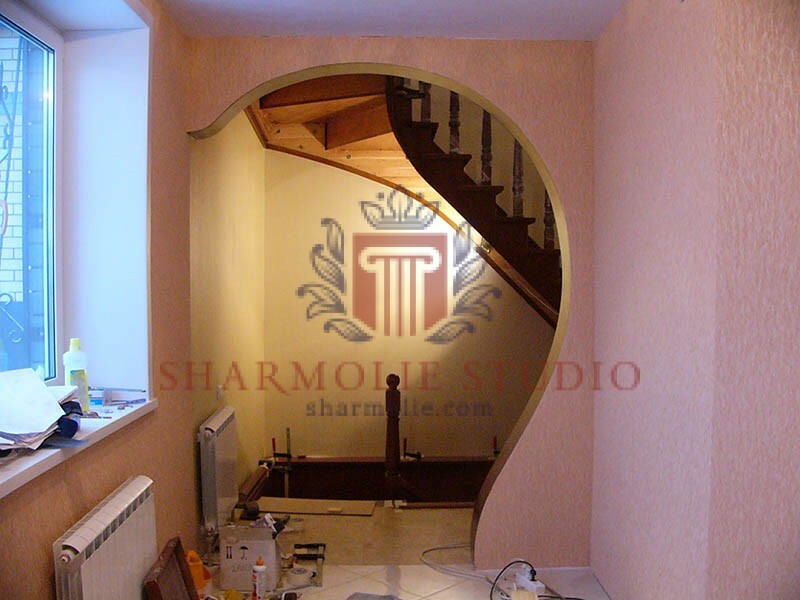 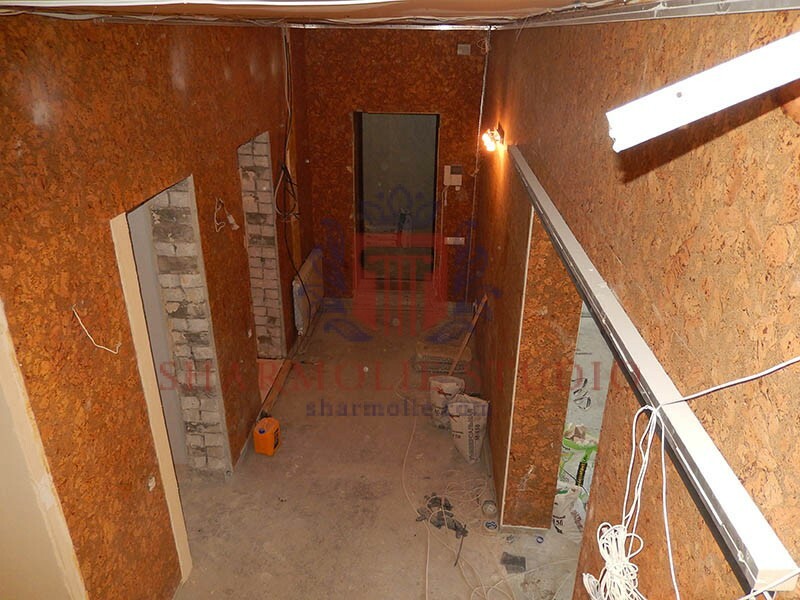 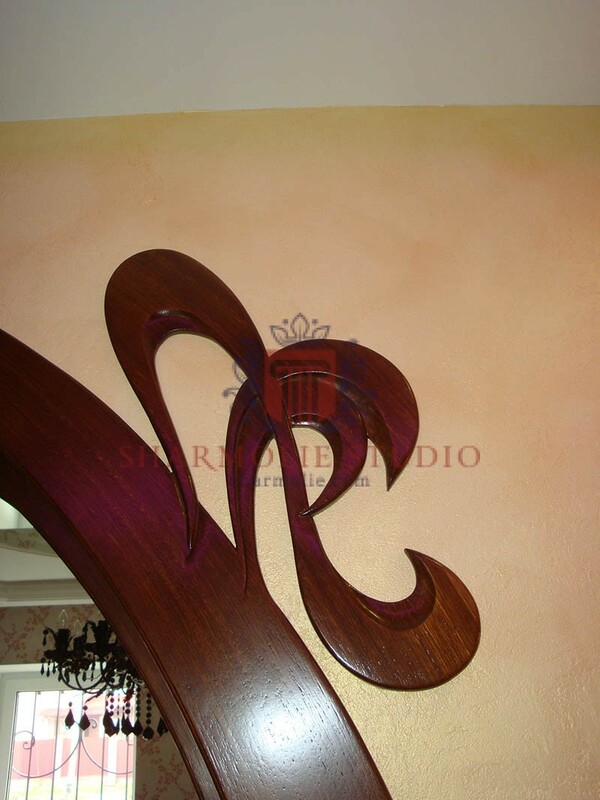 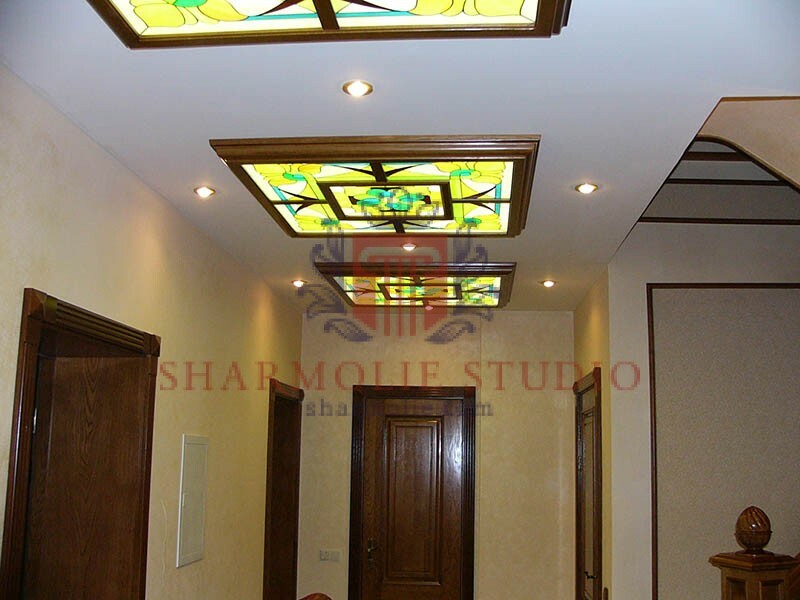 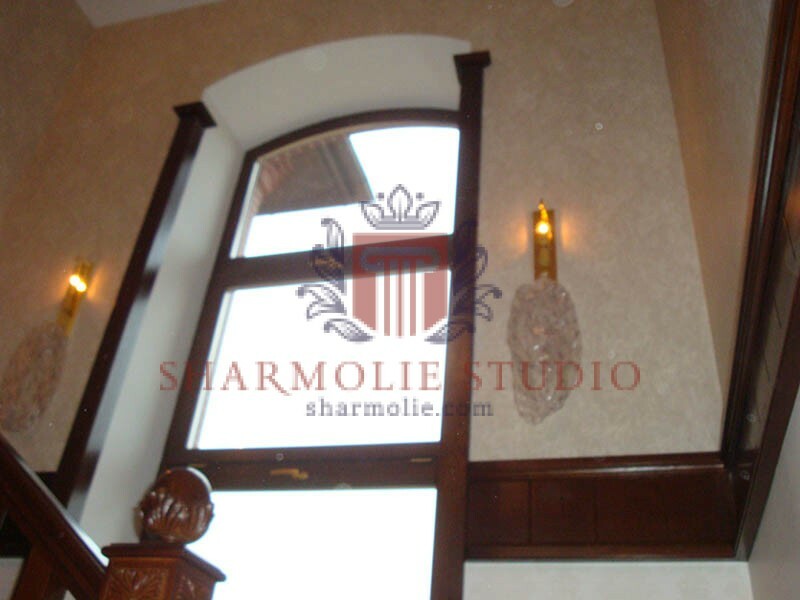 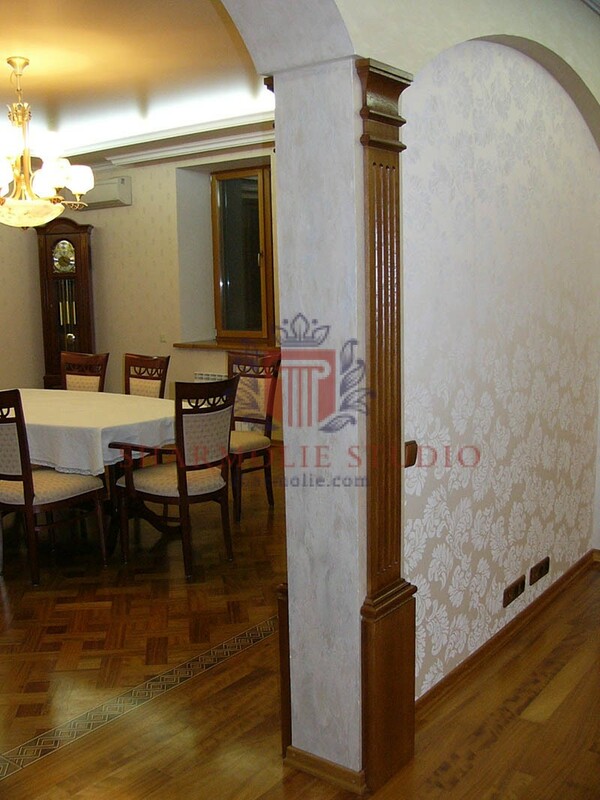 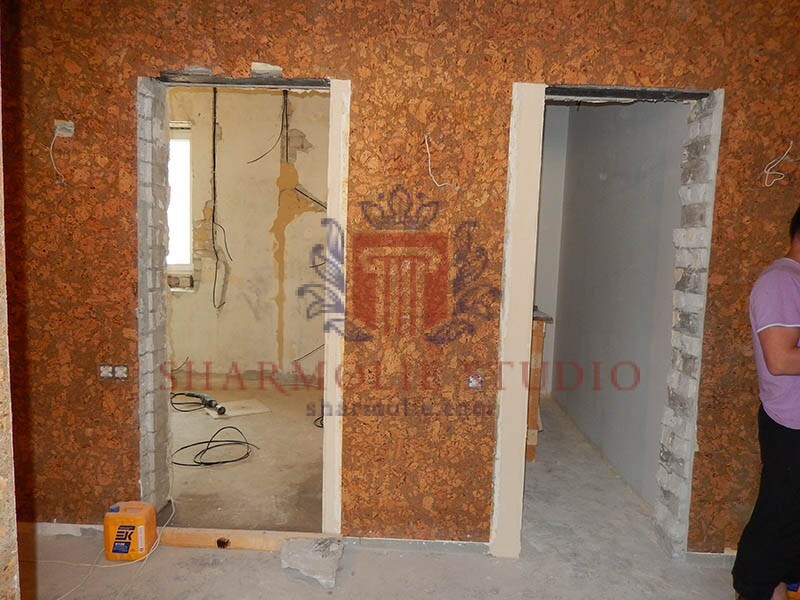 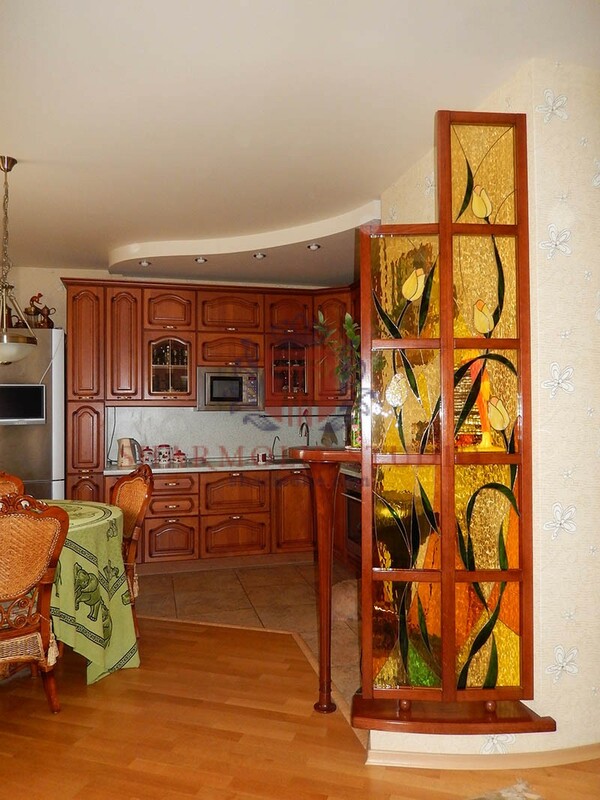 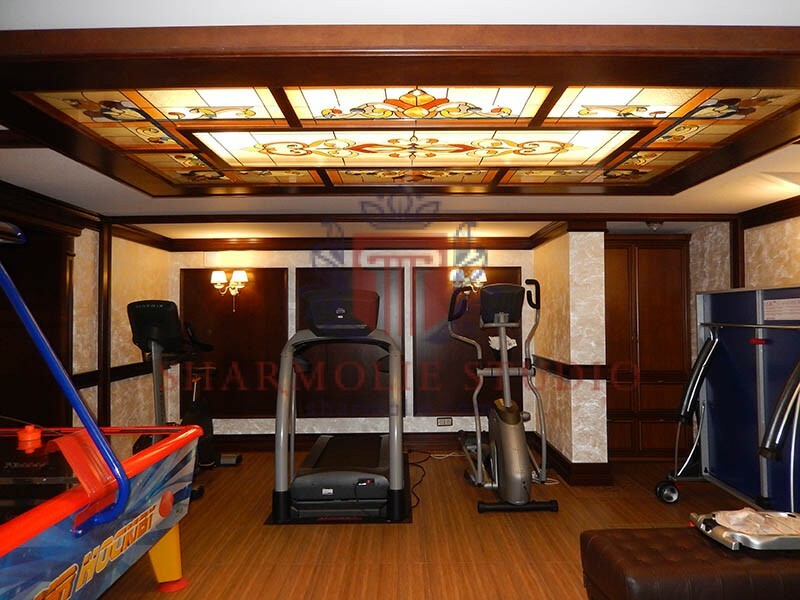 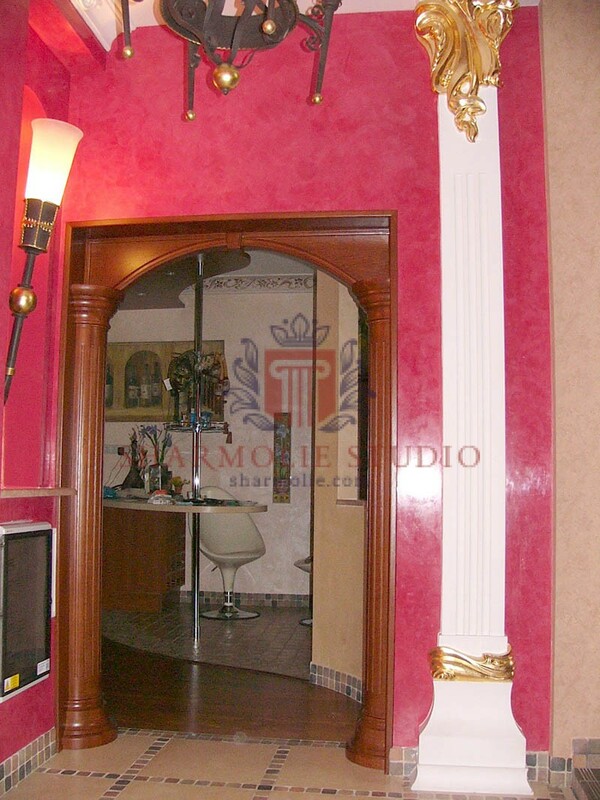 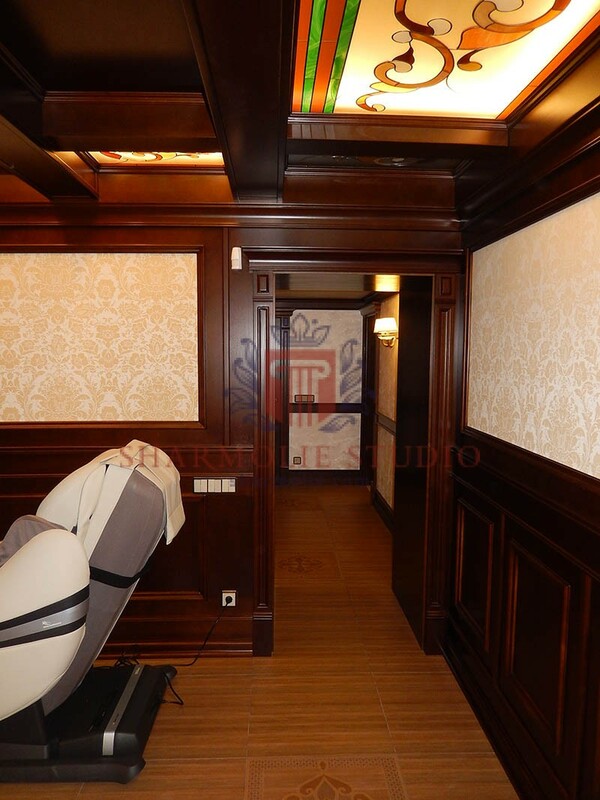 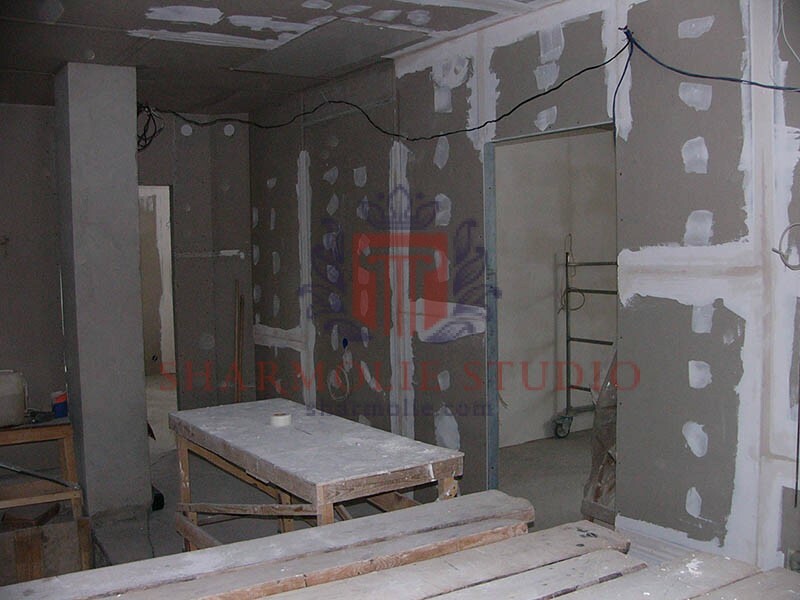 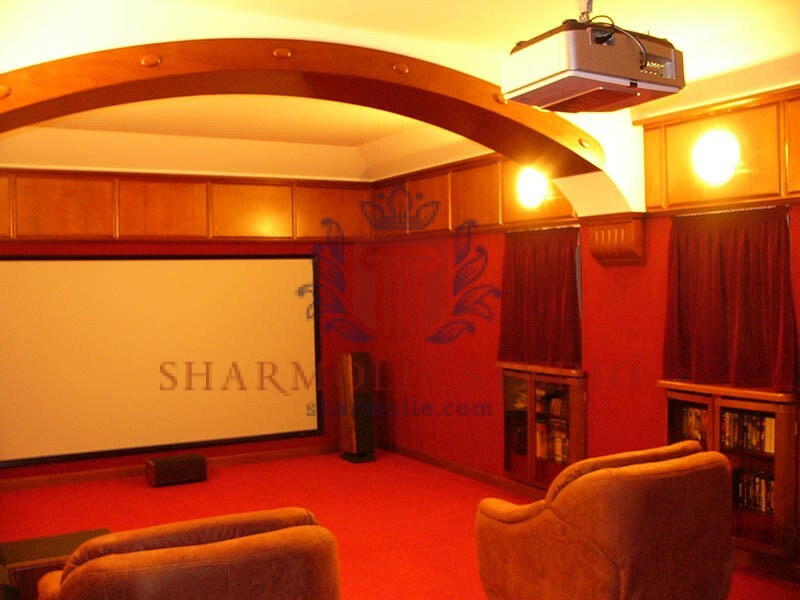 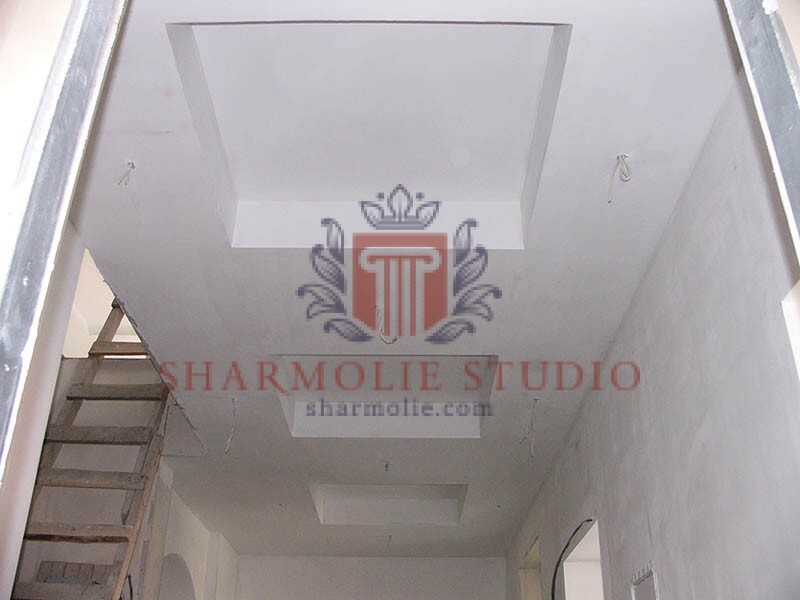 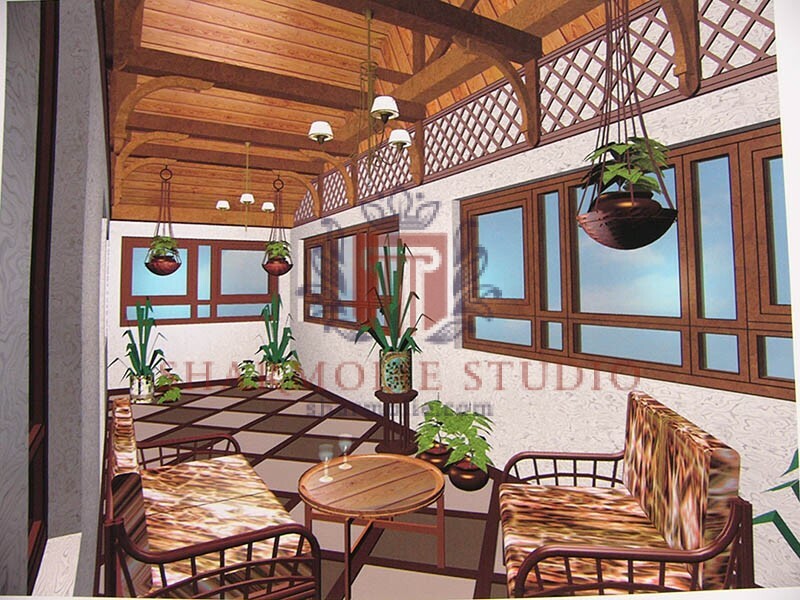 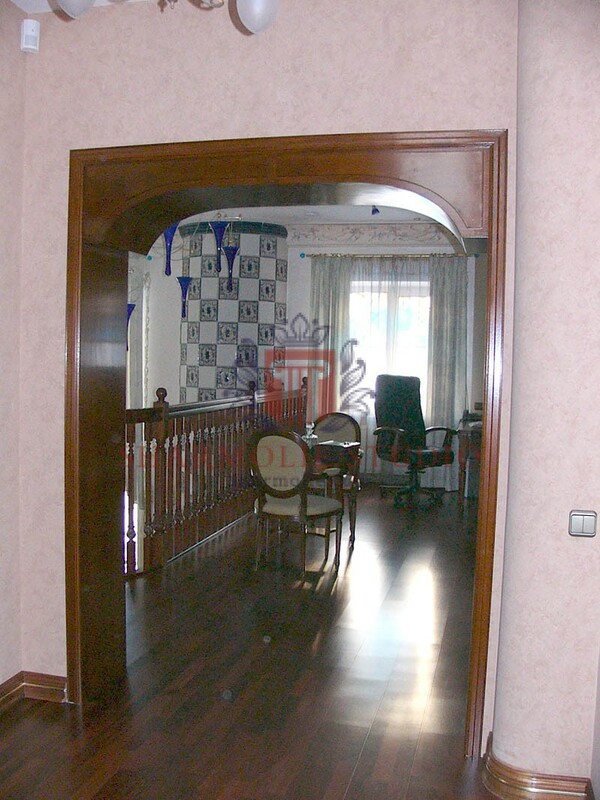 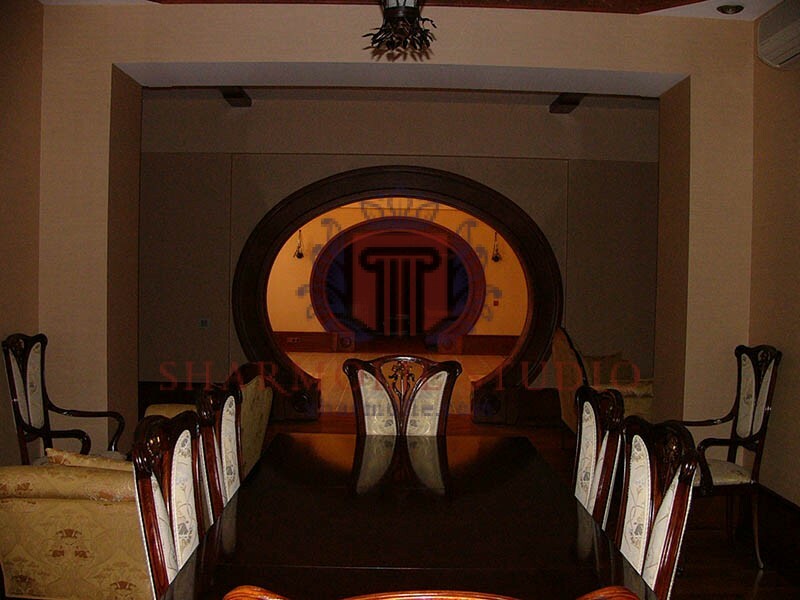 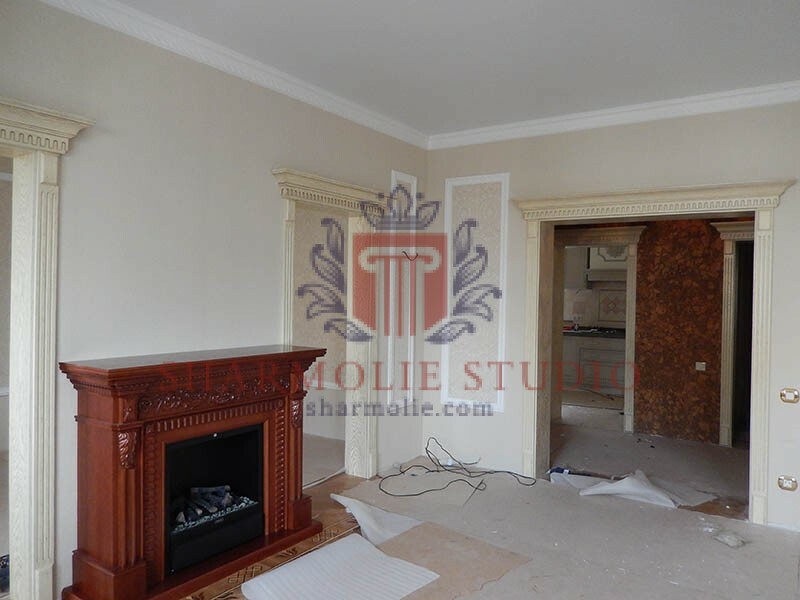 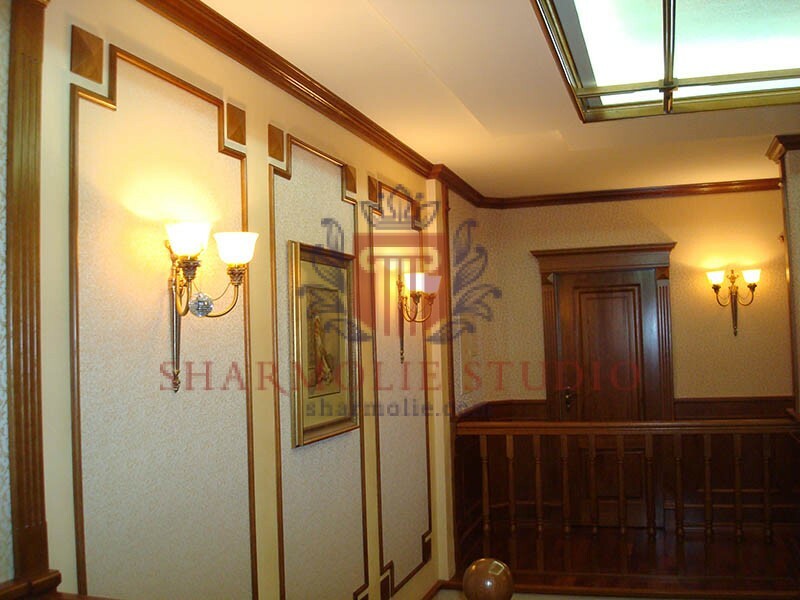 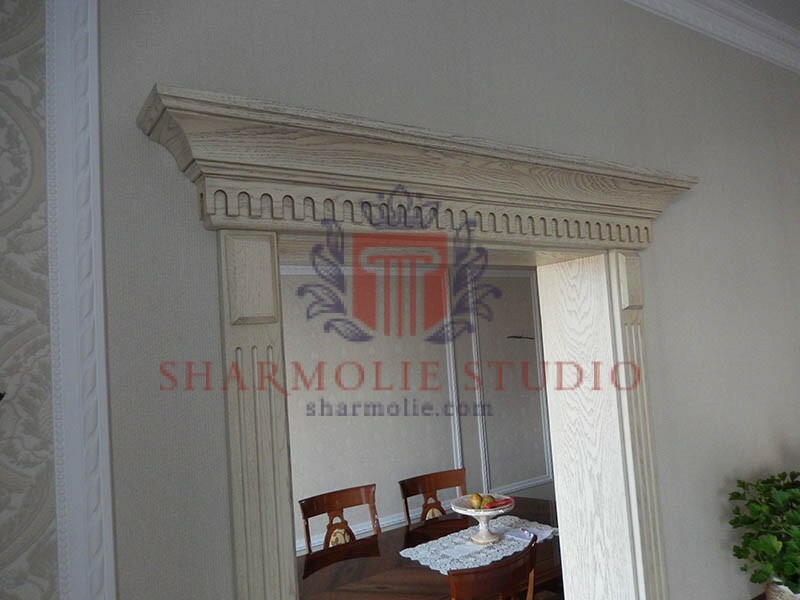 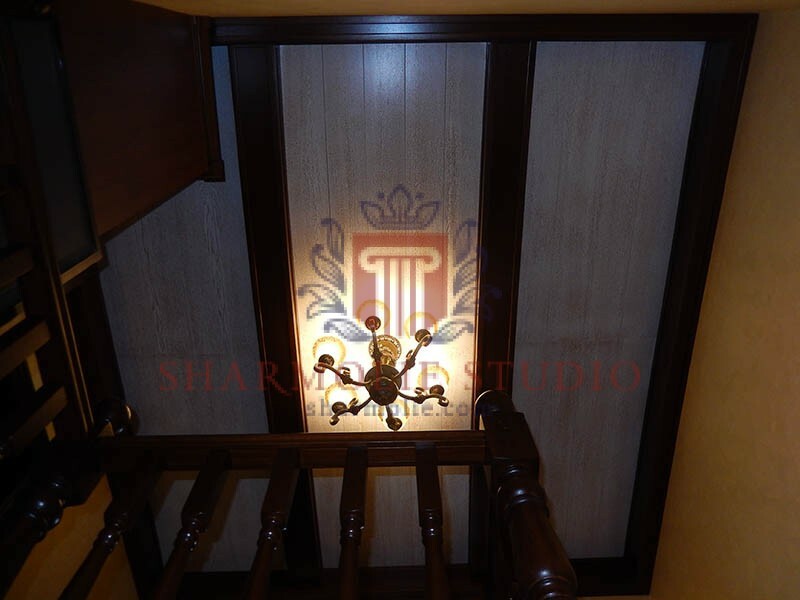 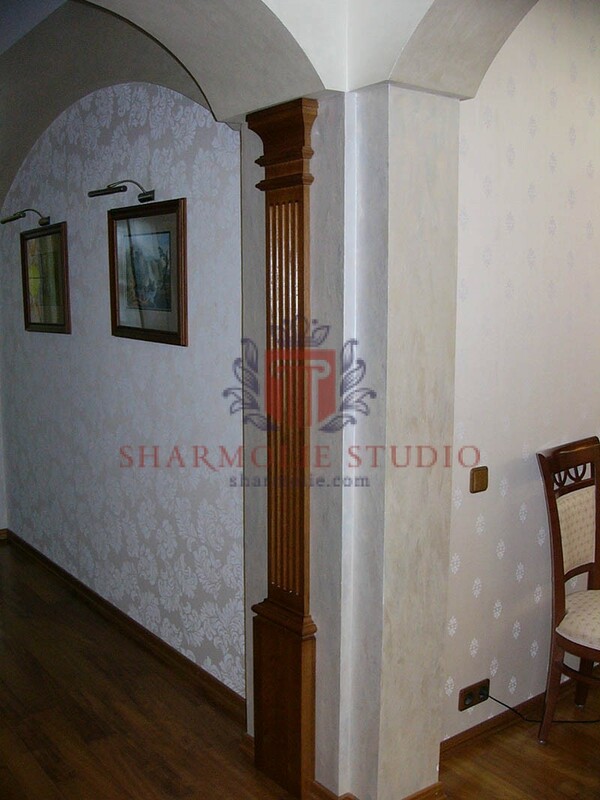 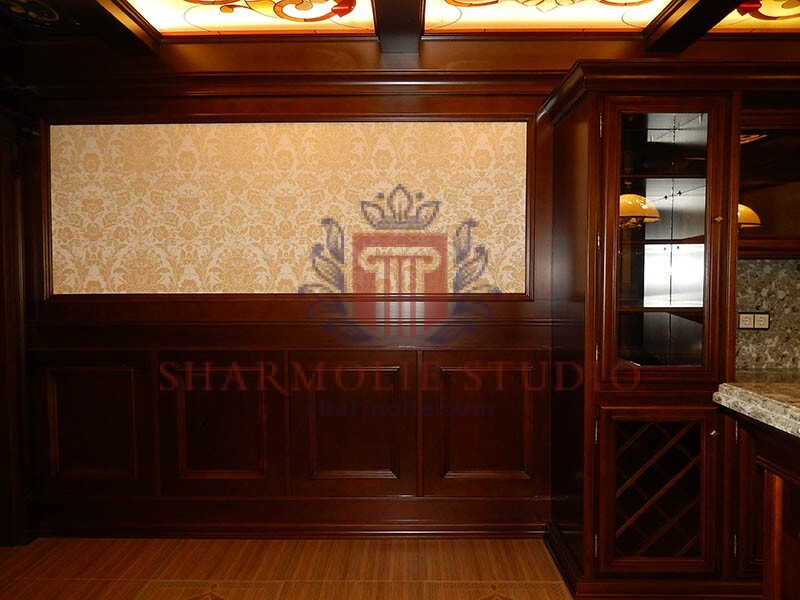 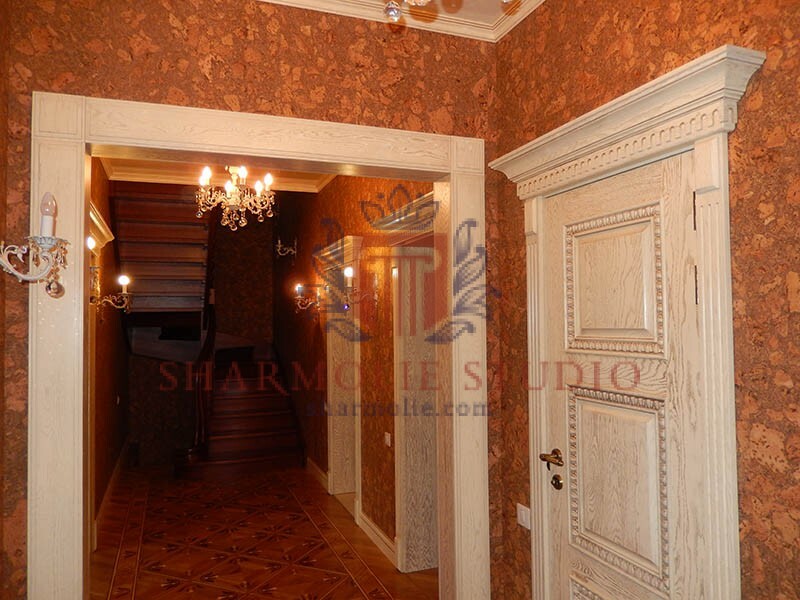 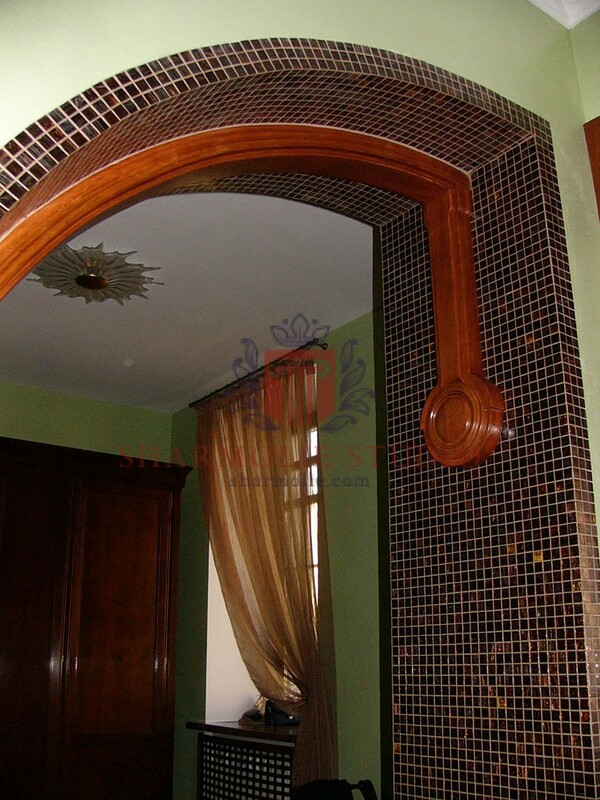 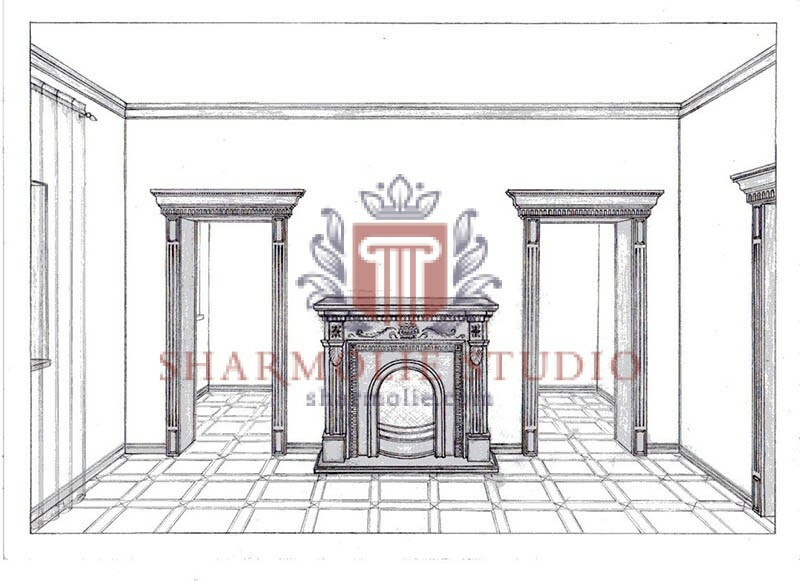 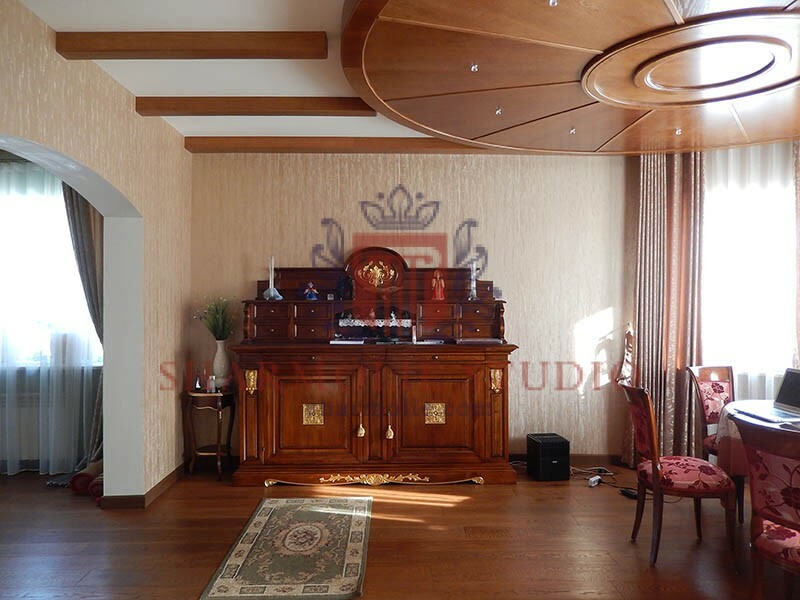 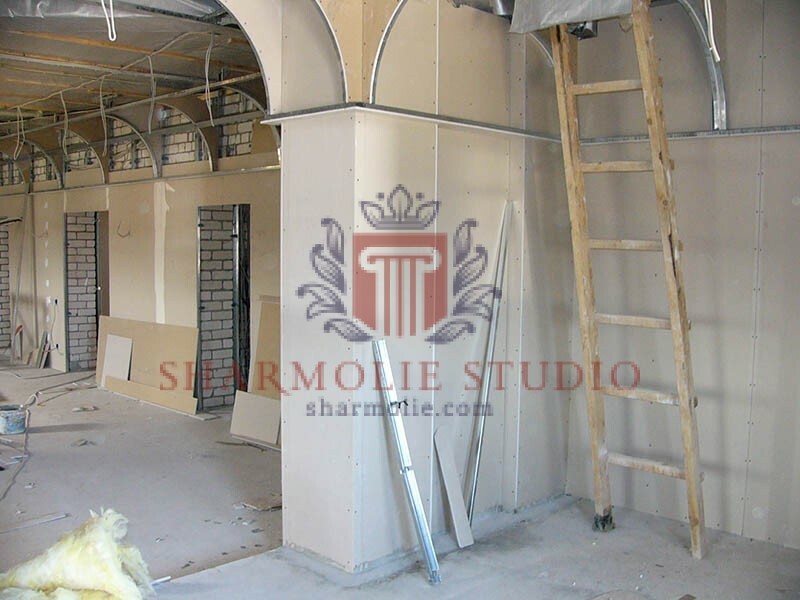 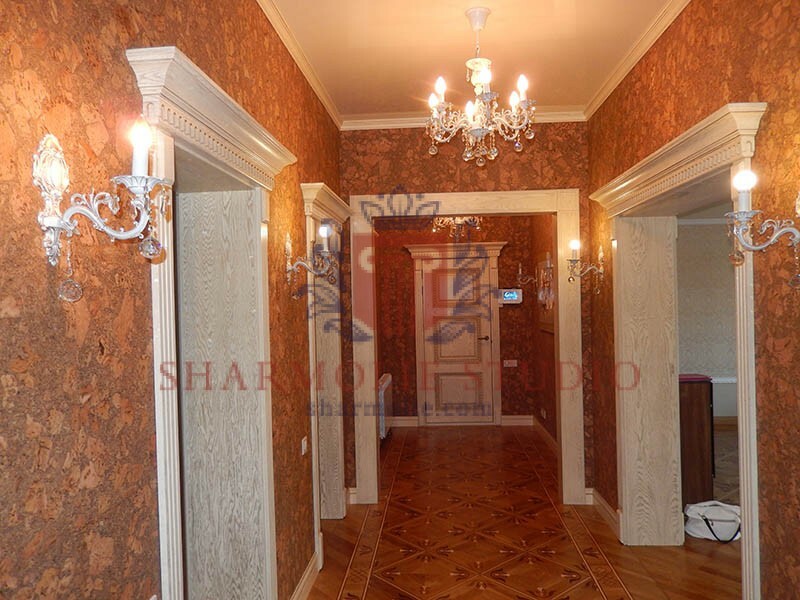 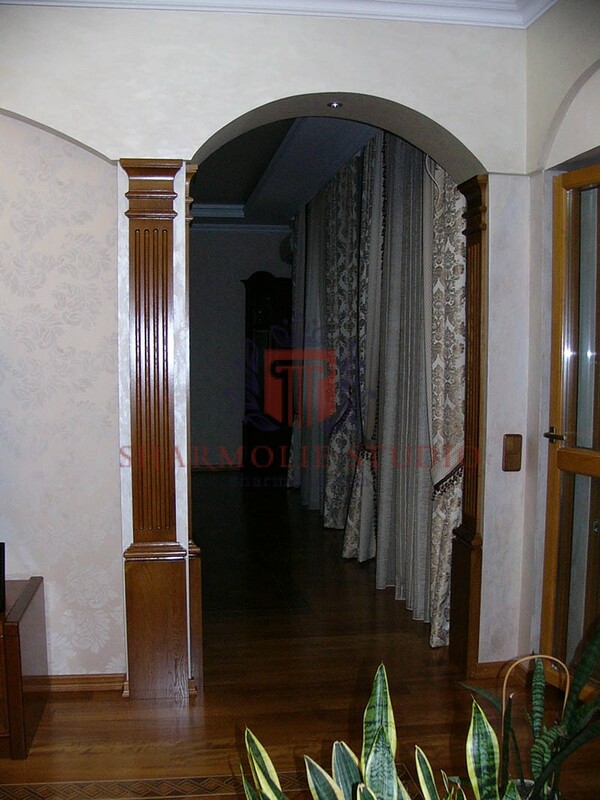 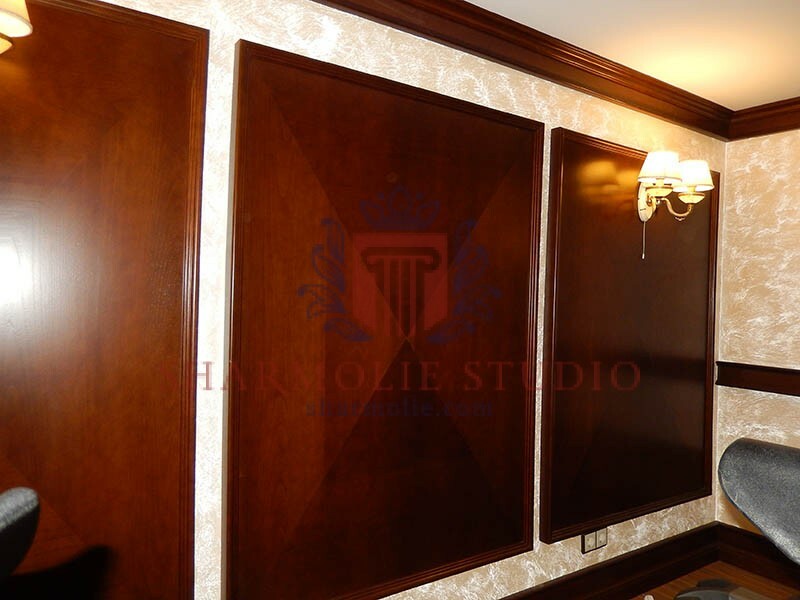 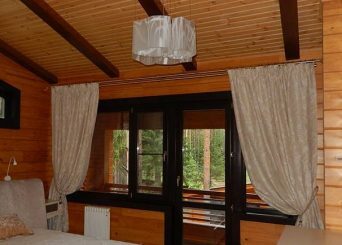 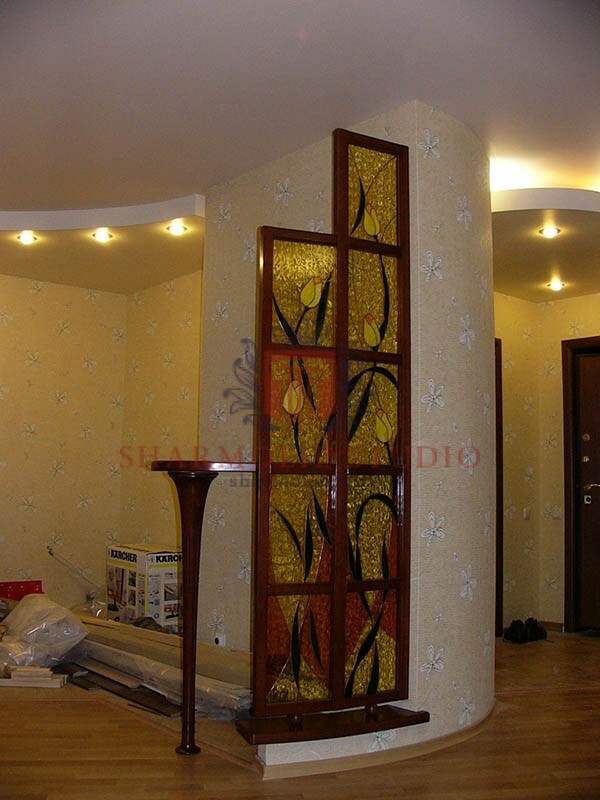 Decor-Projects need professional hands of the person who will install the composition group in the room. 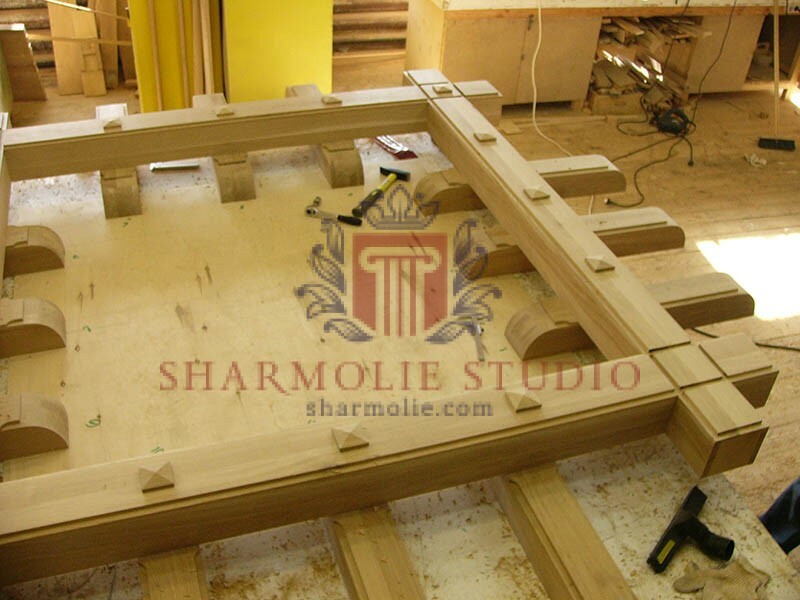 That is why the implementation of the final stage - the installation of all the elements, we all take on our self! 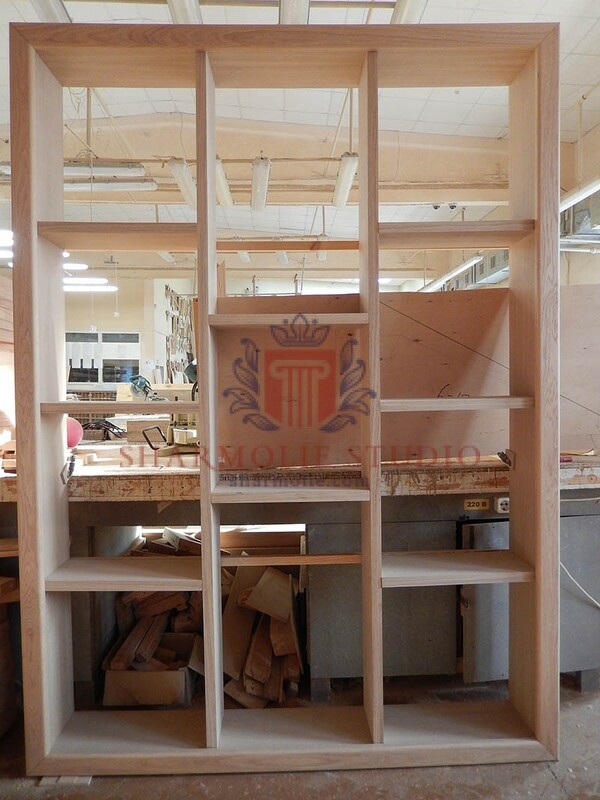 There is a project? 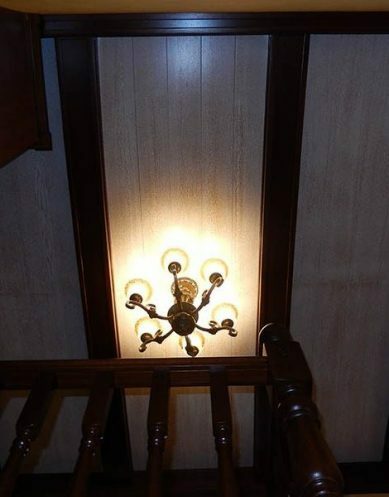 Let's discuss? 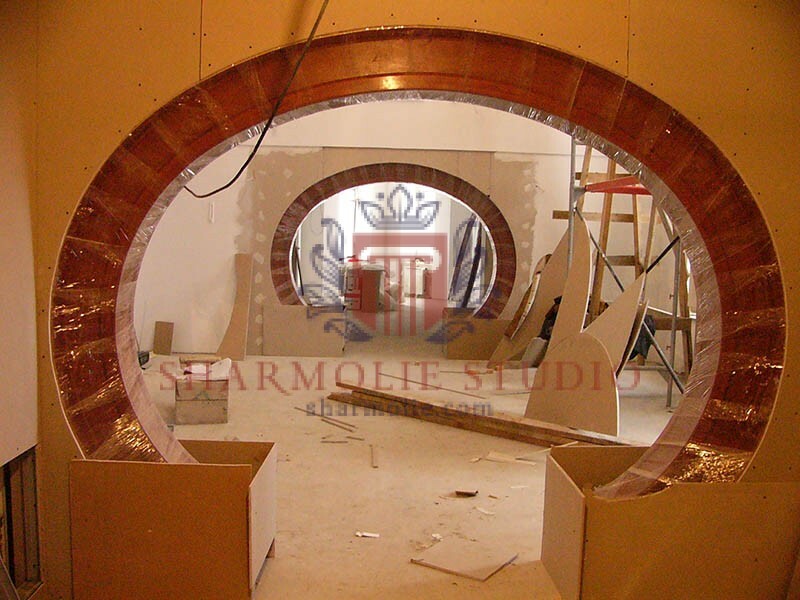 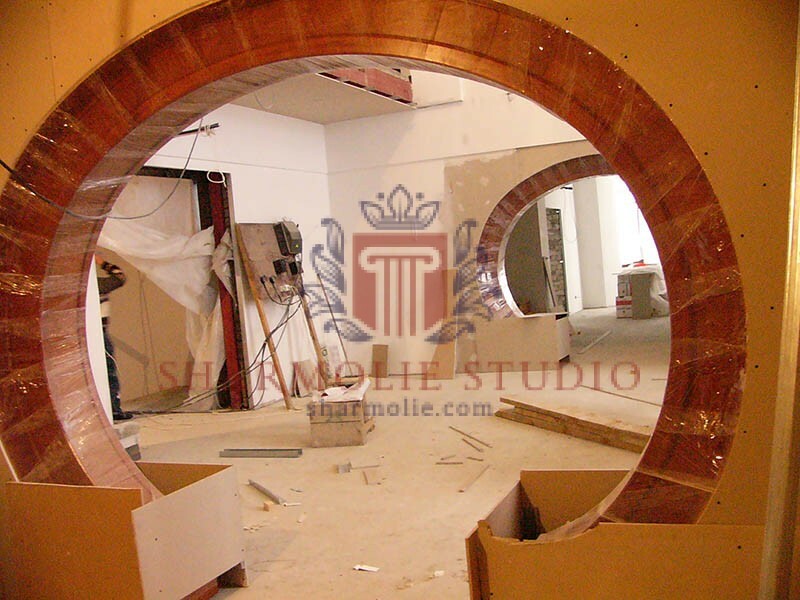 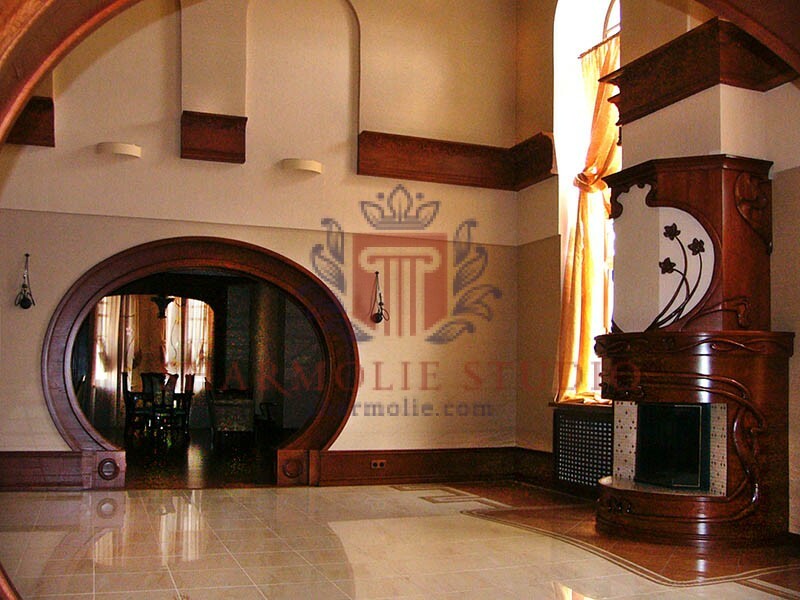 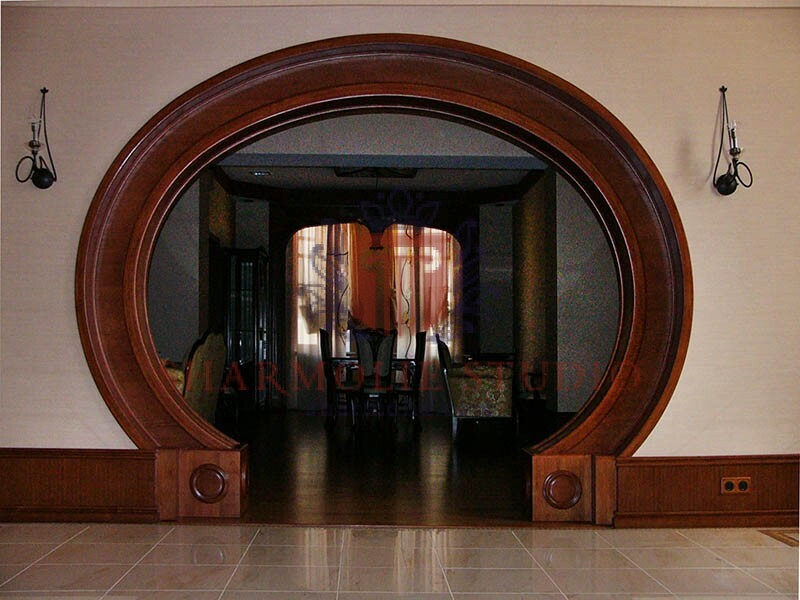 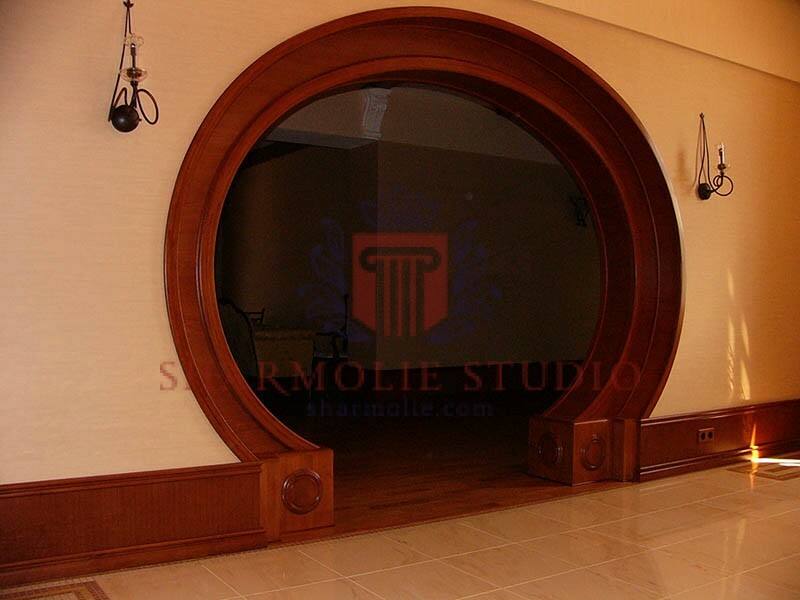 How do we produce our arches and portals? 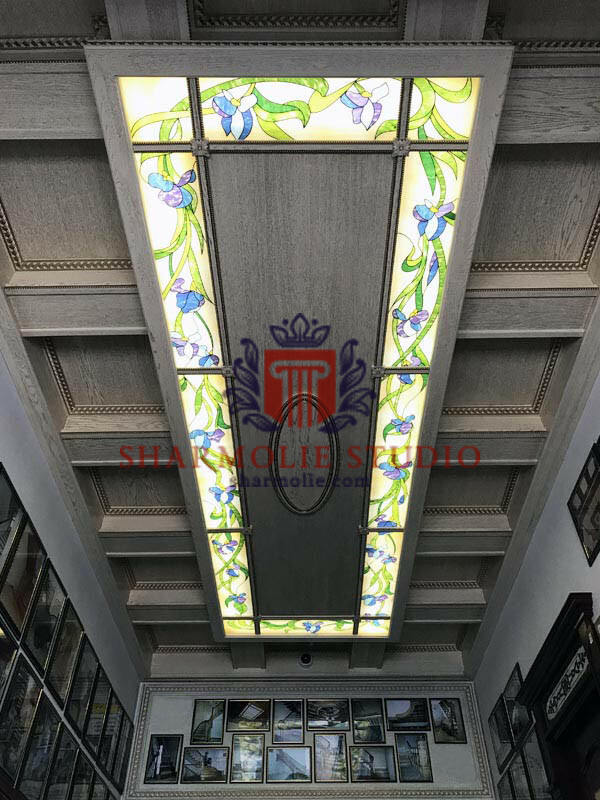 When it was decided to open our company, we faced with the question of what materials is better to use for manufacturing the products. 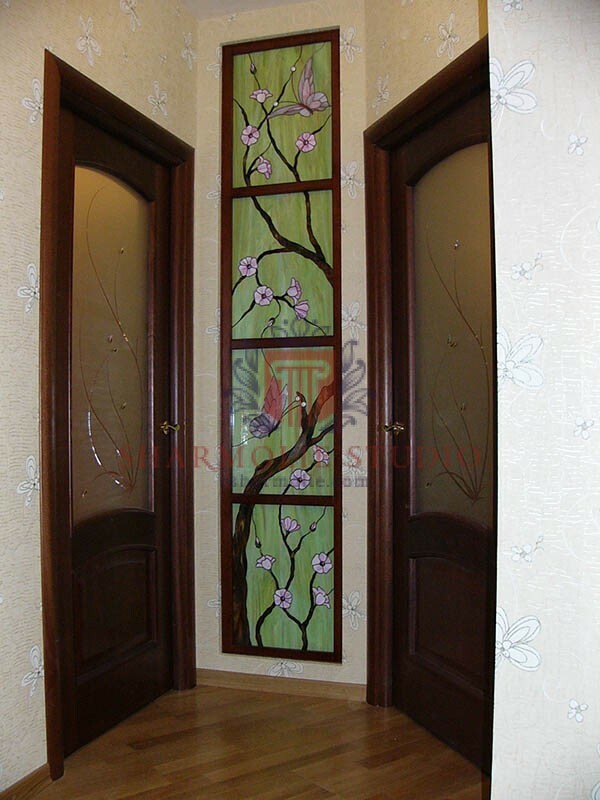 There are a lot of options on the market today , including plastic and wood-containing materials. 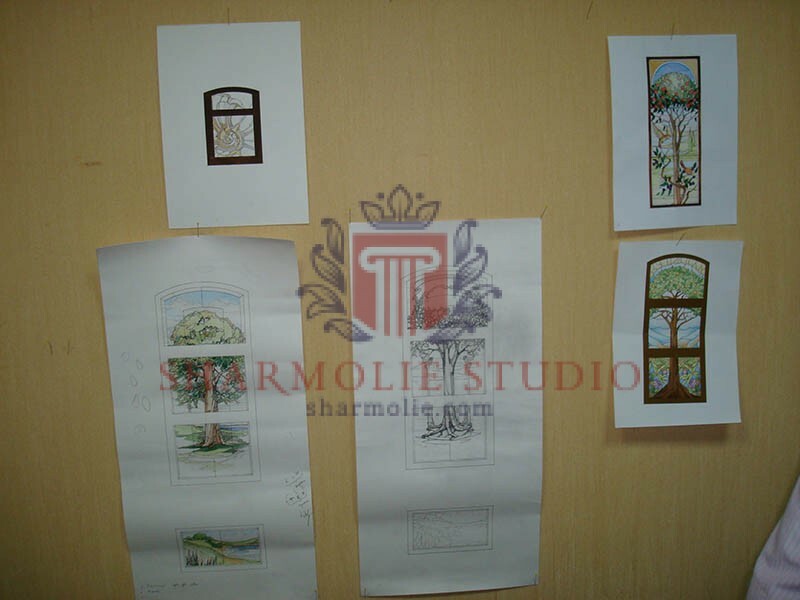 Of course, the company were tempted to use cheap options to reach as many potential customers as possible. 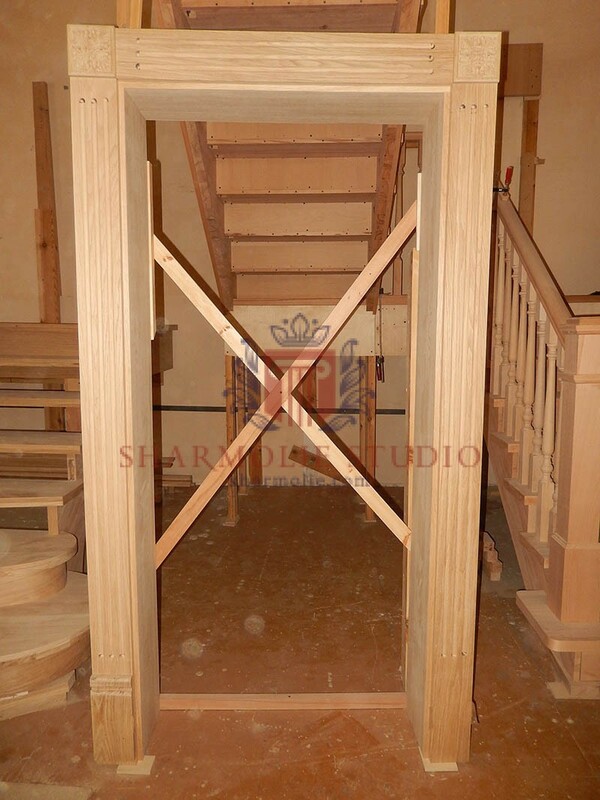 However, the decision was made in favor of solid wood. 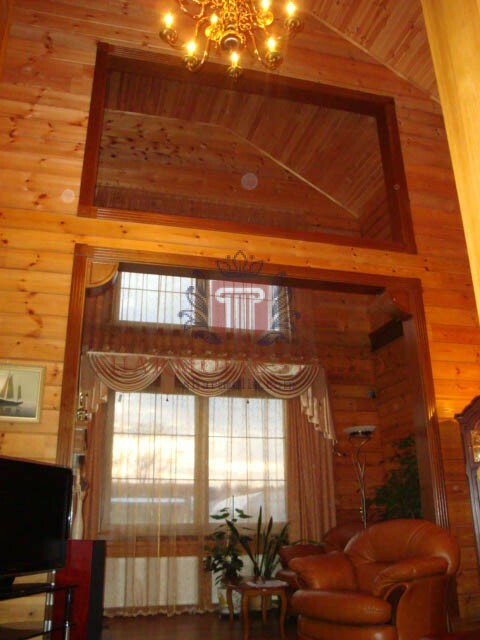 And time showed that we made the right choice. 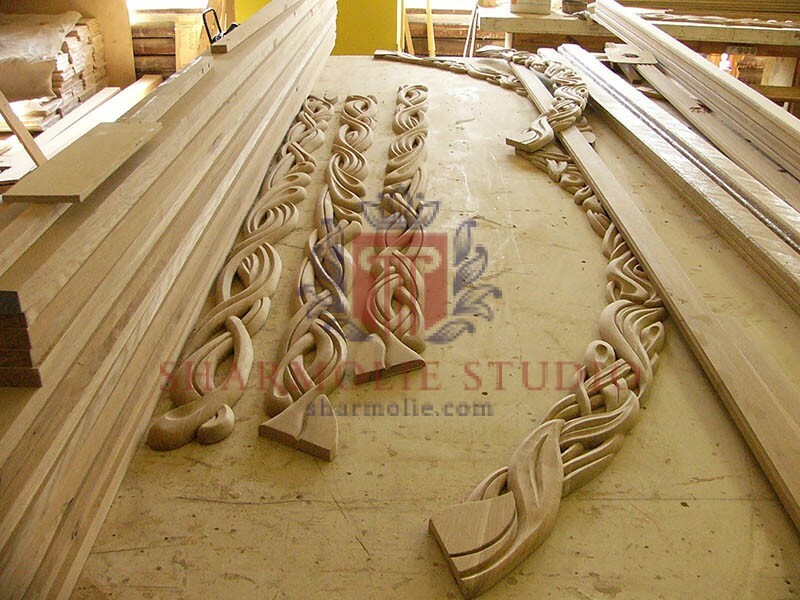 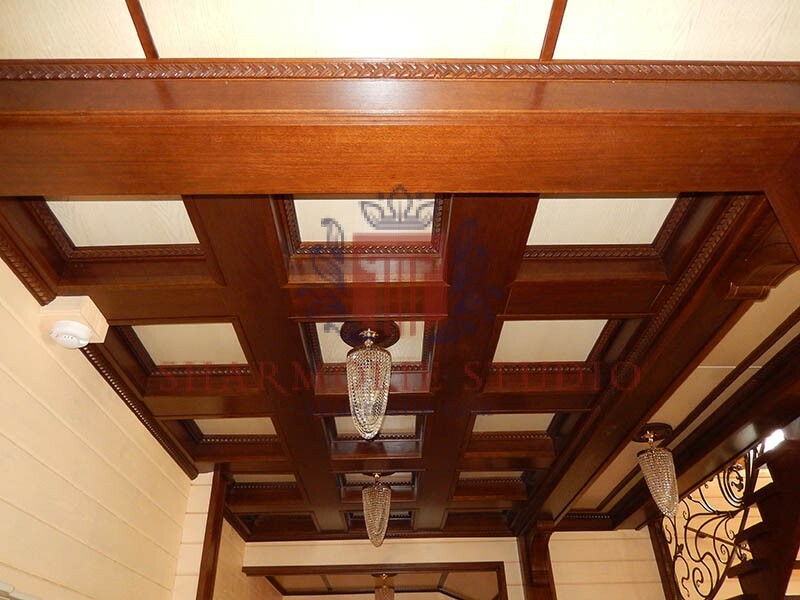 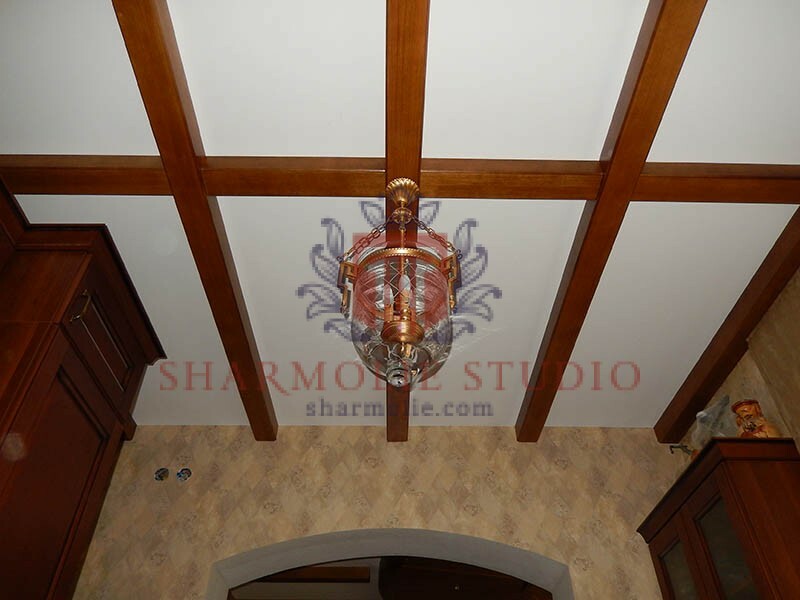 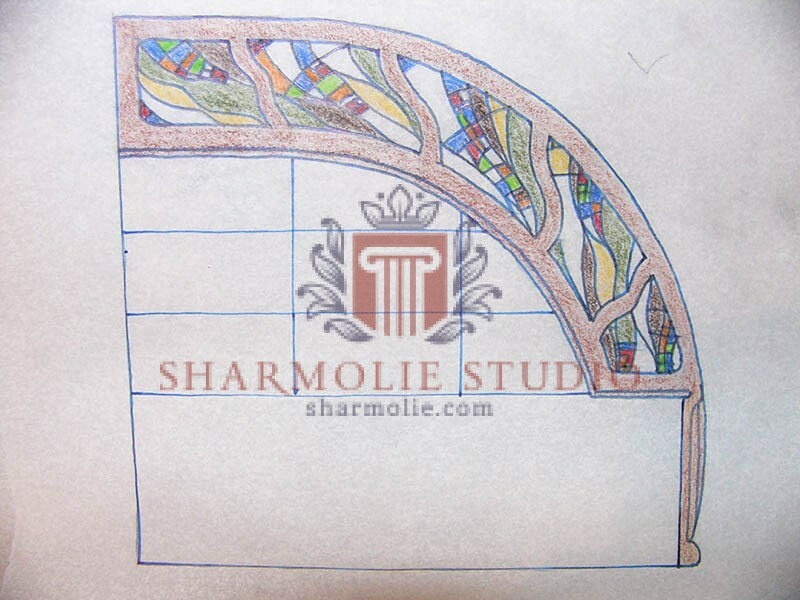 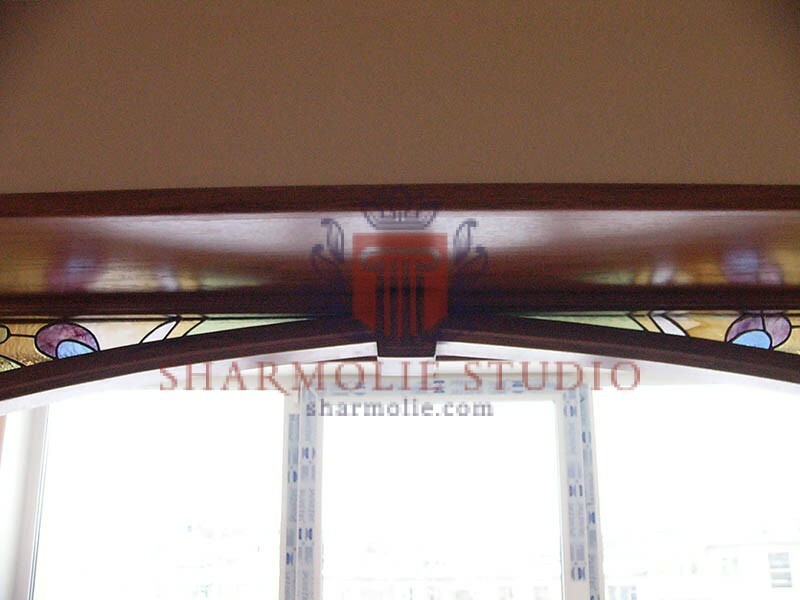 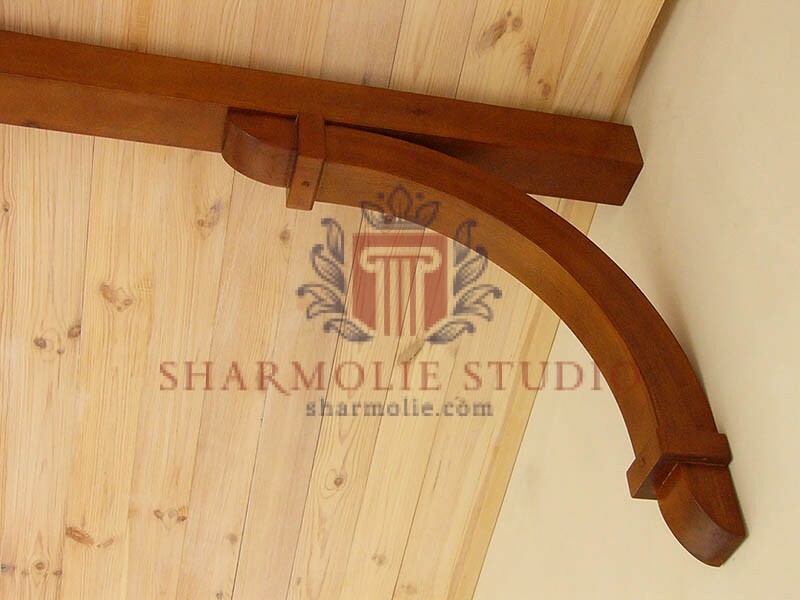 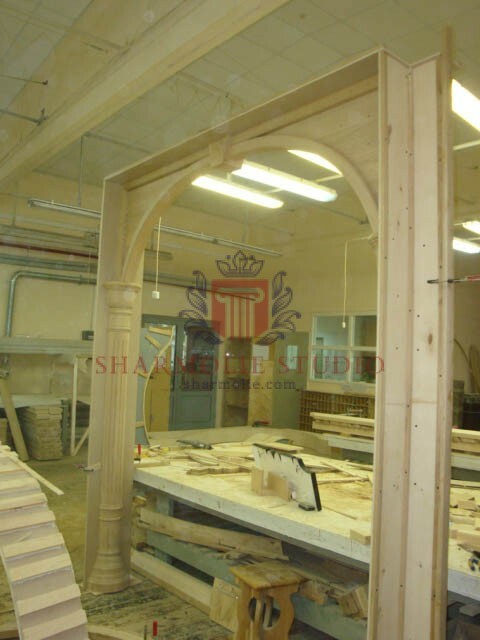 Today we create a large number of decor elements - these are decorative and ceiling beams, interior elements, interior arches and portals. 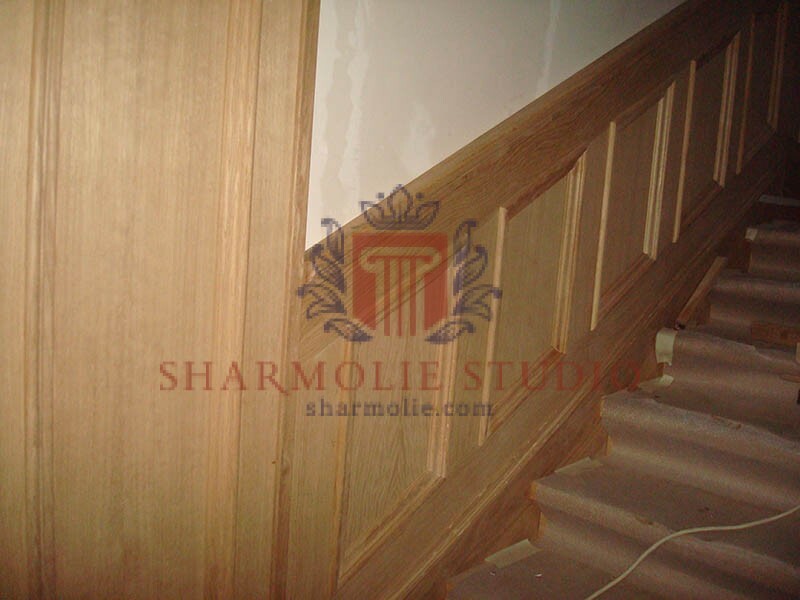 Durability is one of the strengths of solid wood. 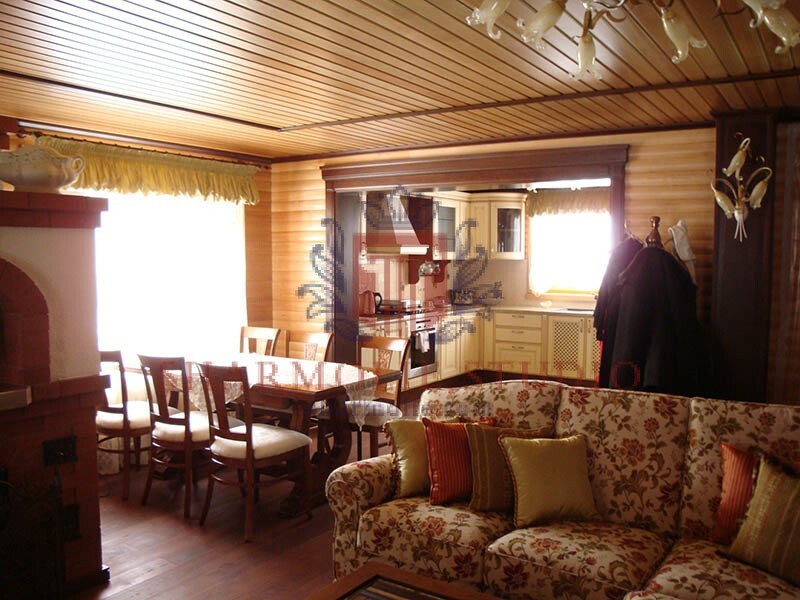 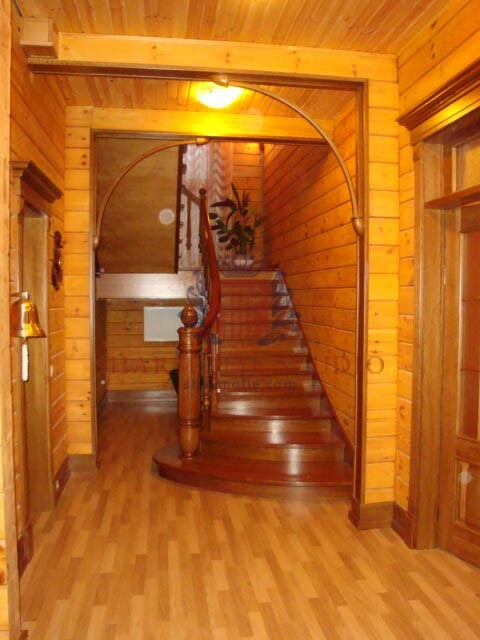 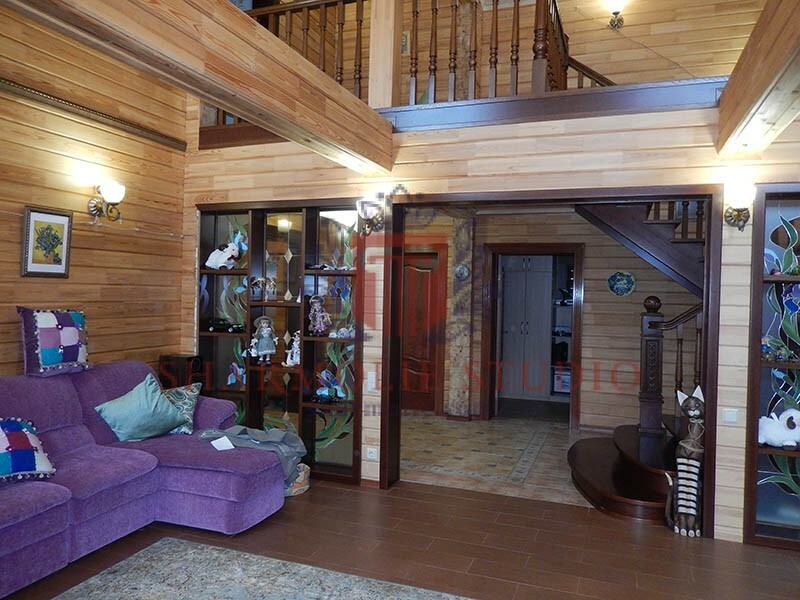 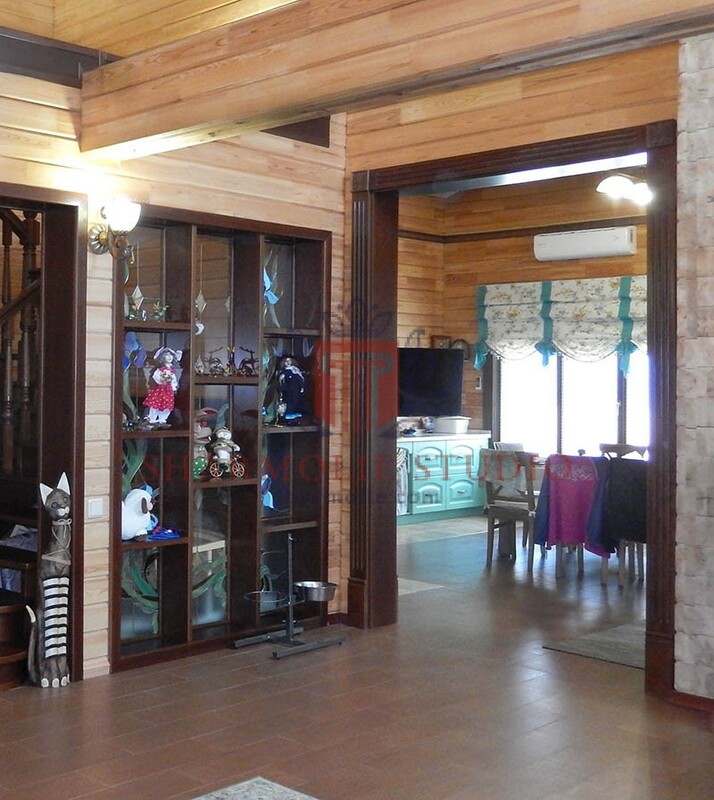 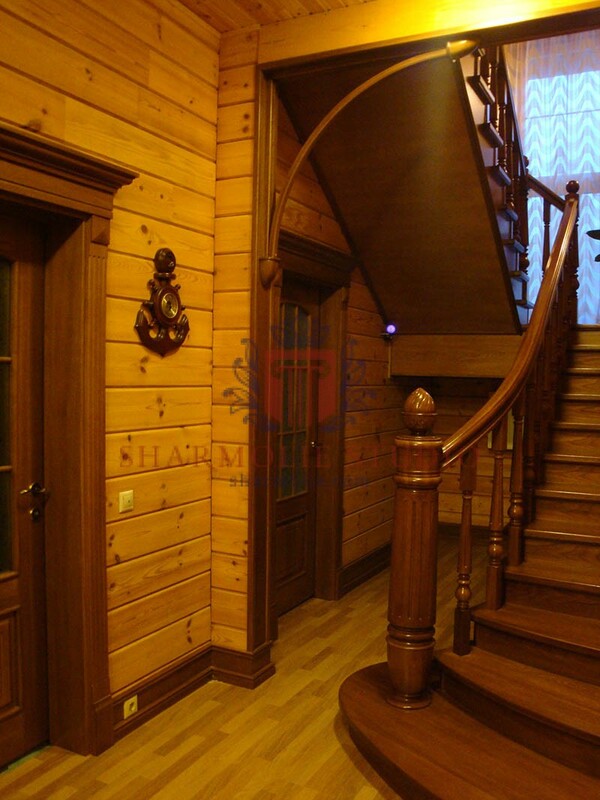 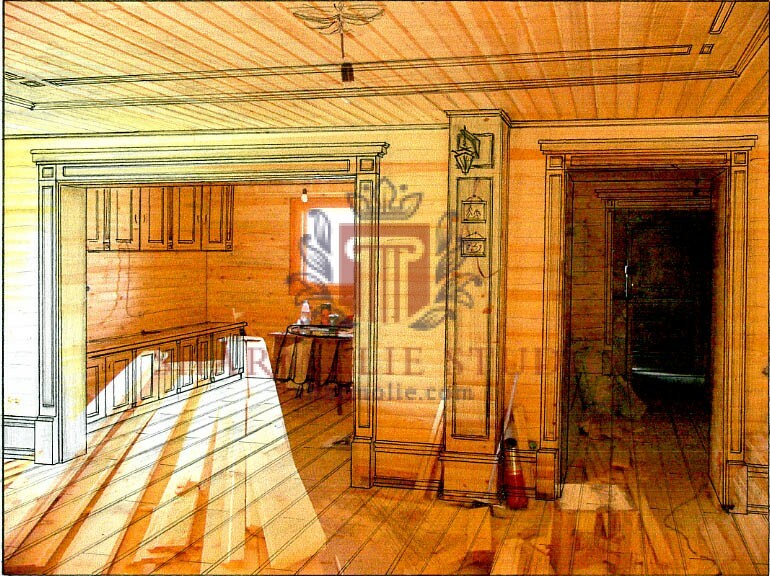 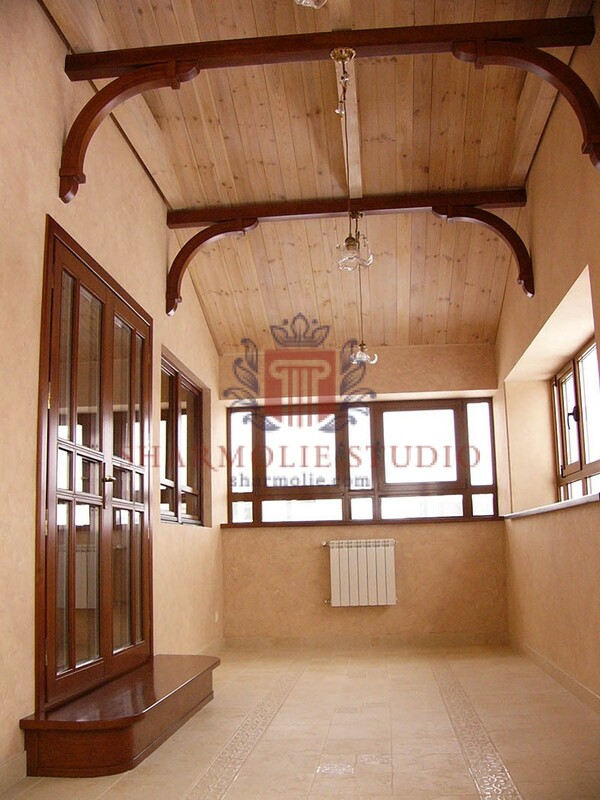 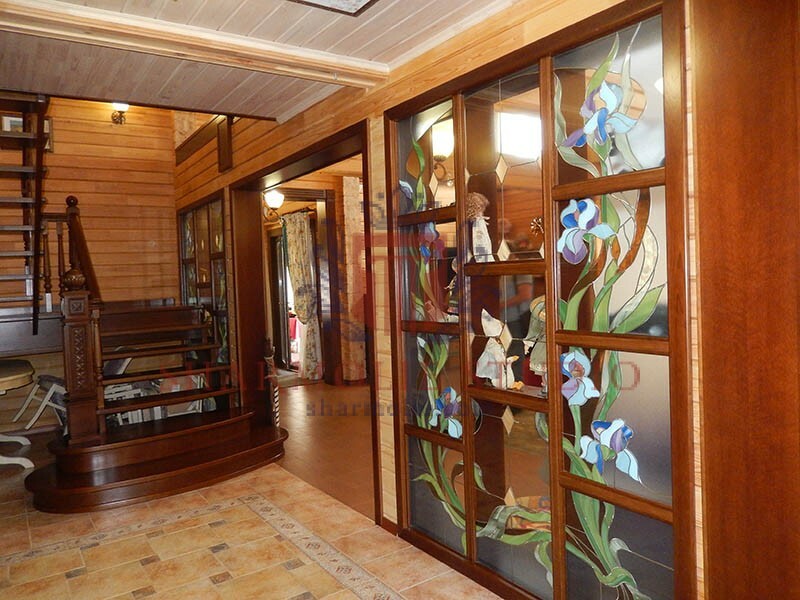 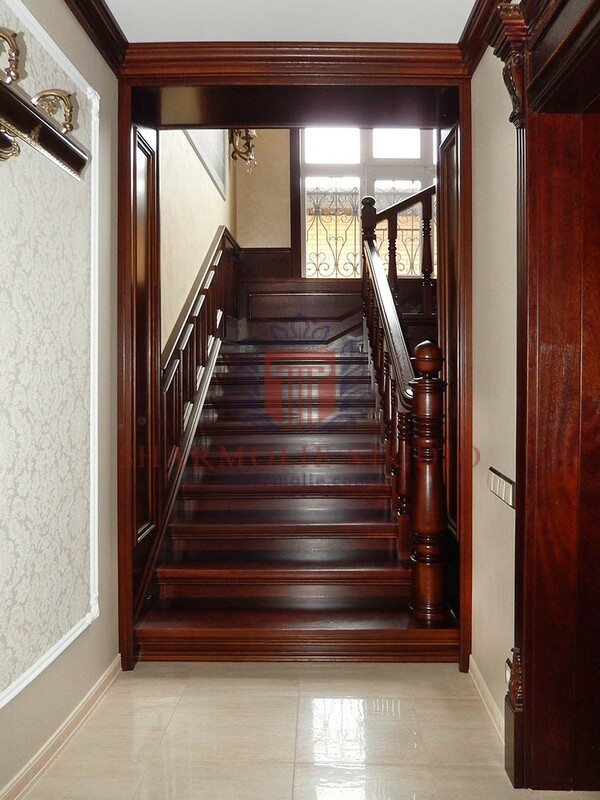 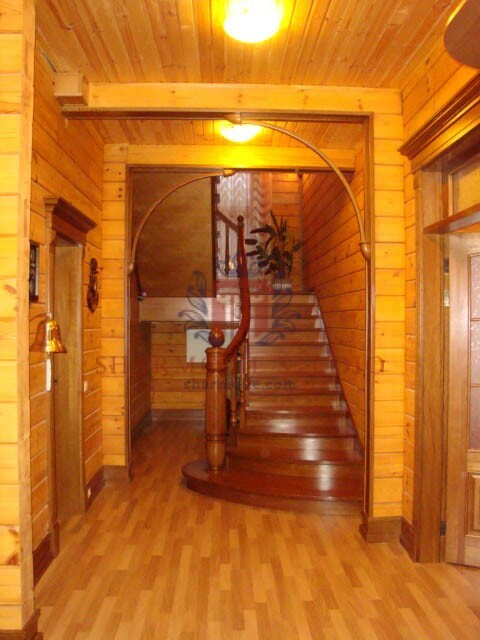 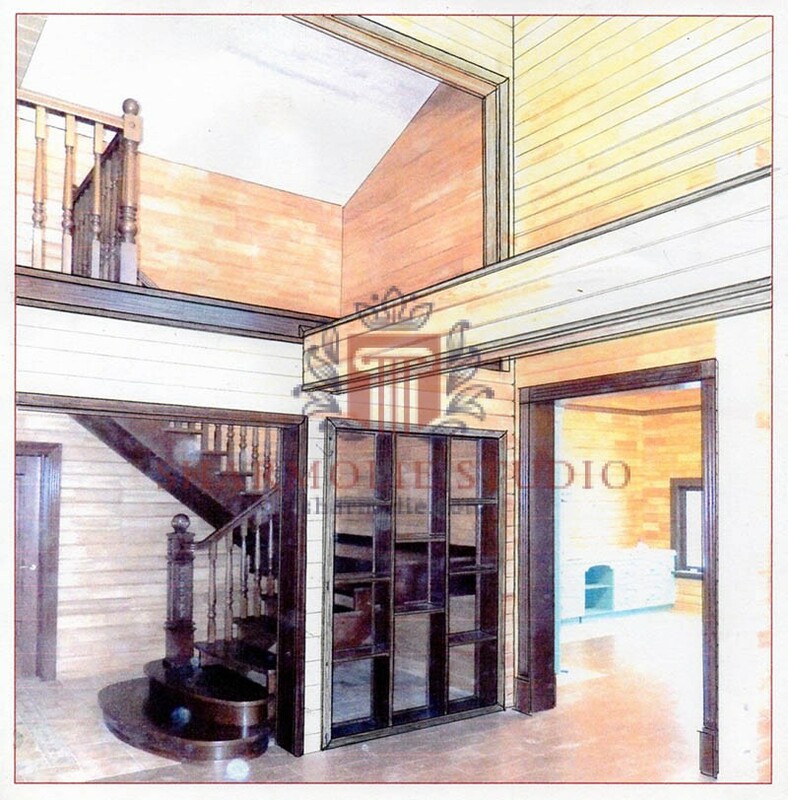 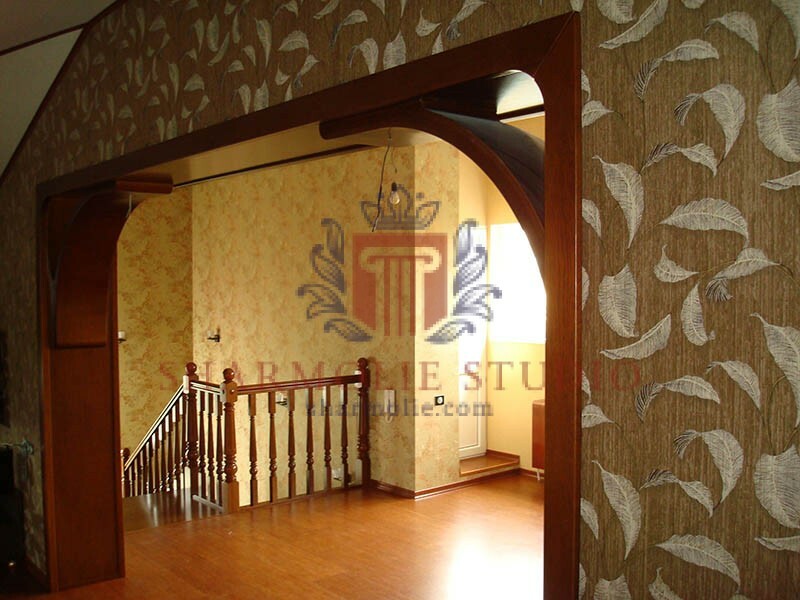 You can see wooden interiors in old buildings or antiquarian shop and realize that nothing have happened to them, they are still elegant and indestructible. 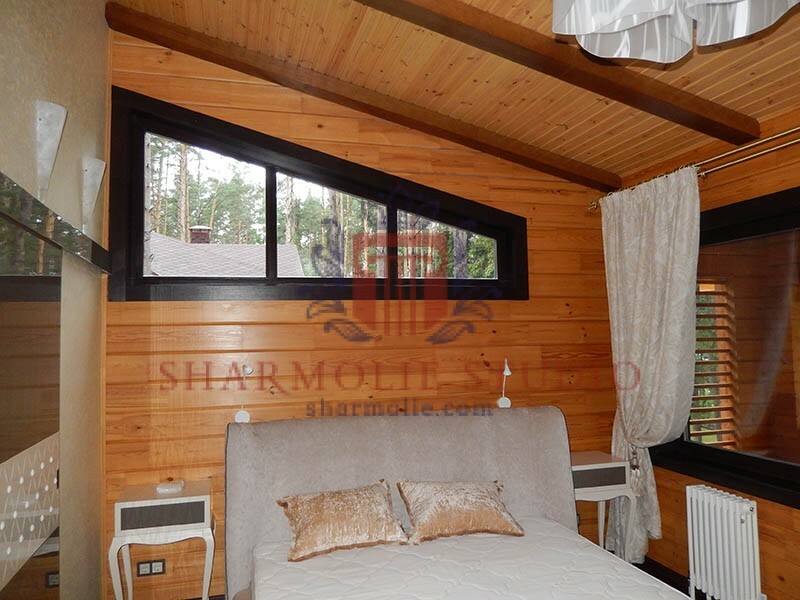 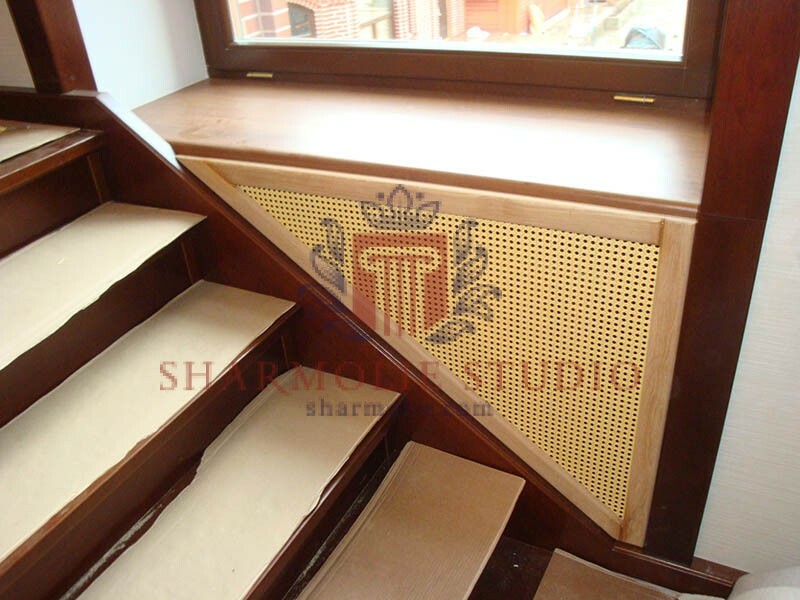 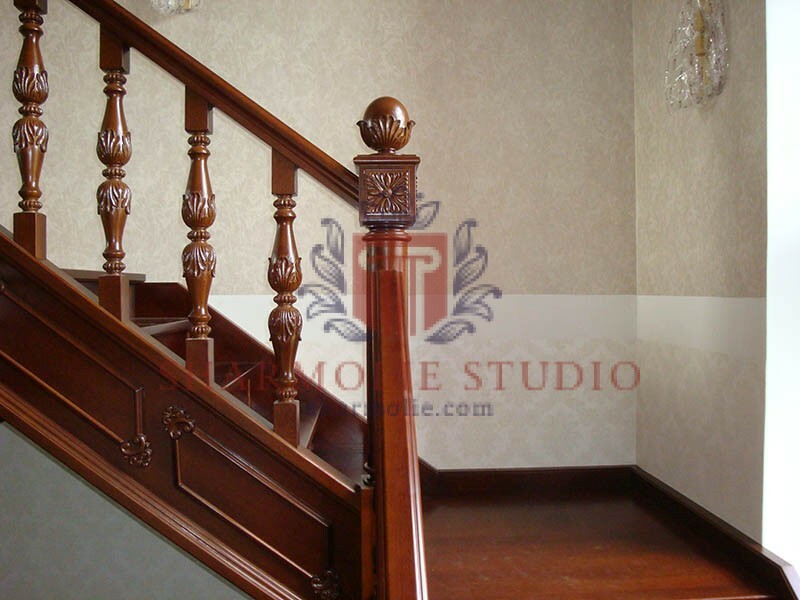 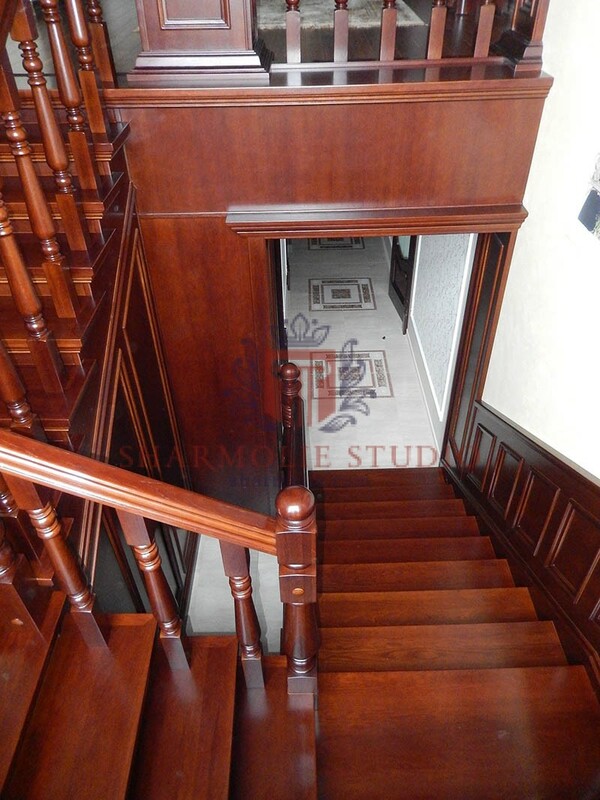 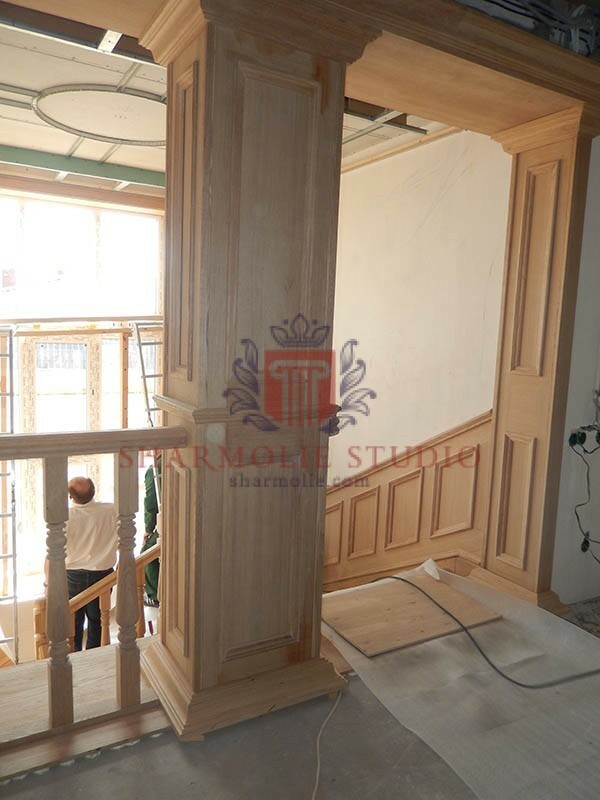 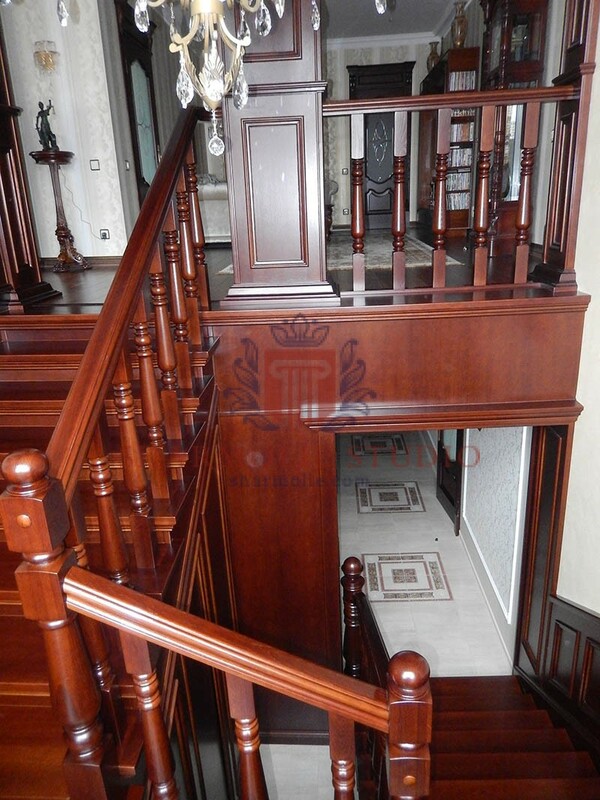 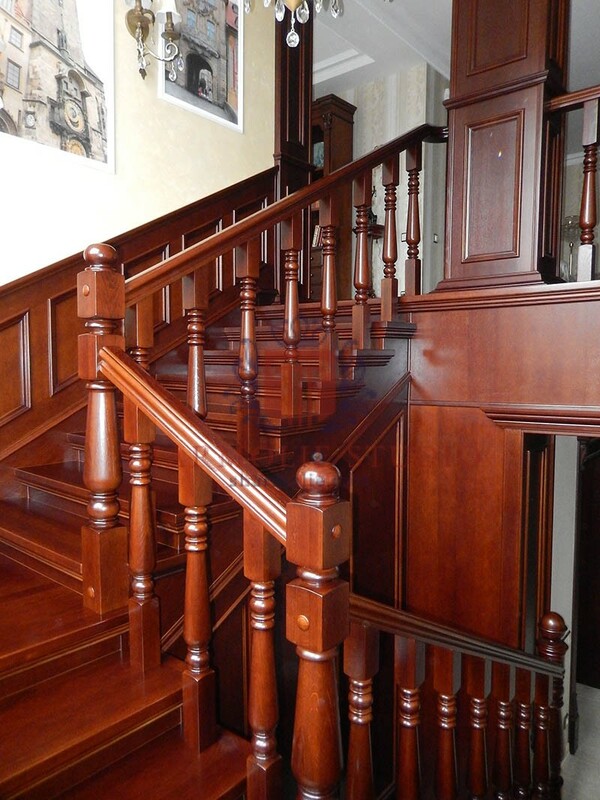 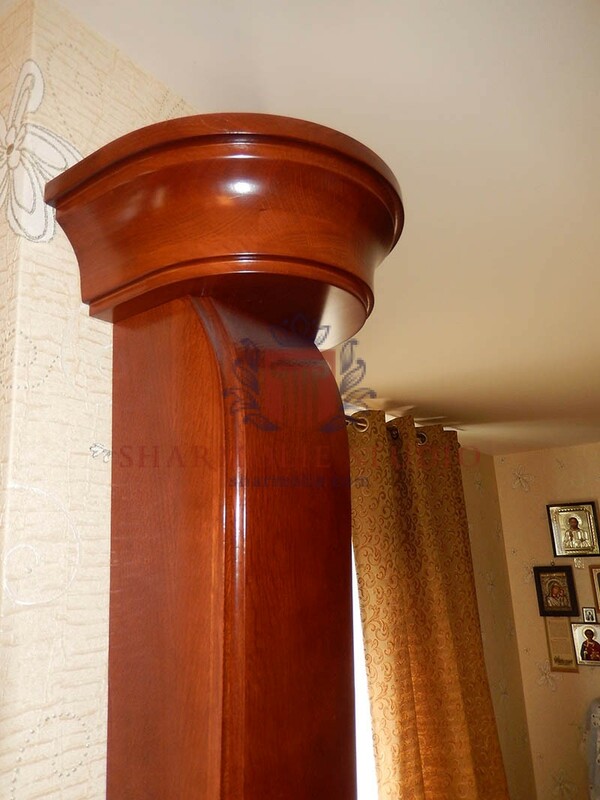 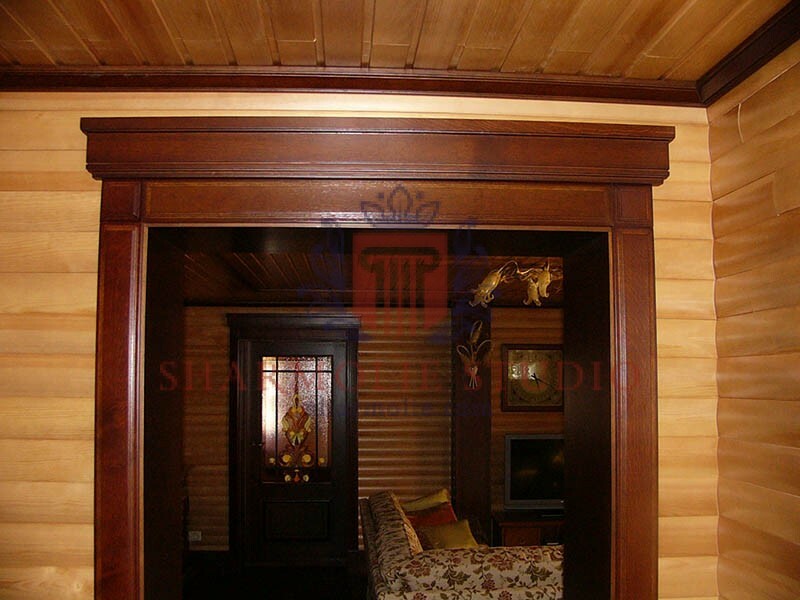 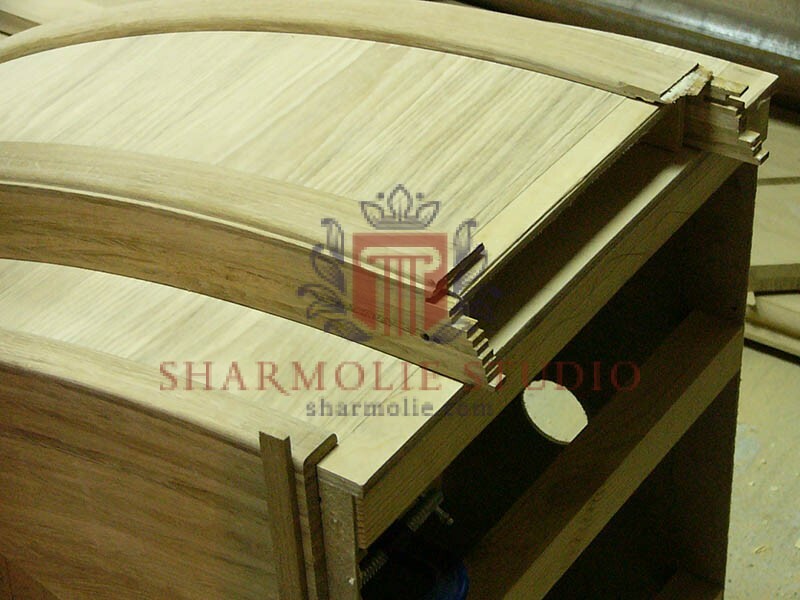 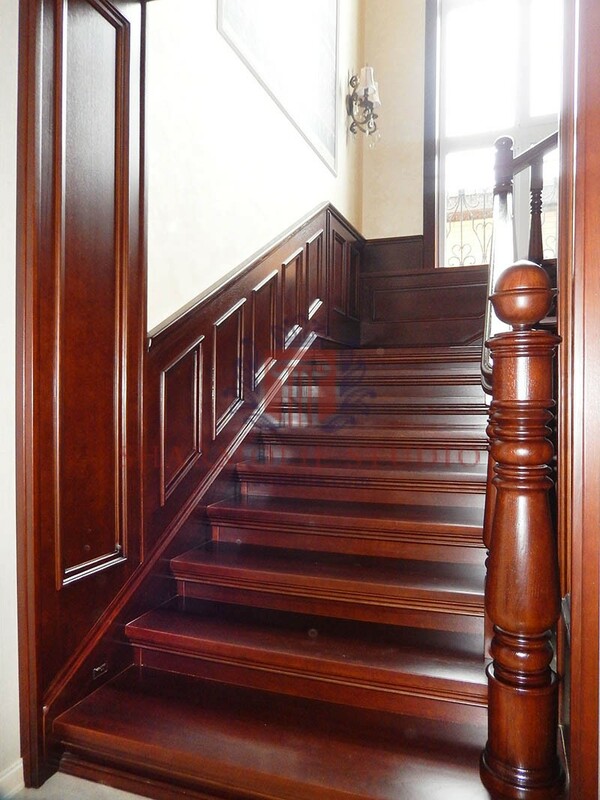 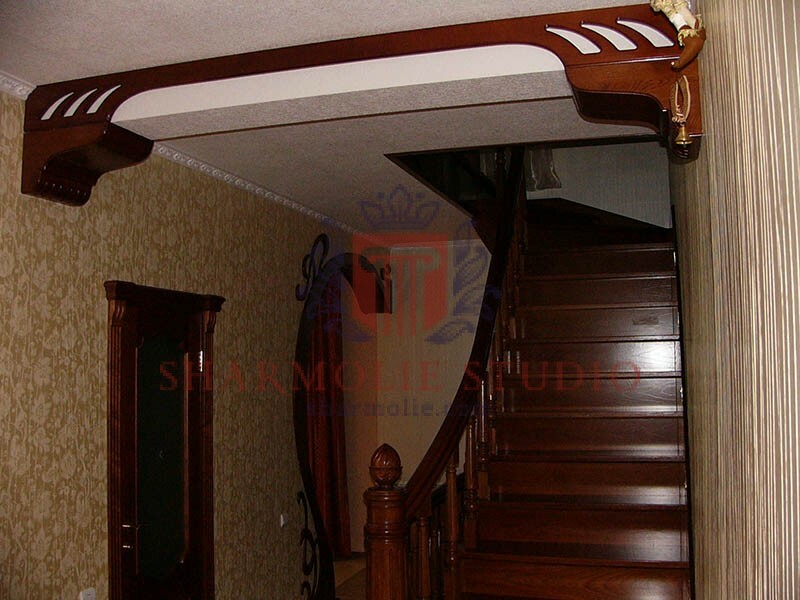 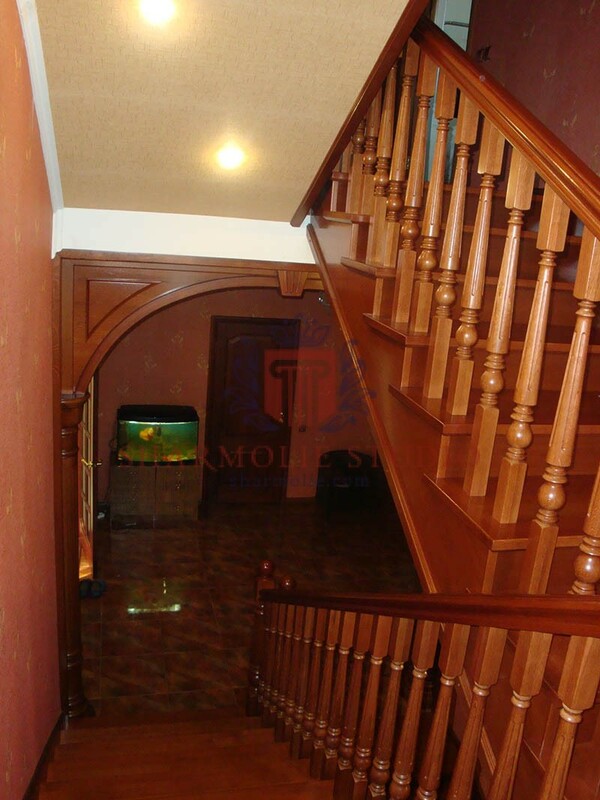 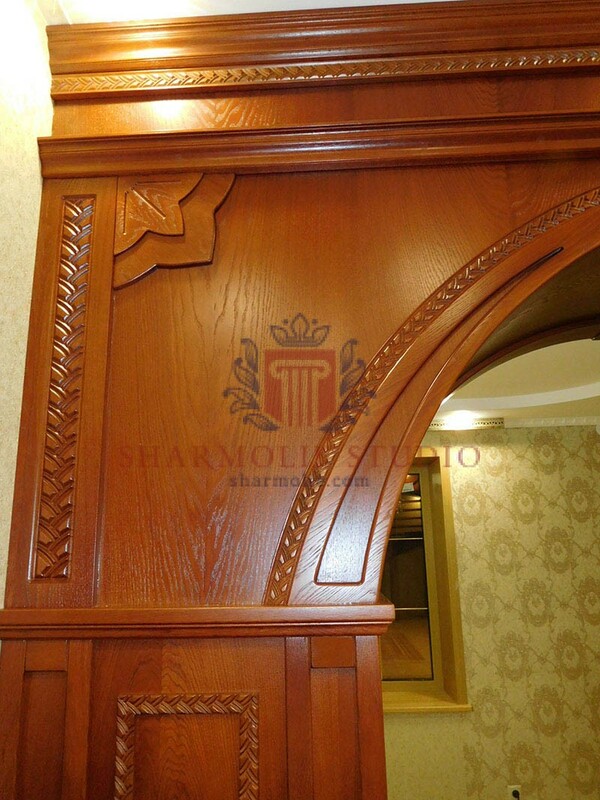 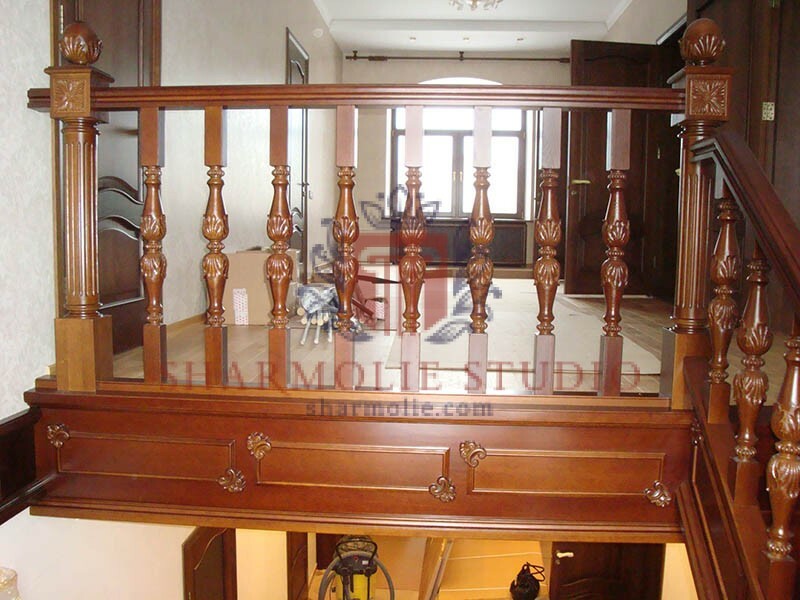 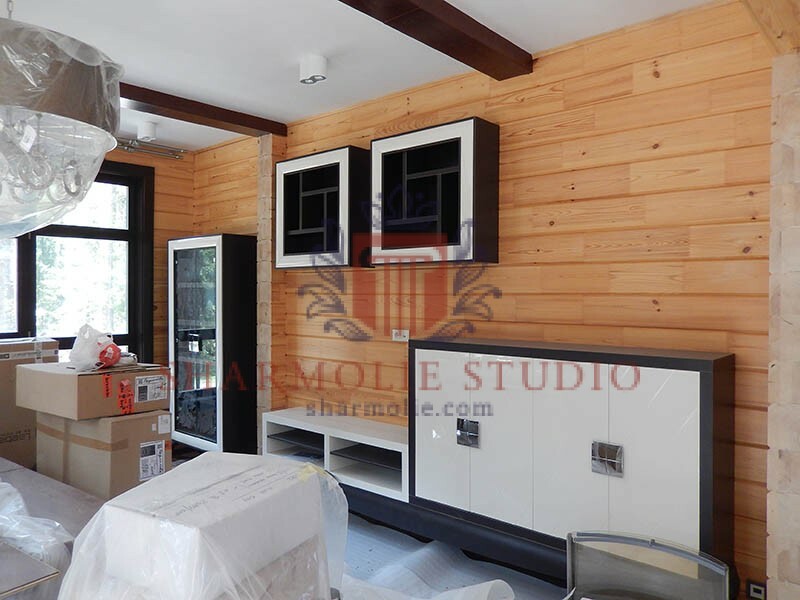 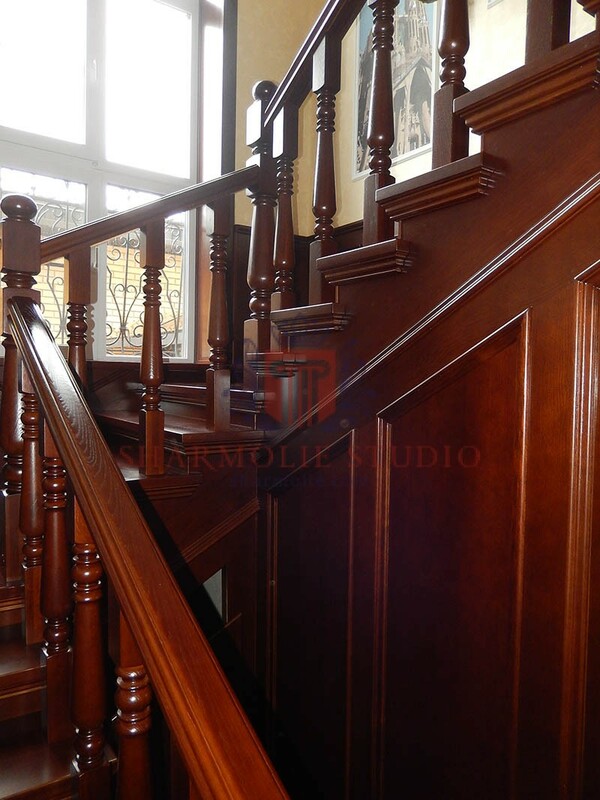 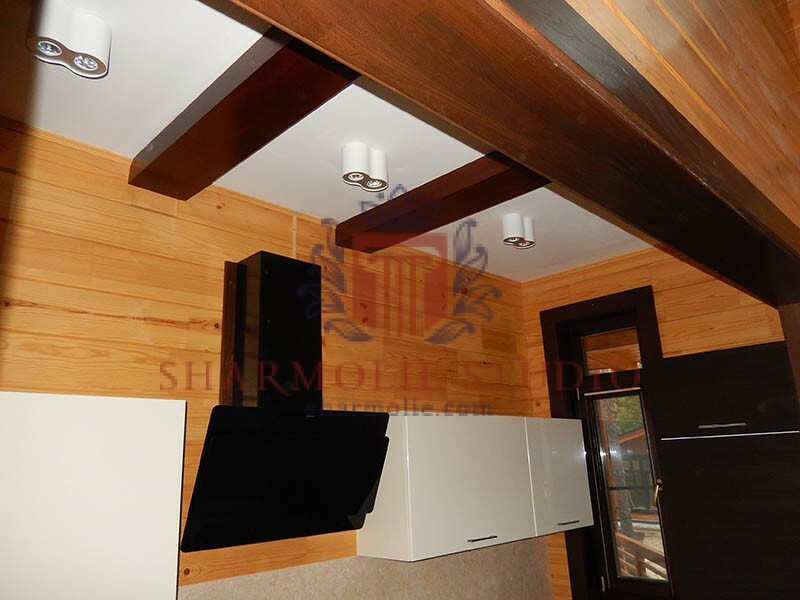 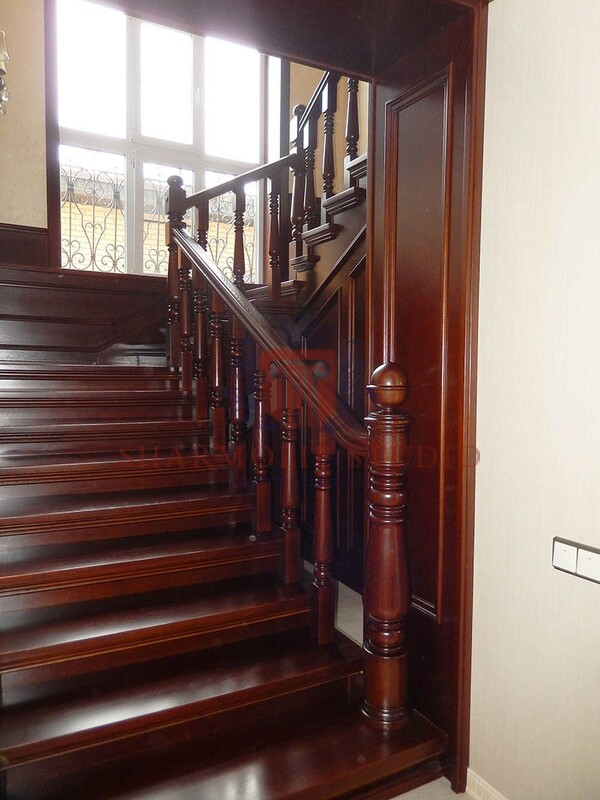 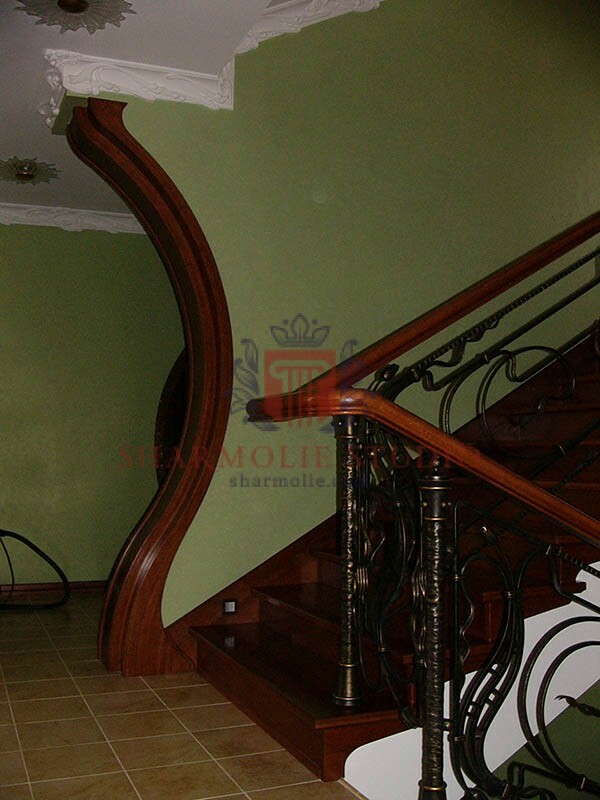 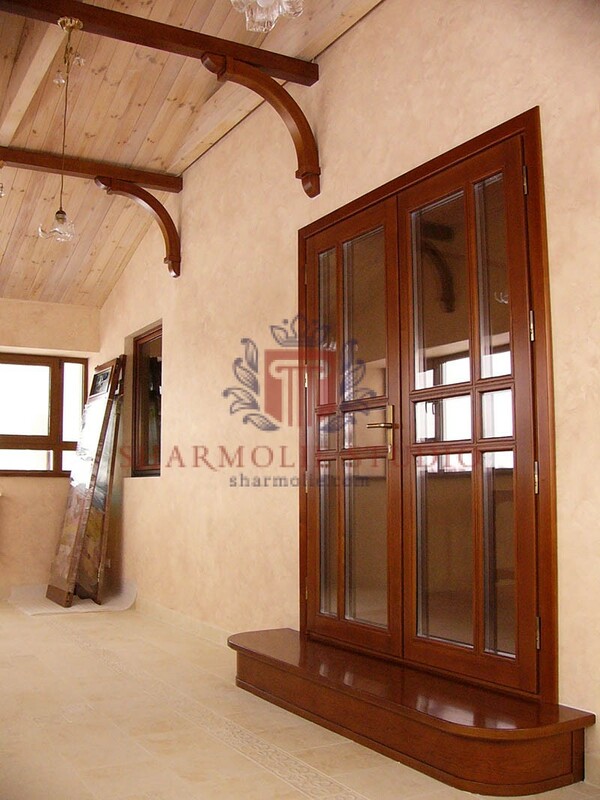 Moreover, solid wood is eco-friendly material and we are always sure that it is not dangerous for people’s health. 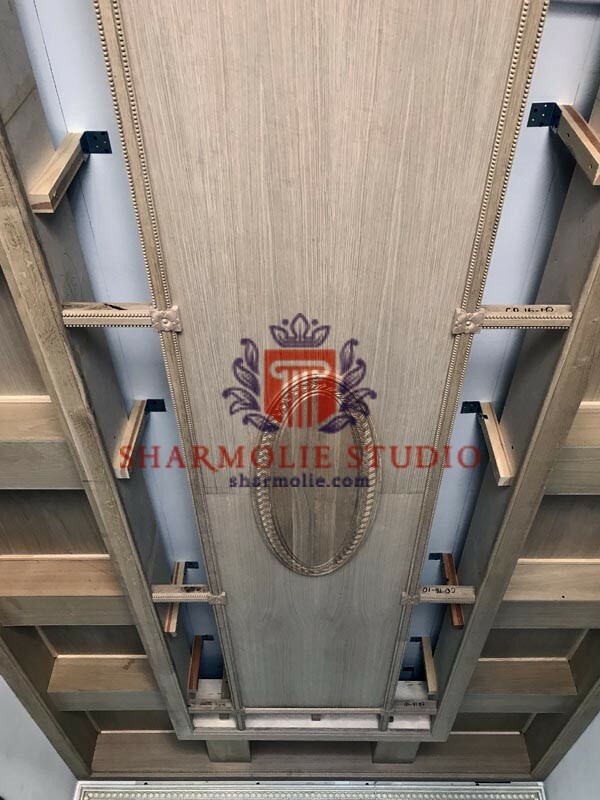 The natural texture of the solid wood helps us create truly beautiful decor elements , and the buyers themselves note the special energy of wooden things. 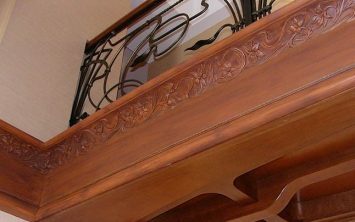 They bring peace and comfort to the house – make sure of this. 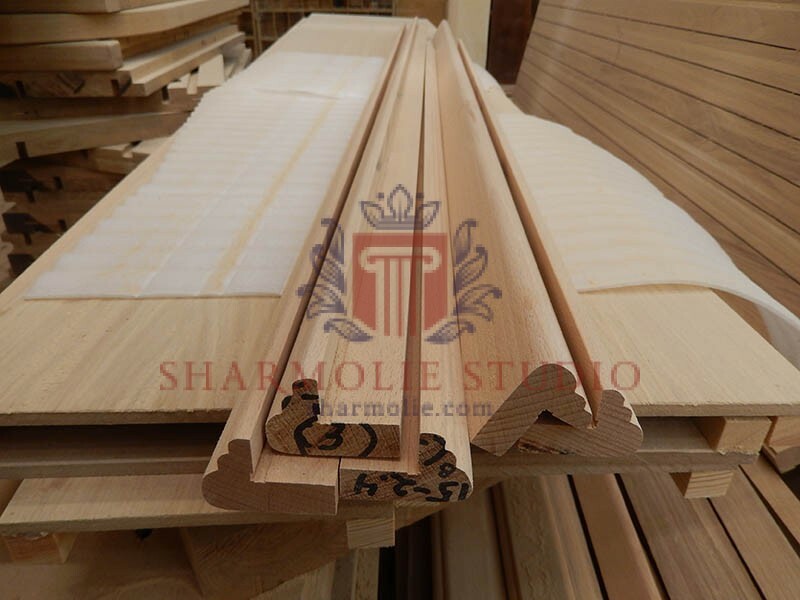 People always talk about wood containing materials for the production of various items. 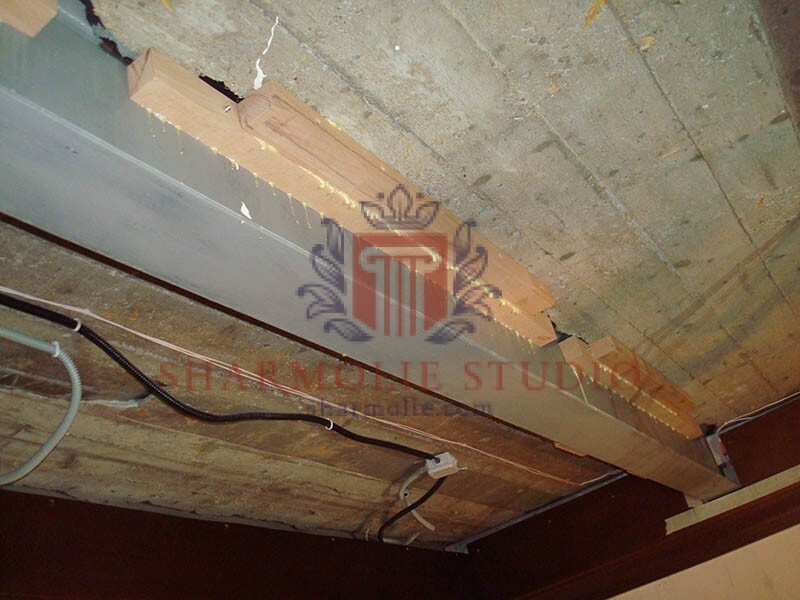 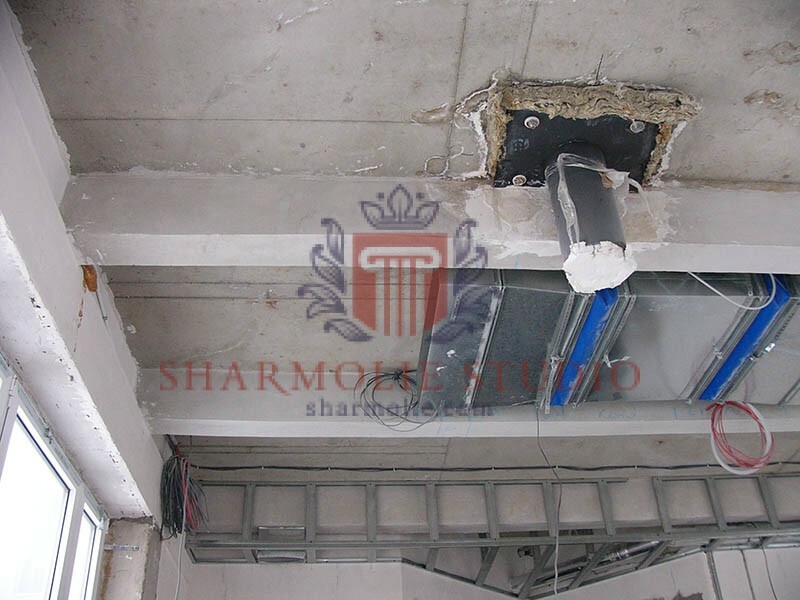 Someone says that they are not durable, while others claim that the level of environmental safety is not high enough. 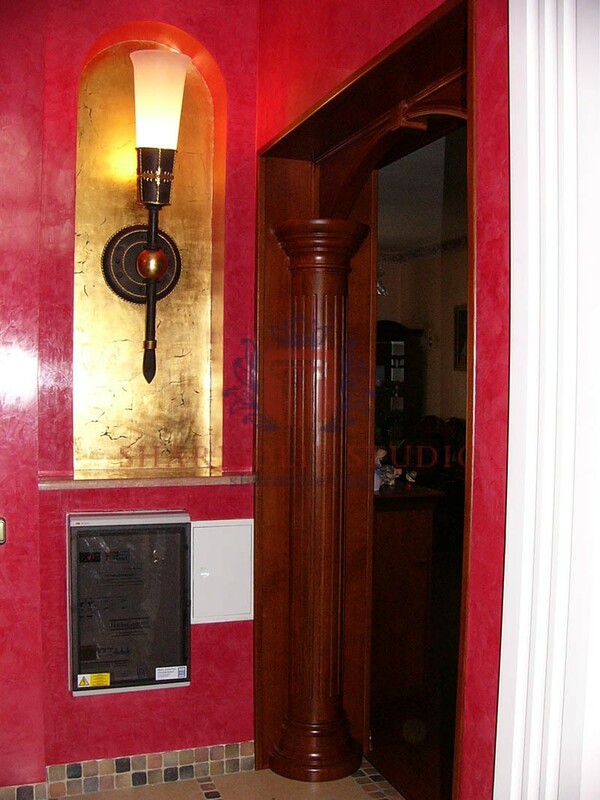 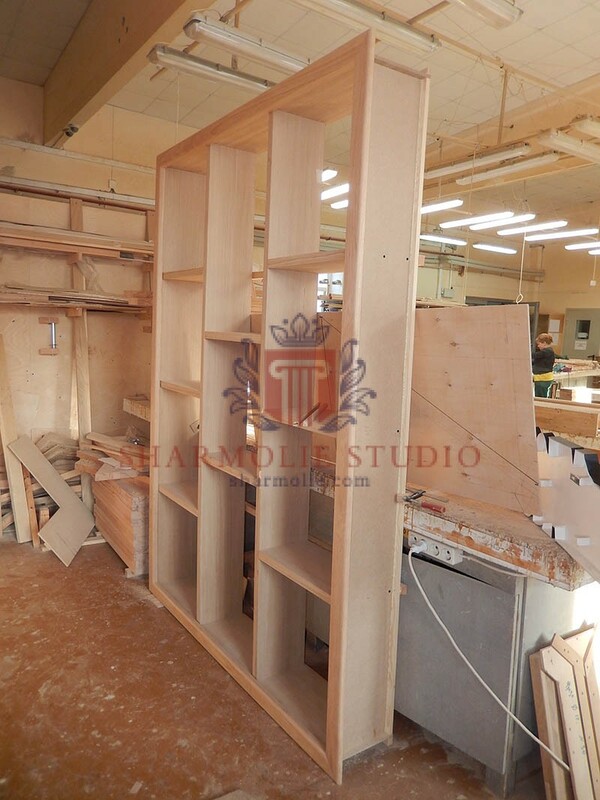 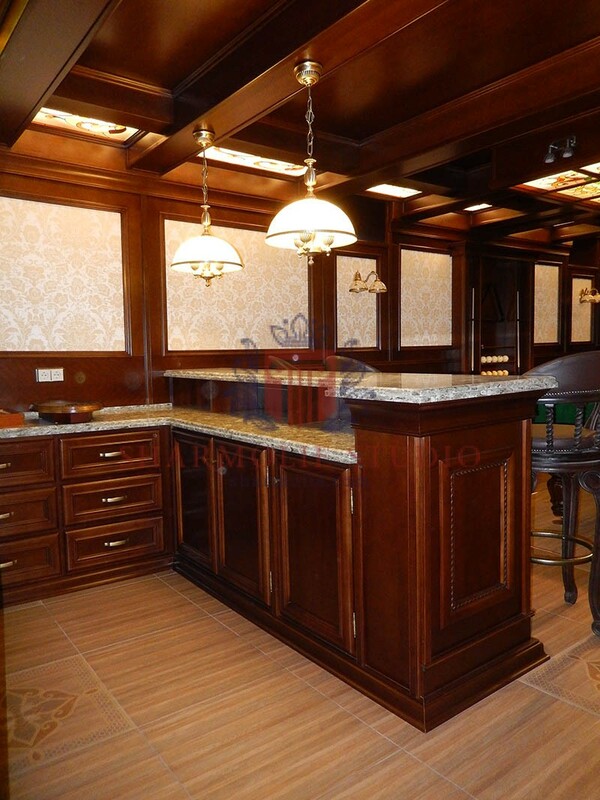 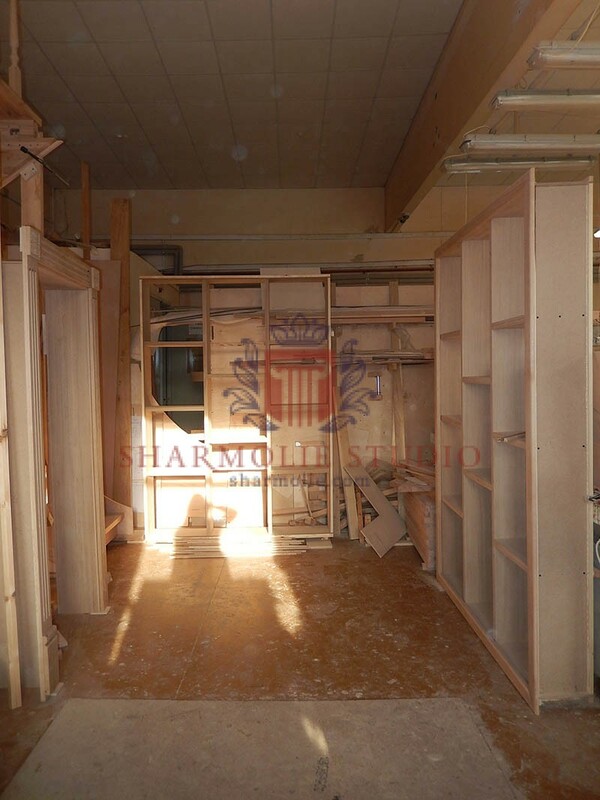 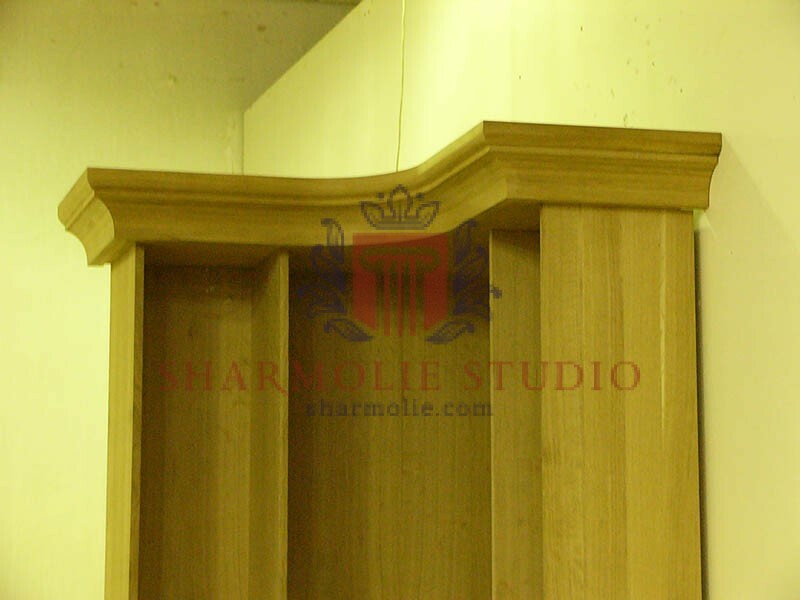 In our company, we actively use MDF veneered natural oak or beech. 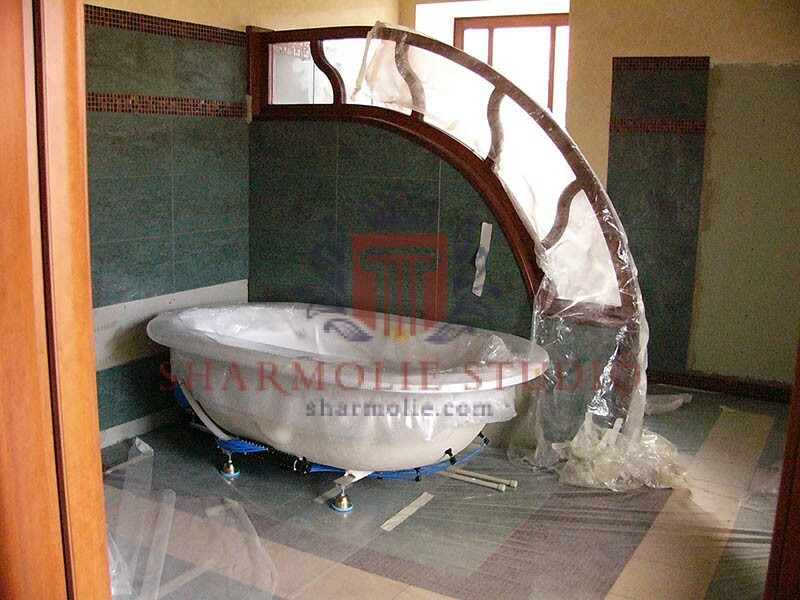 First of all, it should be noted, that there are a lot of different materials . 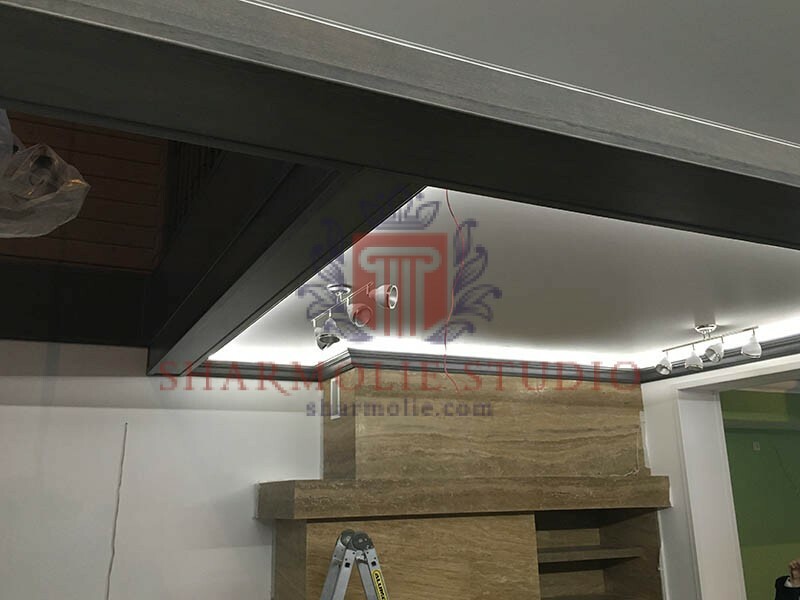 If you work with a trusted supplier and are sure of its honesty, then you do not need to worry about the quality of the materials. 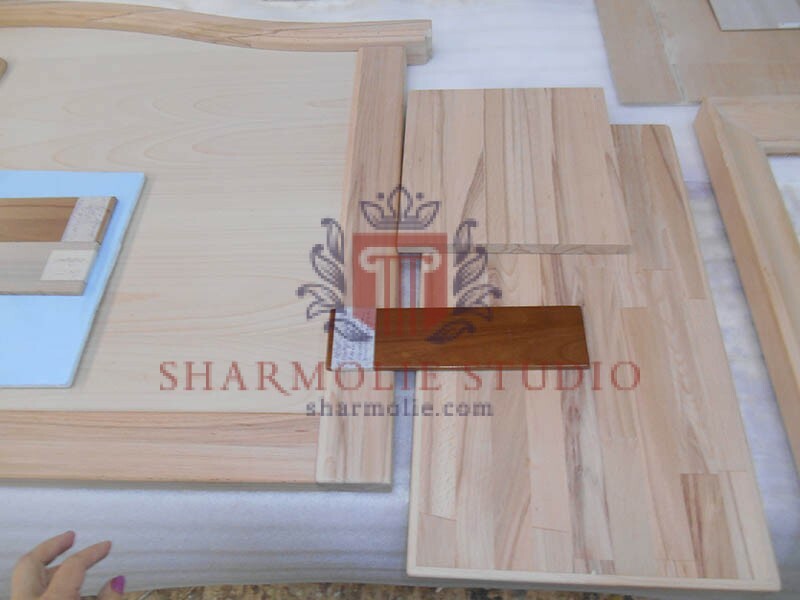 Secondly, the right choice of material can significantly save customer money and preserve the positive qualities created from things. 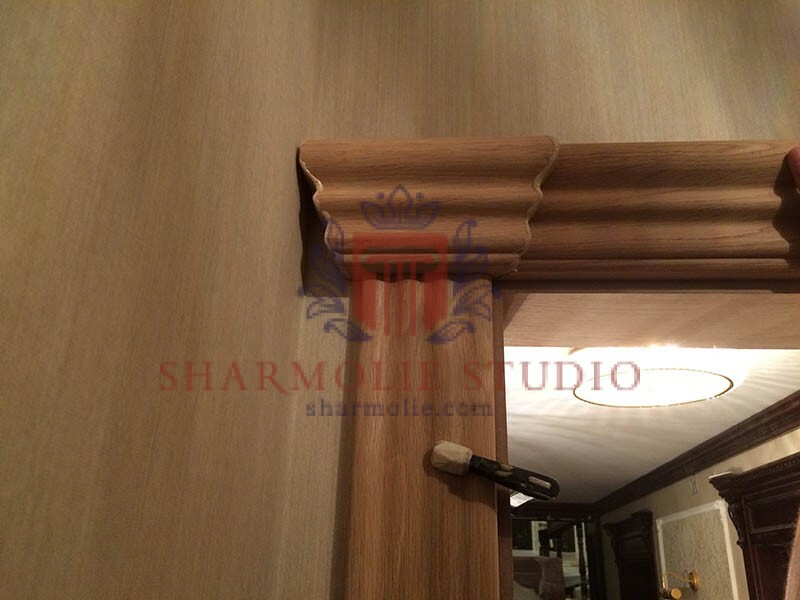 We use MDF veneered natural oak, because such material is well protected and won’t be damaged by external pressure. 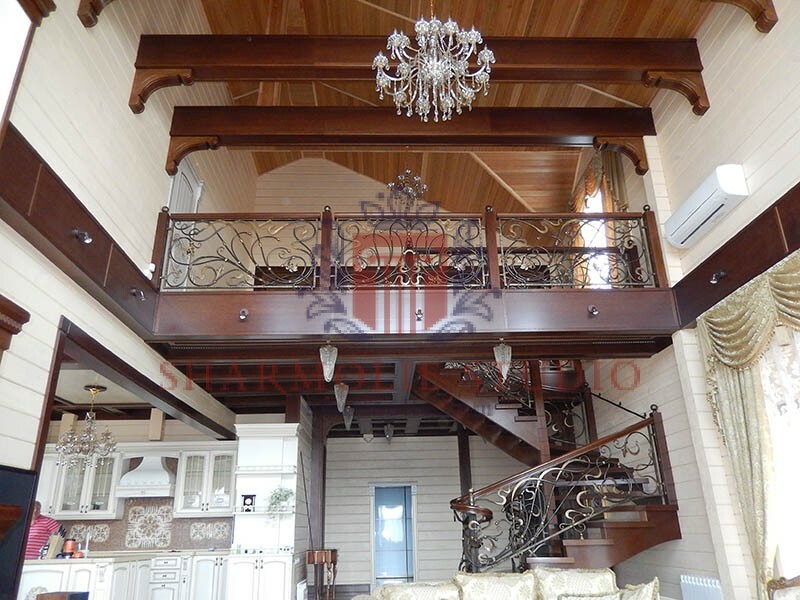 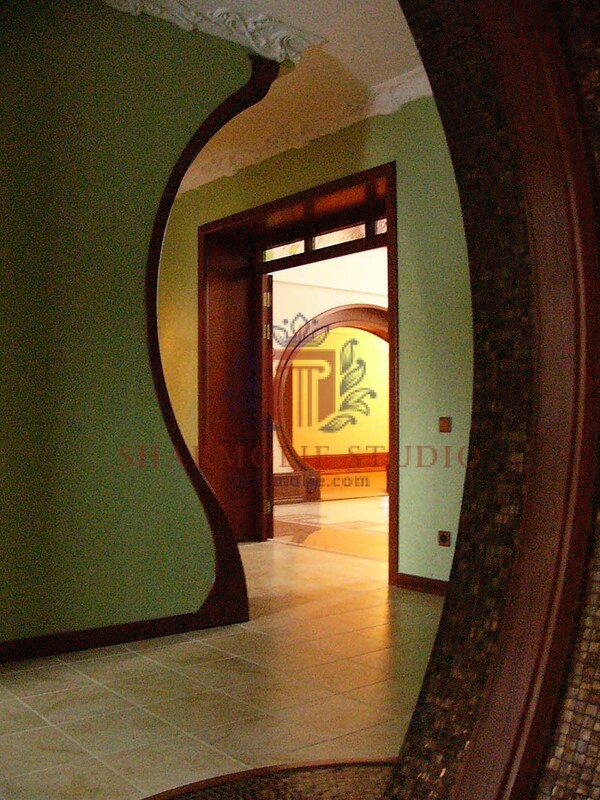 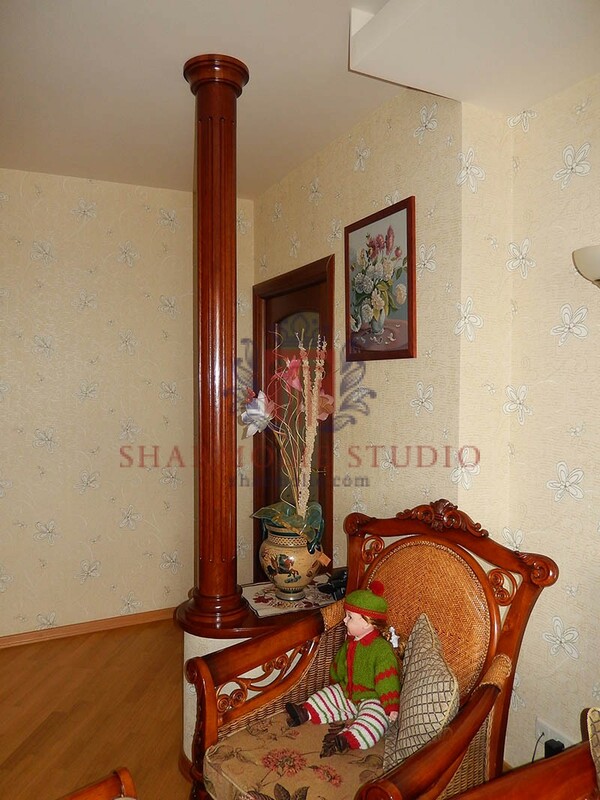 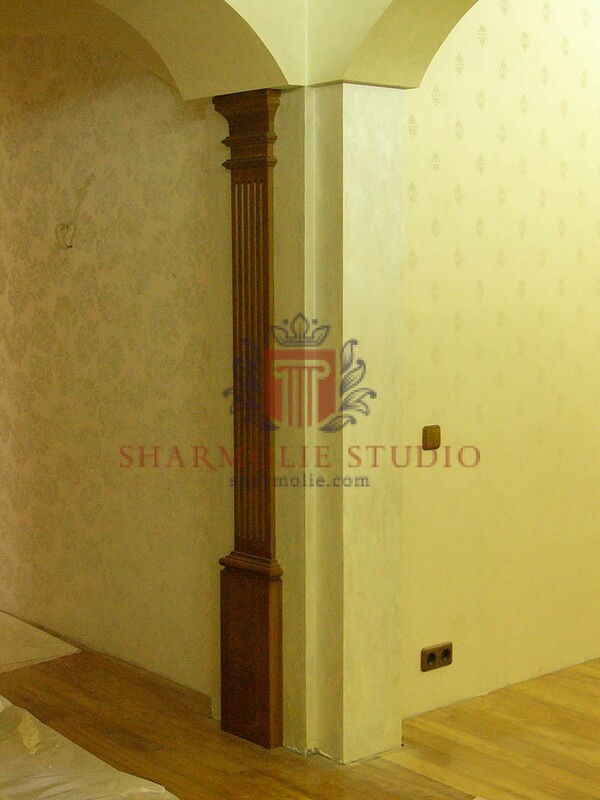 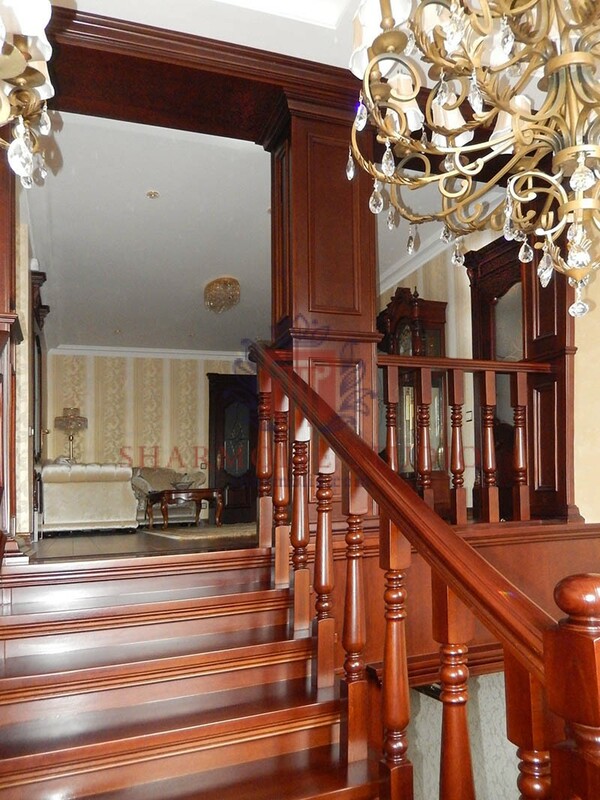 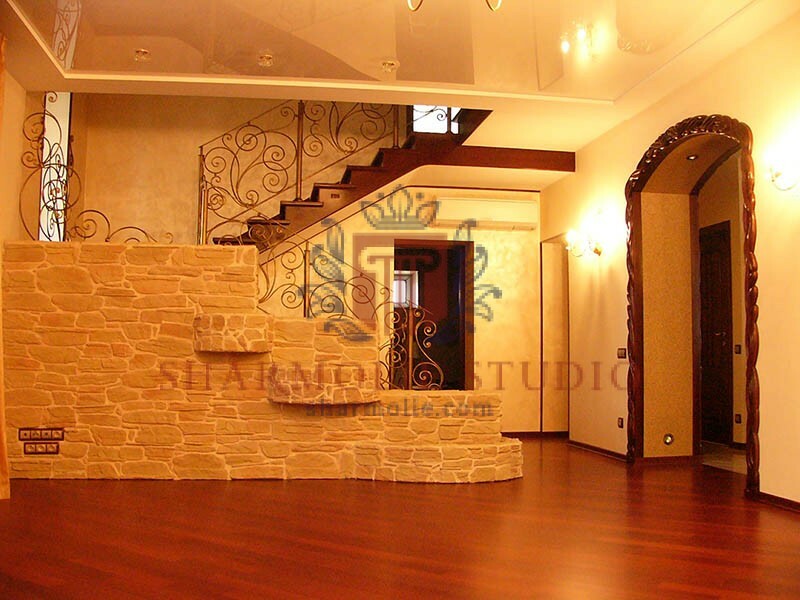 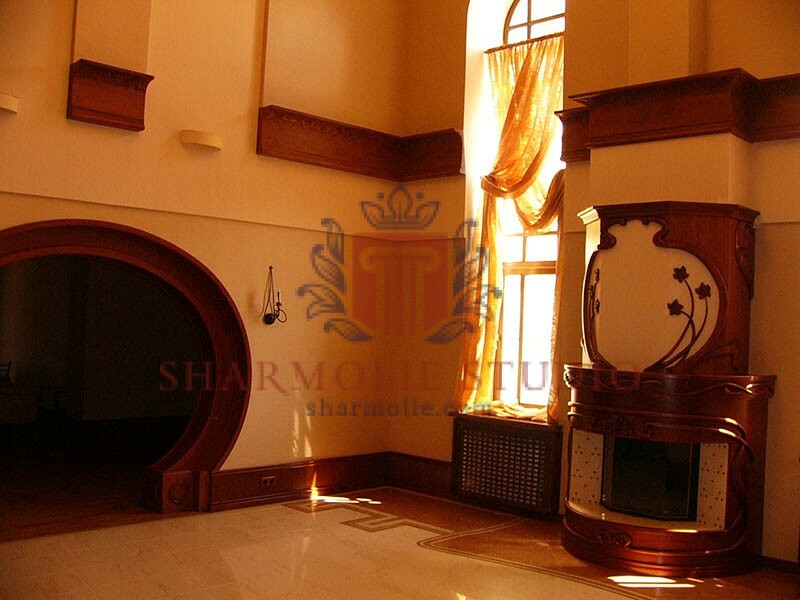 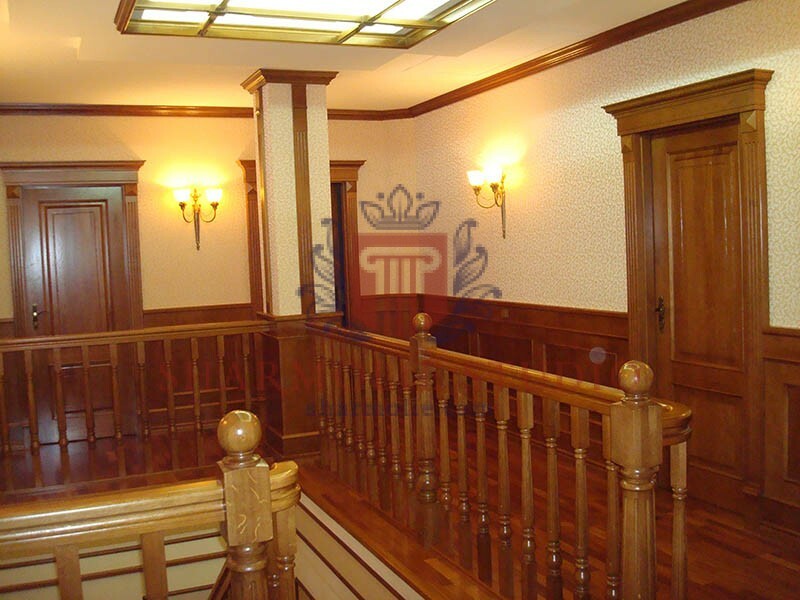 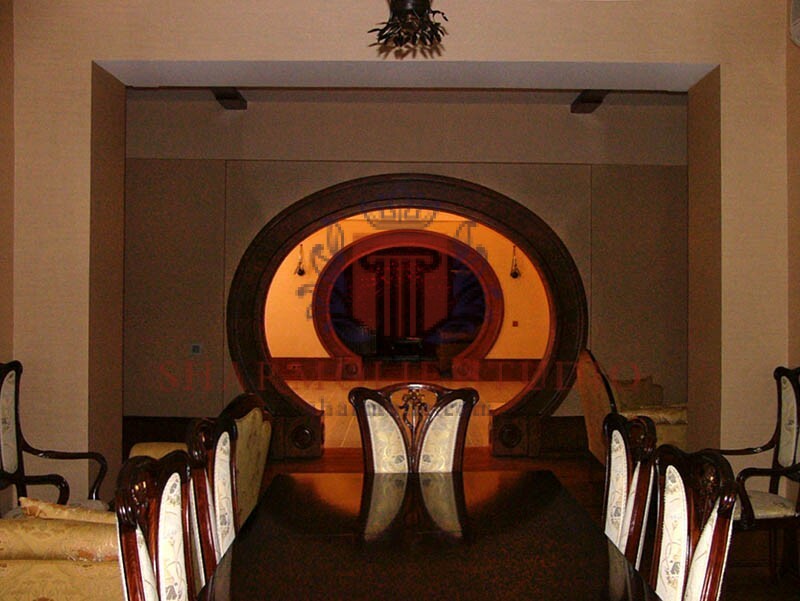 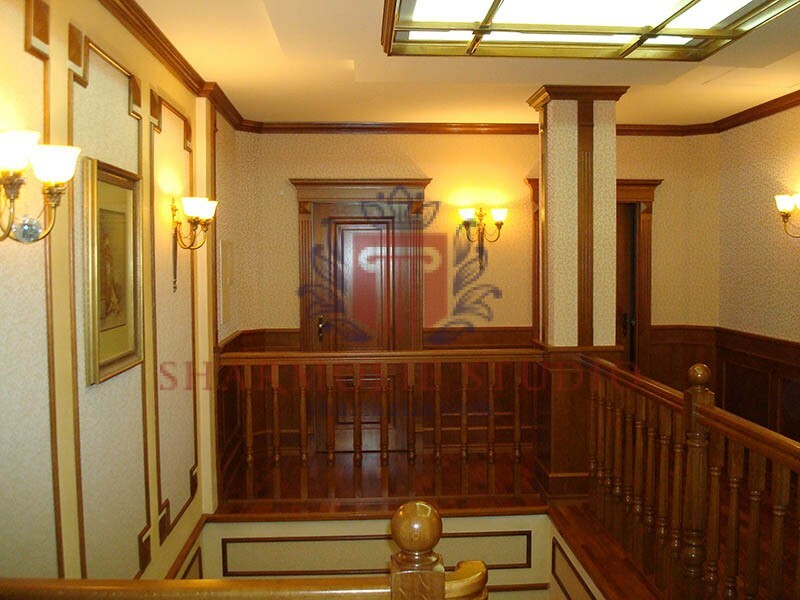 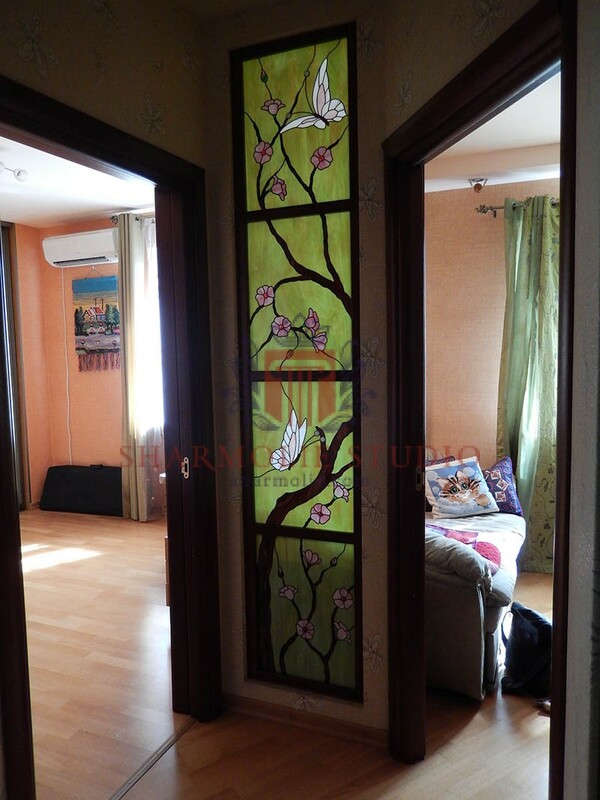 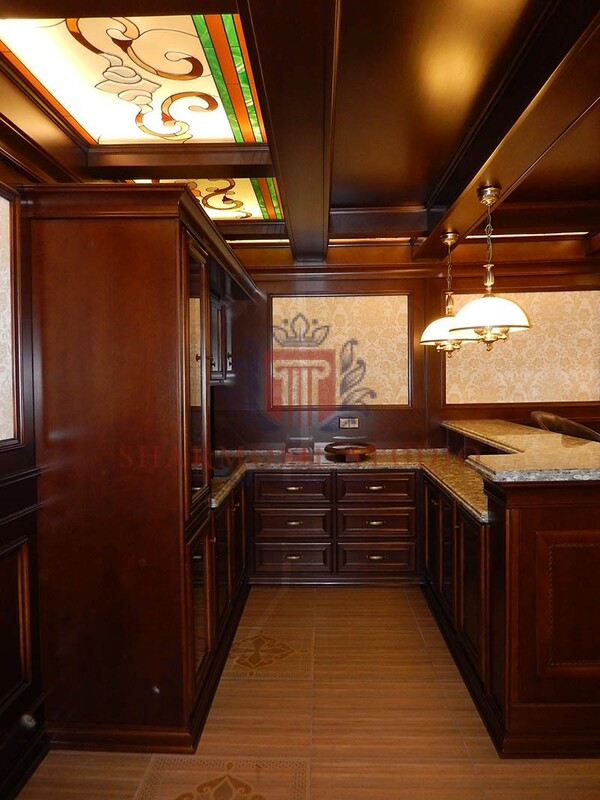 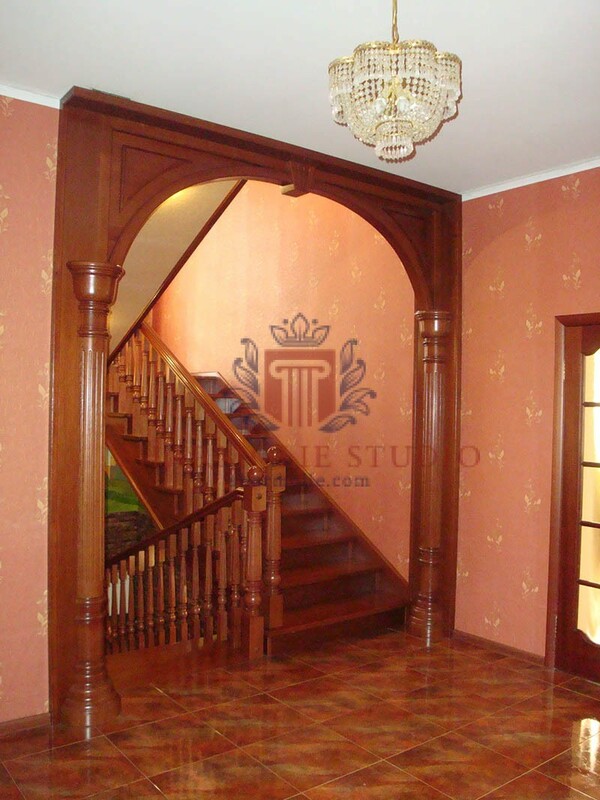 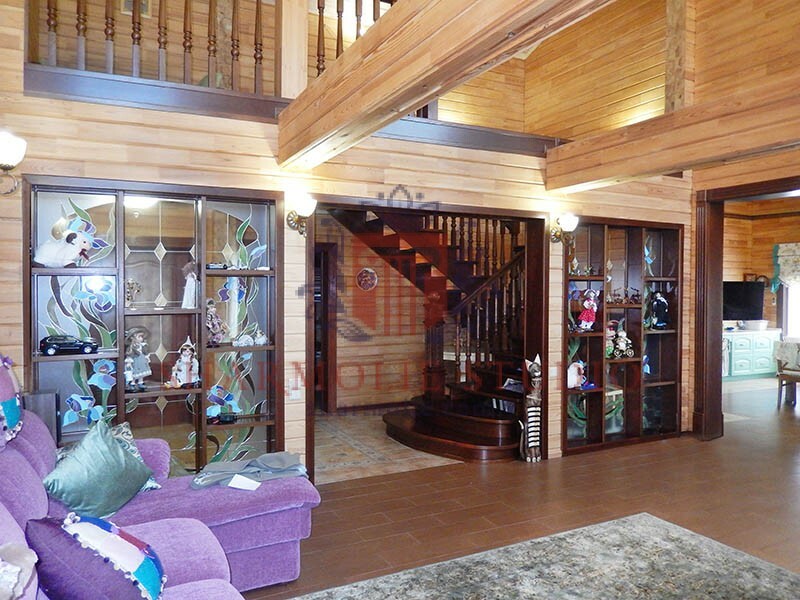 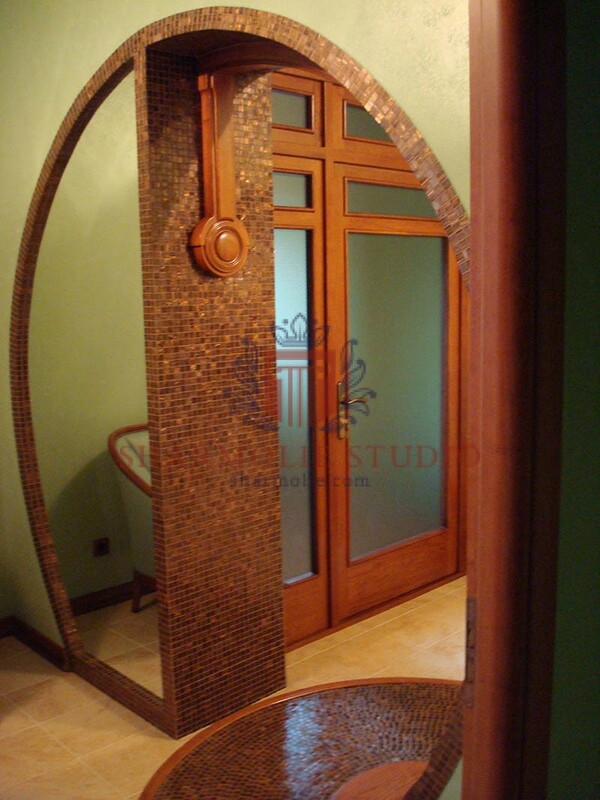 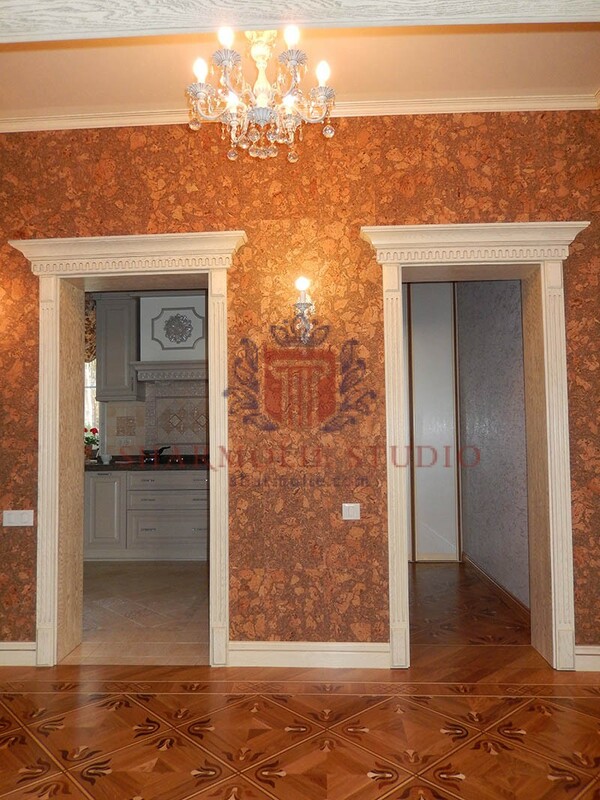 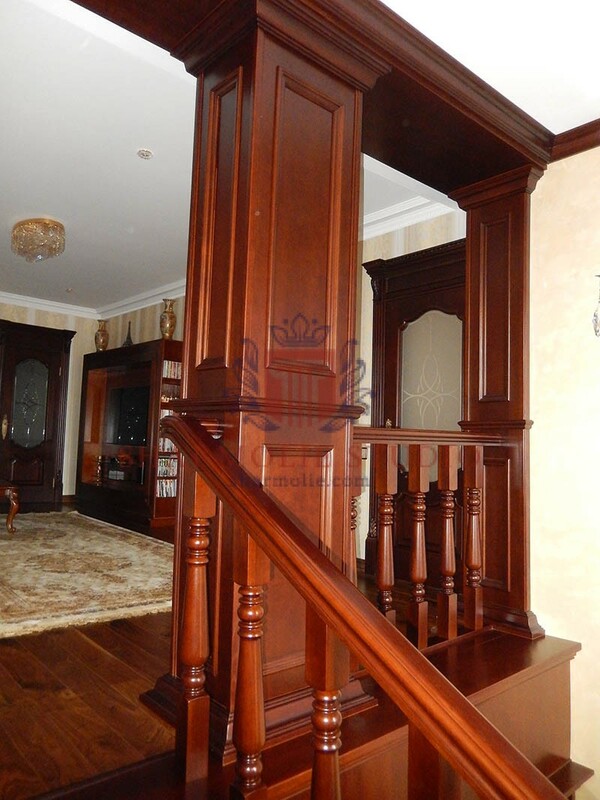 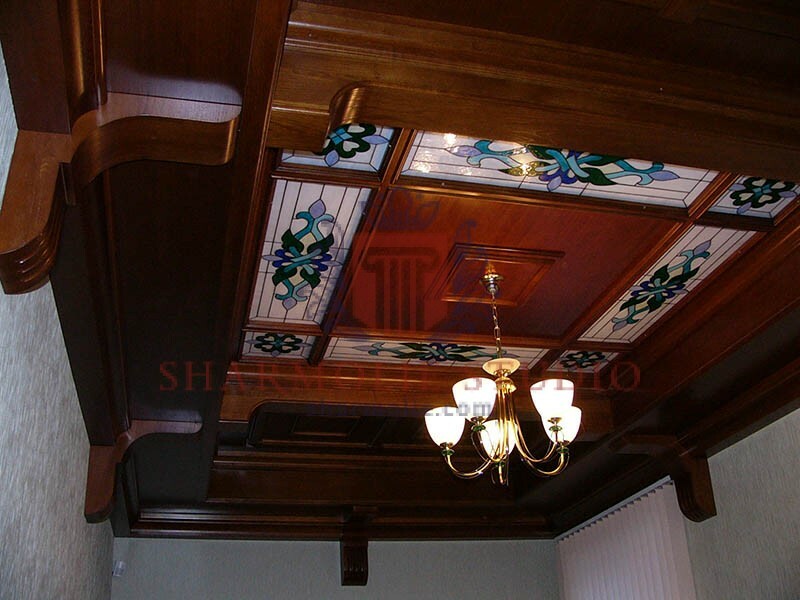 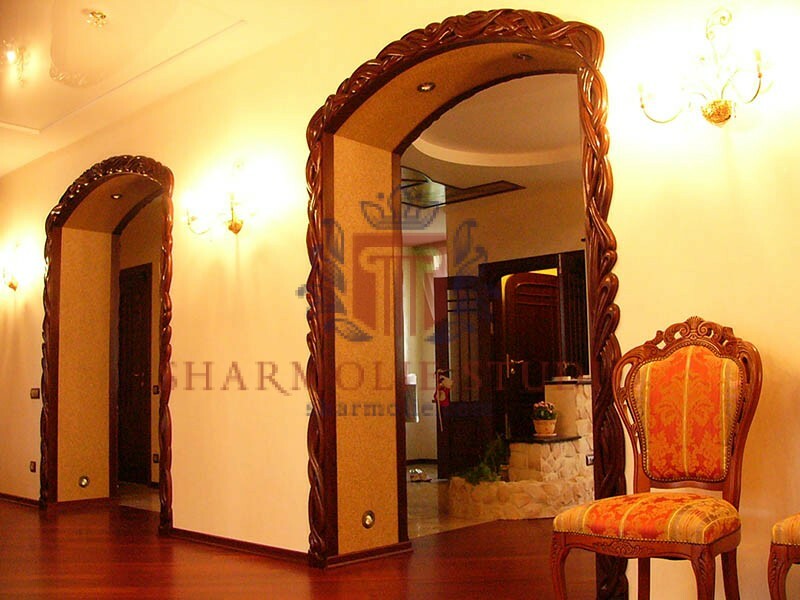 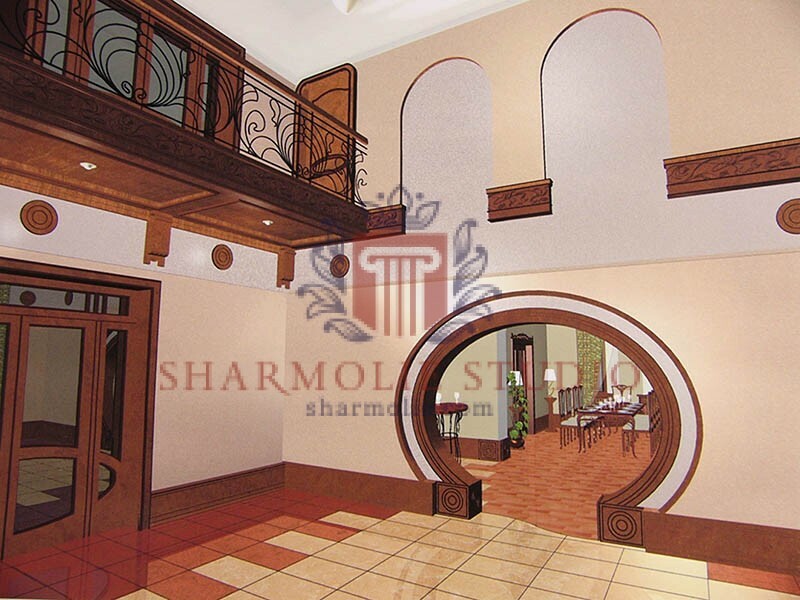 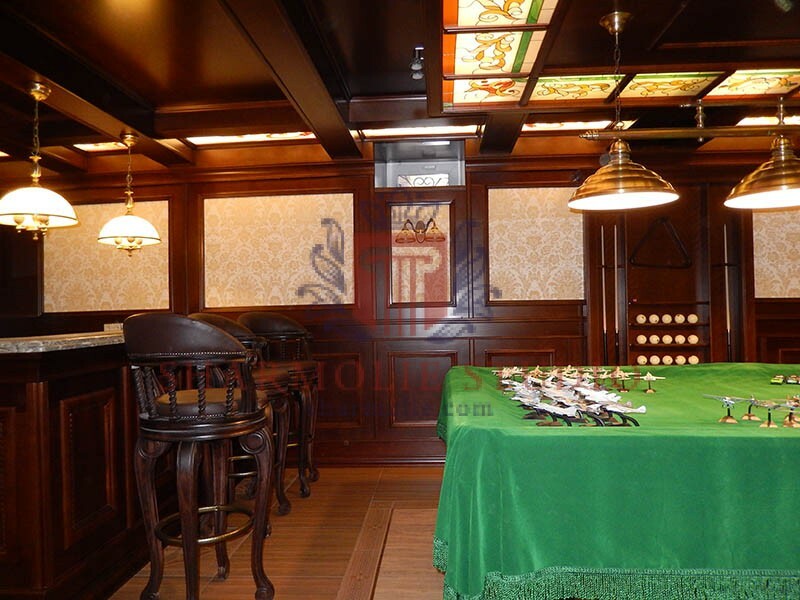 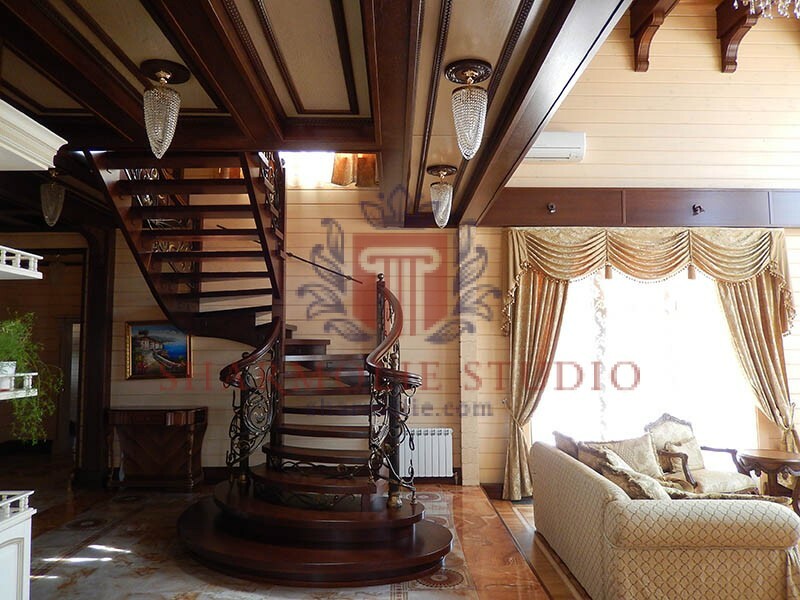 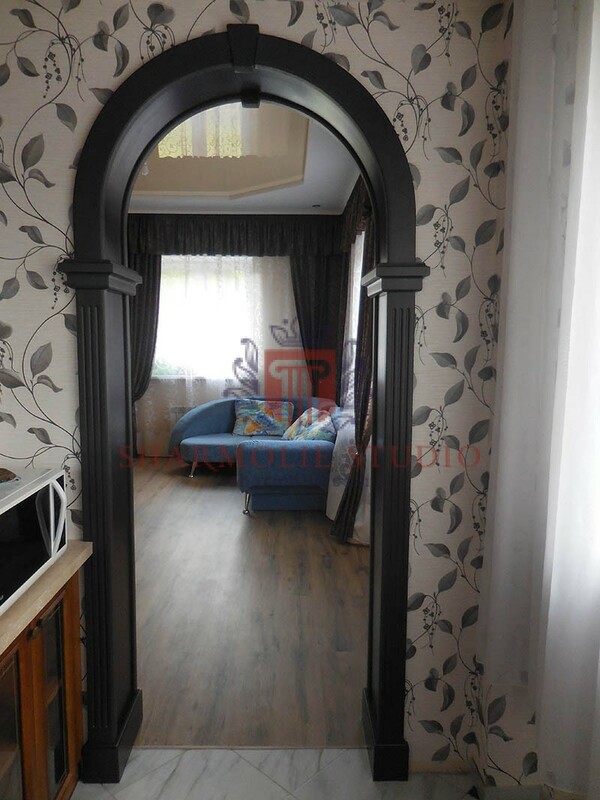 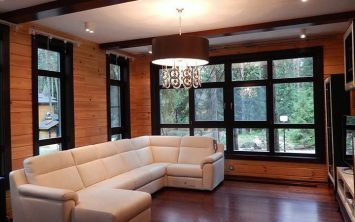 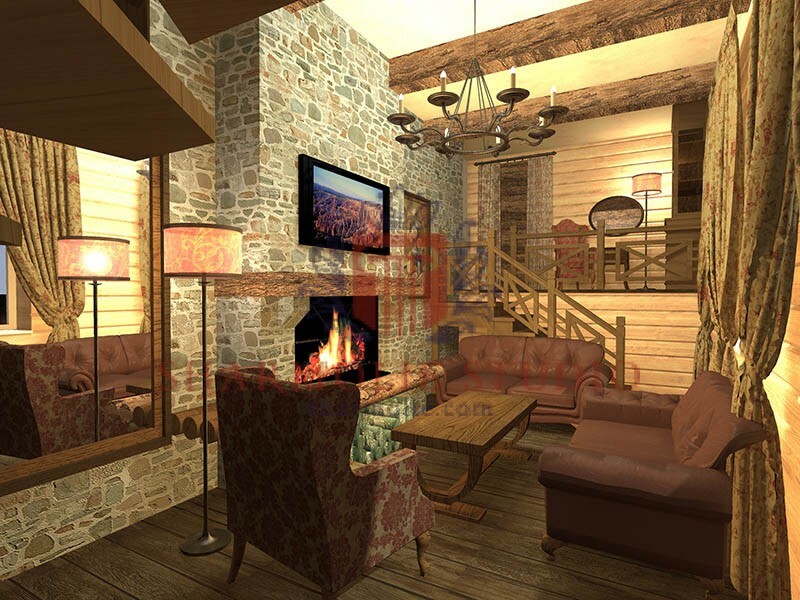 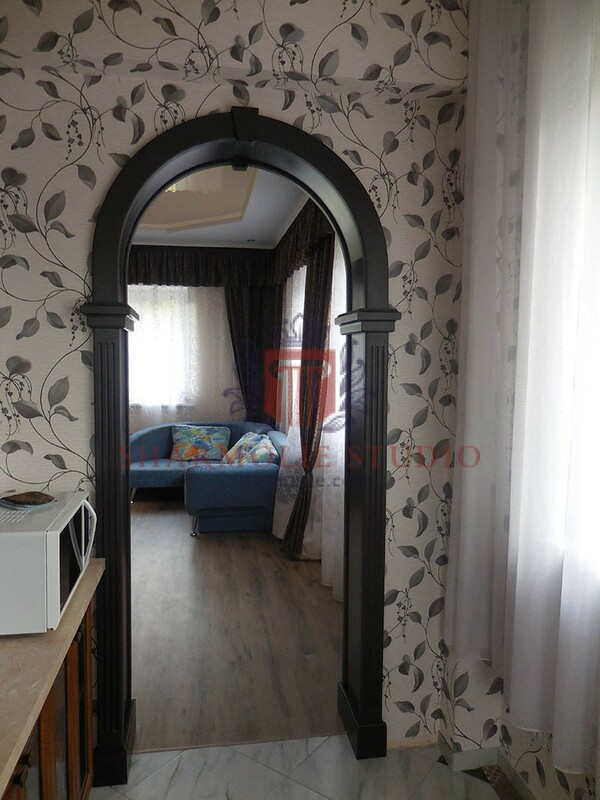 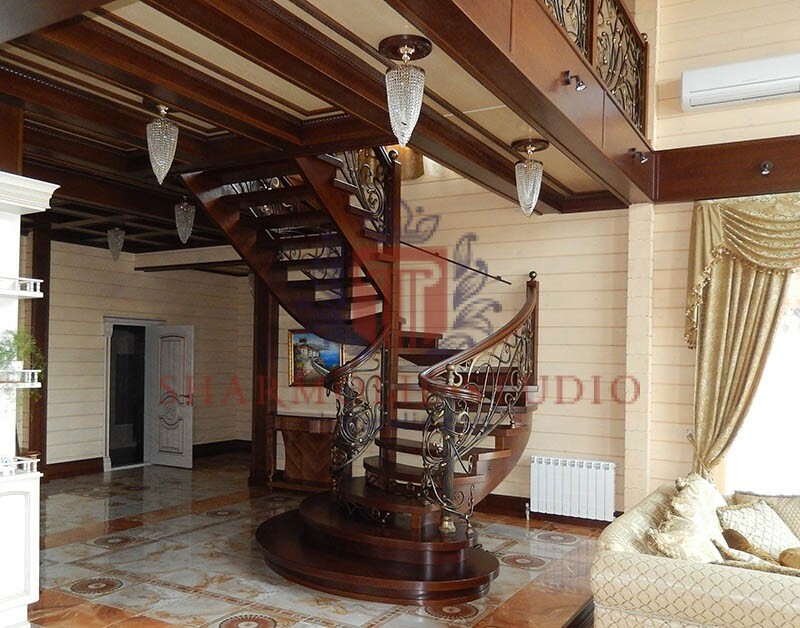 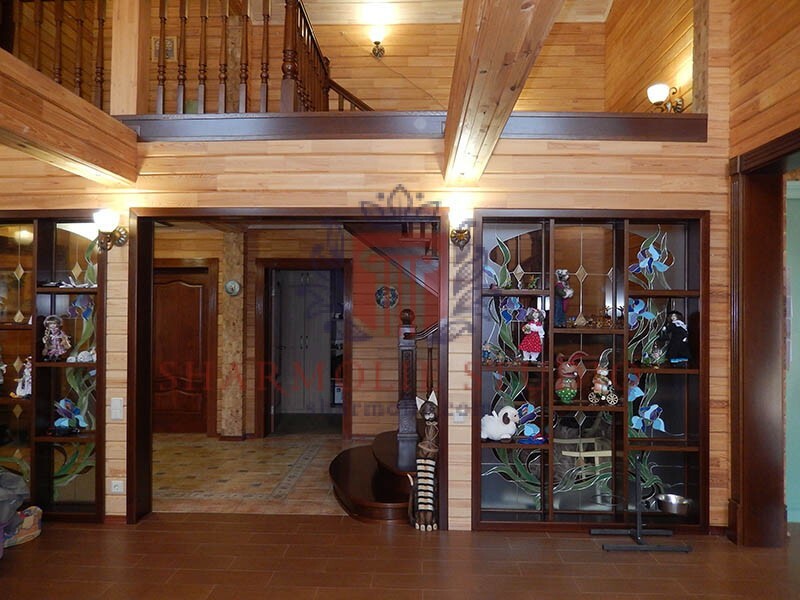 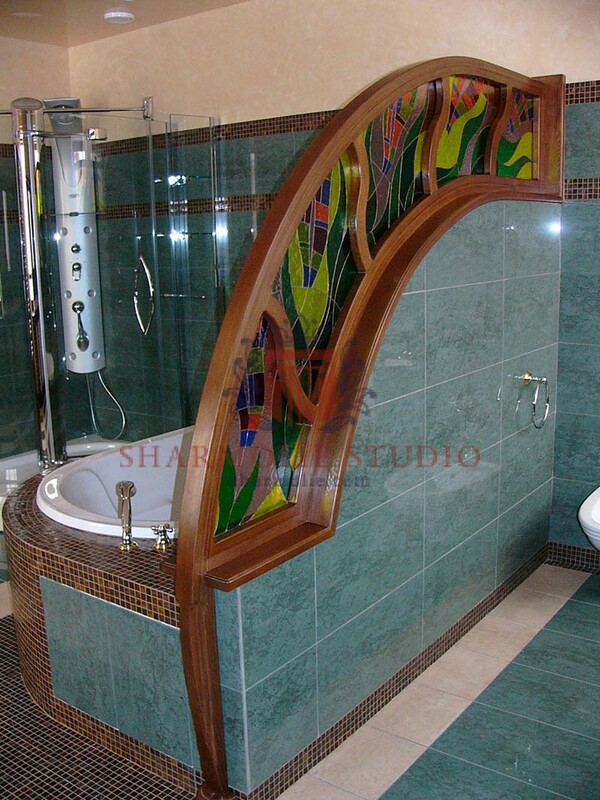 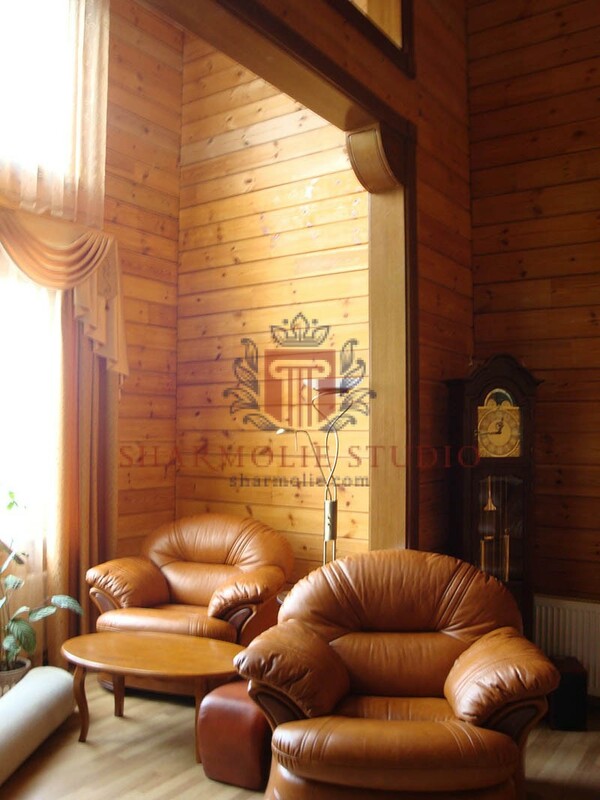 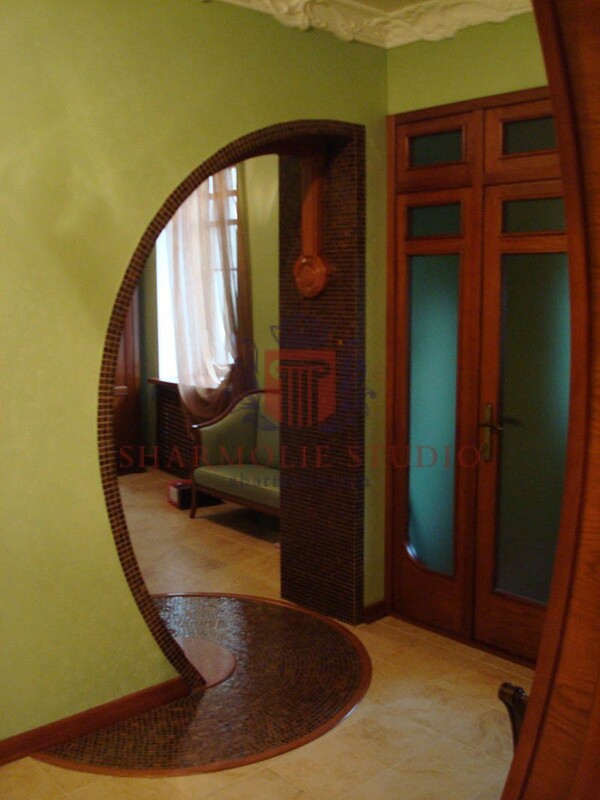 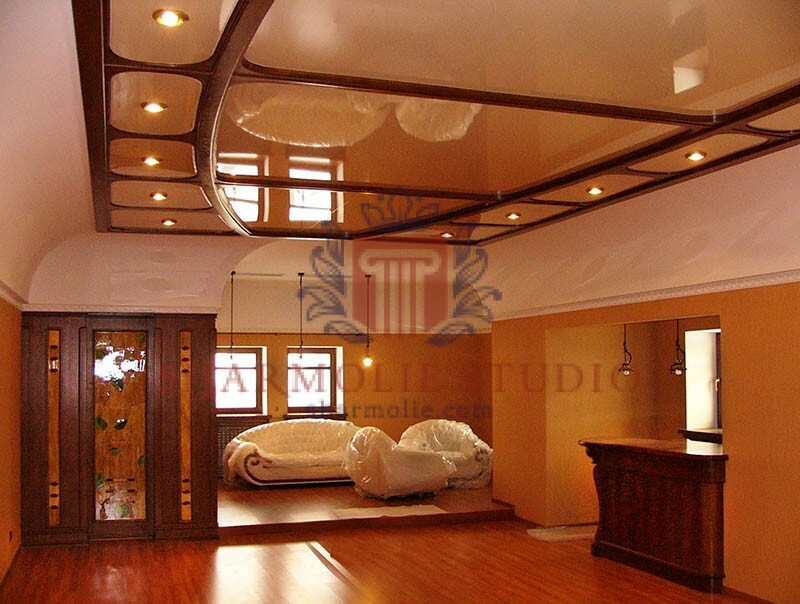 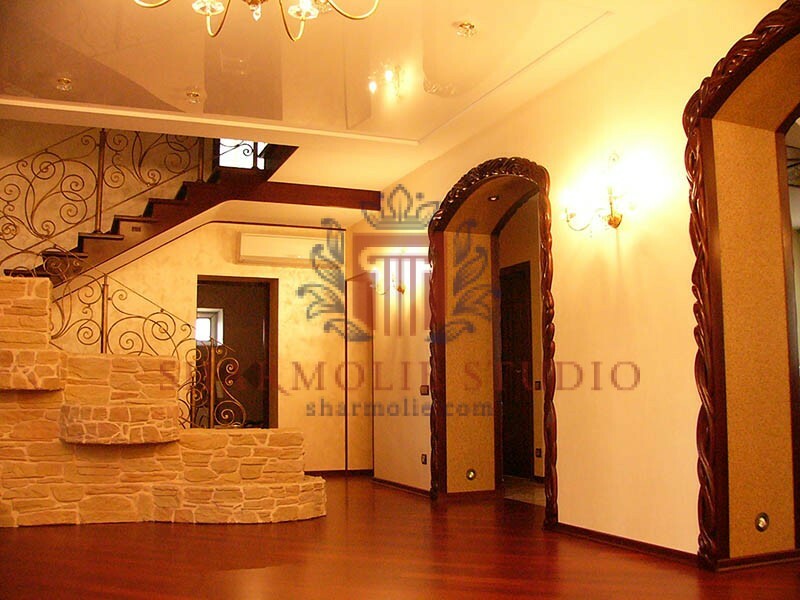 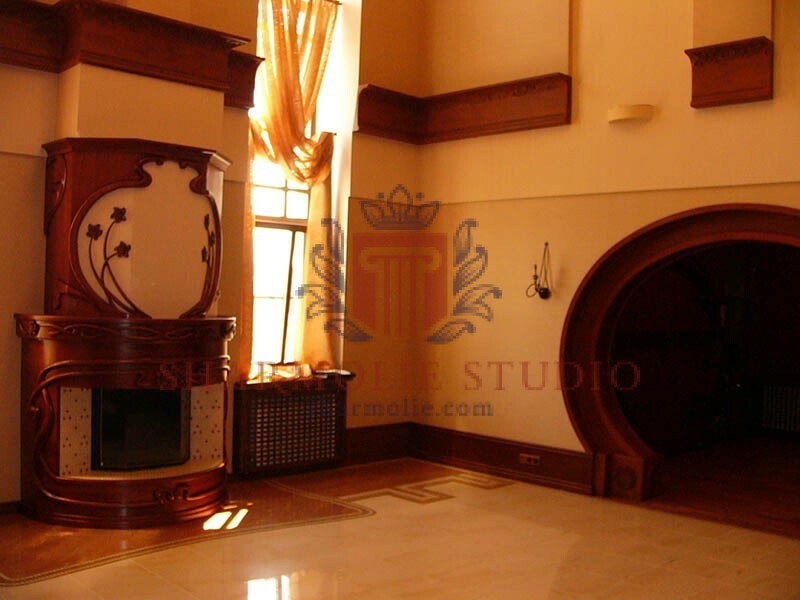 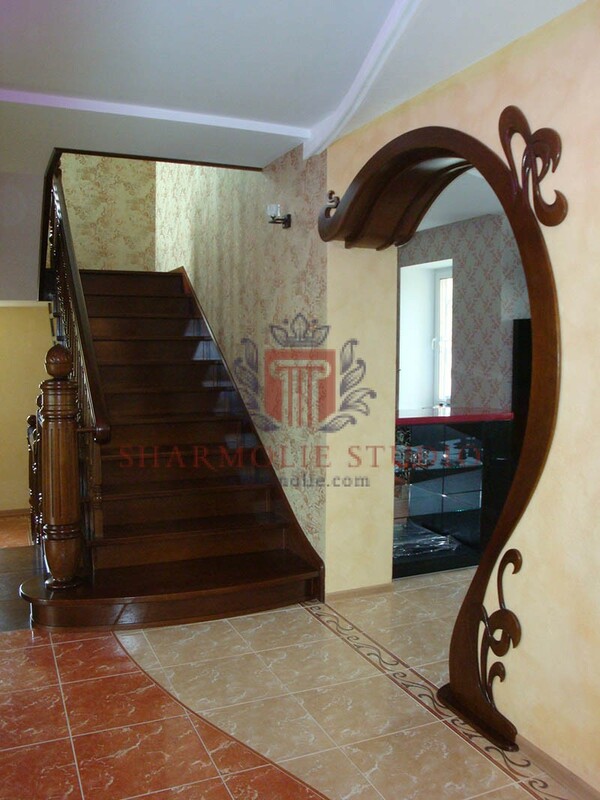 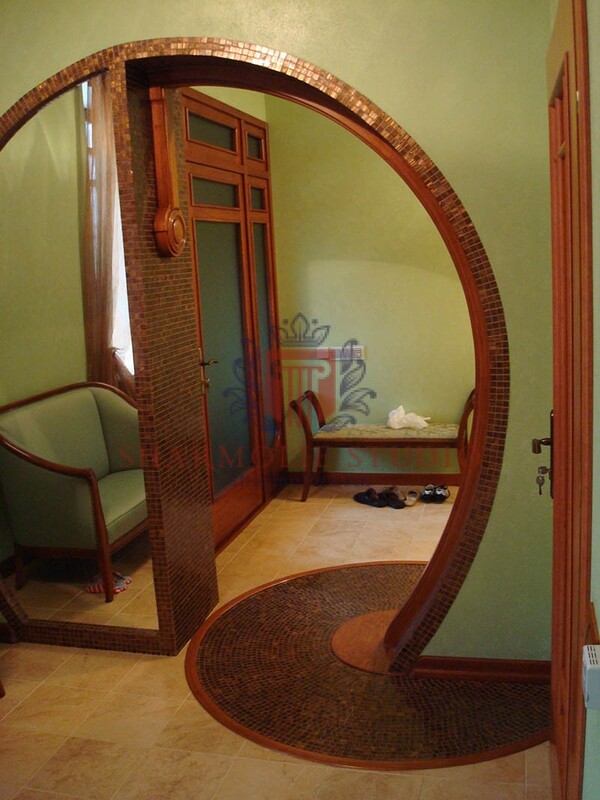 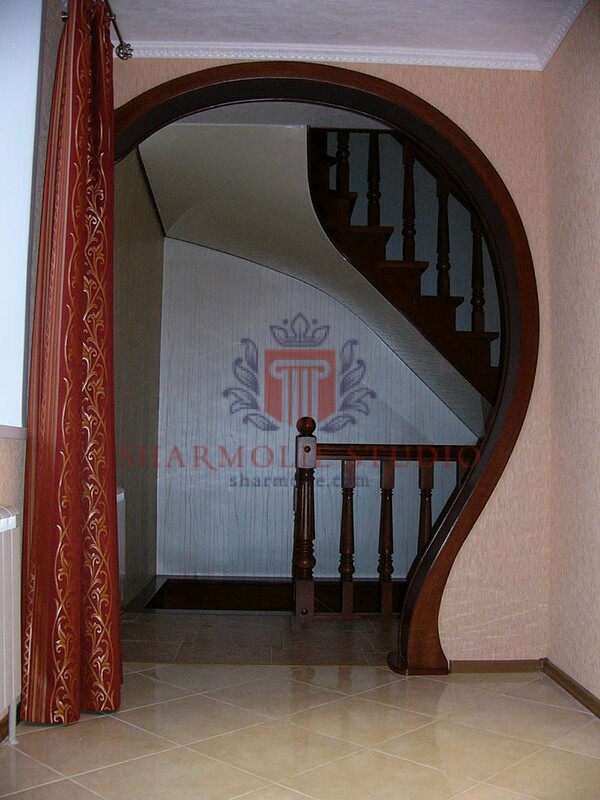 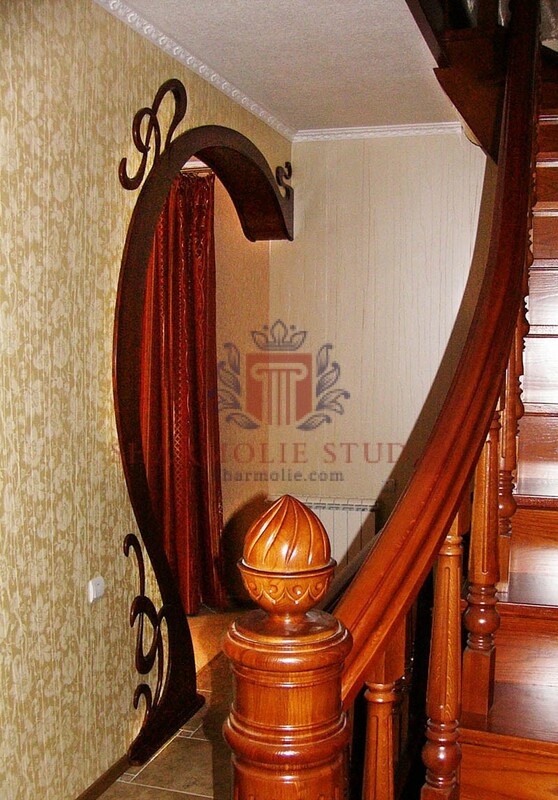 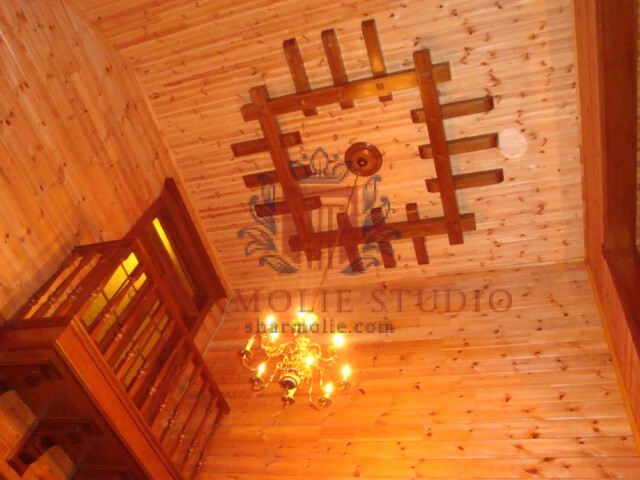 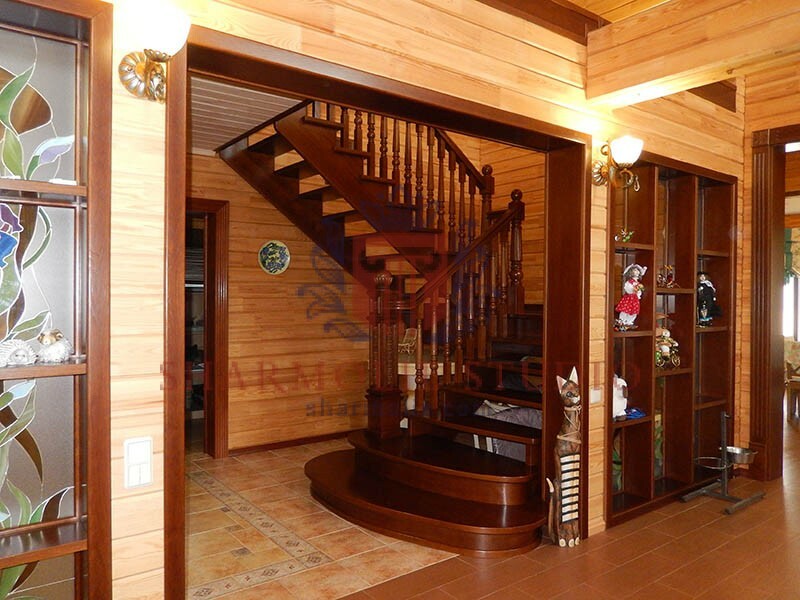 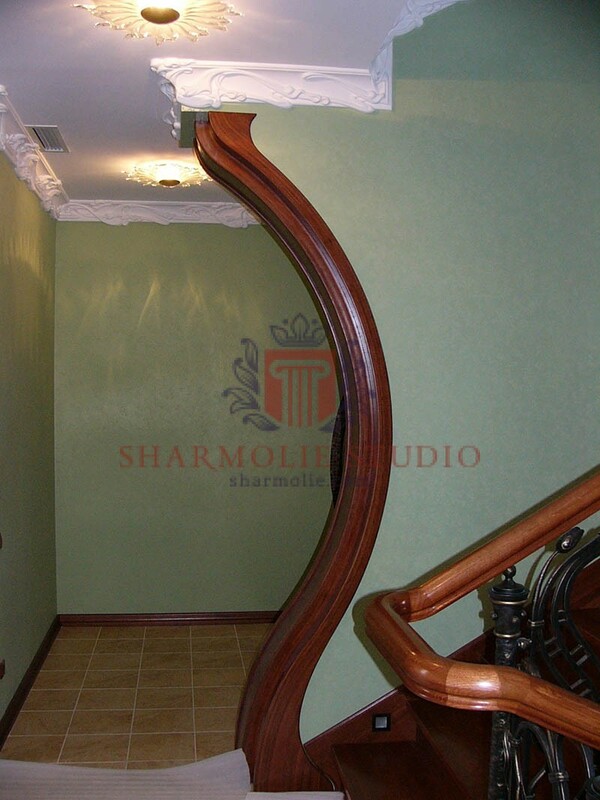 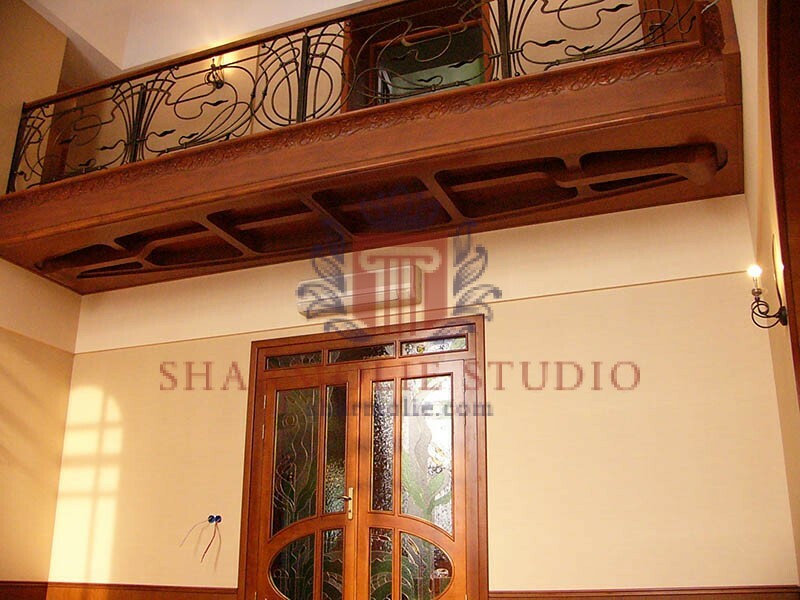 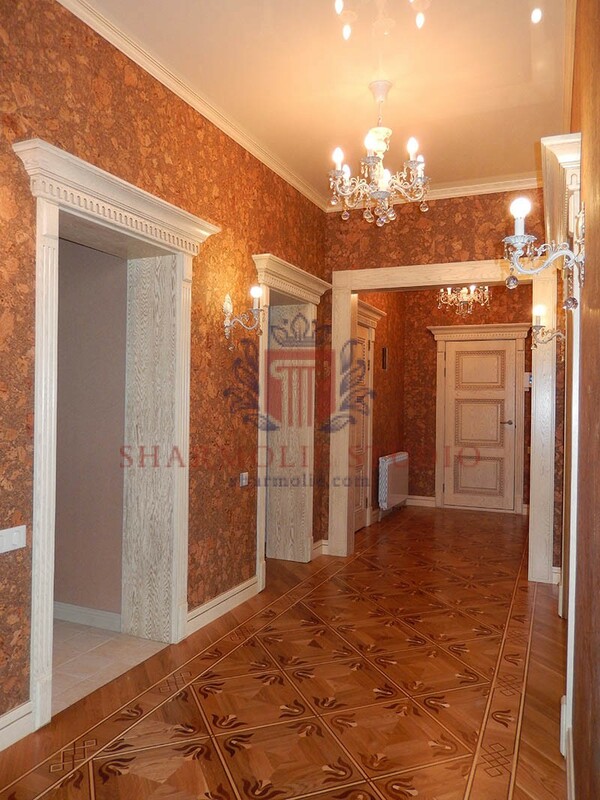 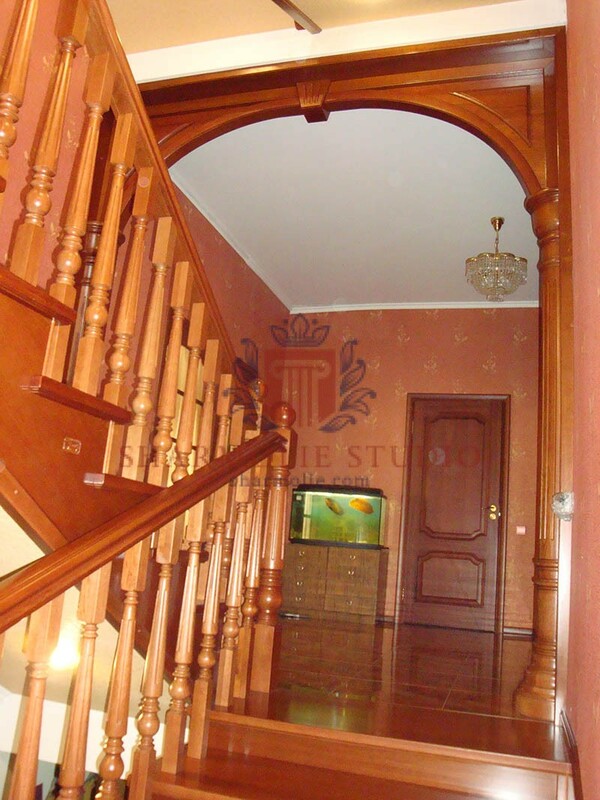 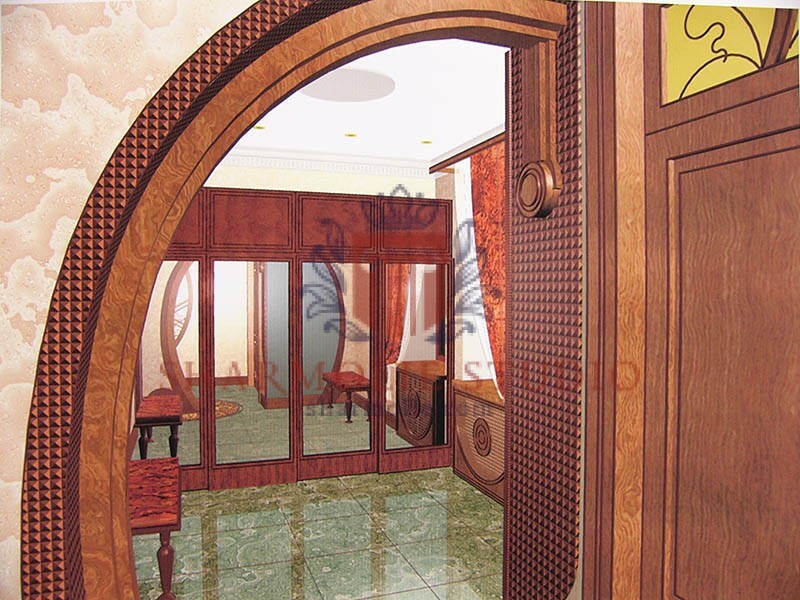 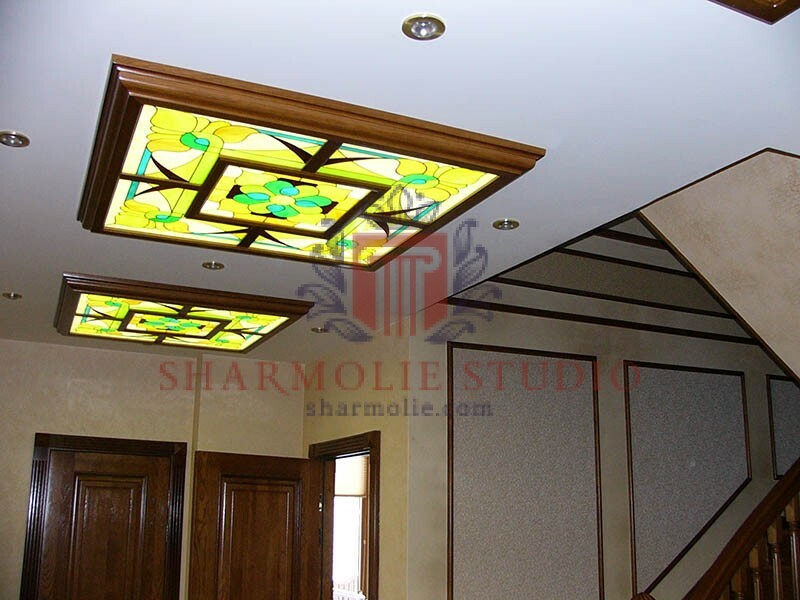 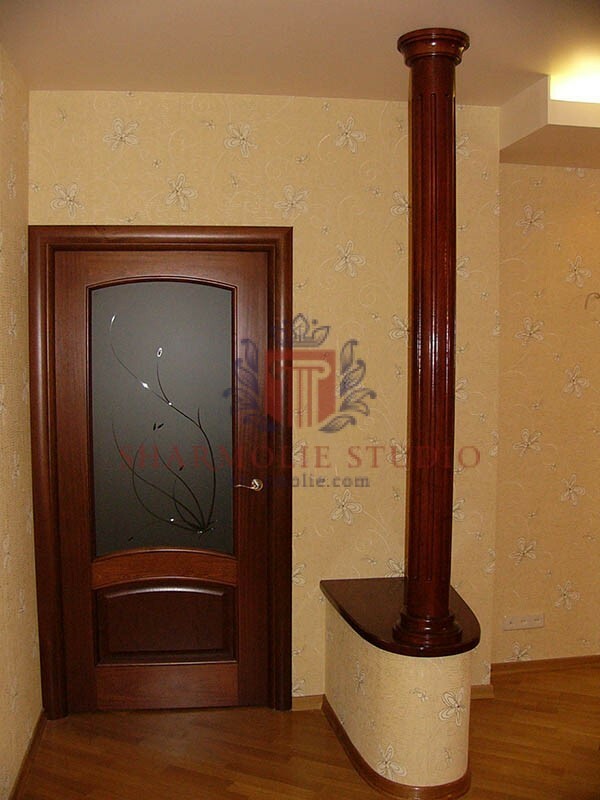 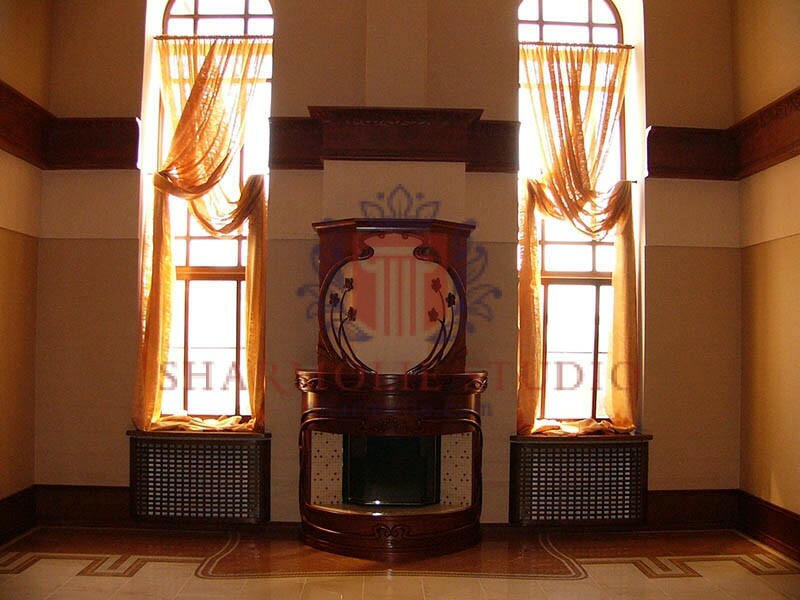 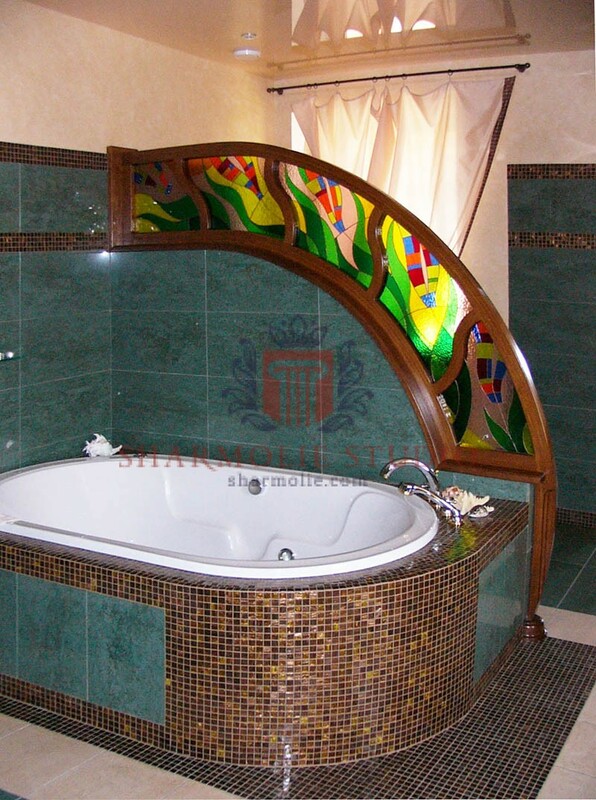 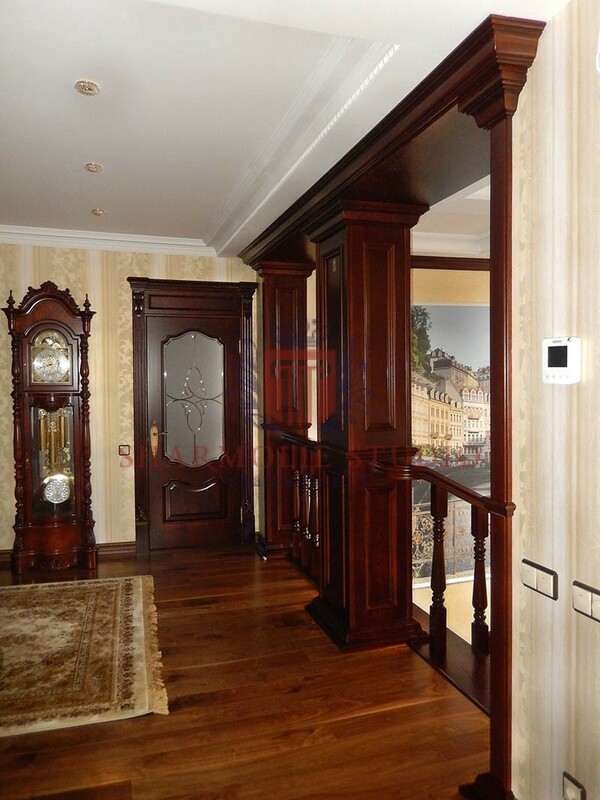 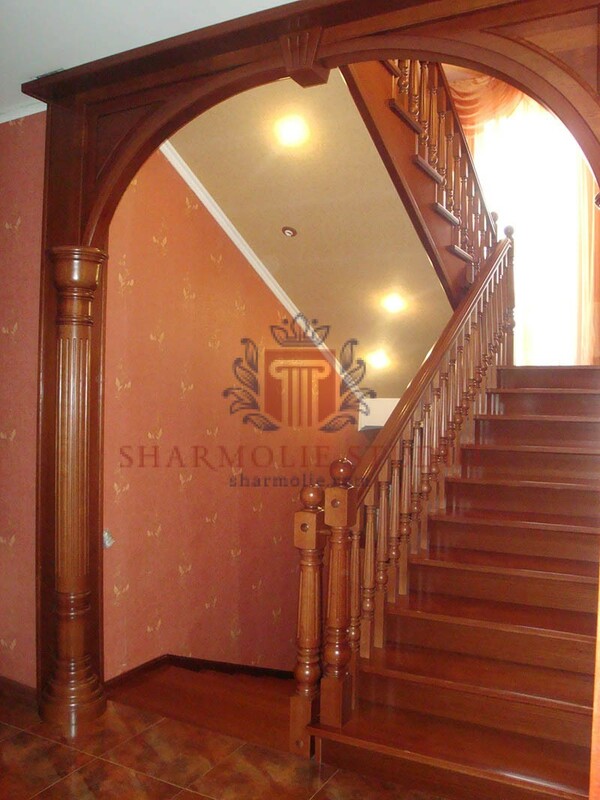 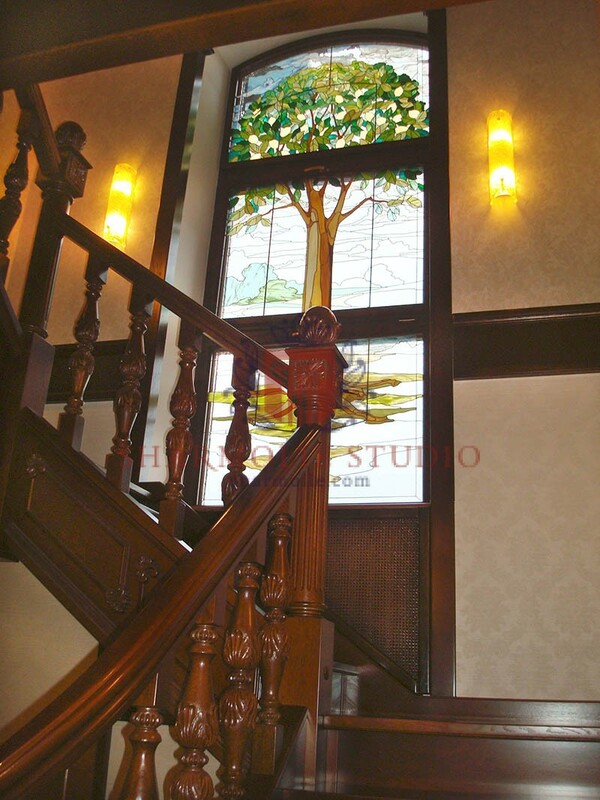 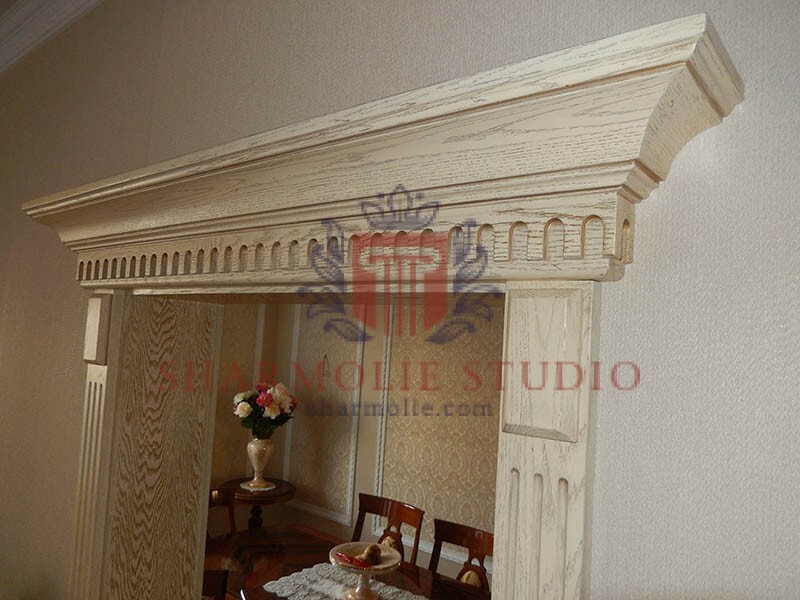 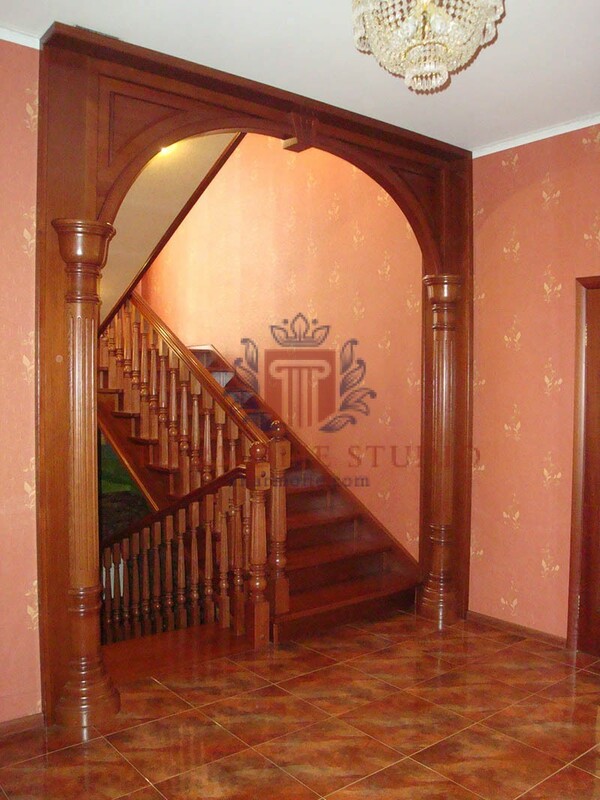 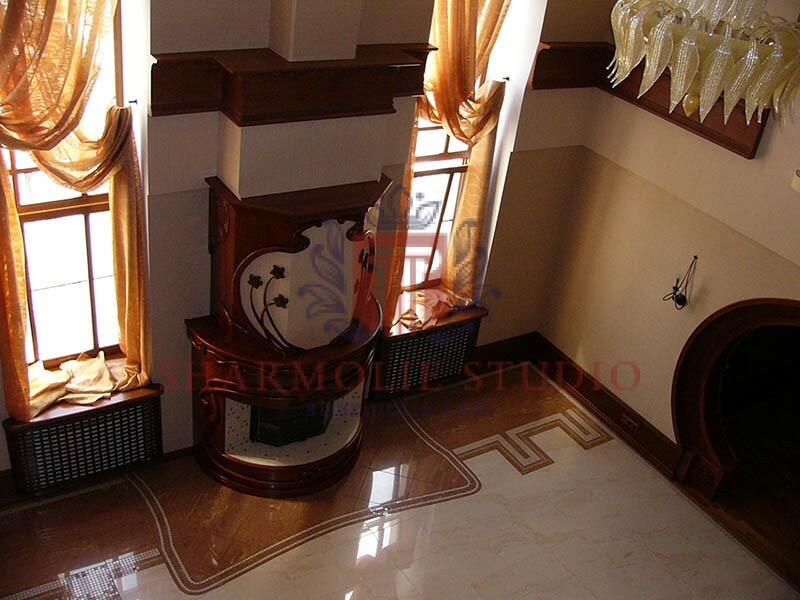 It is convenient to create interior elements from it, also it is very beautiful. 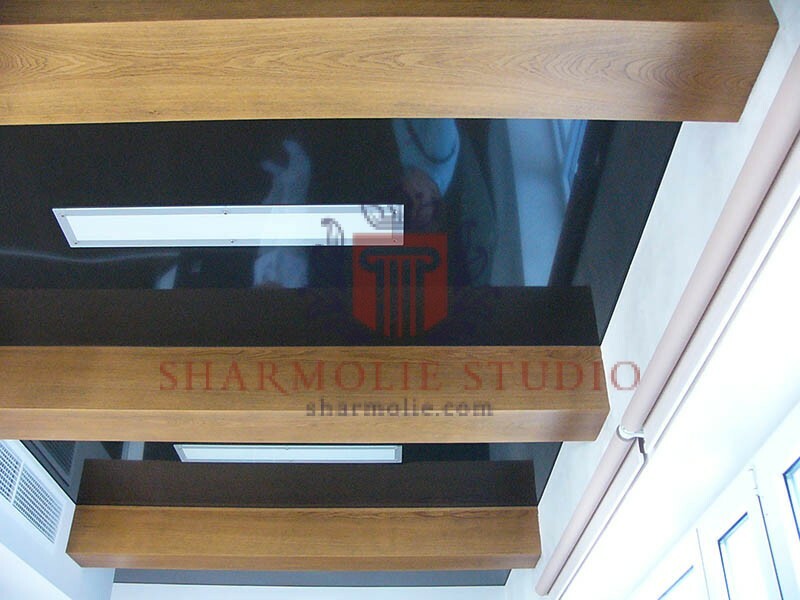 We choose this material because of the deep colour and special texture. 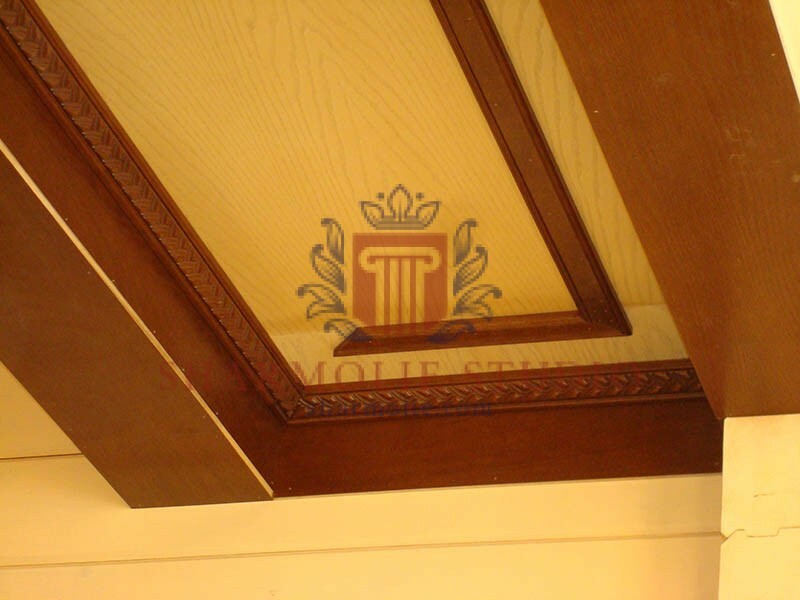 MDF is environmentally friendly and safety. 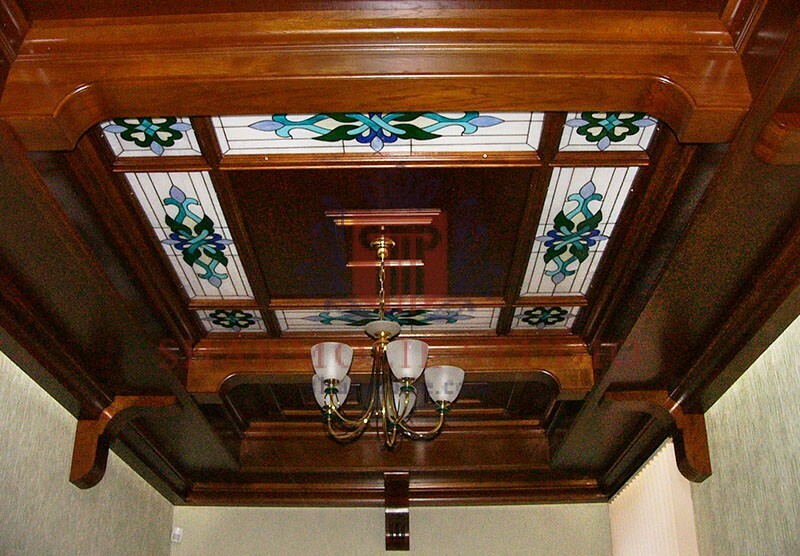 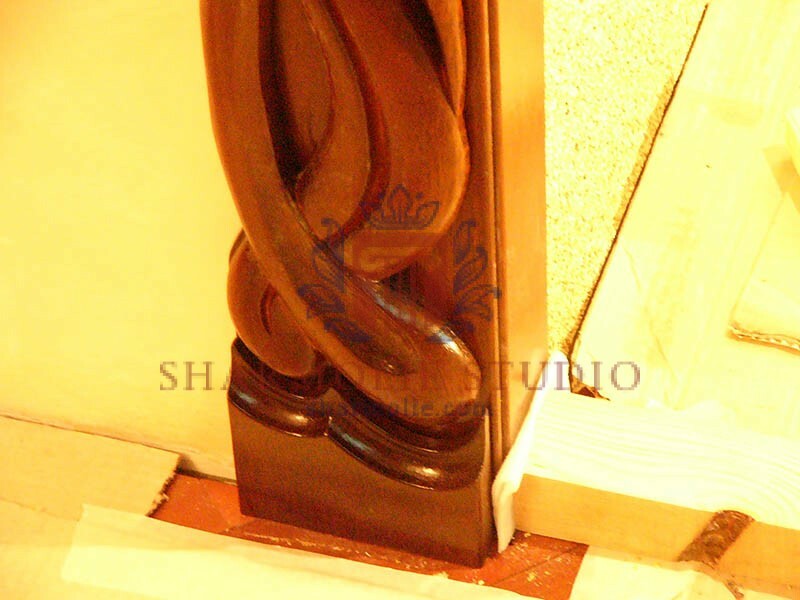 It does not produce harmful fumes and retains its strength and beauty even after years of use. 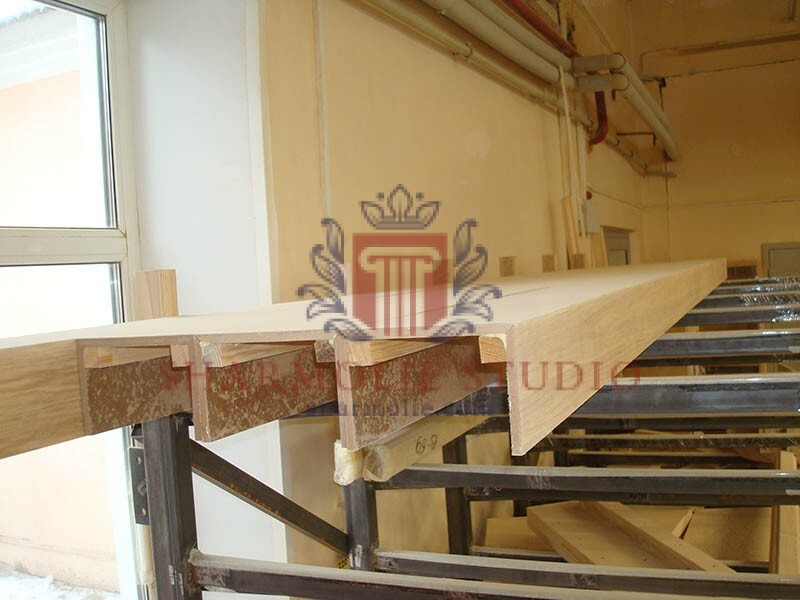 In dealing with wood, lots of depends on how the specialist chooses additional protective compounds and conducts the processing. 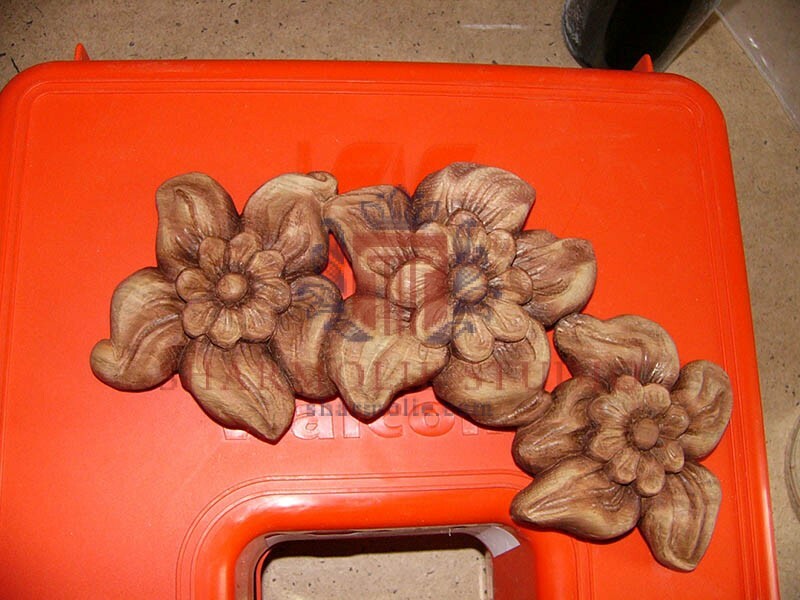 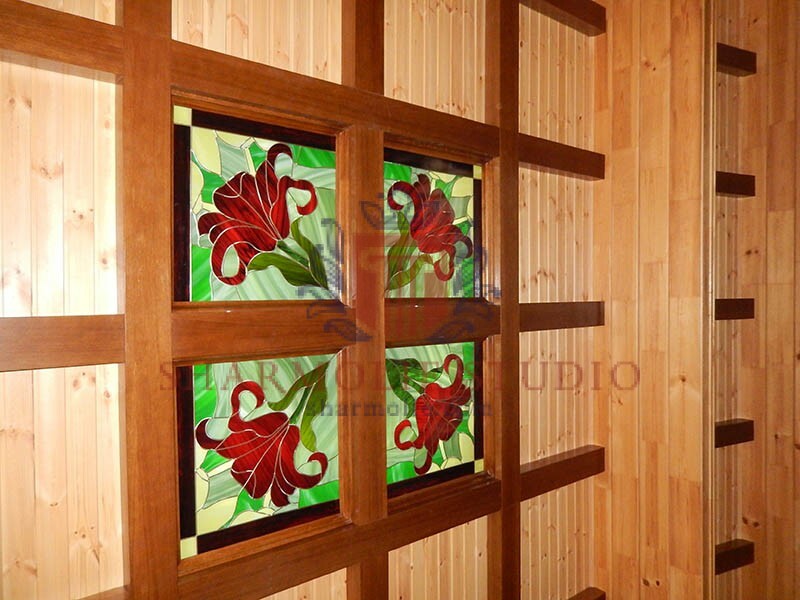 Wood is the material from which you can create real beauty. 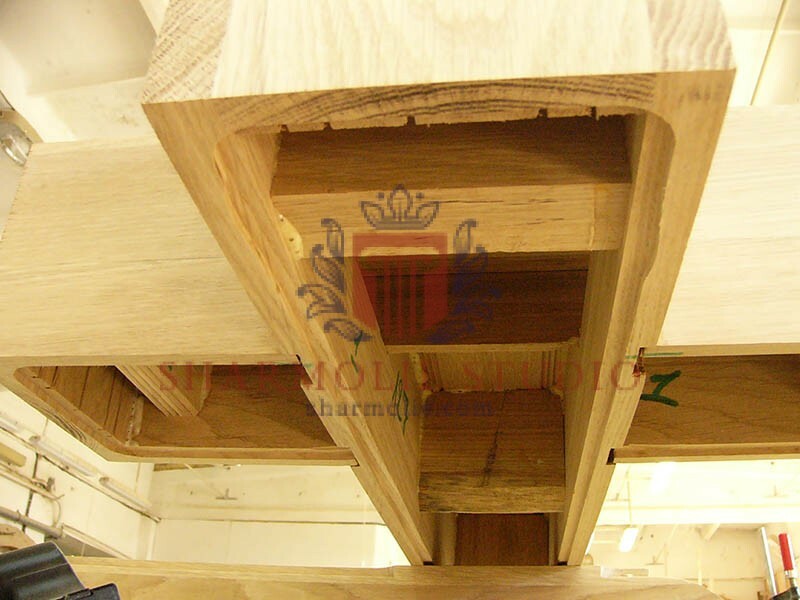 However, to ensure that the product will serve for many years, it is necessary to make sure that it is protected from external effects. 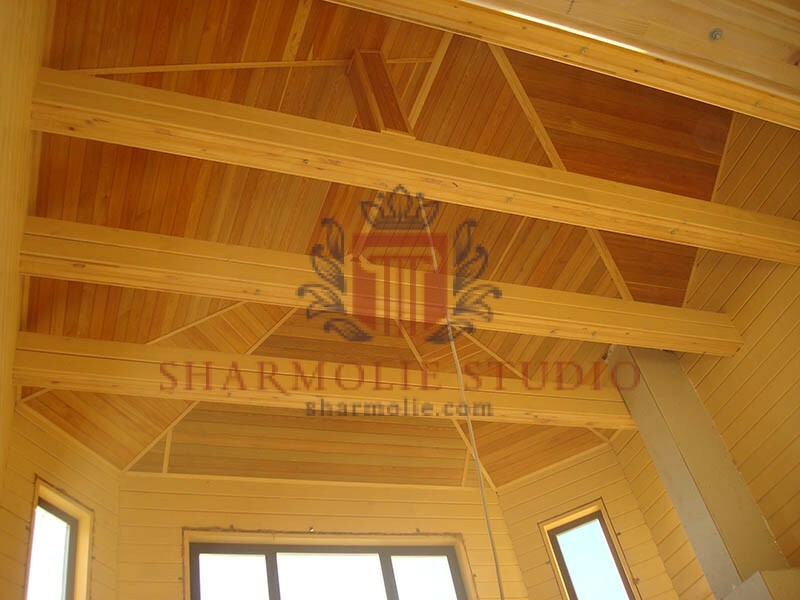 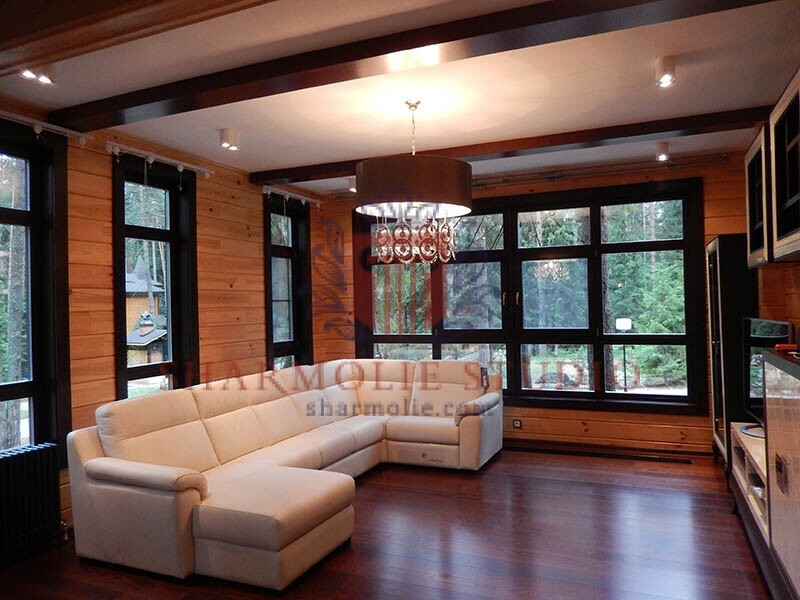 Other compounds help to strengthen the natural positive qualities of wood. 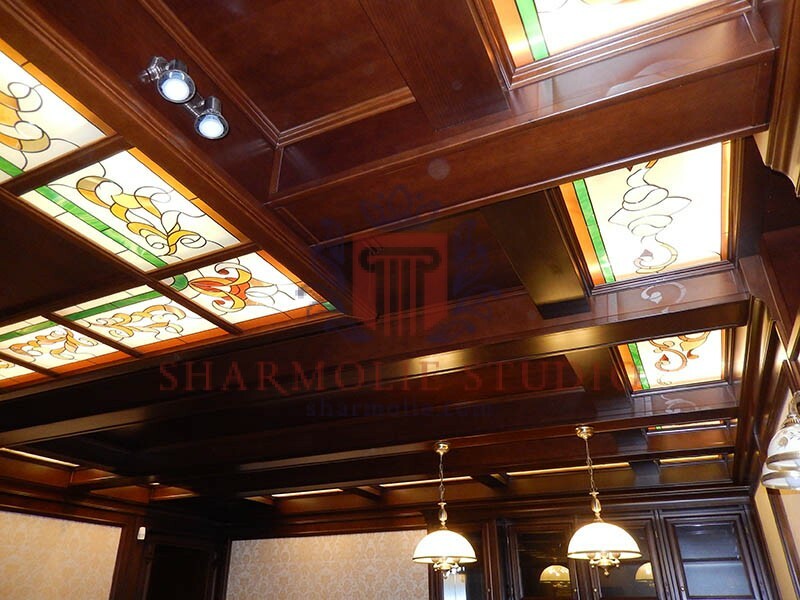 It's about the deep color and richness of shades. 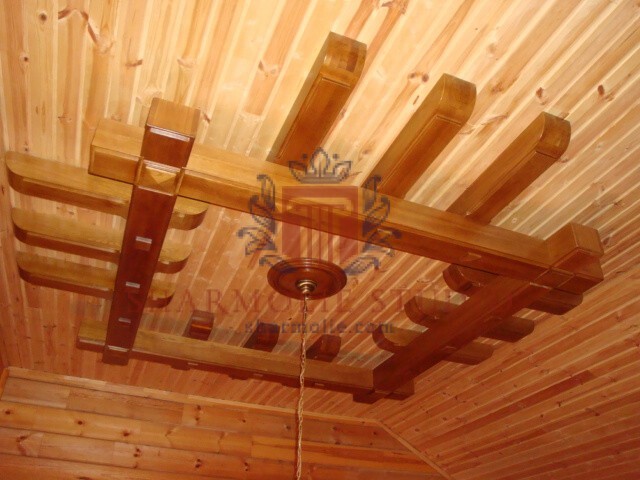 We know how to deal with wood, so that it can serve as long as possible. 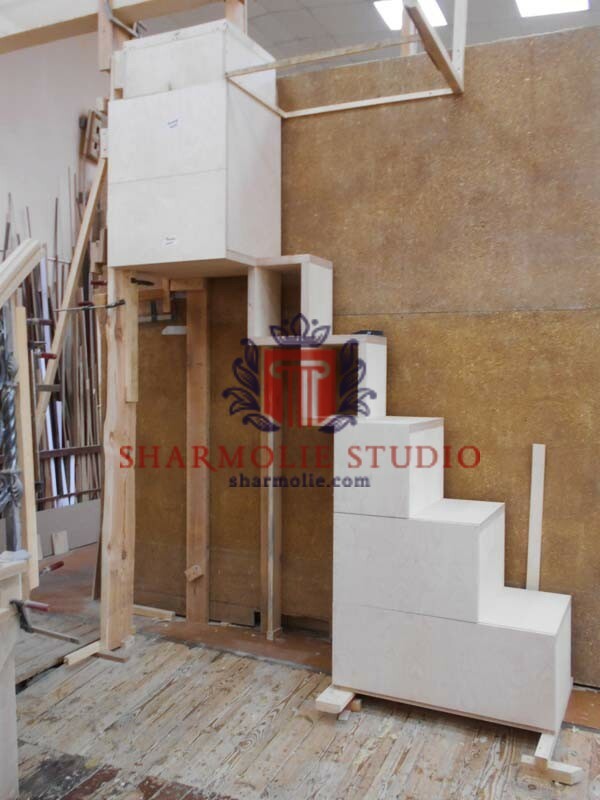 All materials go through the several steps. 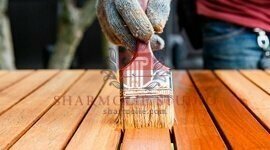 First of all, the tree will be primed - it prepares the surface for applying other compounds. 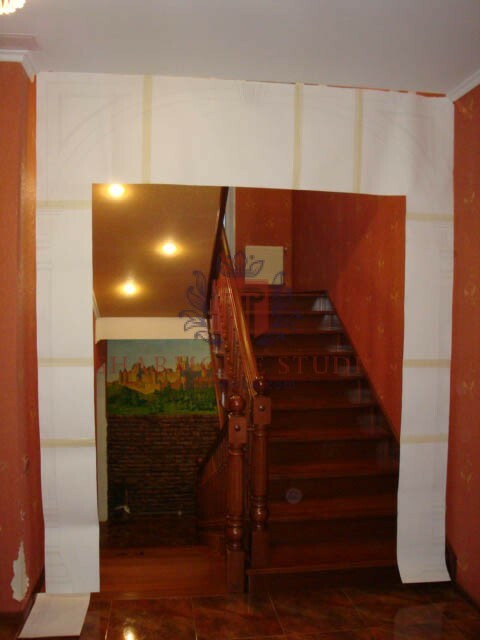 Then the tint is performed. 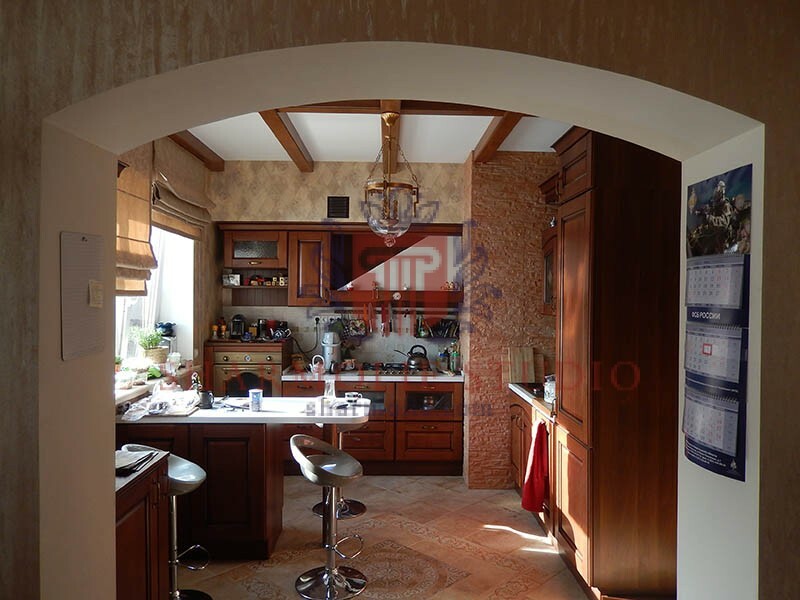 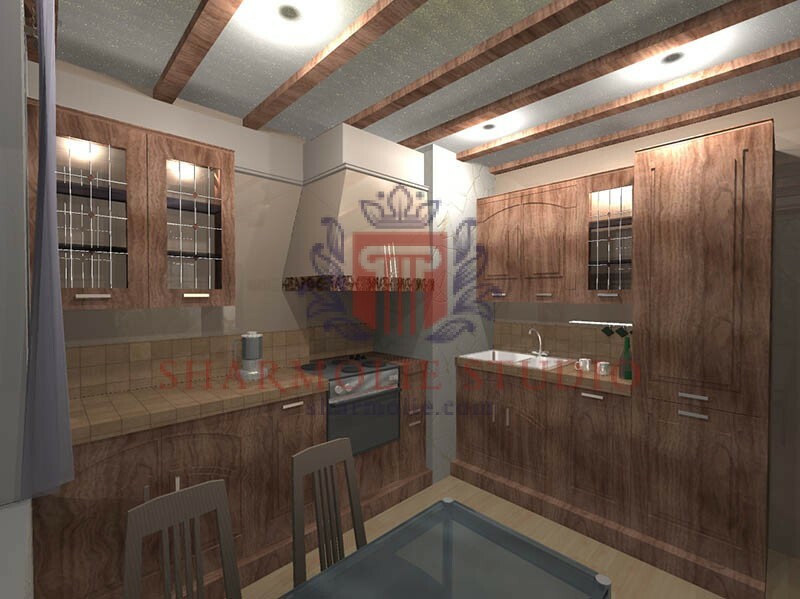 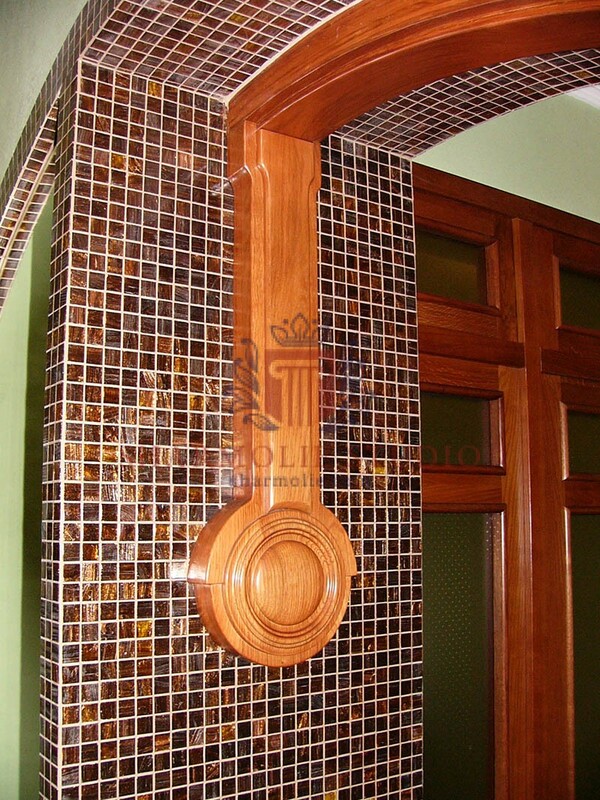 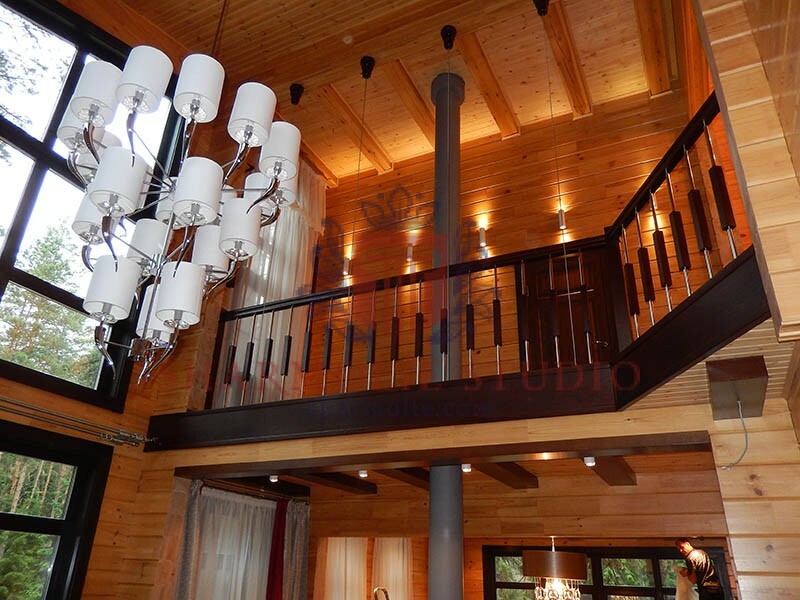 It is designed to emphasize the color of wood and highlight its rich texture. 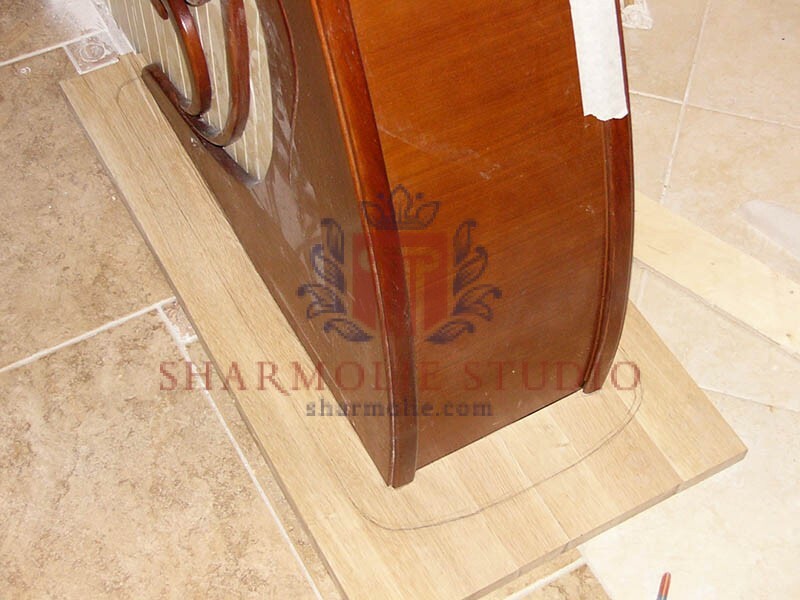 Finishing stroke becomes polishing. 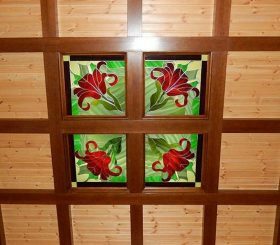 It not only helps decorate the surface, but also ensures that the product will be protected from external influences and humidity. 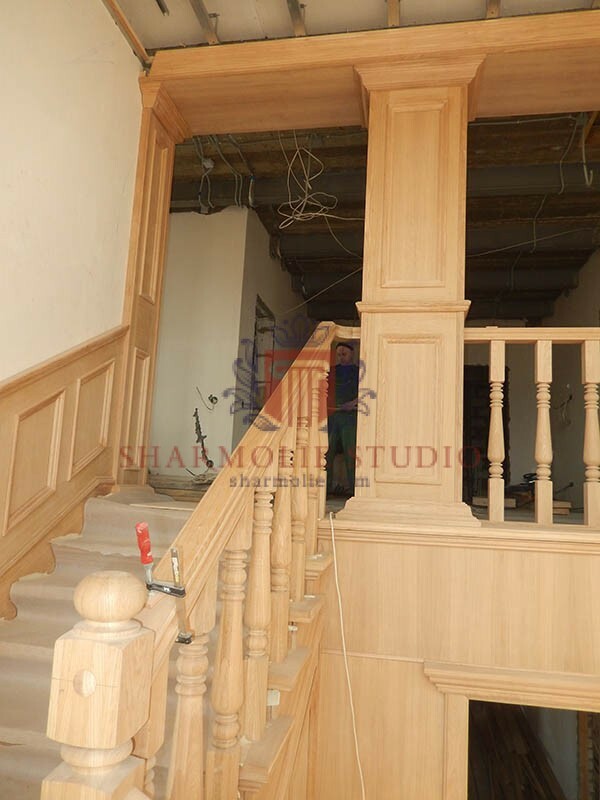 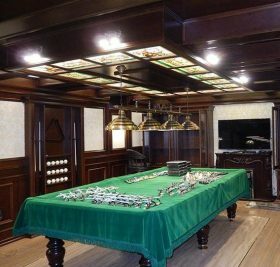 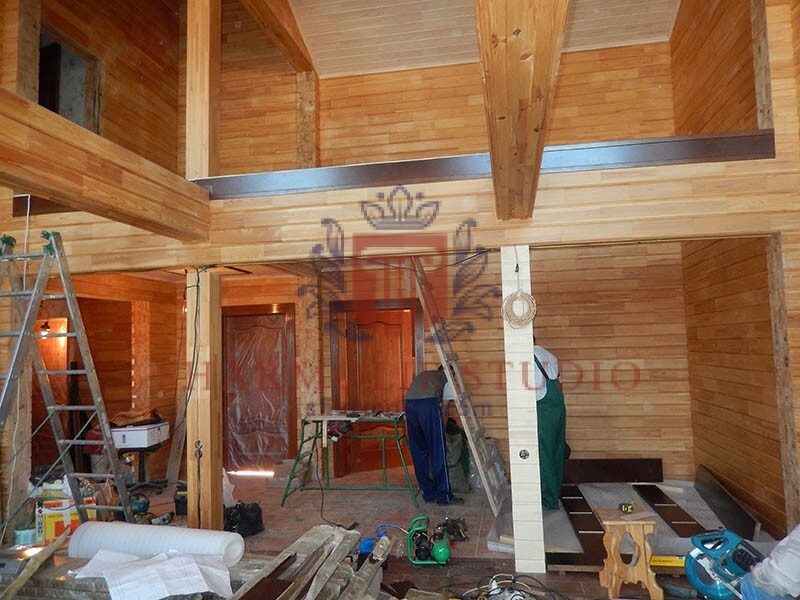 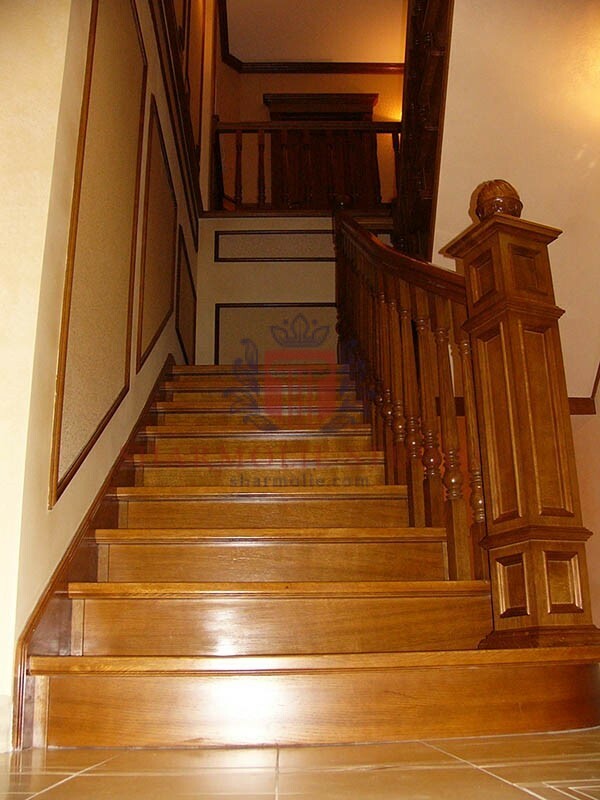 If all three of these procedures are performed correctly, the wood will become even more beautiful and enhance its protective qualities. 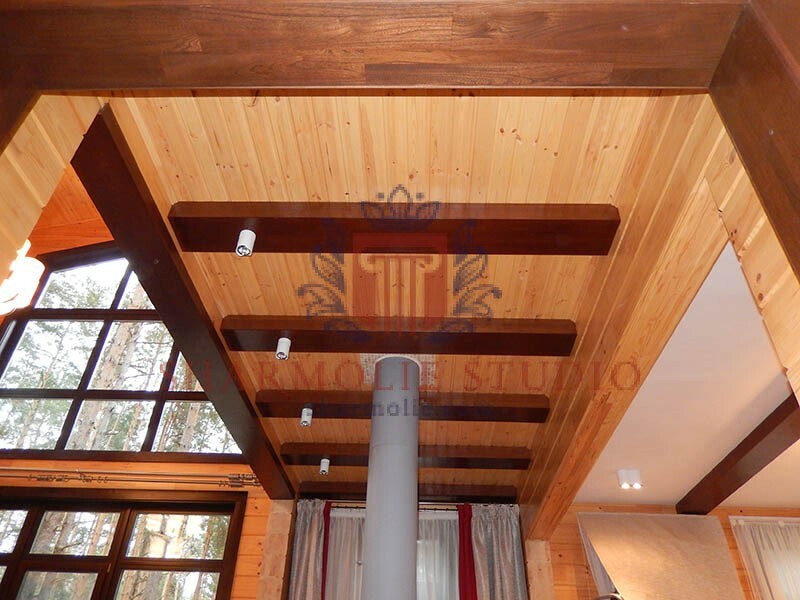 Over the years, we have become convinced that our experts are good at working with wood and discover the full potential of such material. 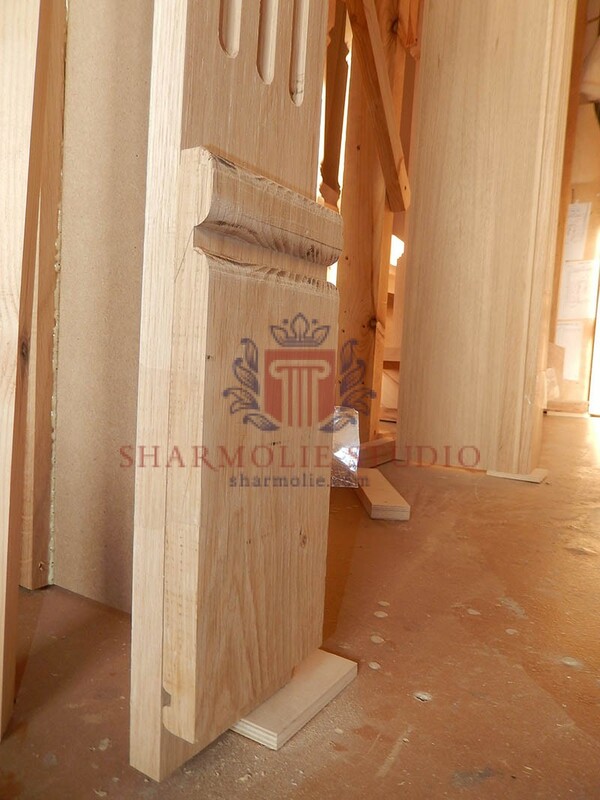 Our specialists know secrets dealing with wood which helps saved your decor elements for a long time. 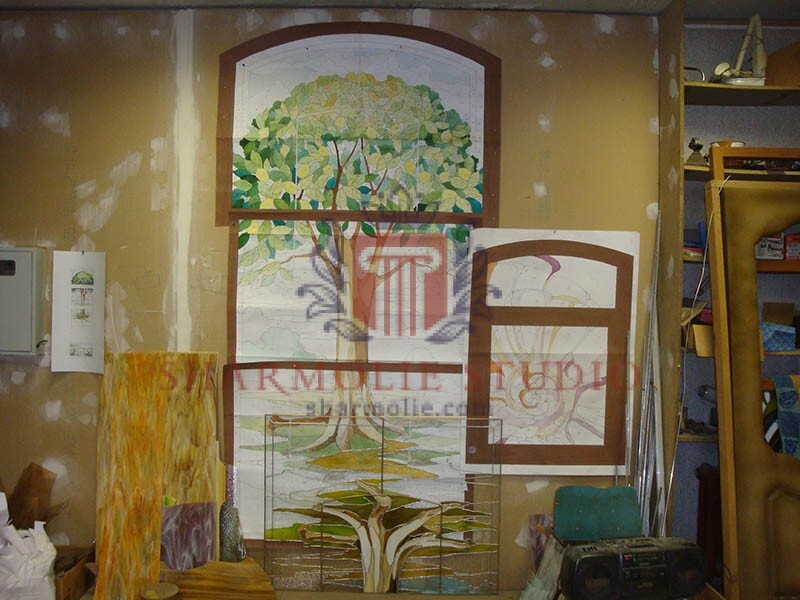 All materials go through a whole range of works. 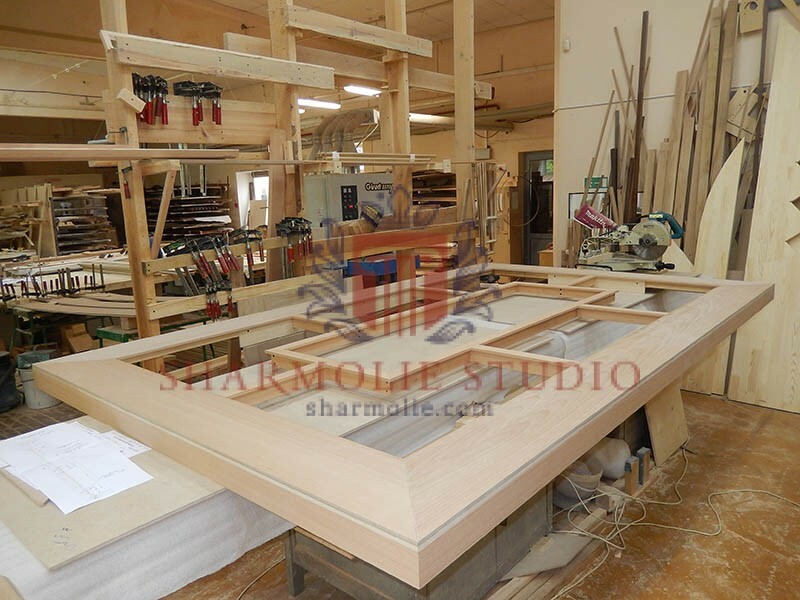 All materials go through a whole range of works. 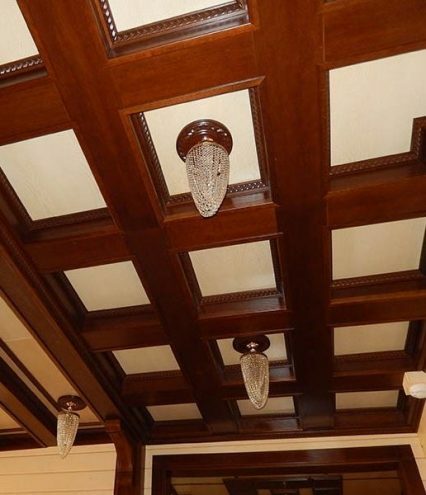 First of all the tree is coating. 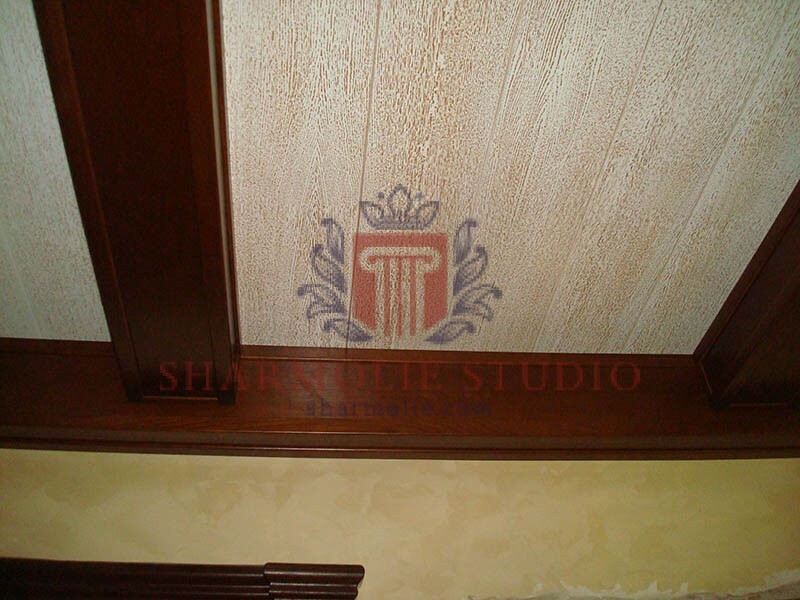 Then the toning is performed. 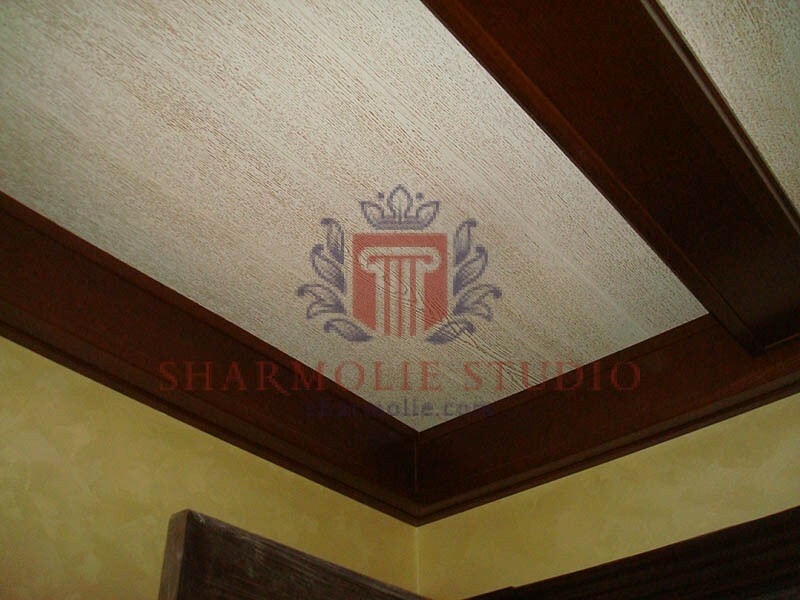 Toning is designed to emphasize the color of wood and highlight its rich texture. 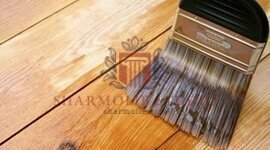 Varnishing doesn’t only helps decorate the surface, but also ensure that the product will be protected from external influences and humidity. 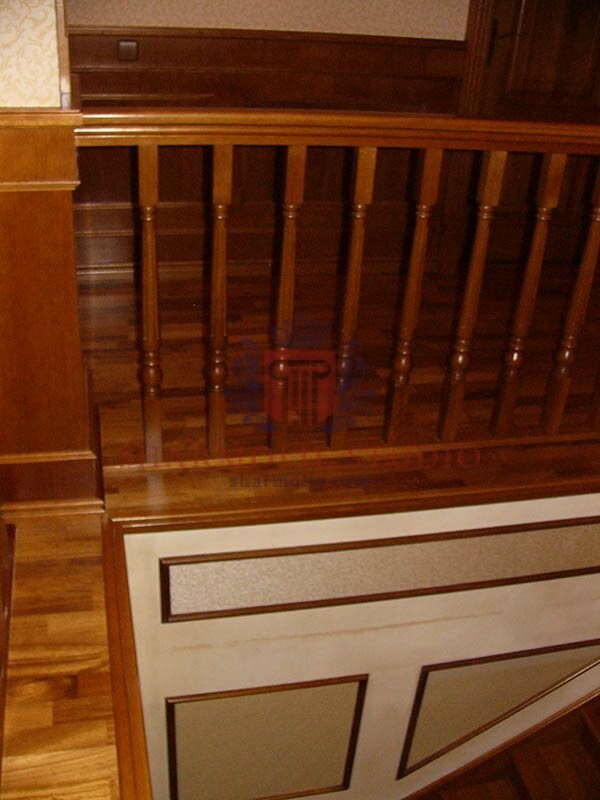 If all three of these procedures are performed correctly, the wood will become even more beautiful and enhance its protective qualities. 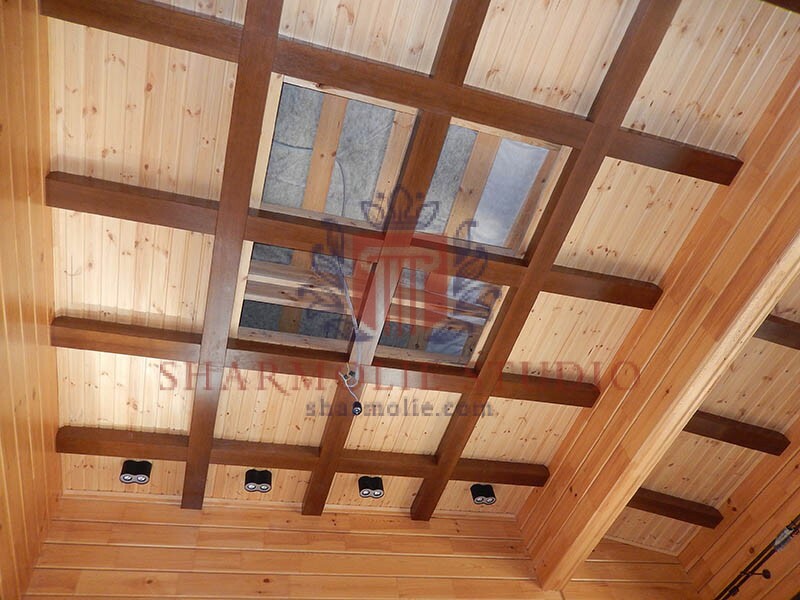 Over the years, we have become convinced that our experts are good at working with wood and discover the full potential of such material. 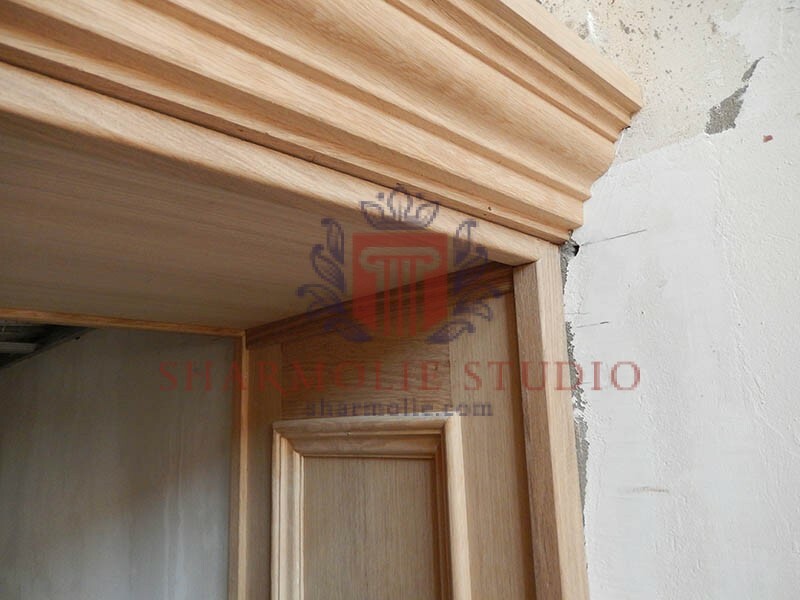 When you work with solid wood, create from it decor elements, interior arches or portals, there is always a question about which glue to use. 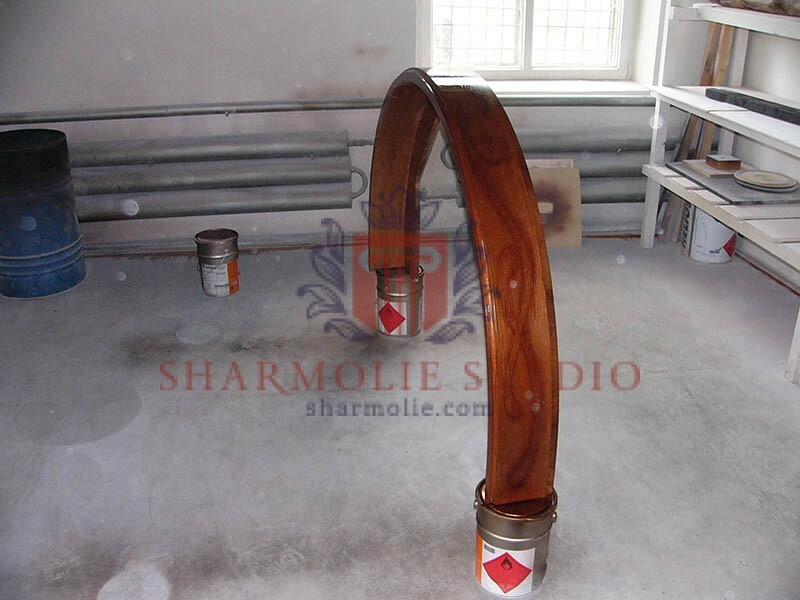 Many customers have the wrong idea of glue, as a short-lived composition that does not withstand the loads. 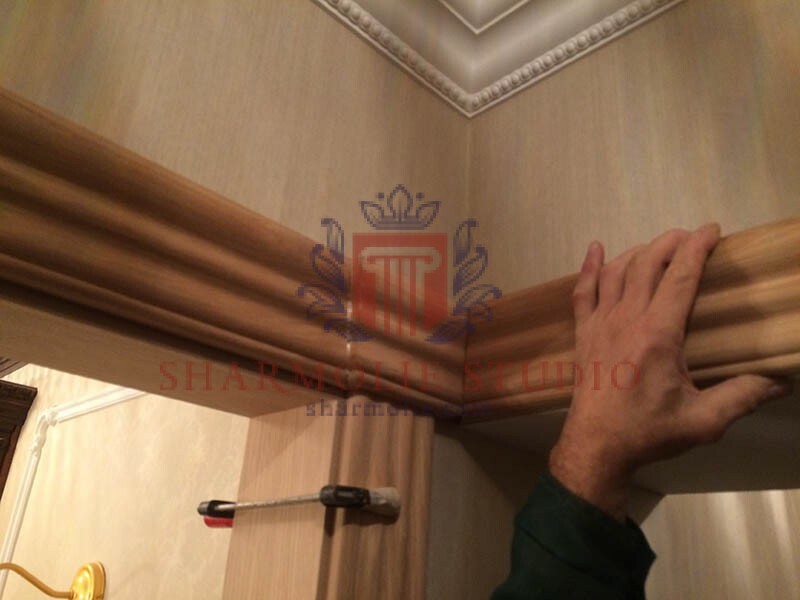 In a professional environment, a completely different adhesive is used, providing a strong grip. 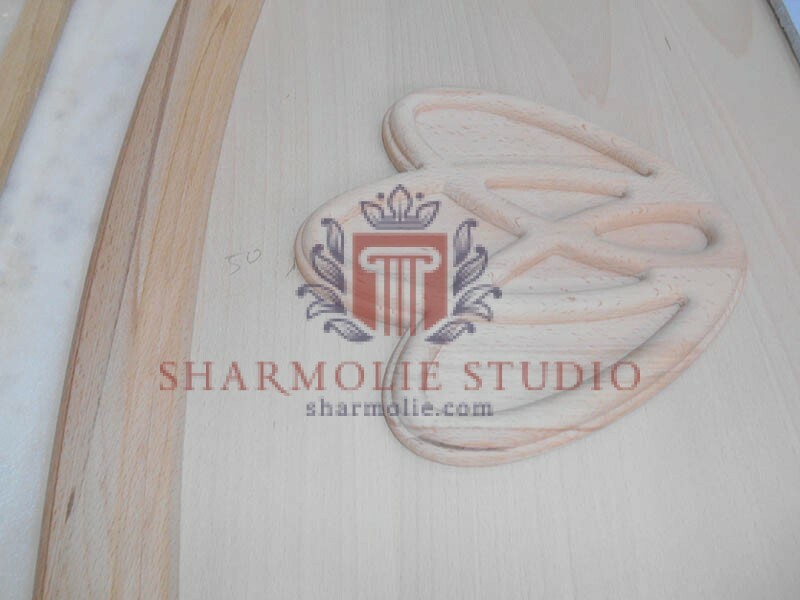 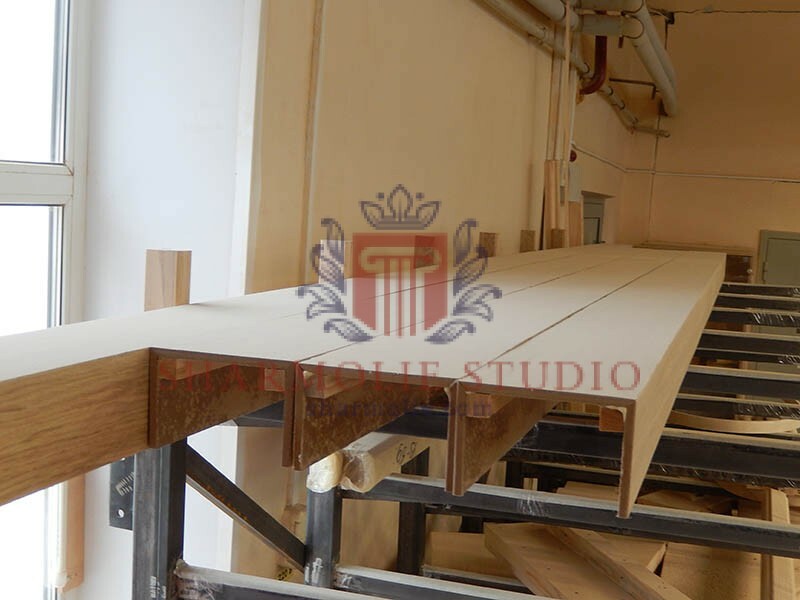 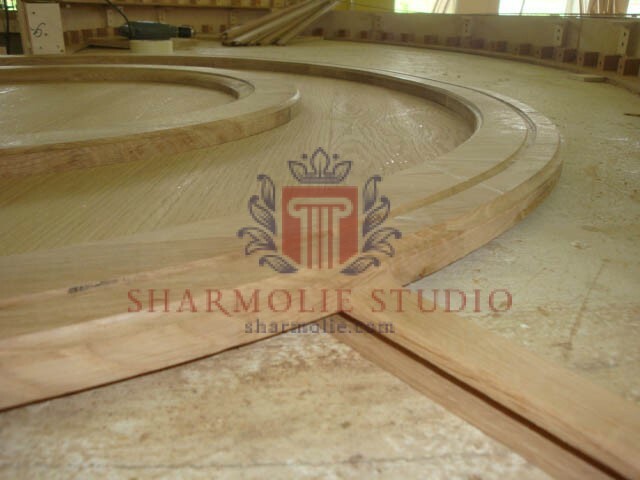 For a long time We were choose a suitable variant of glue for the work with wood for . 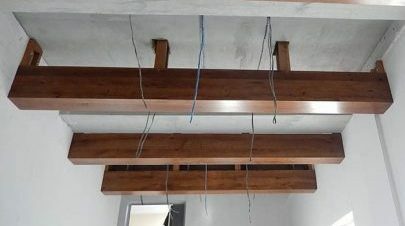 It was necessary to have a composition that not only firmly connects parts of the structure, but also differs in safety, withstands a prolonged external impact. 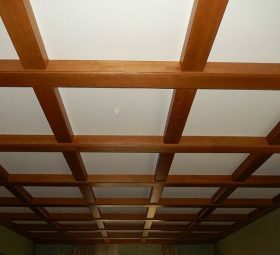 In the end, we found such a solution. 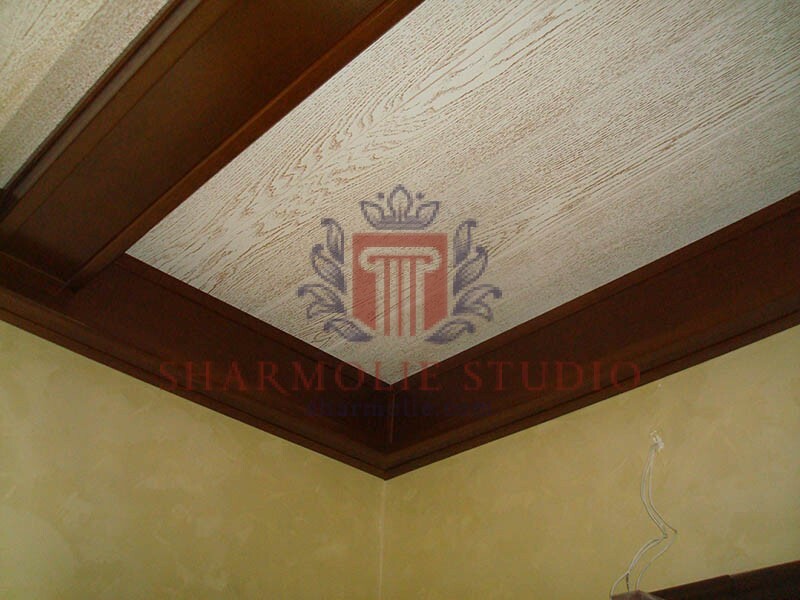 Our glue shows good adhesion to the surface and remains completely safe. 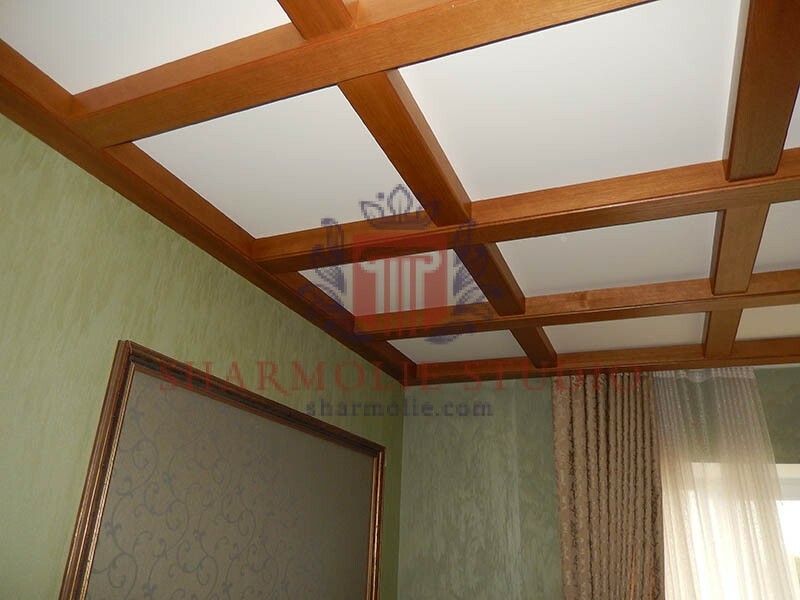 You can don’t worry - no harmful fumes or unpleasant odor in the room with our products will not be. 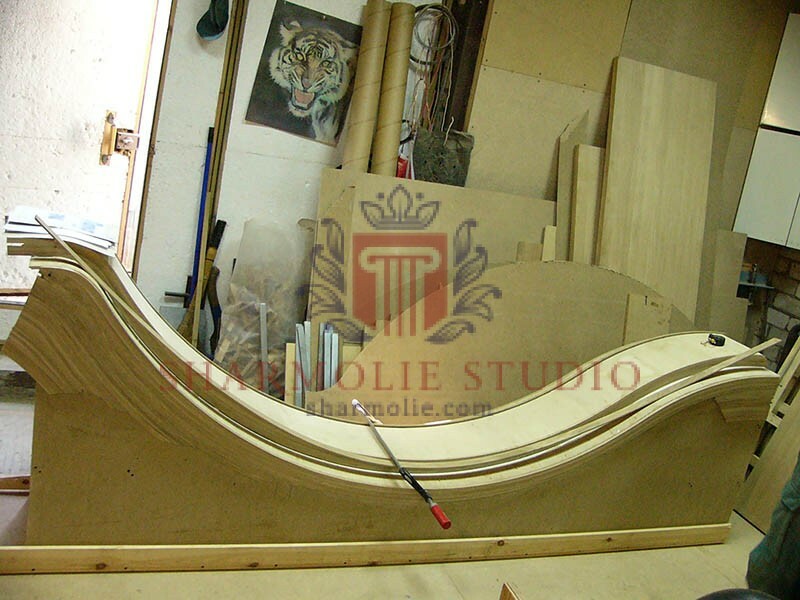 Another important detail - we know how to work with glue. 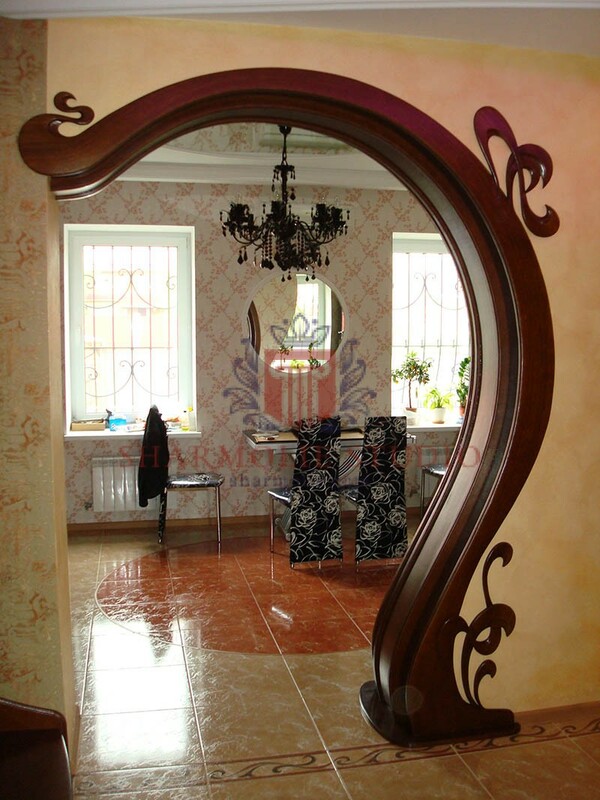 This means that from the side you will not notice any traces of its application. 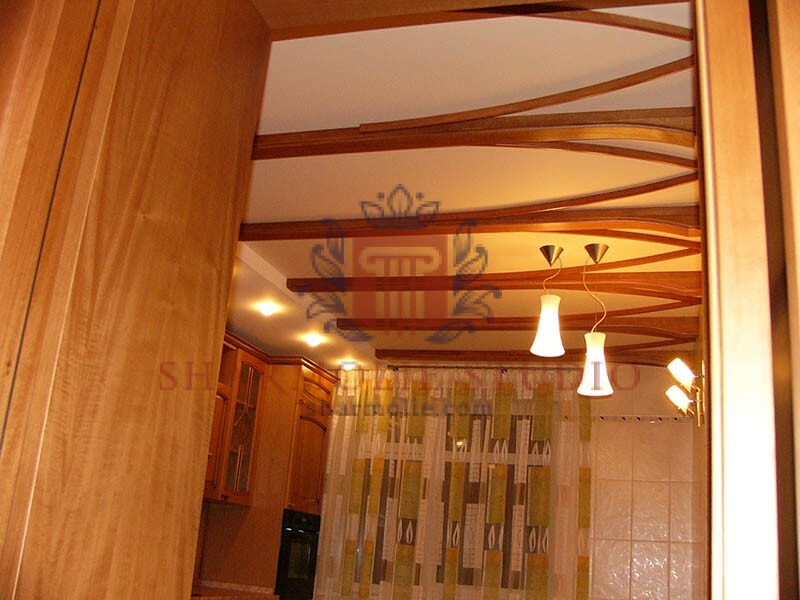 It's about streaks and divorces, which often remain when the application is sloppy. 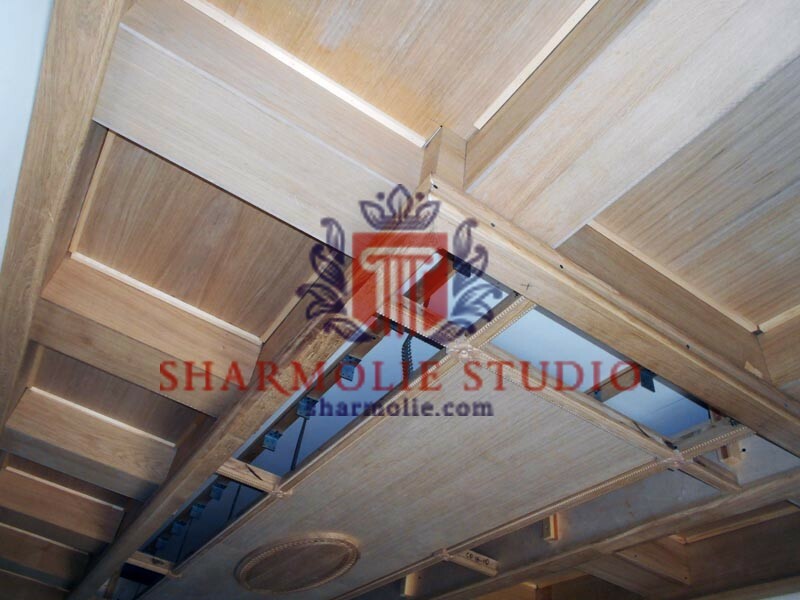 The composition chosen by us allows us to create strong structures. 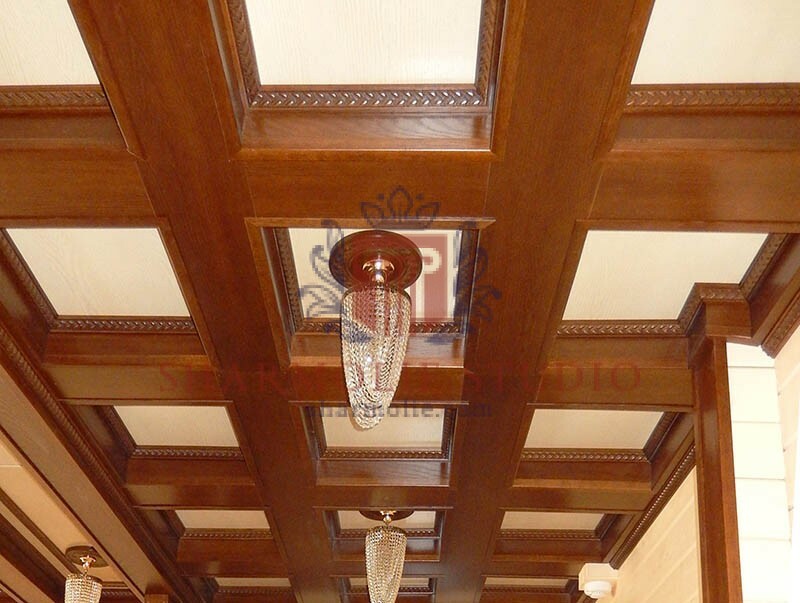 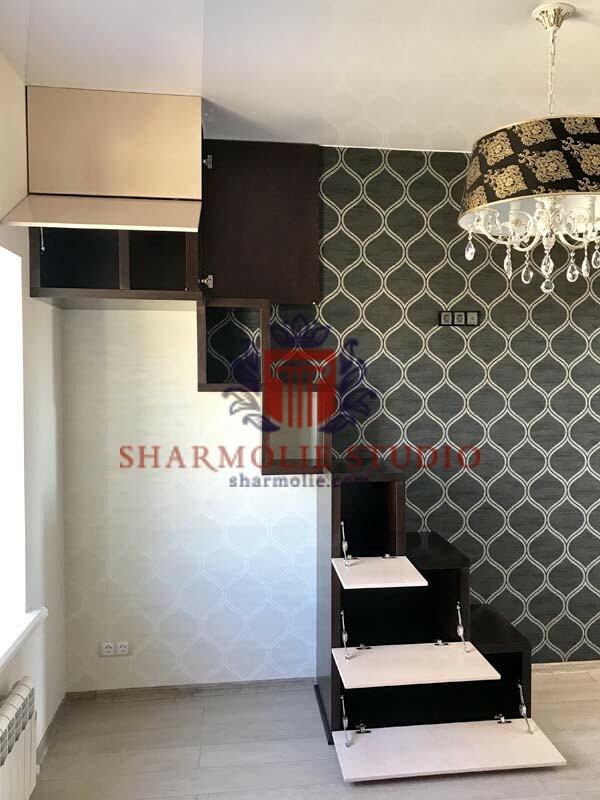 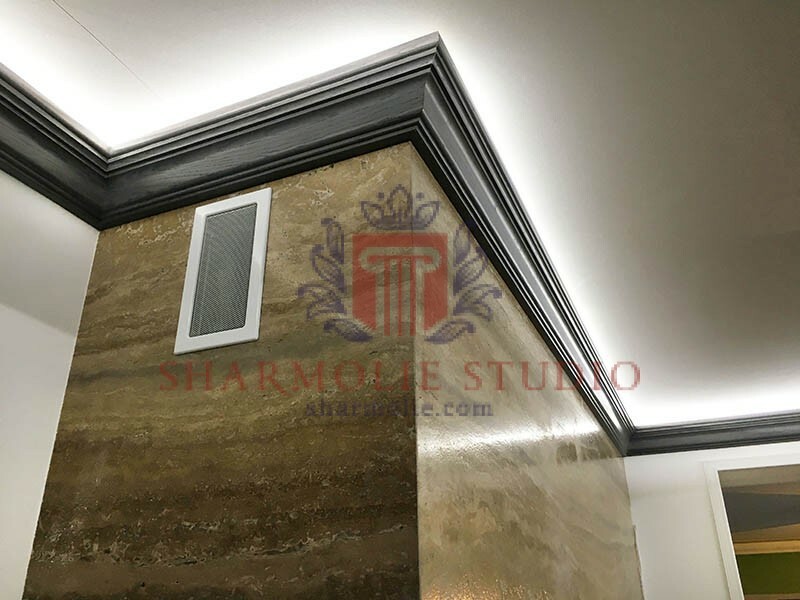 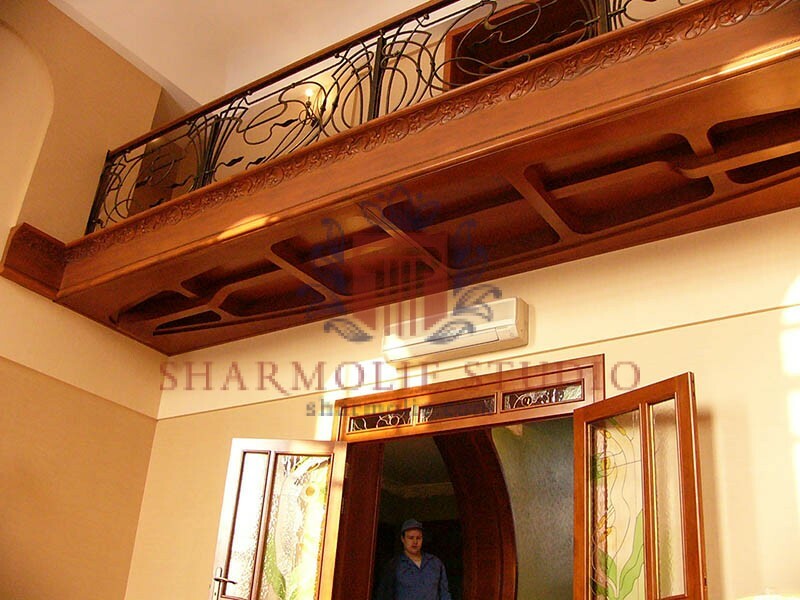 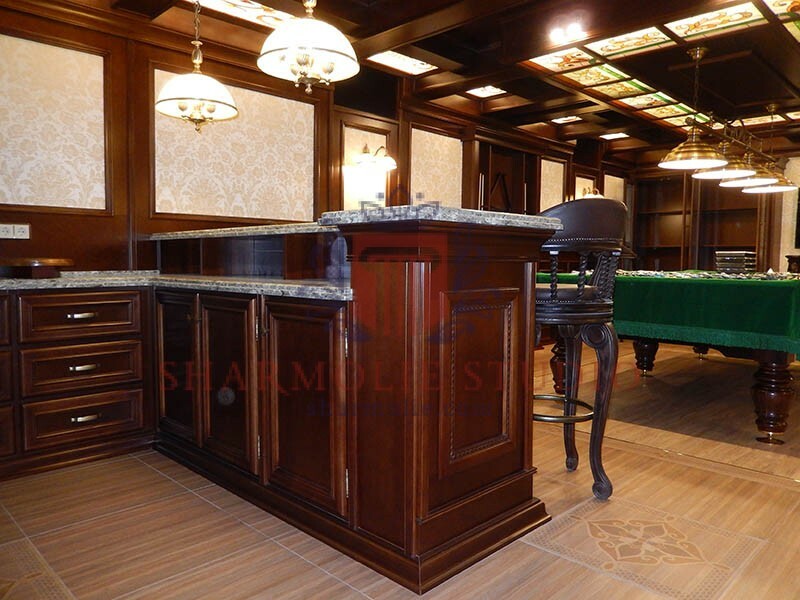 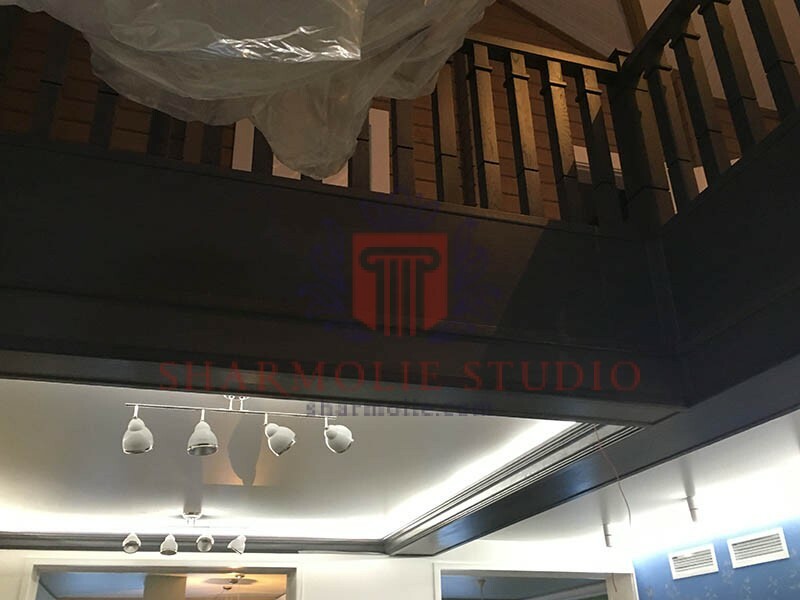 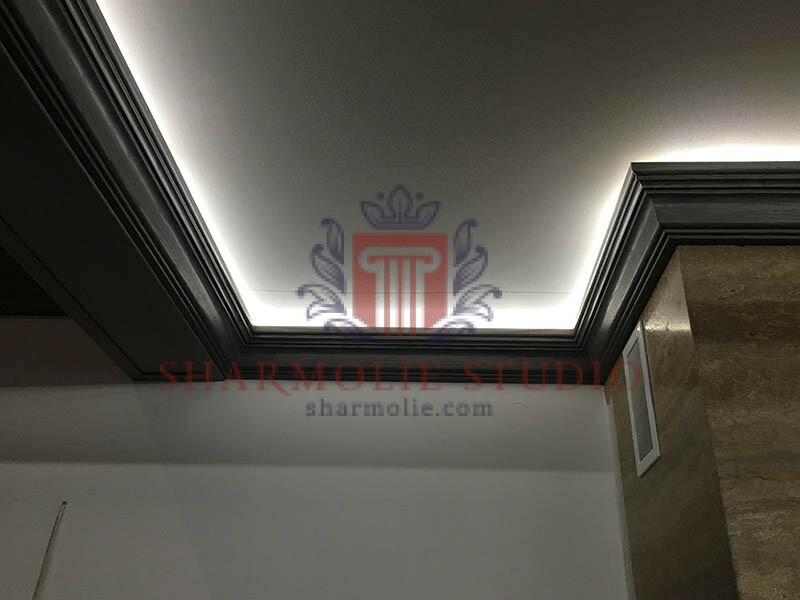 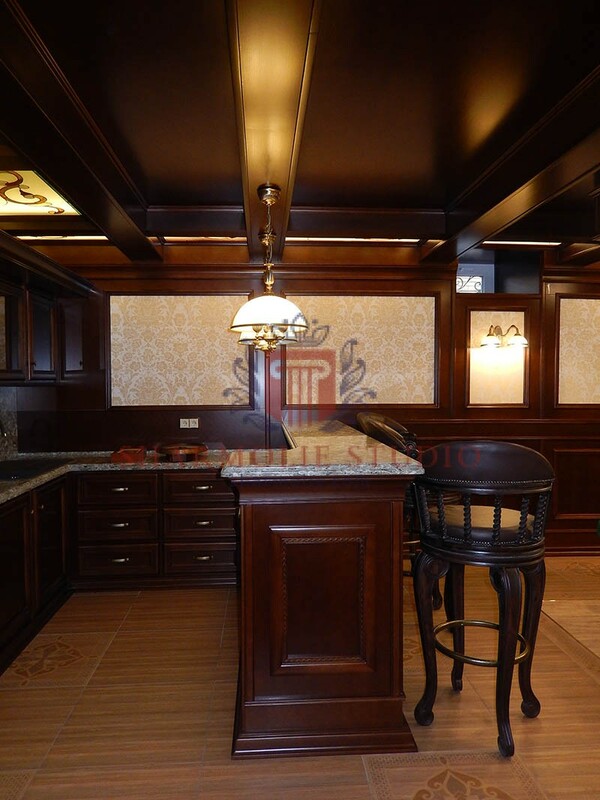 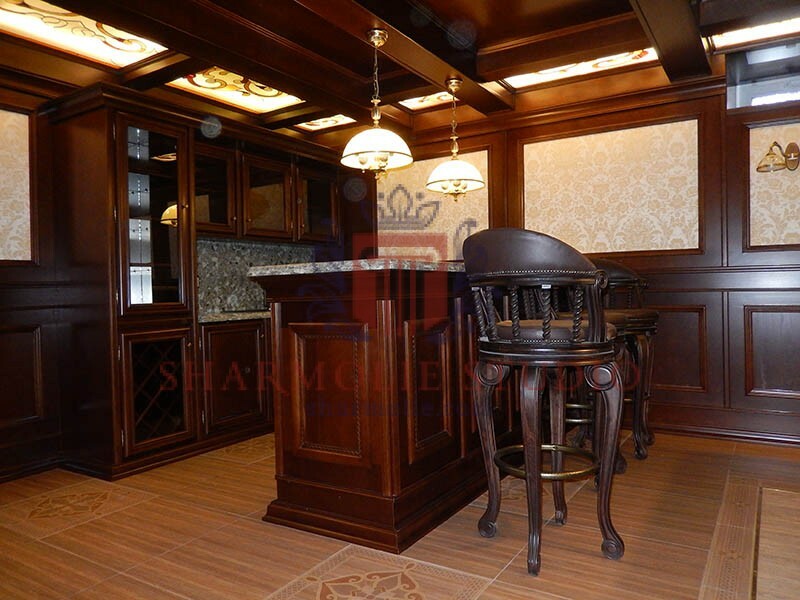 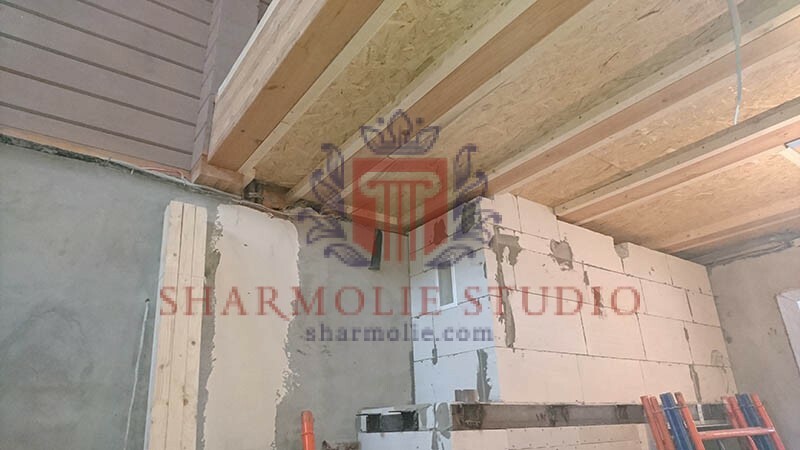 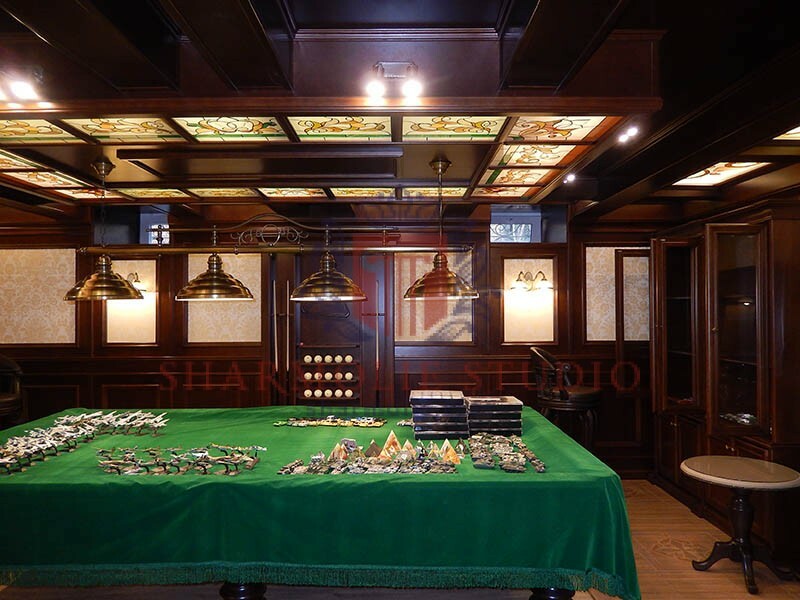 This is confirmed by the experience of many of our customers who continue to rejoice at the high level of quality of the elements created in the interior. 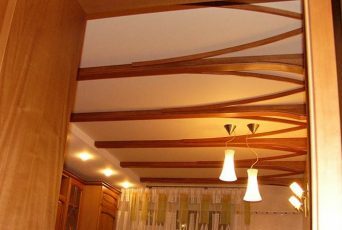 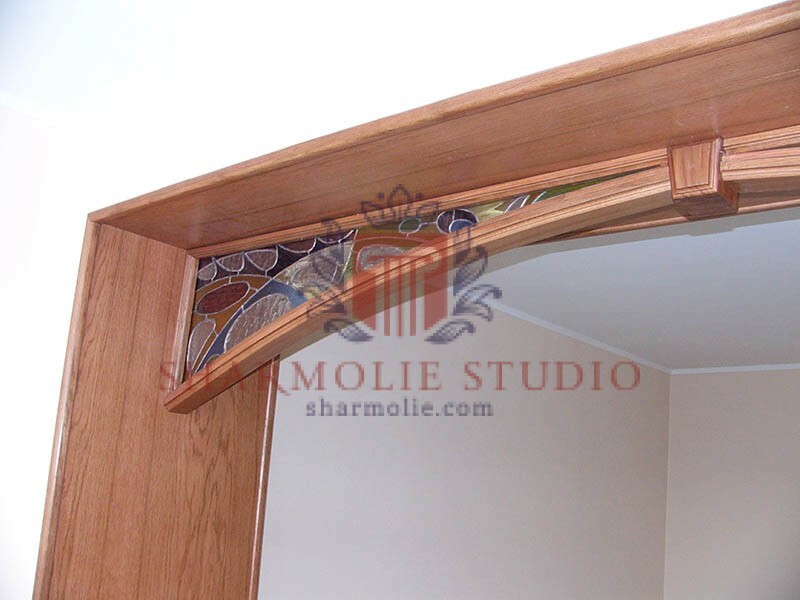 When you works with wood, created from it decor elements, interior arches or portals, there is always a question about which glue to use? 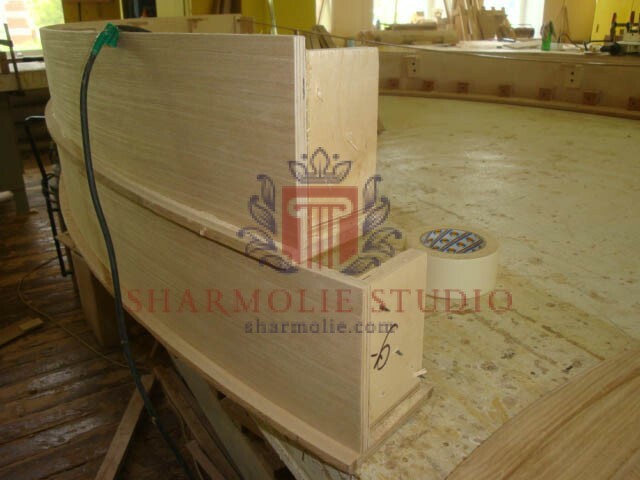 Many customers think that glue doesn’t has toughness, but this is not so. 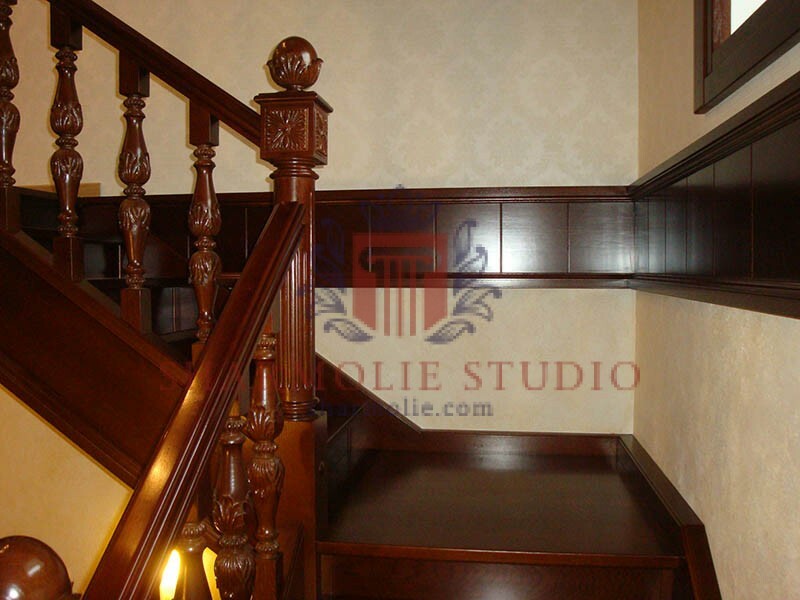 Glue in the professional environment has very a strong grip has very a strong grip. 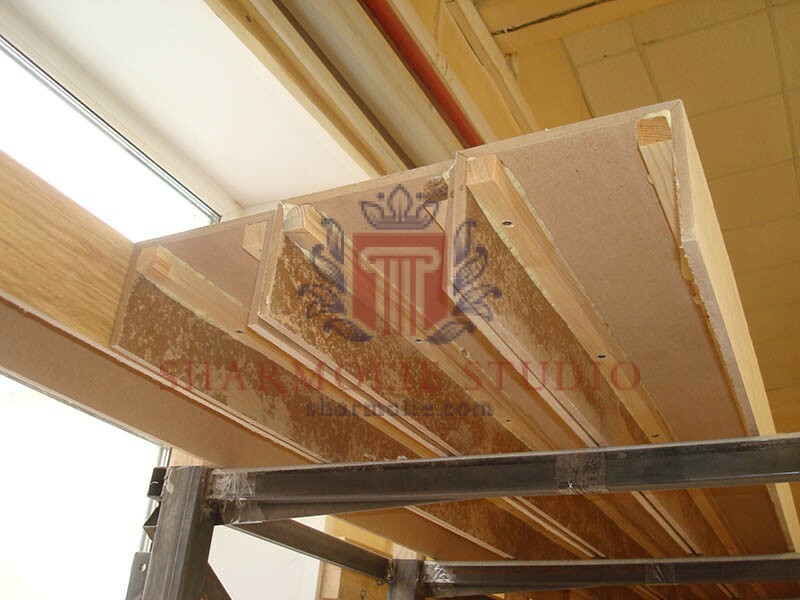 For a long time we were choose a suitable variant of glue for the work with wood. 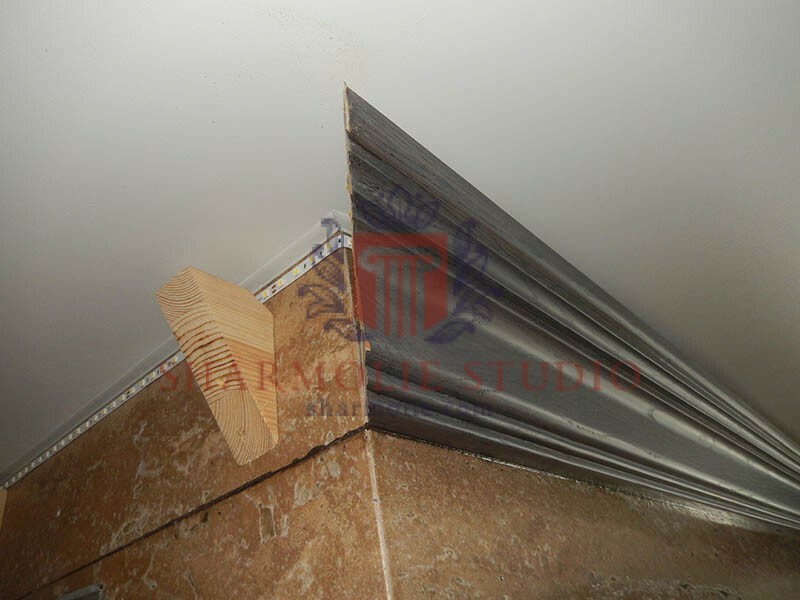 It was necessary to have a composition that not only firmly connects parts of the structure, but also differs in safety, withstands a prolonged external impact and in the end we found such a solution. 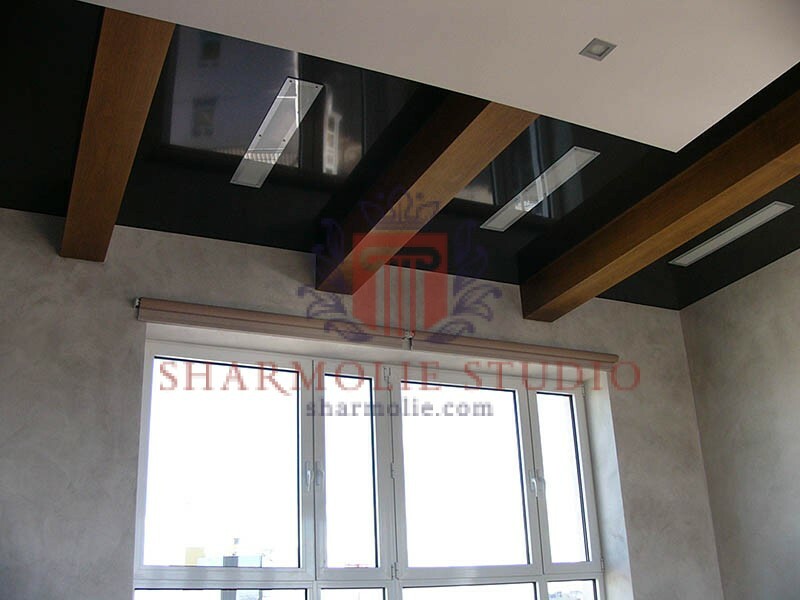 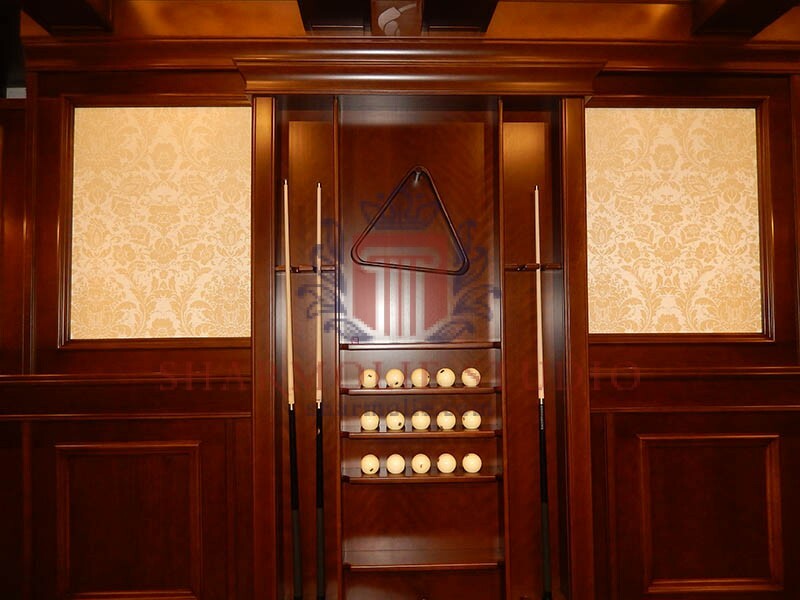 You can don t worry, no harmful fumes or unpleasant odor in the room with our products will not be. 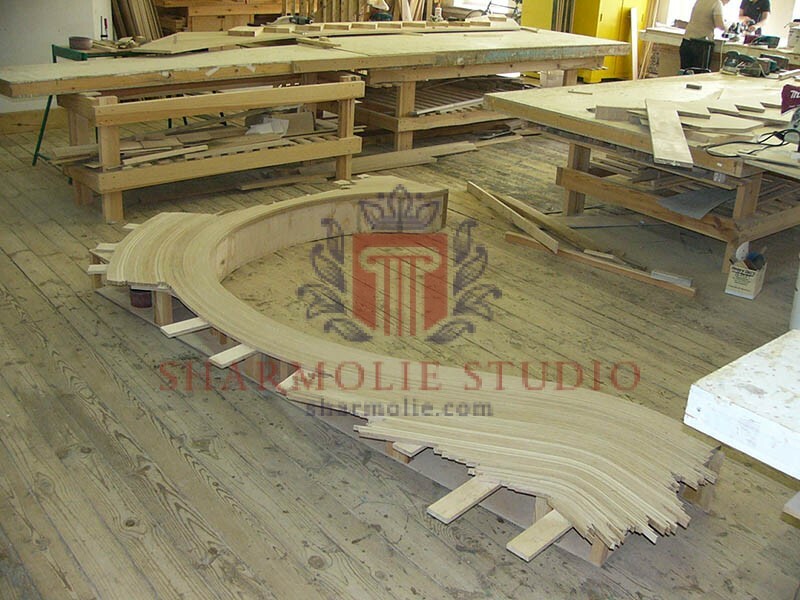 We knows how to work with glue! 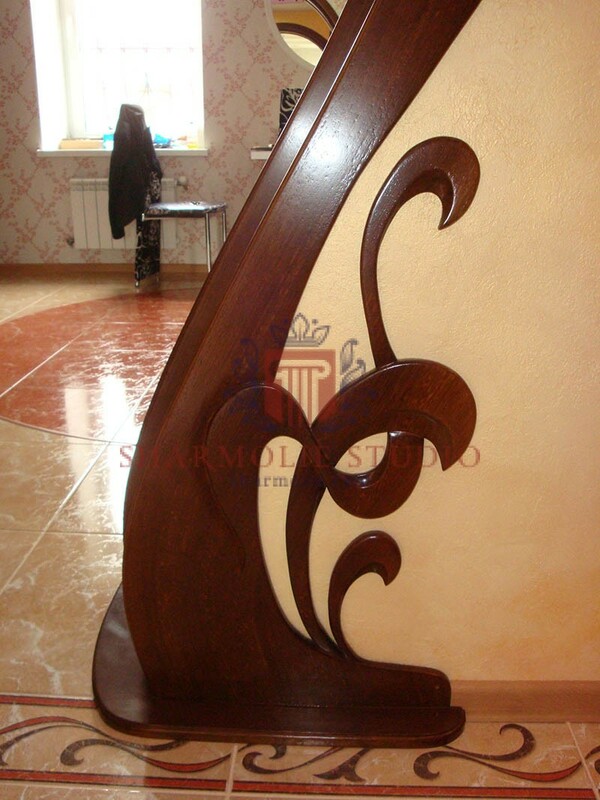 This means that from the side you will not notice any traces of its application. 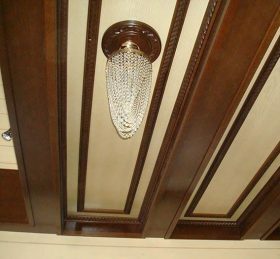 It's about streaks and divorces, which often remain. 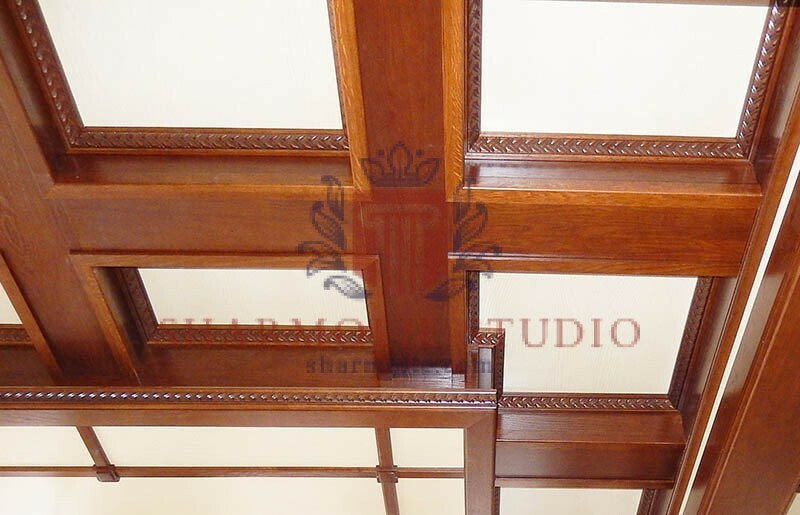 The composition chosen by us allows us creating lasting structures. 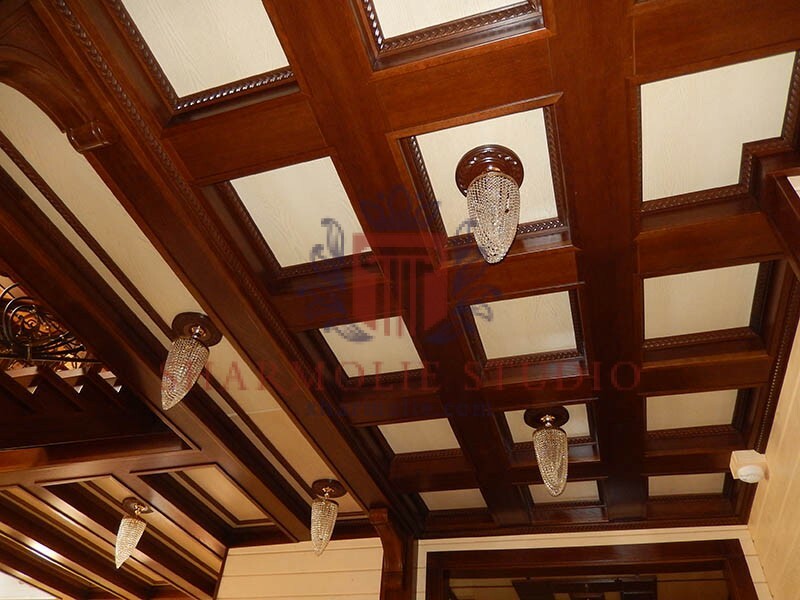 This is confirmed by the experience of many of our customers who continue to rejoice at the high level of quality of the elements created in the interior. 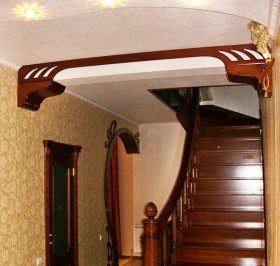 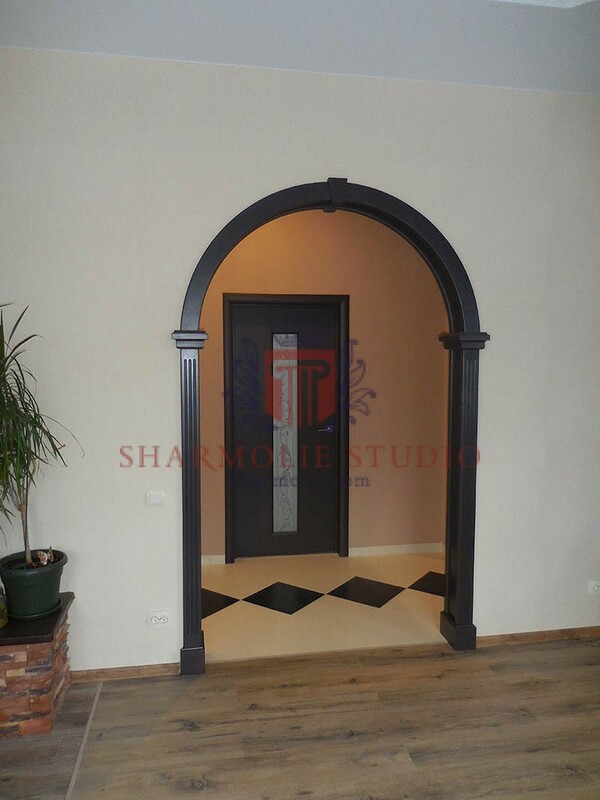 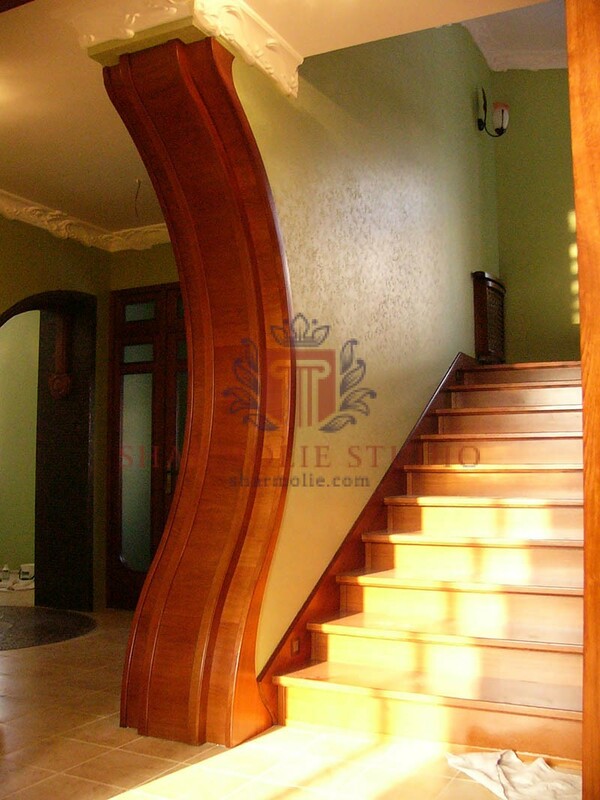 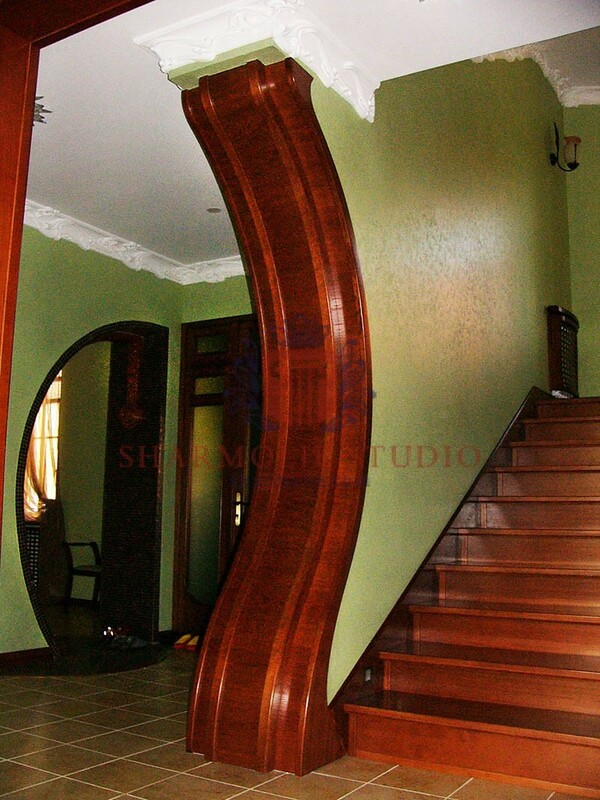 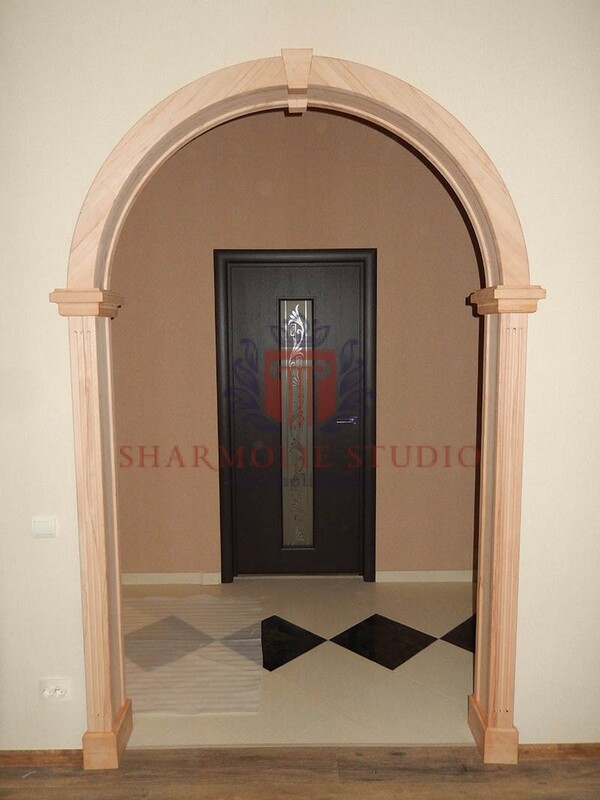 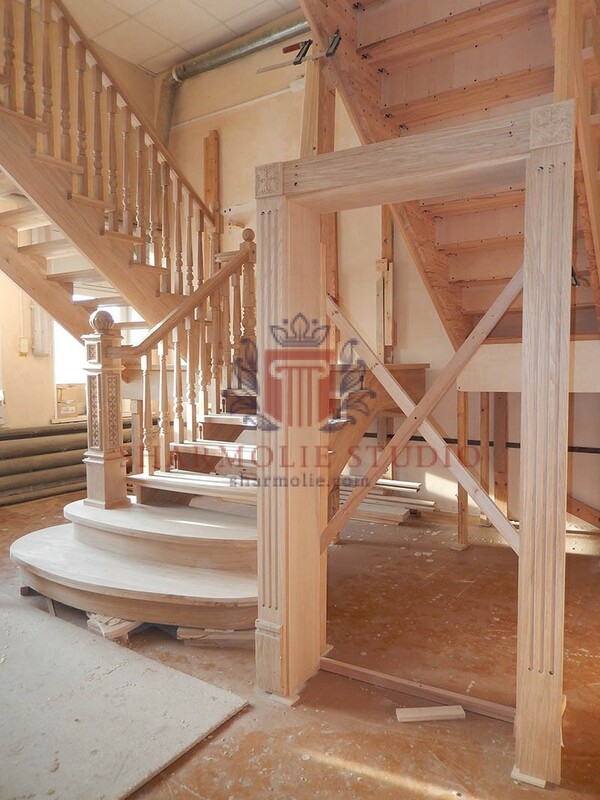 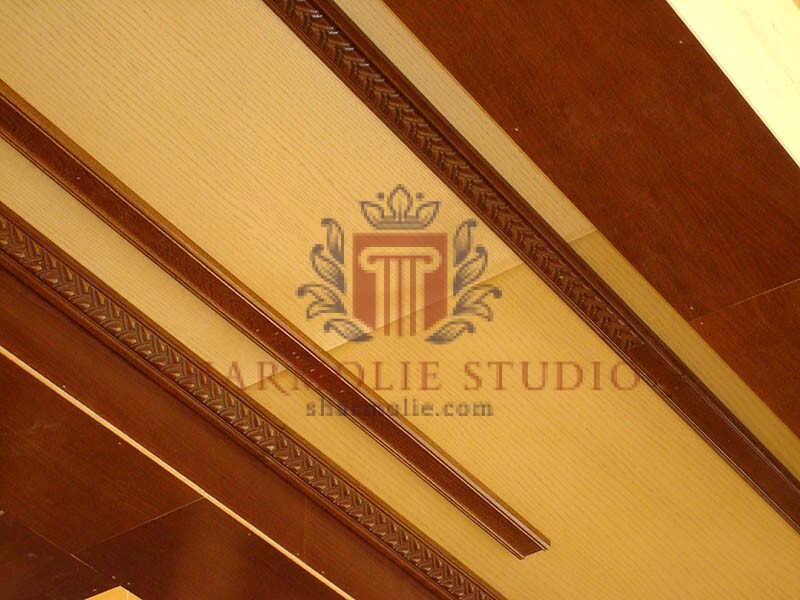 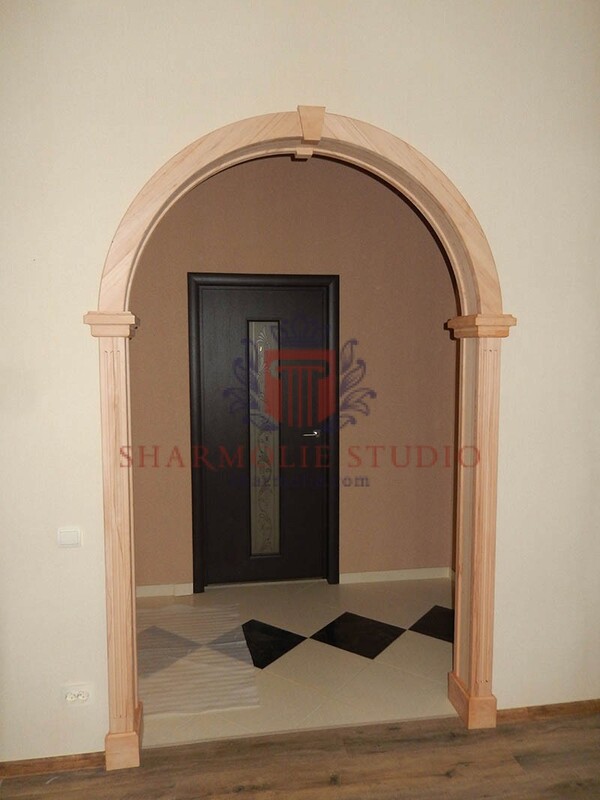 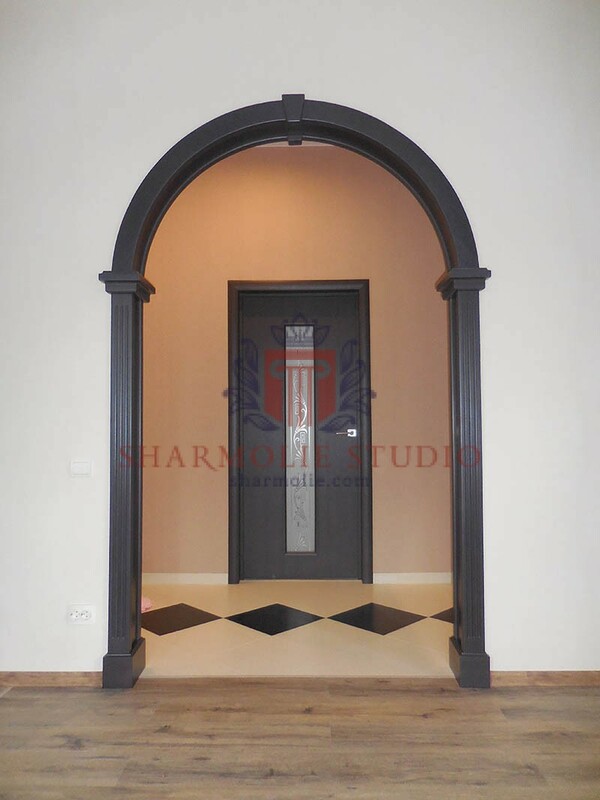 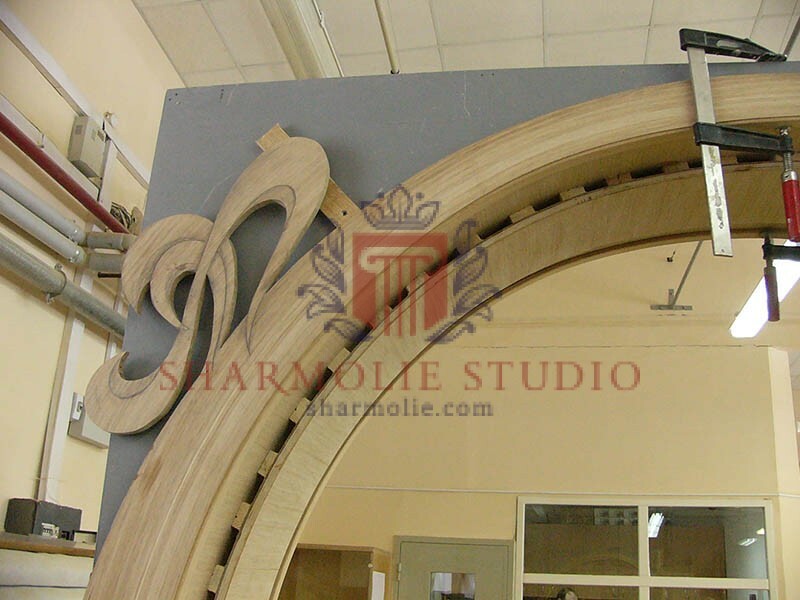 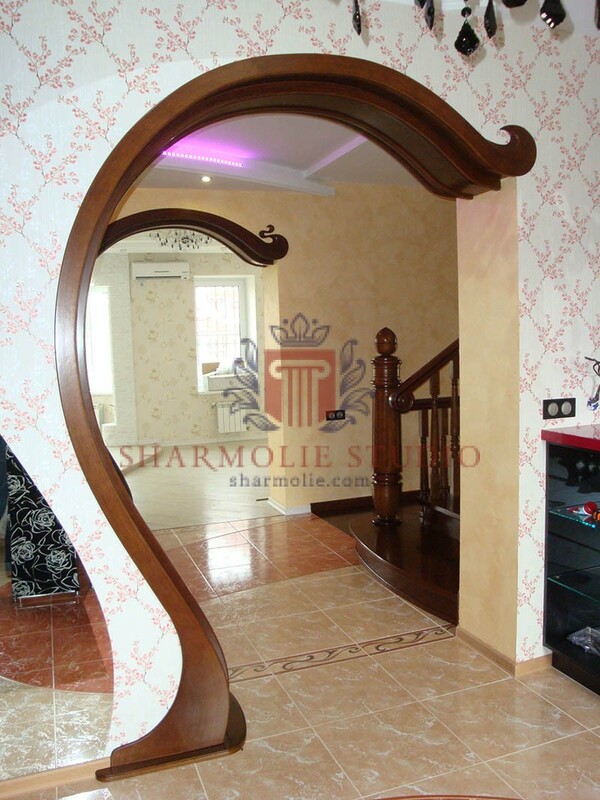 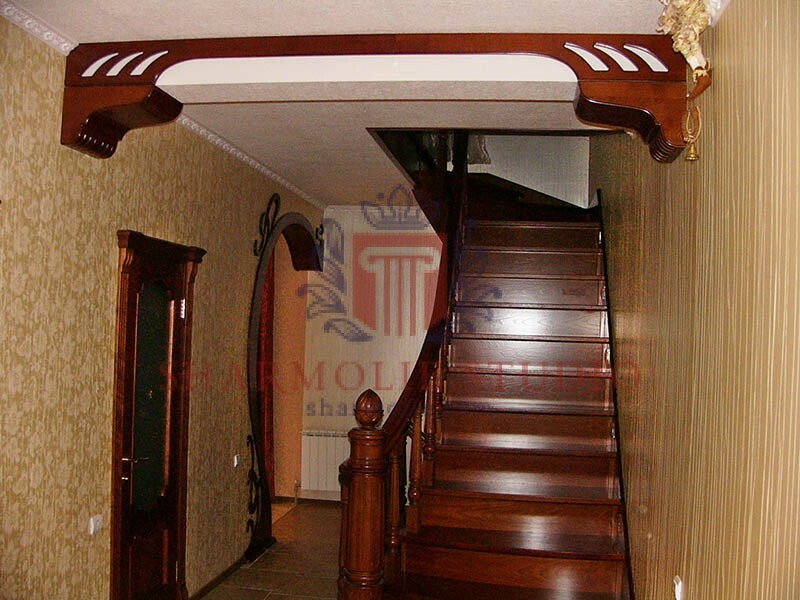 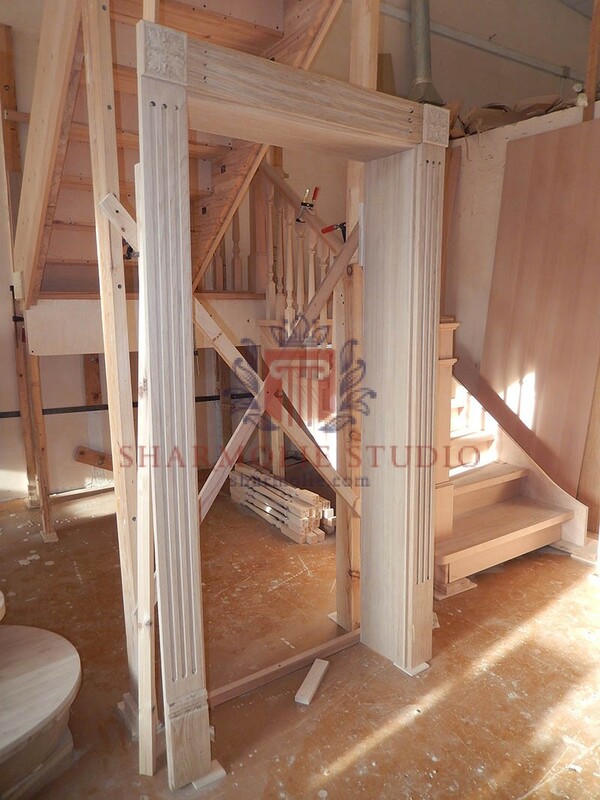 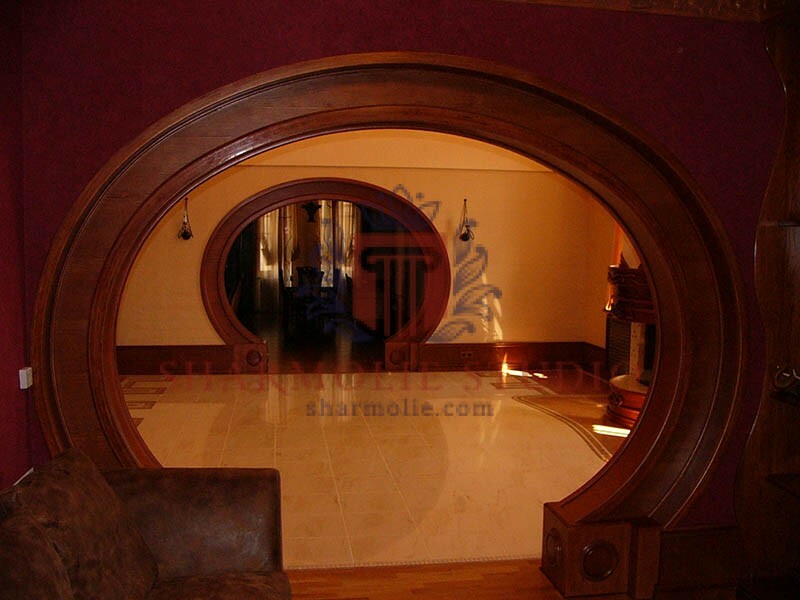 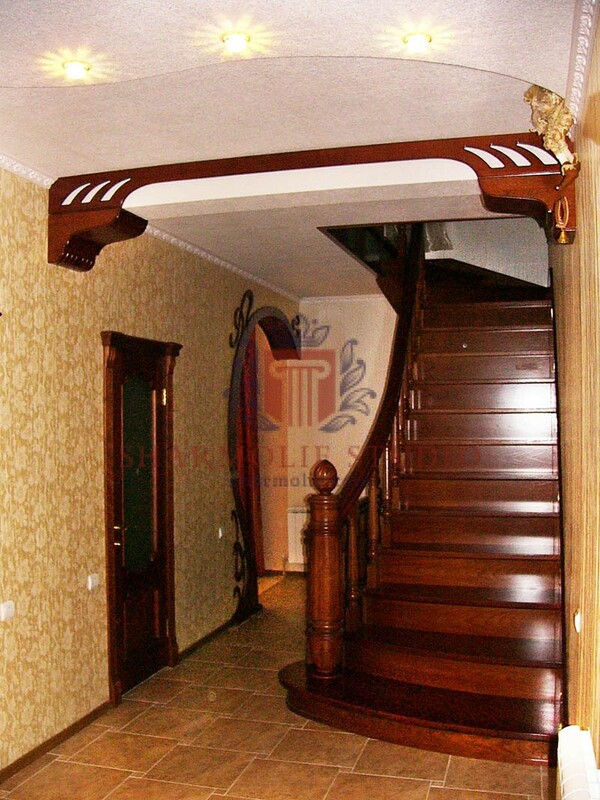 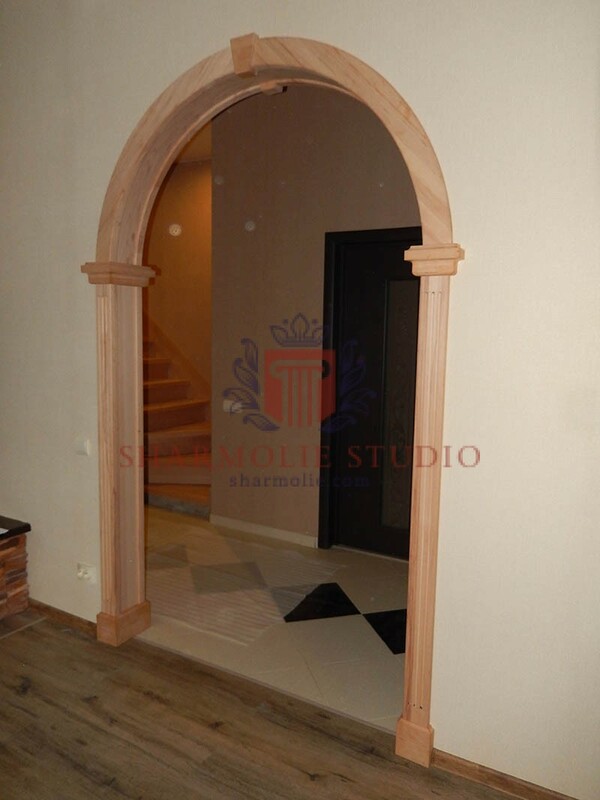 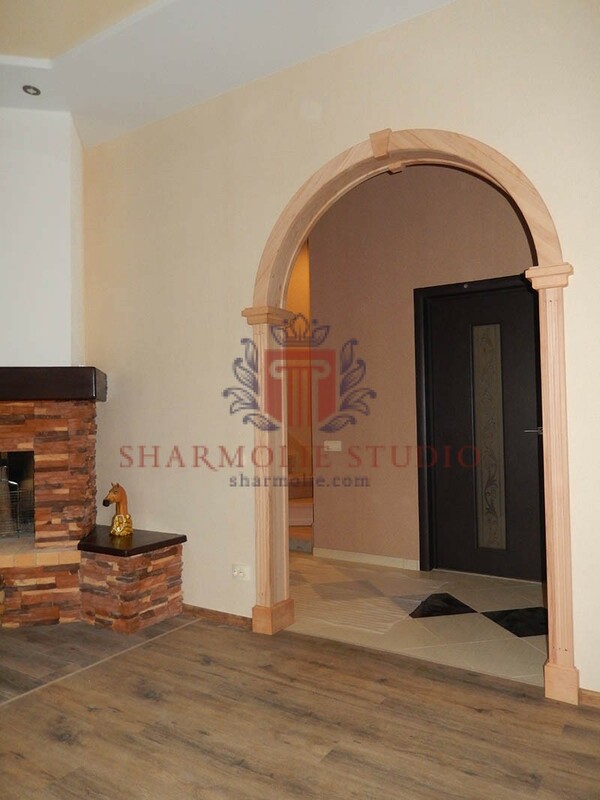 When customers look at our products - interior arches and portals, wooden interior elements and stairs, they often ask the question - how does it work? 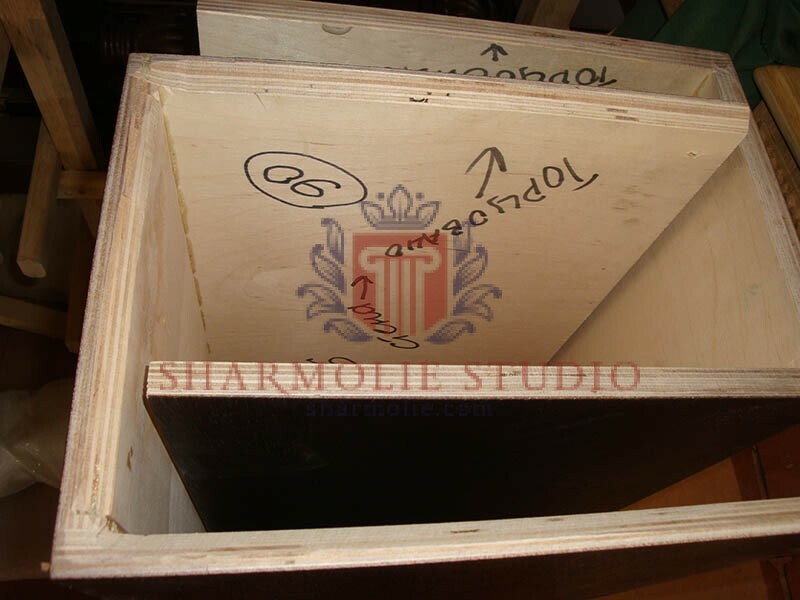 And when we hear such a question, we immediately understand that our masters worked well again. 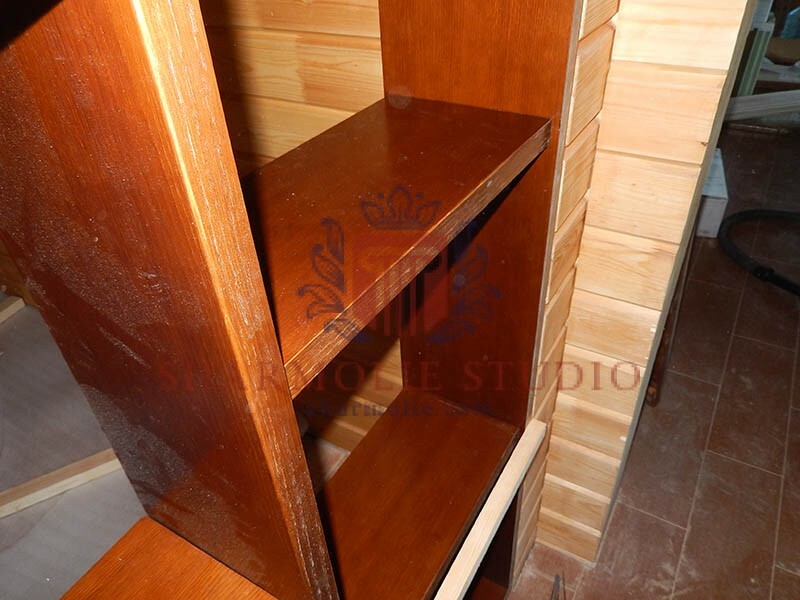 The thing is that fasteners of our wooden items are hidden. 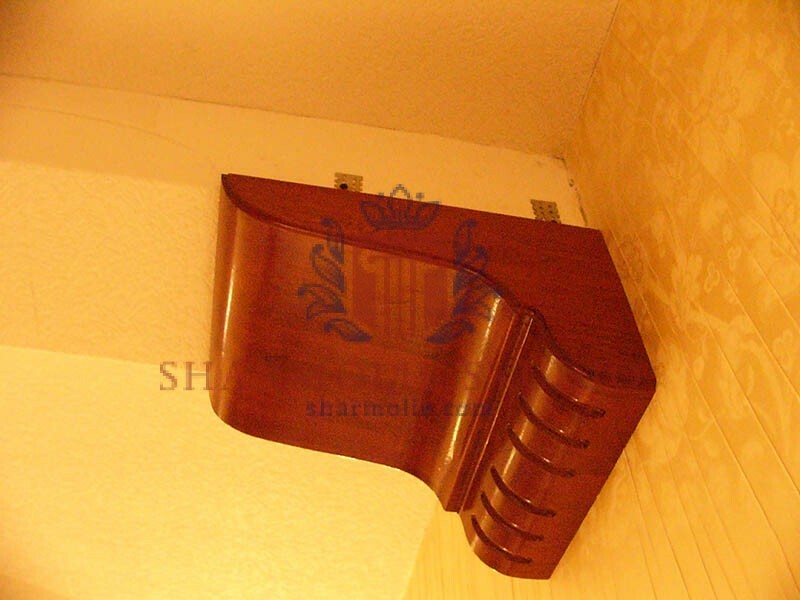 A large number of special metal fasteners can be added, you never realize they are in. 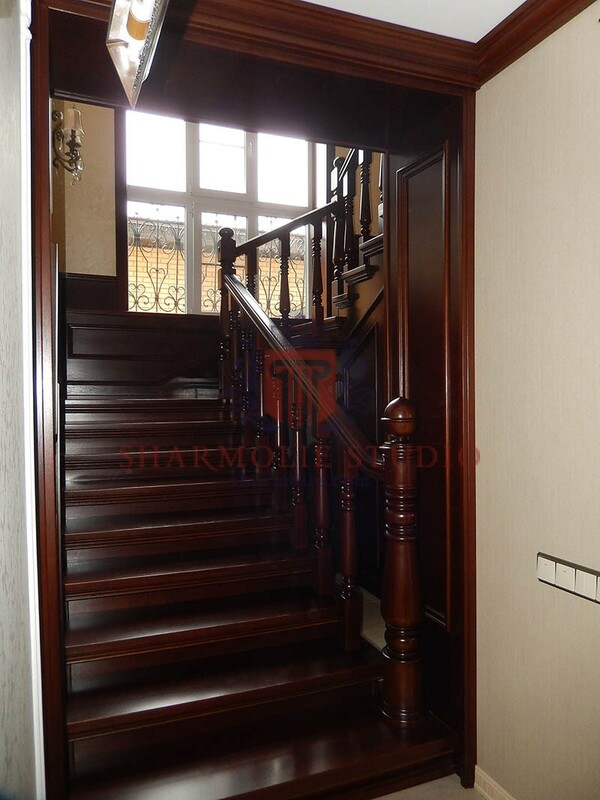 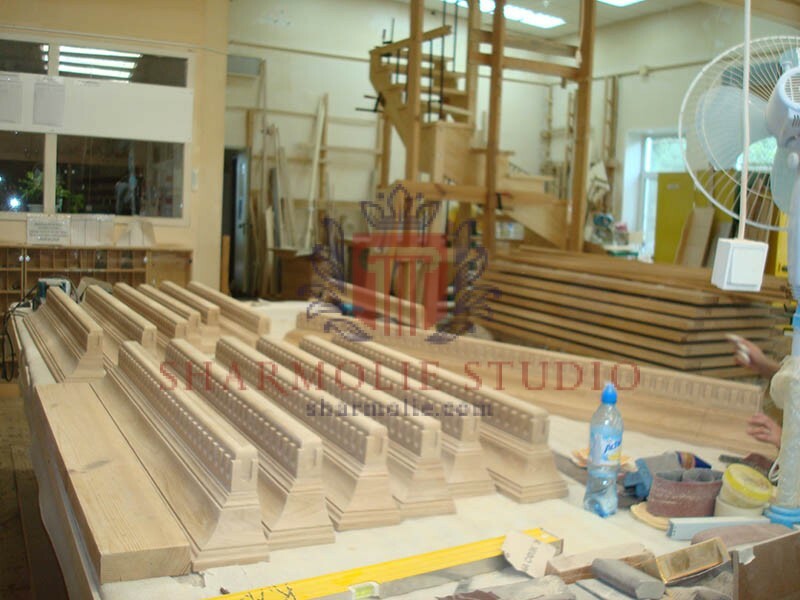 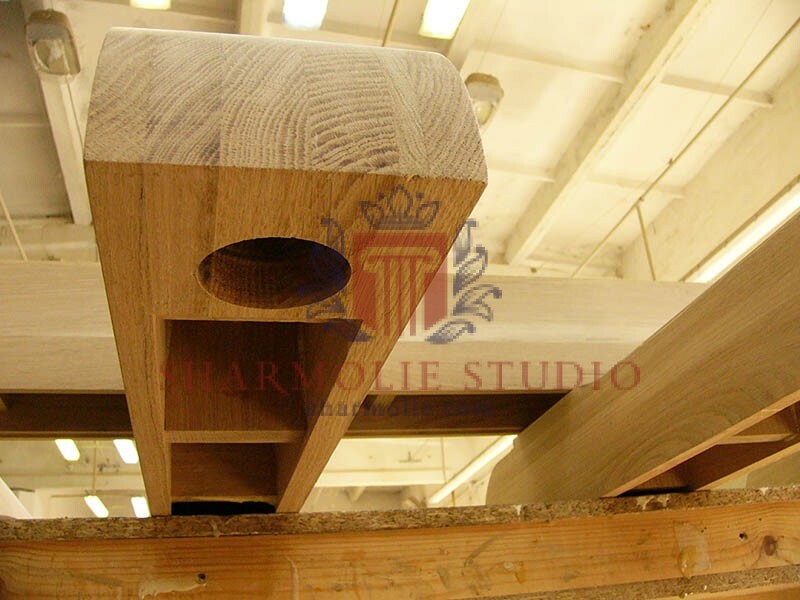 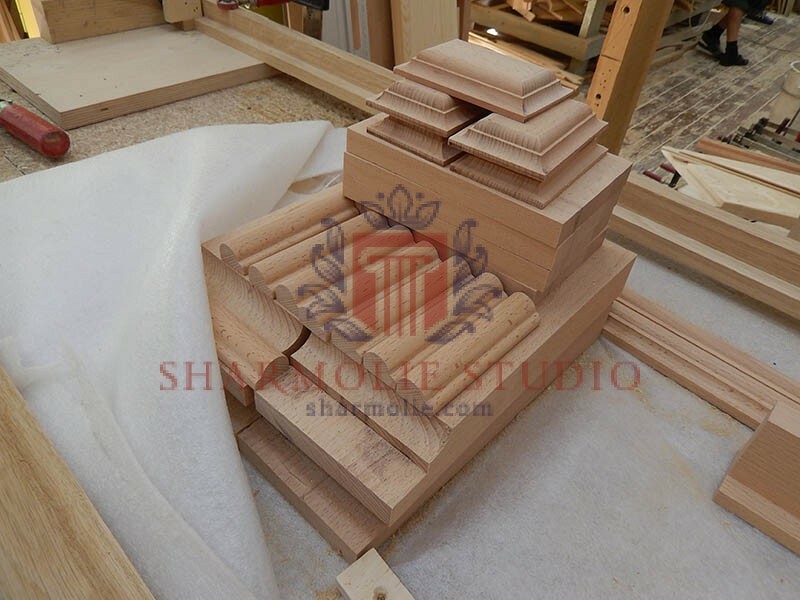 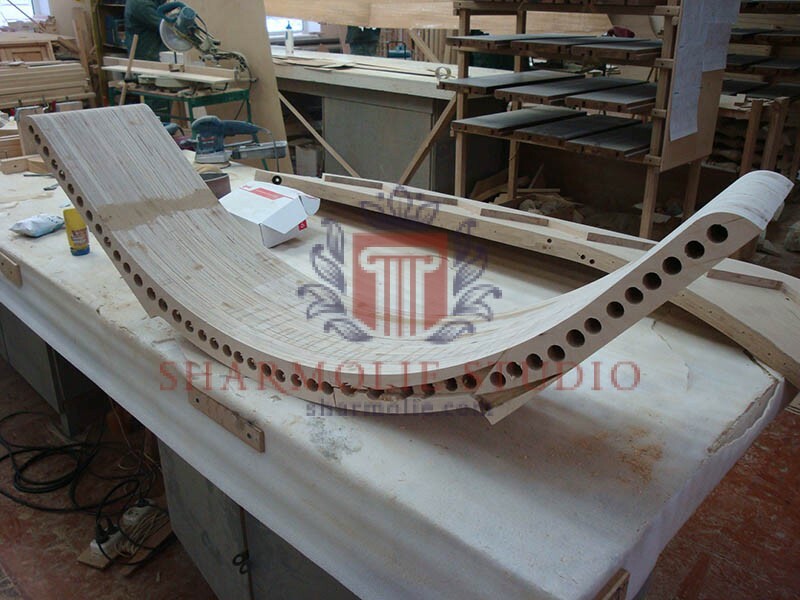 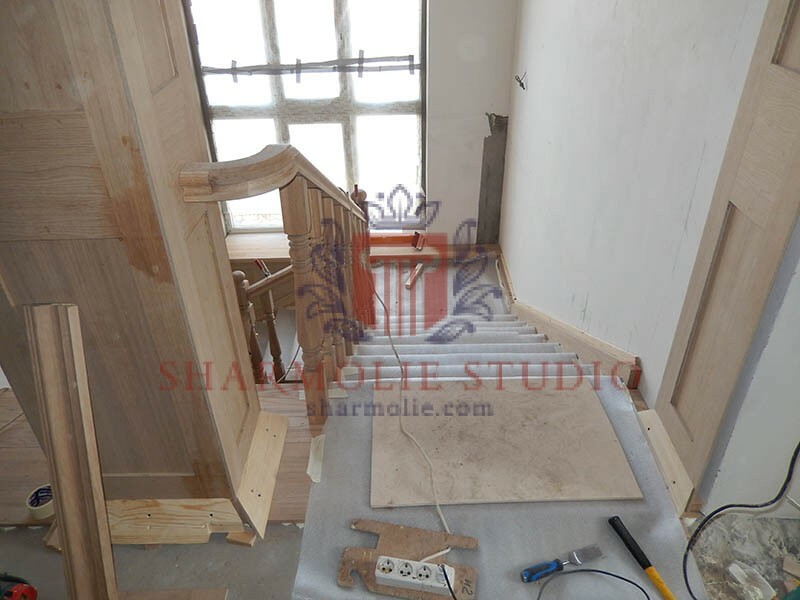 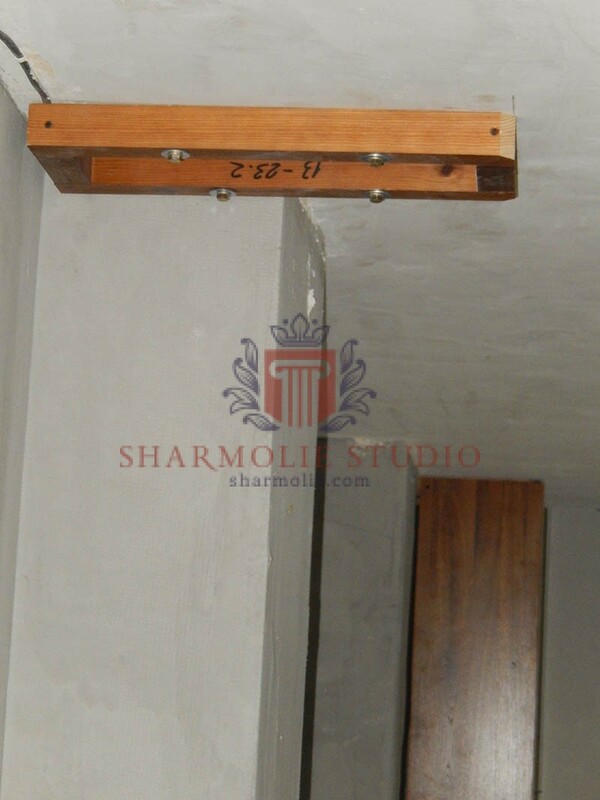 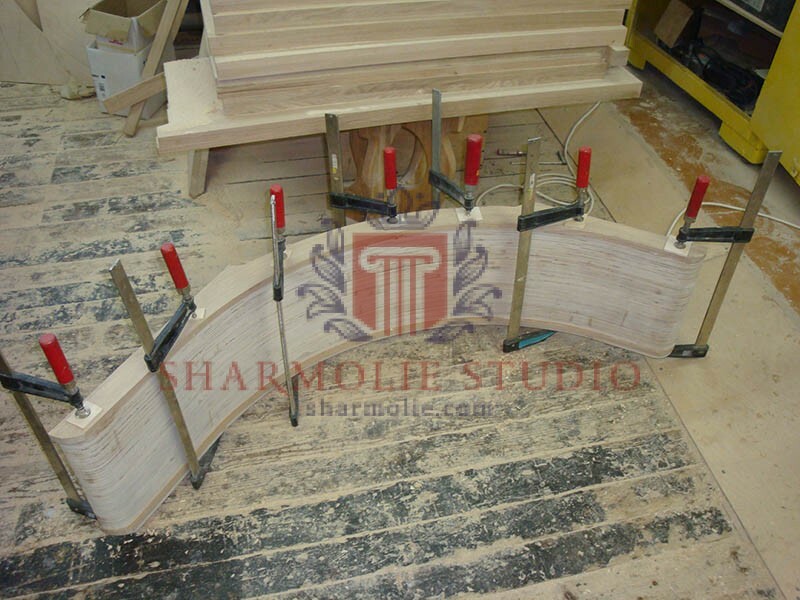 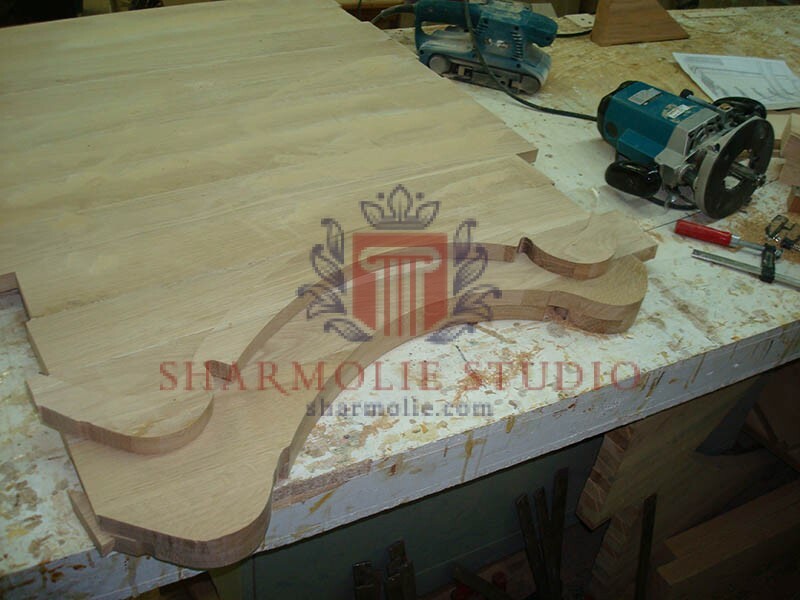 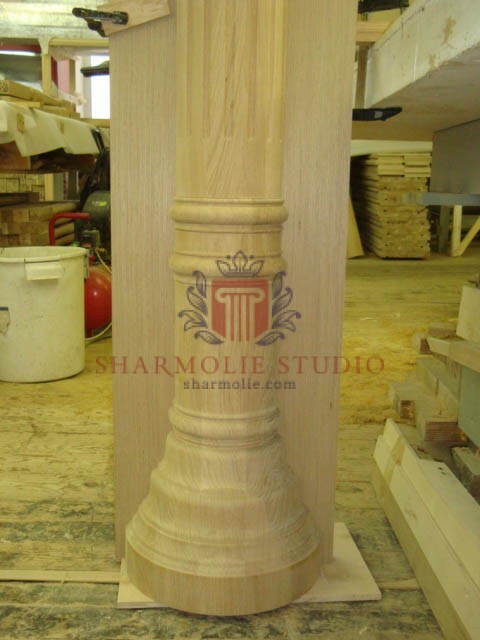 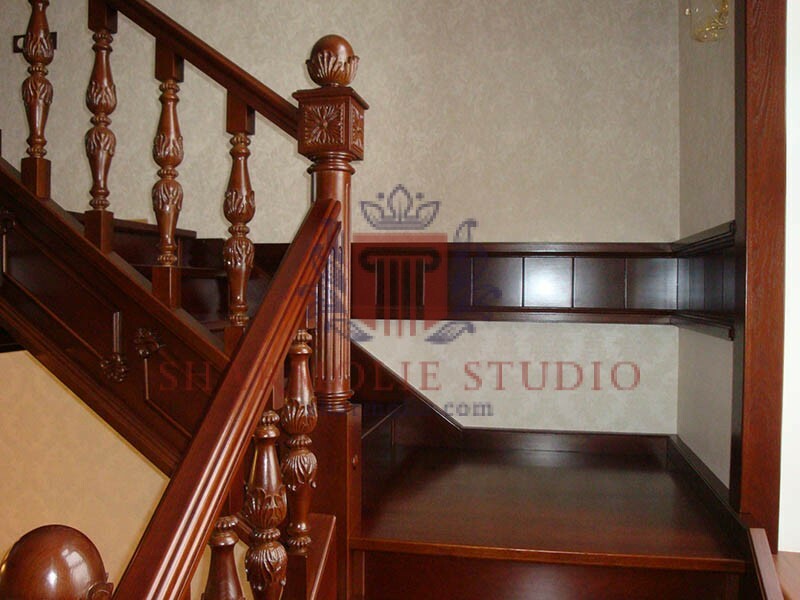 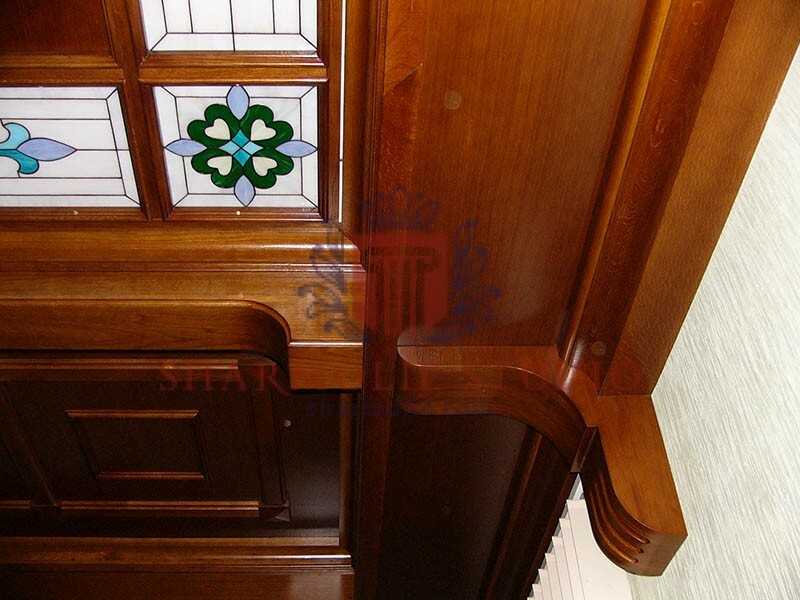 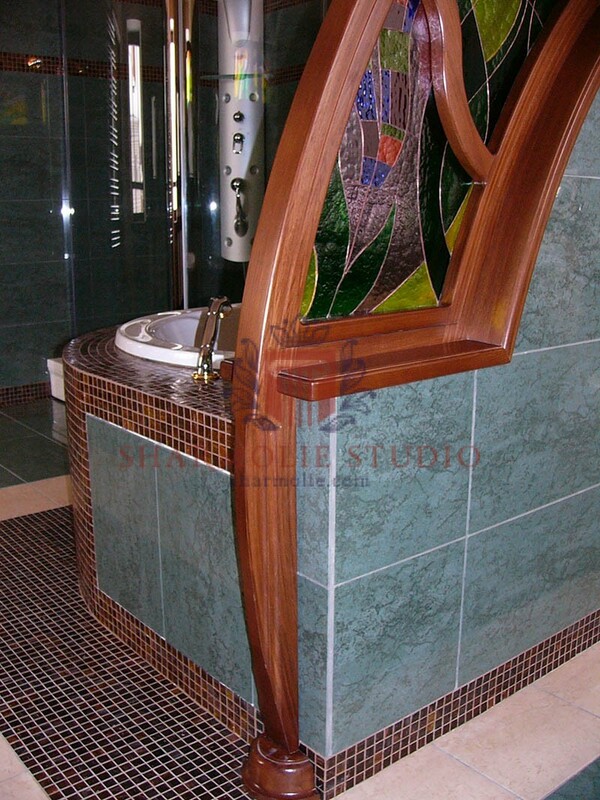 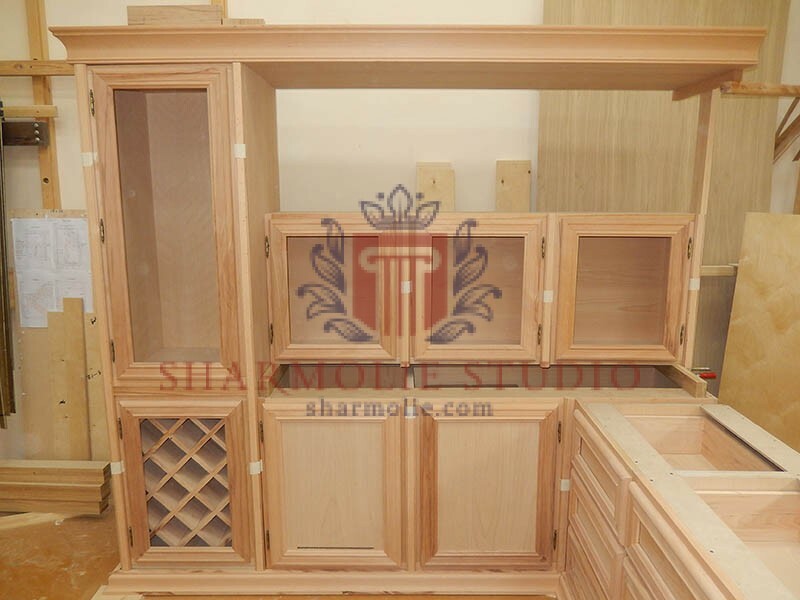 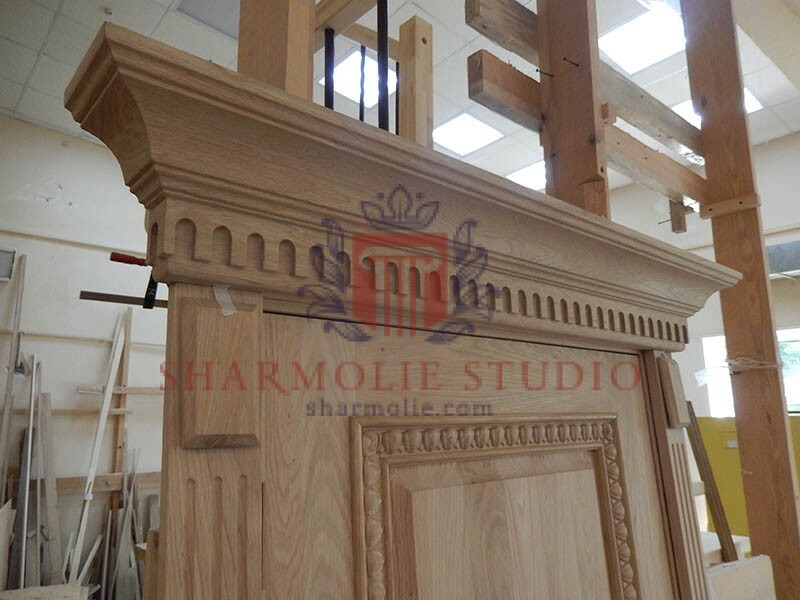 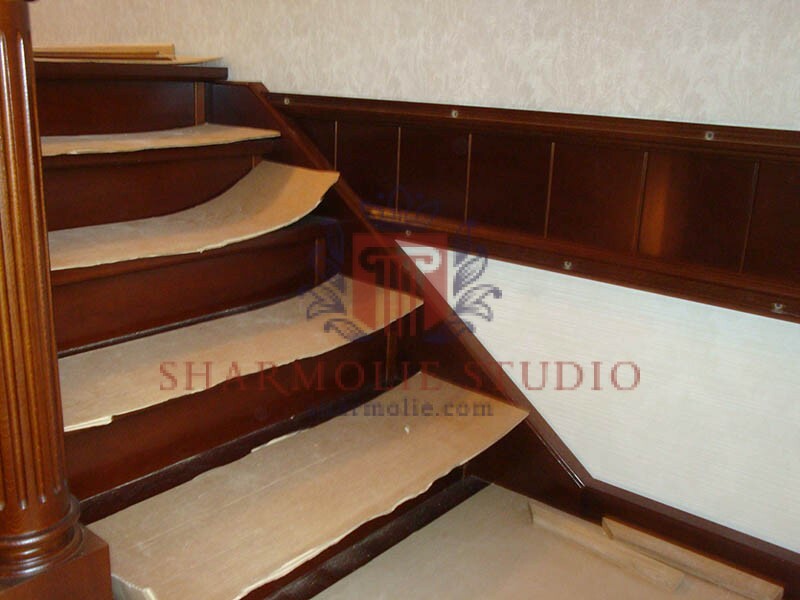 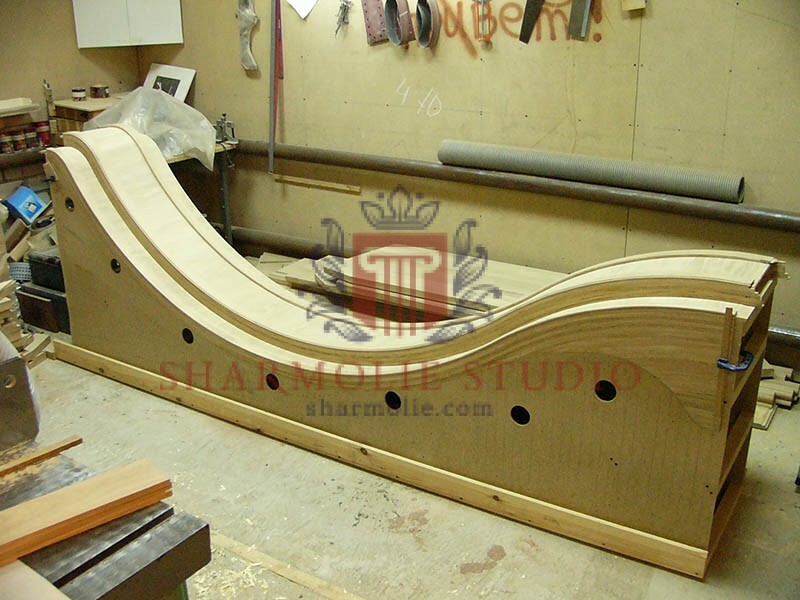 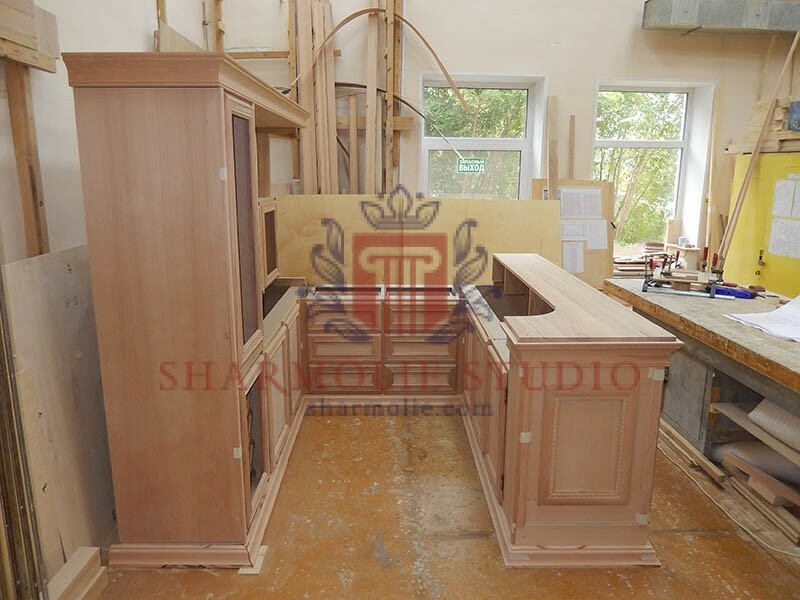 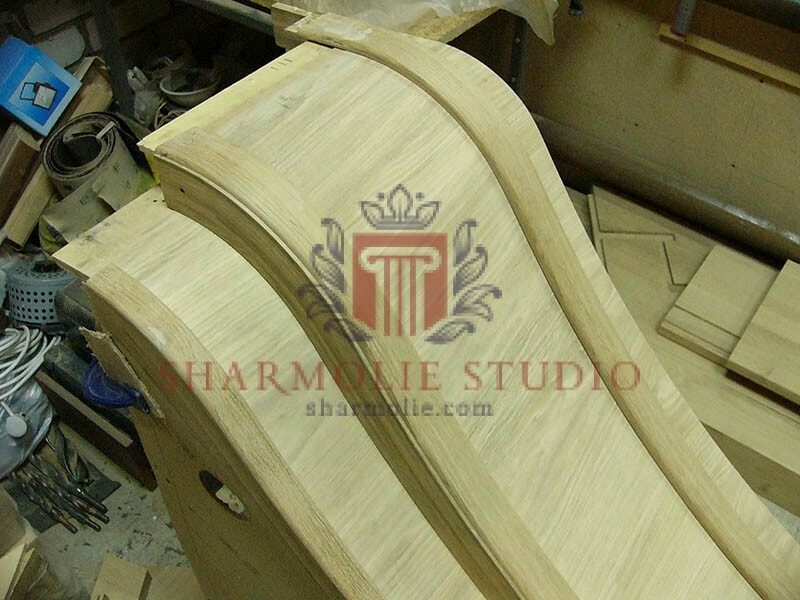 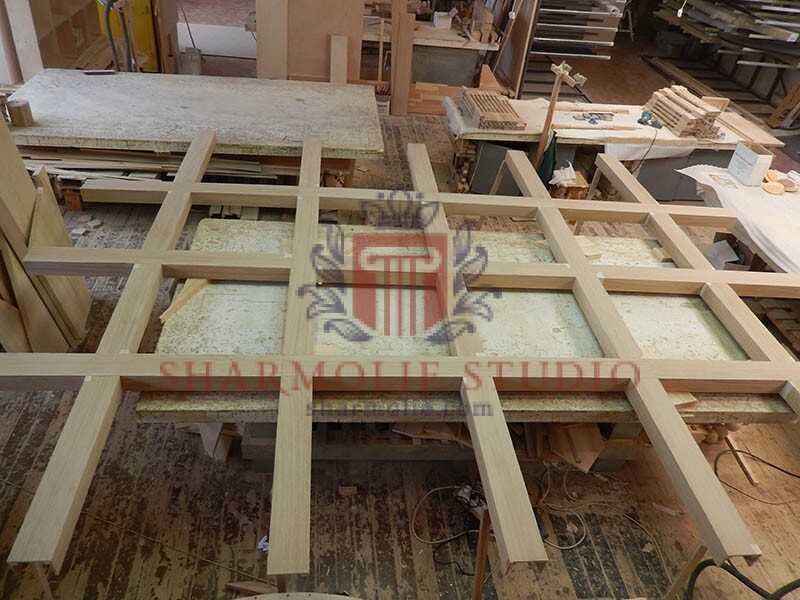 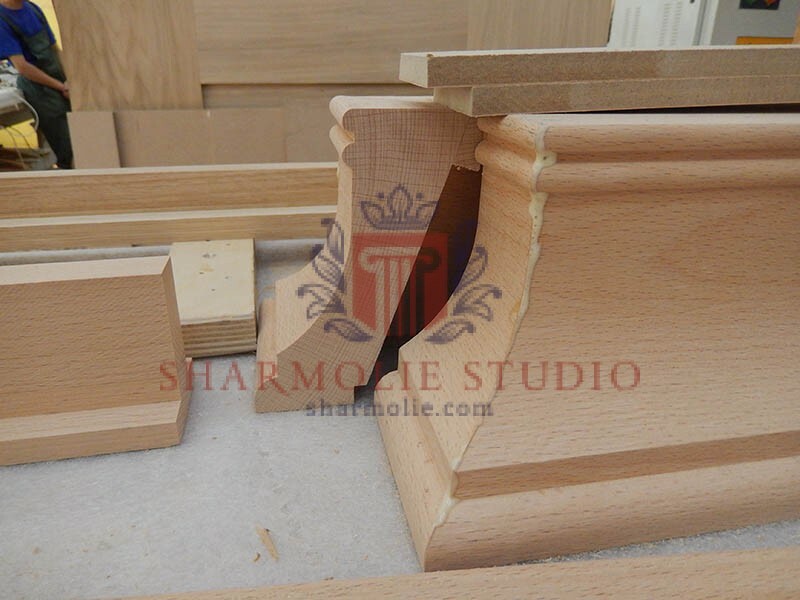 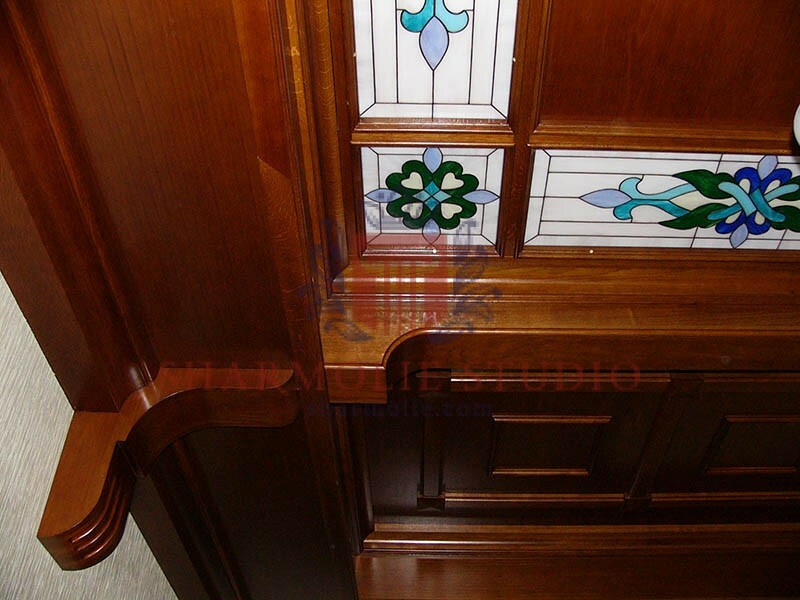 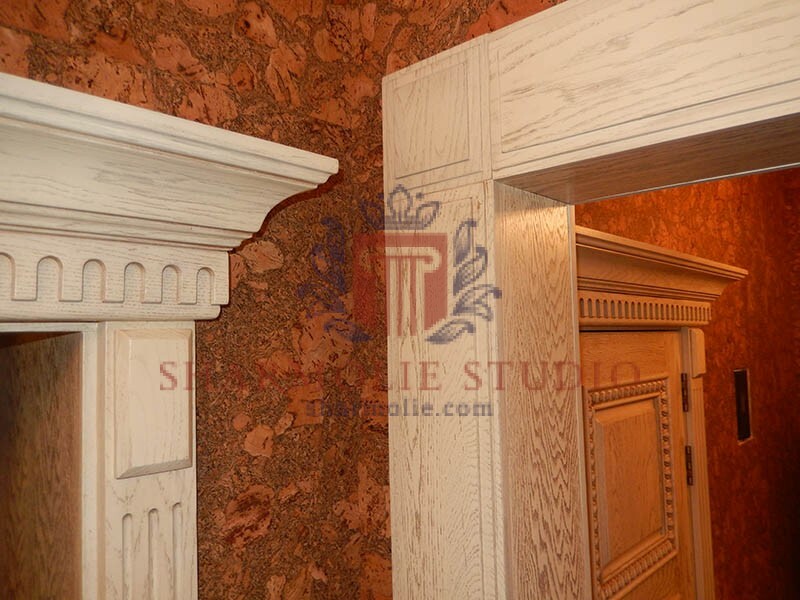 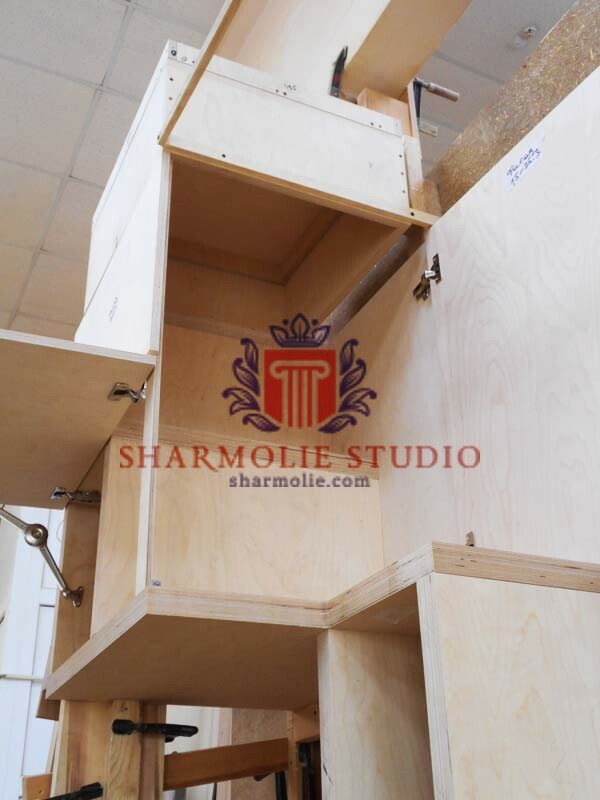 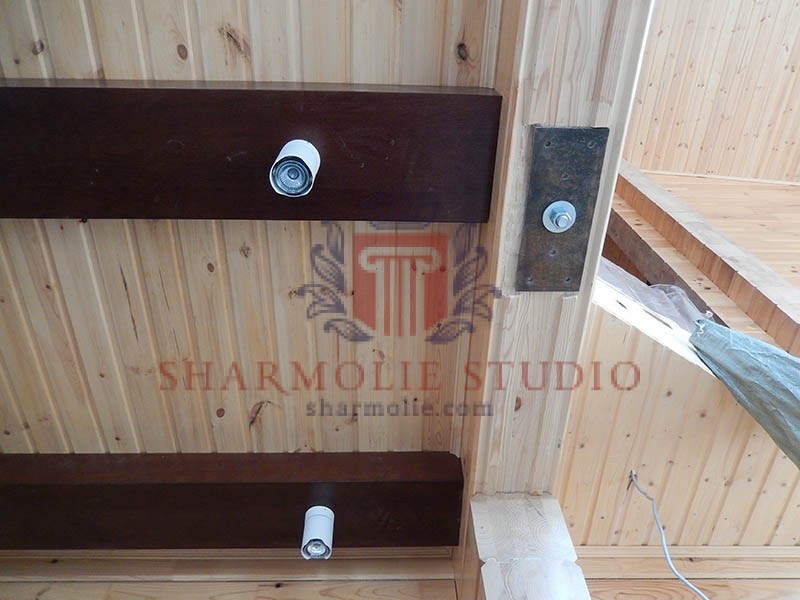 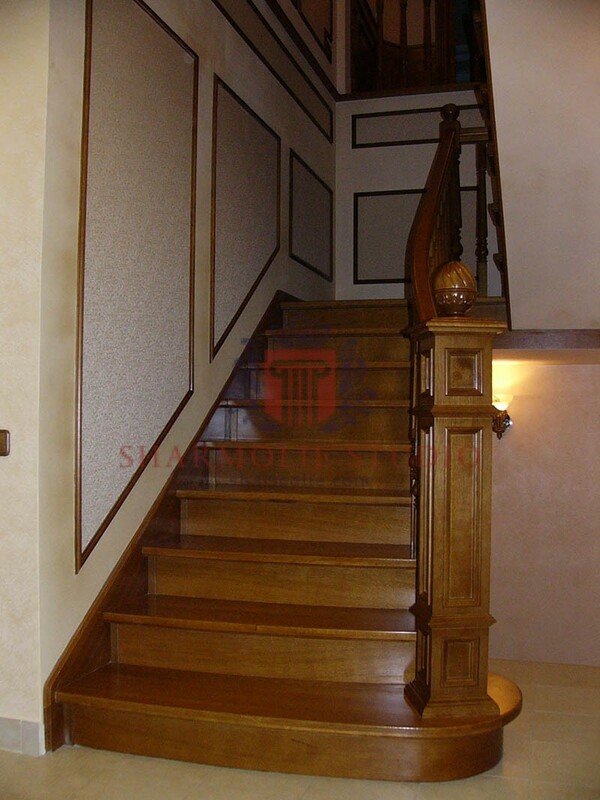 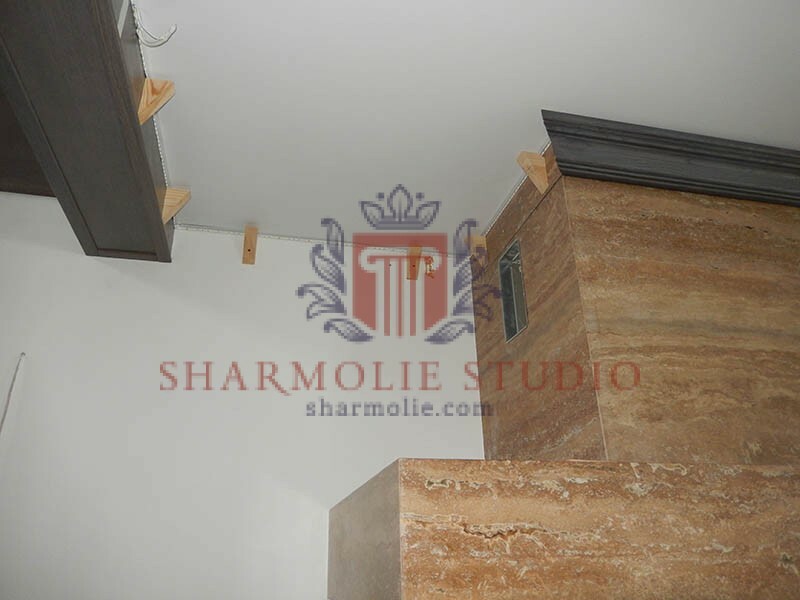 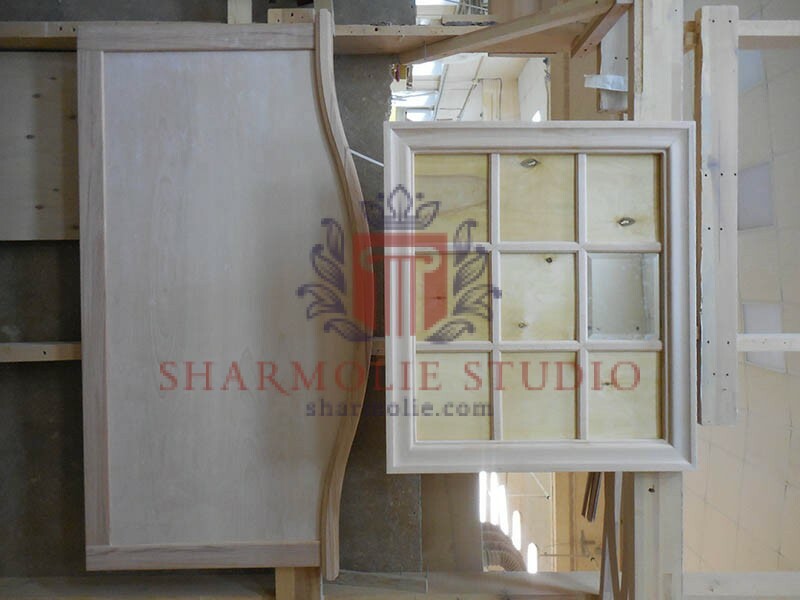 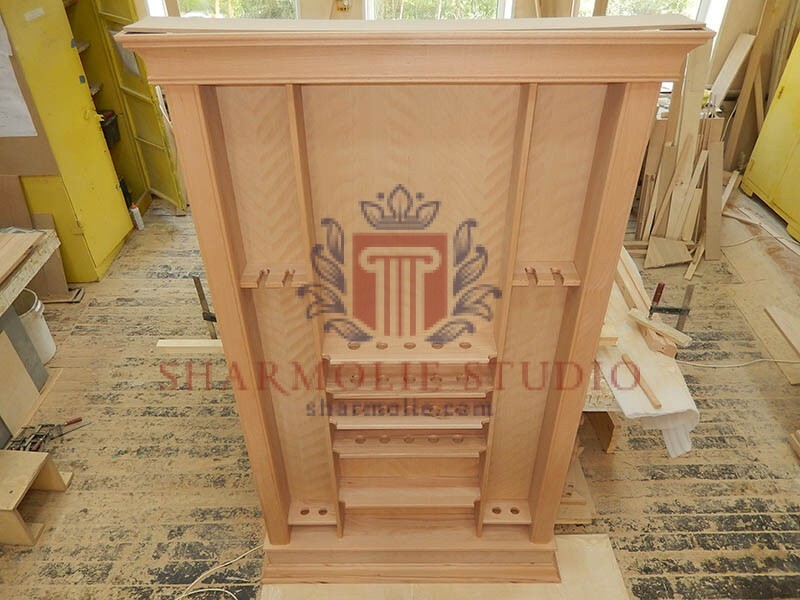 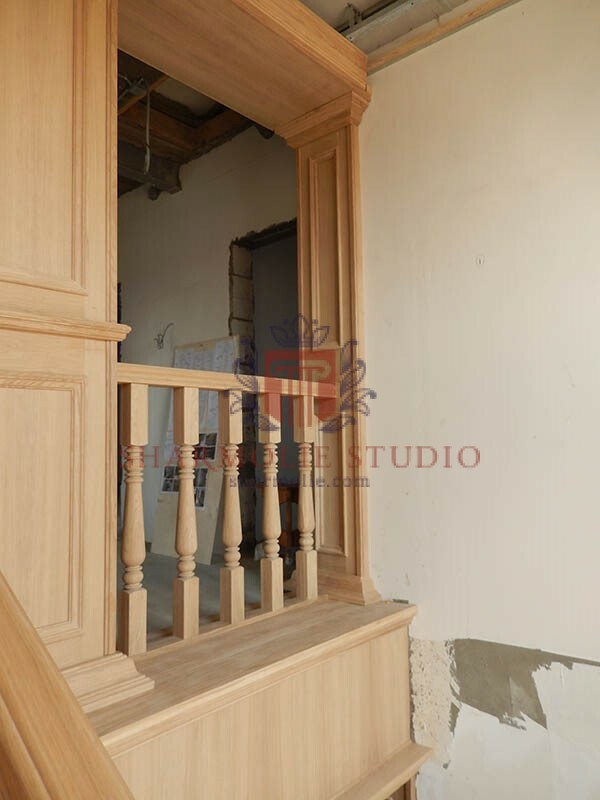 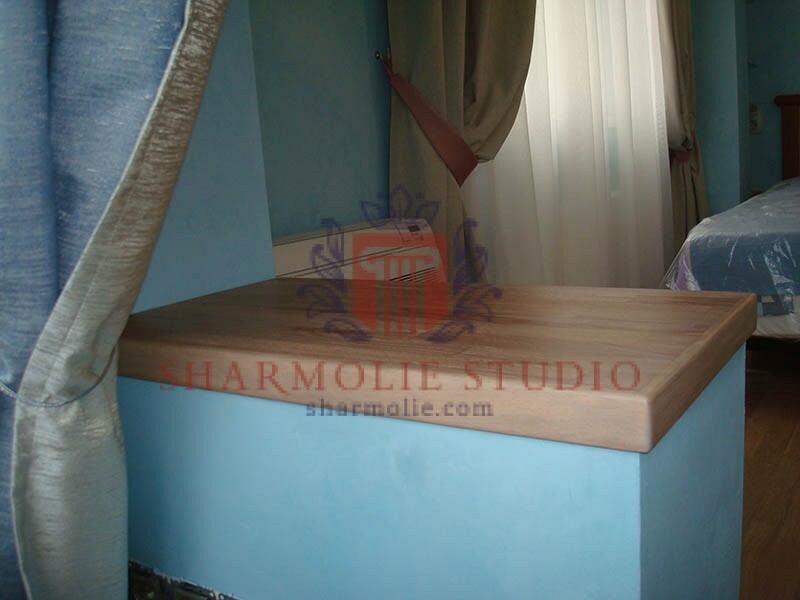 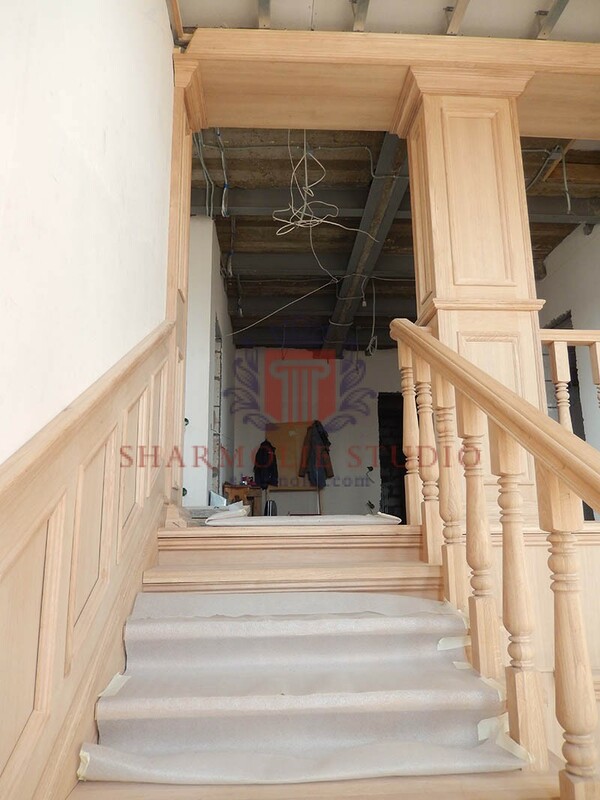 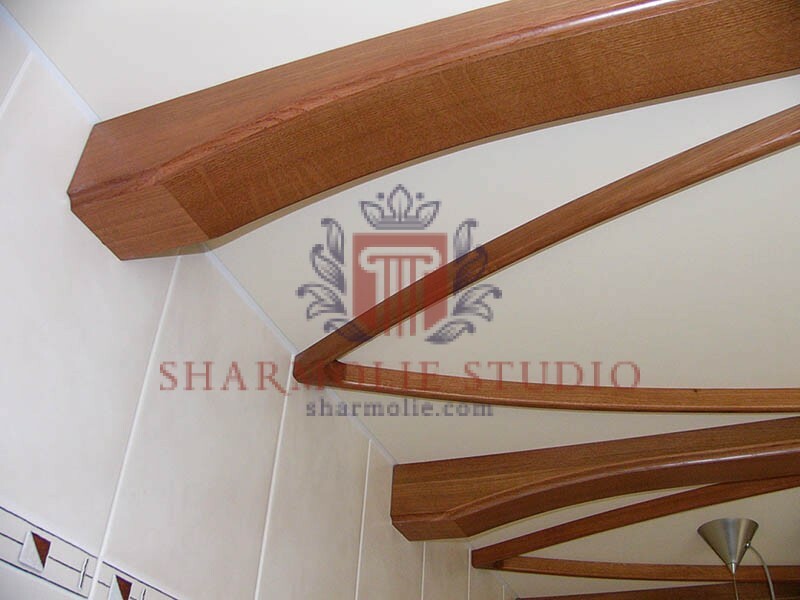 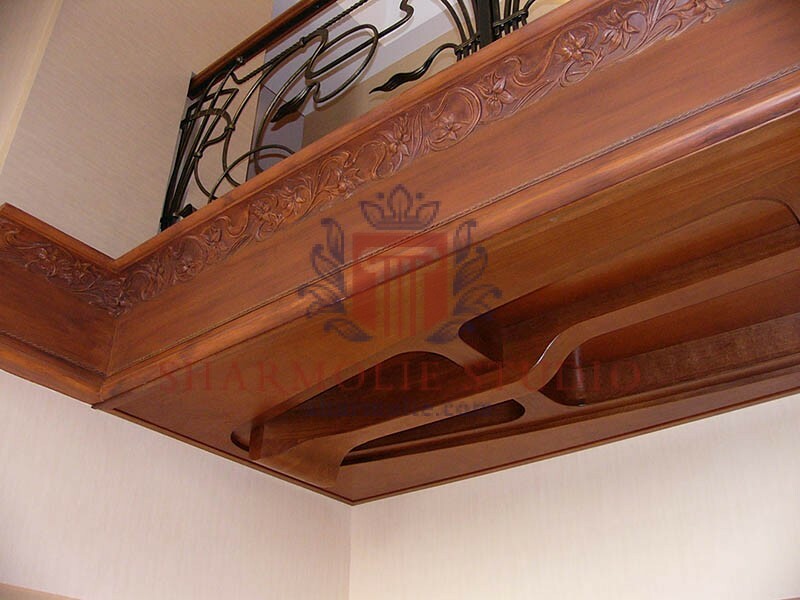 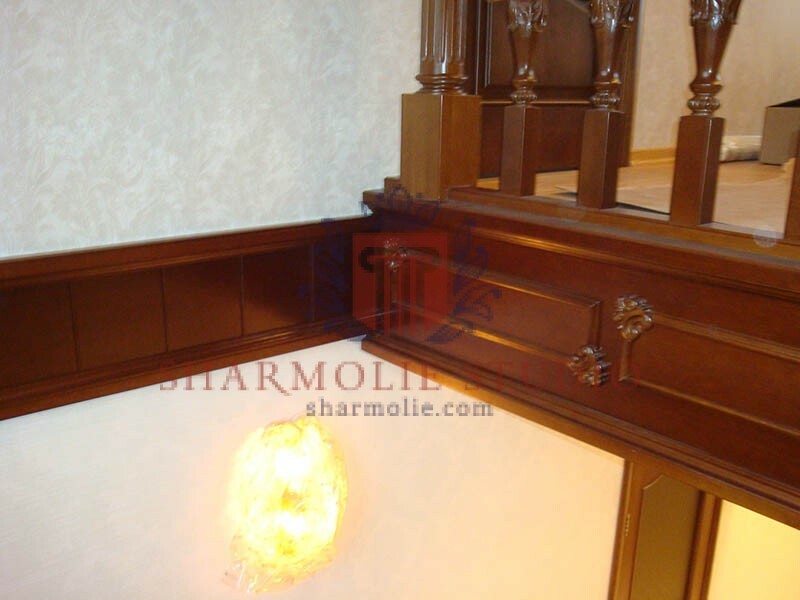 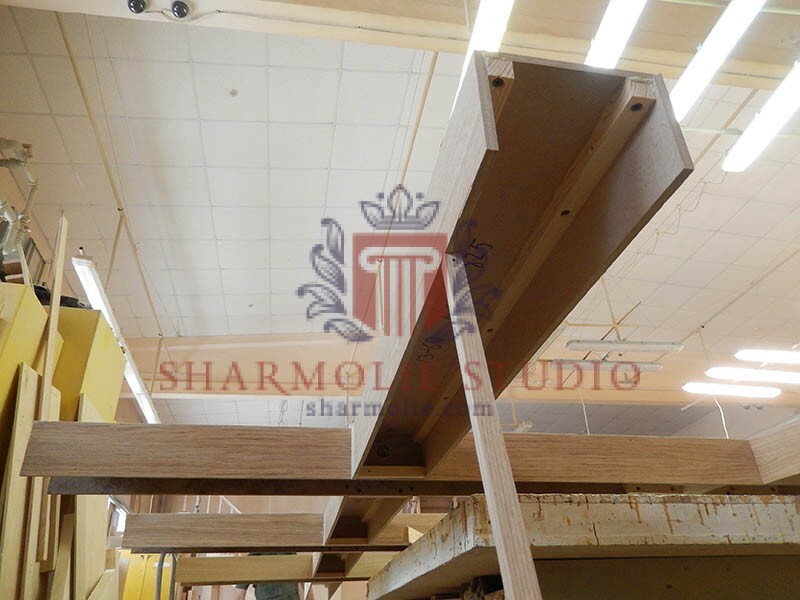 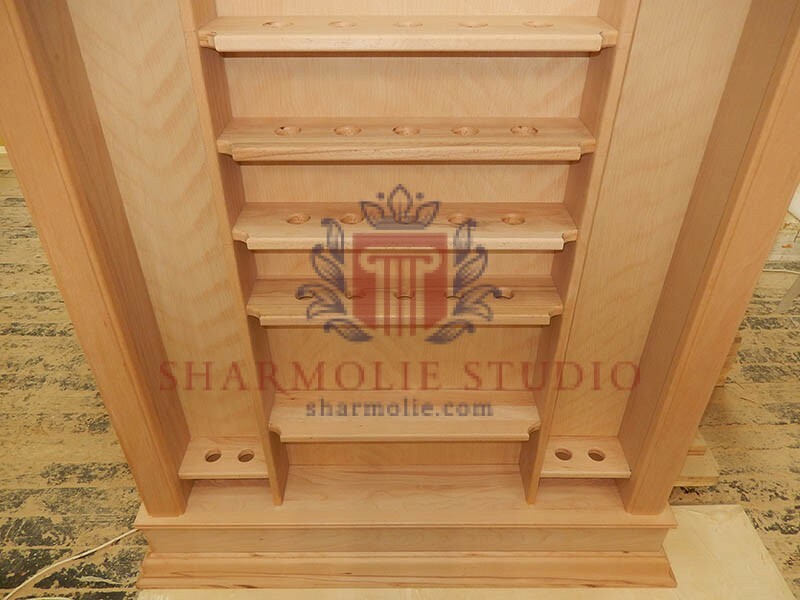 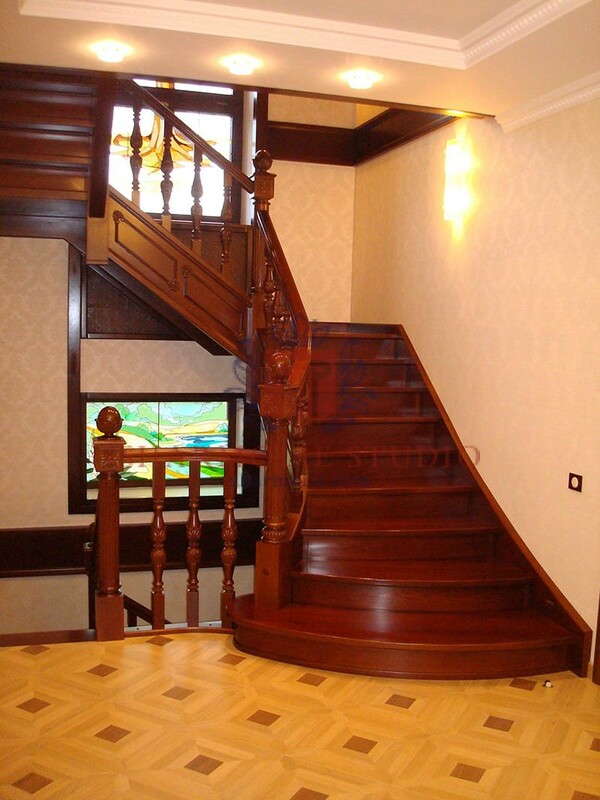 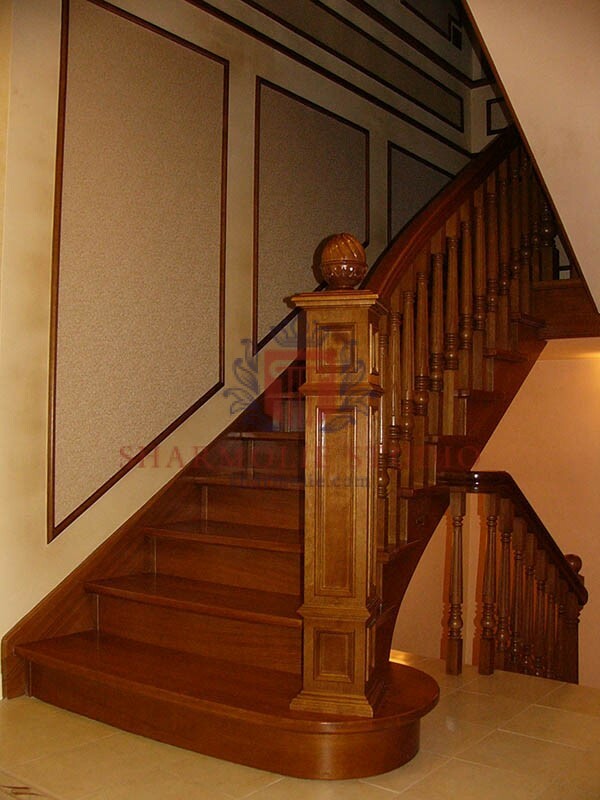 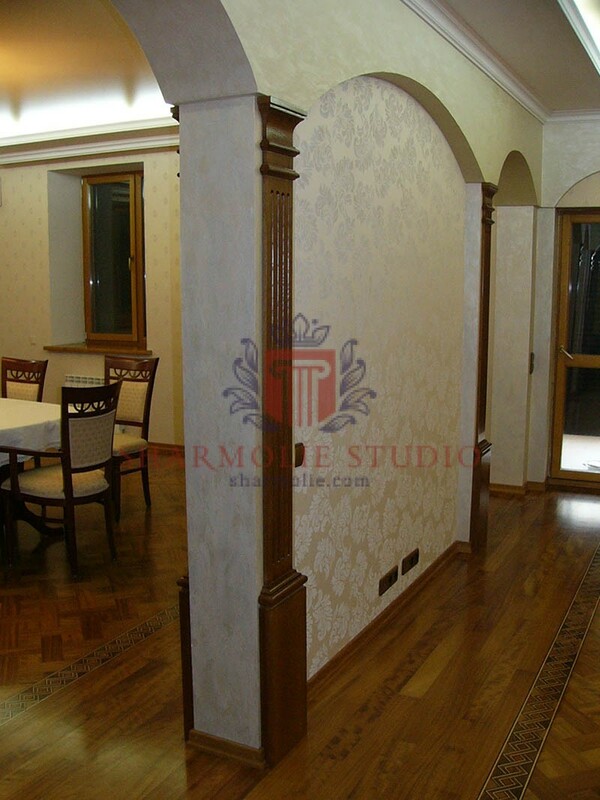 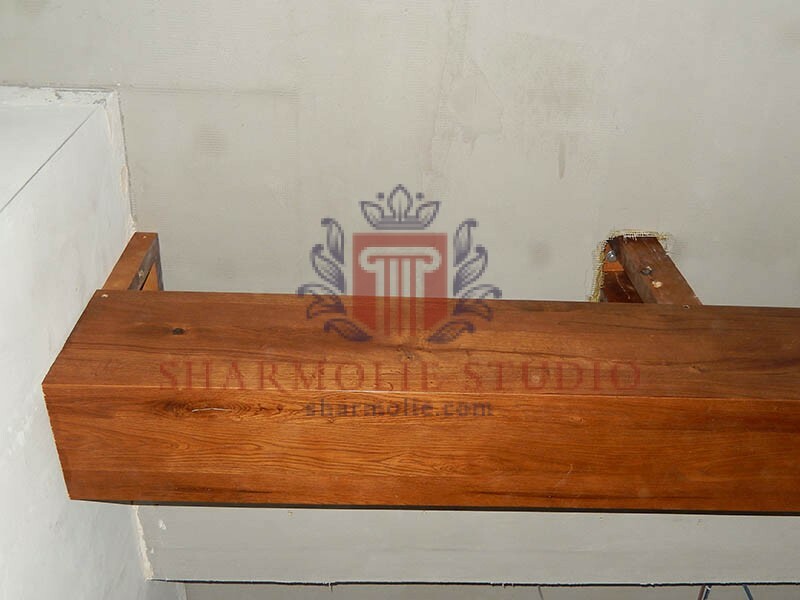 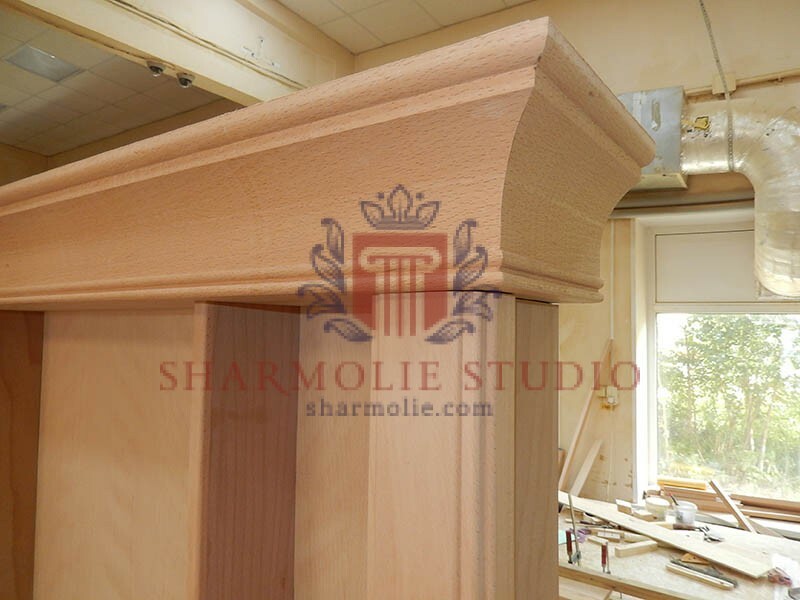 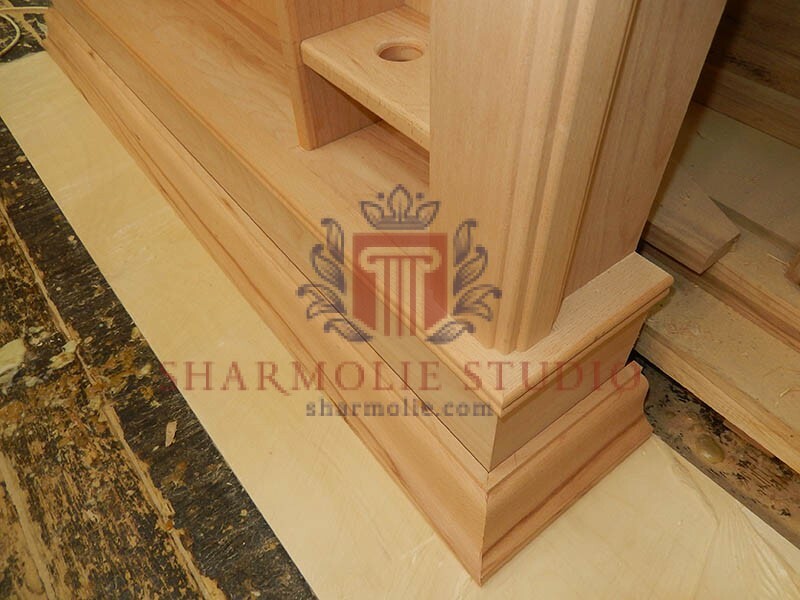 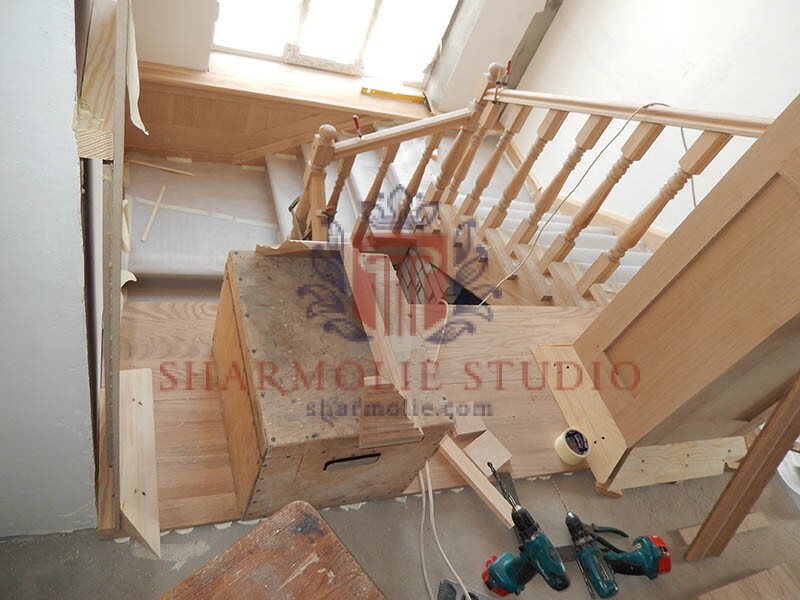 This is important step while working with the solid wood or any other natural materials. 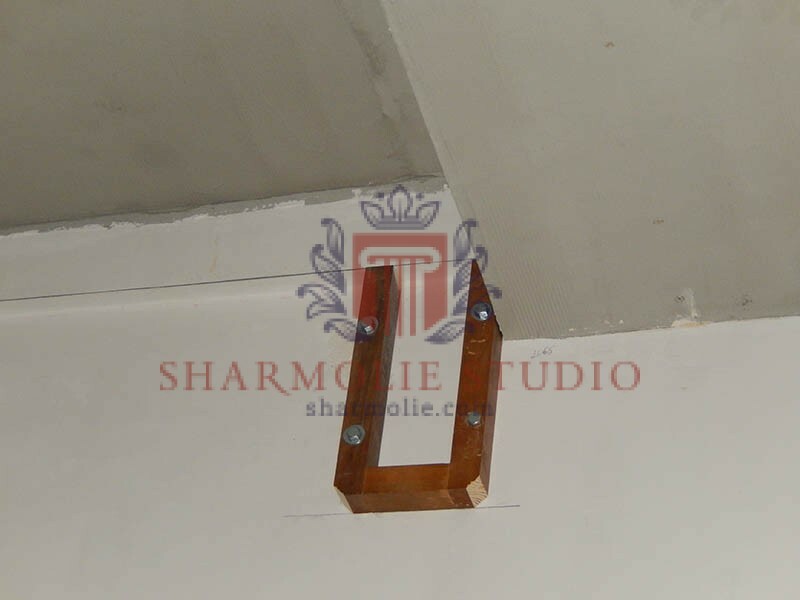 When you need to fix something and provide a high level of strength, our masters don’t use only glue, but also special fasteners and metal ties. 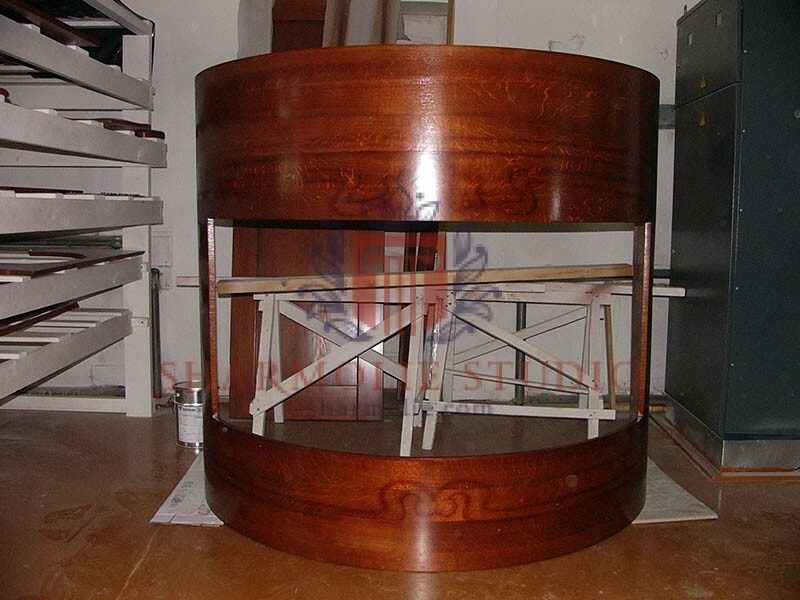 This is necessary to work with high loads. 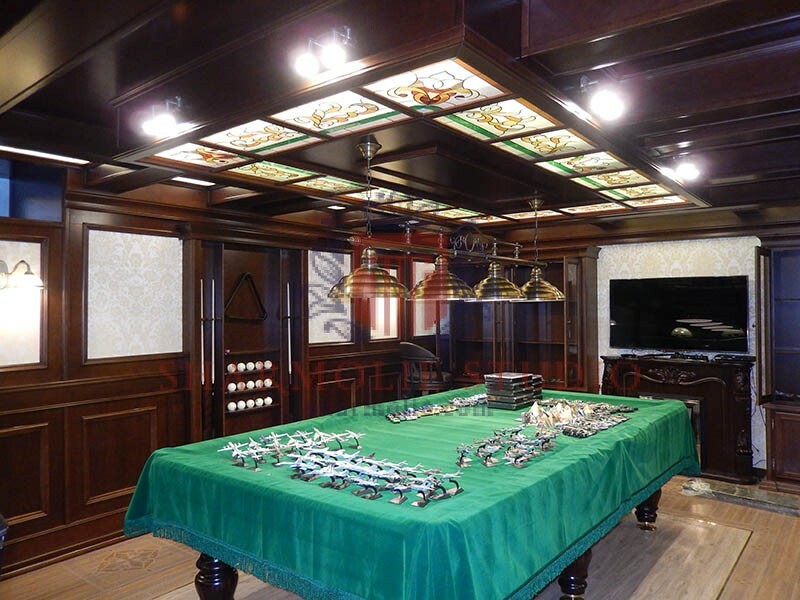 If you buy items with high-quality fasteners, you will enjoy it for ages. 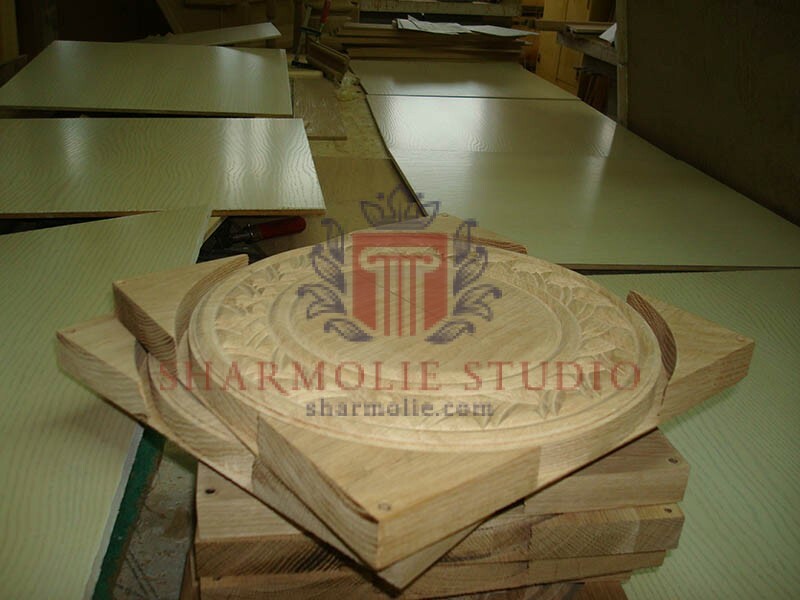 We are responsible for our products, that is why you will never face with any troubles. 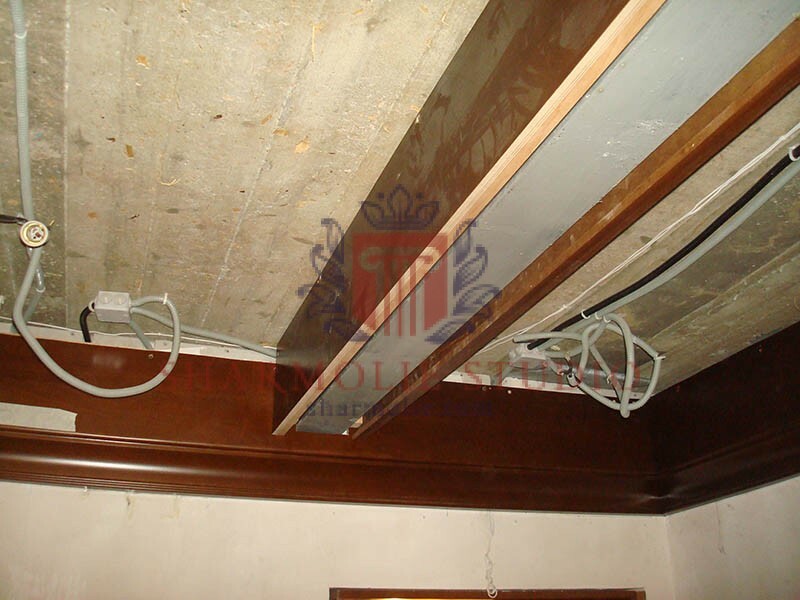 Fasteners and metal ties resist to corrosion and because of this it has the high level of durability. 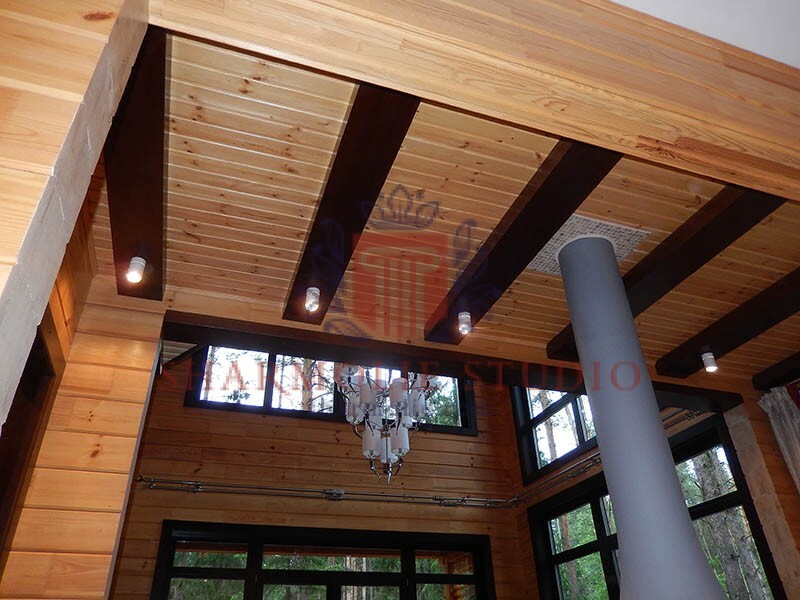 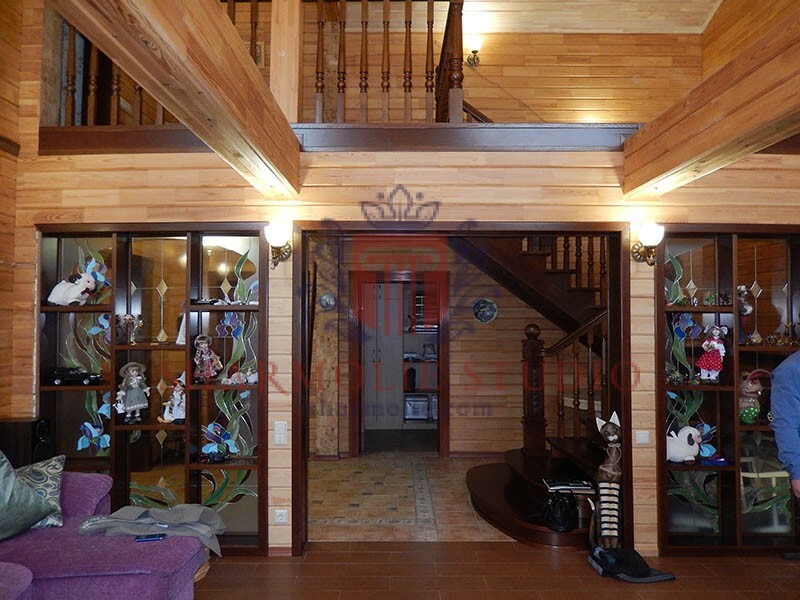 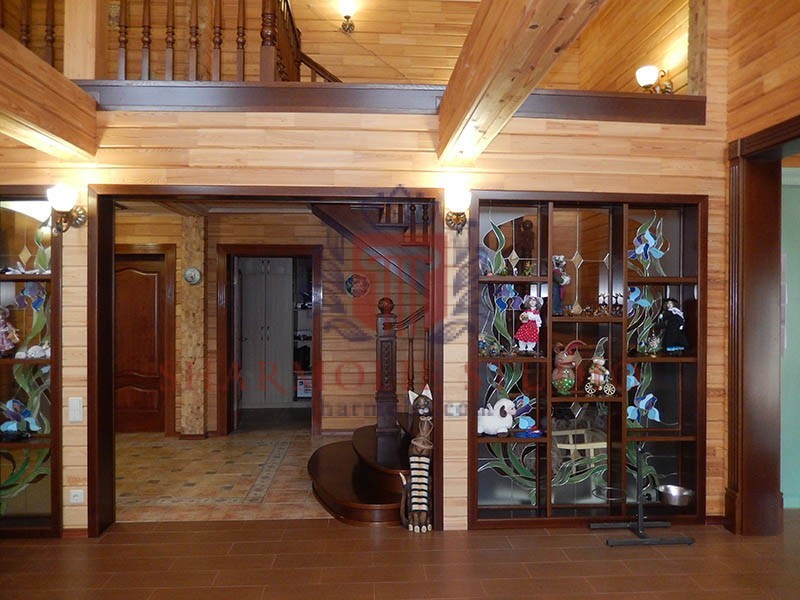 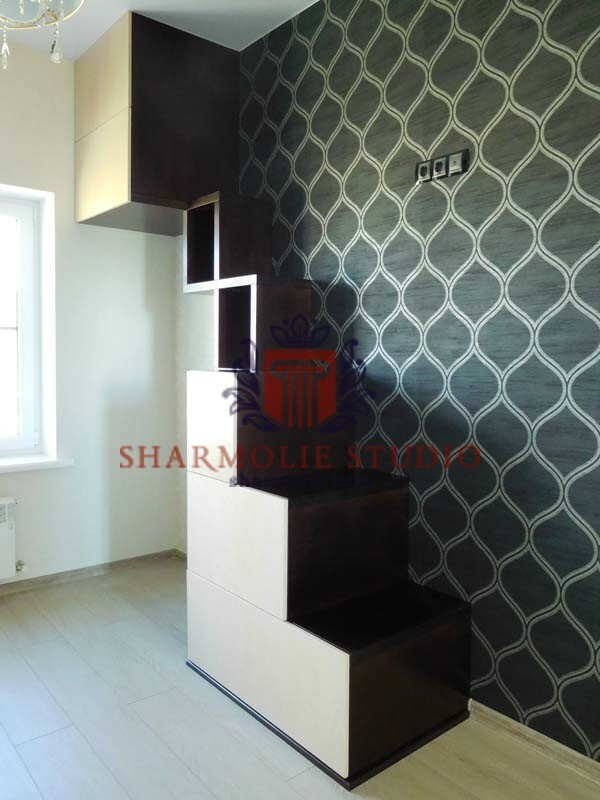 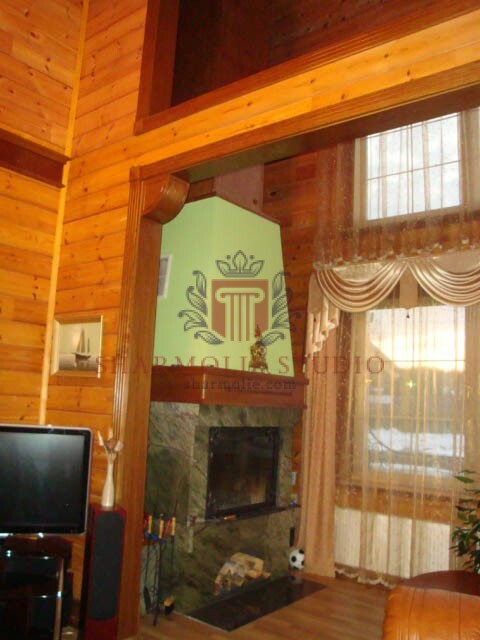 As our company works with wood and produces a lot of elements of interior from it, the choice of material is always acute. 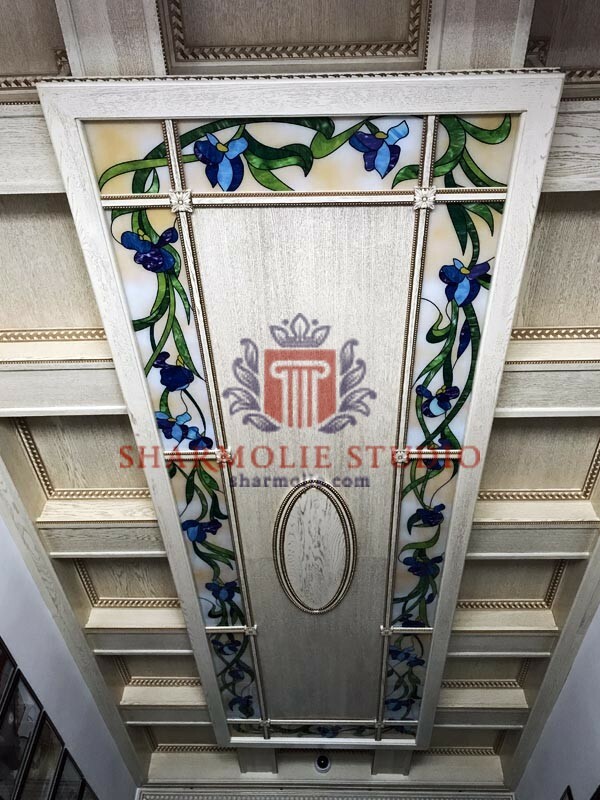 We wants the items to be beautiful and with high quality, but at the same time, affordable for as many customers as possible. 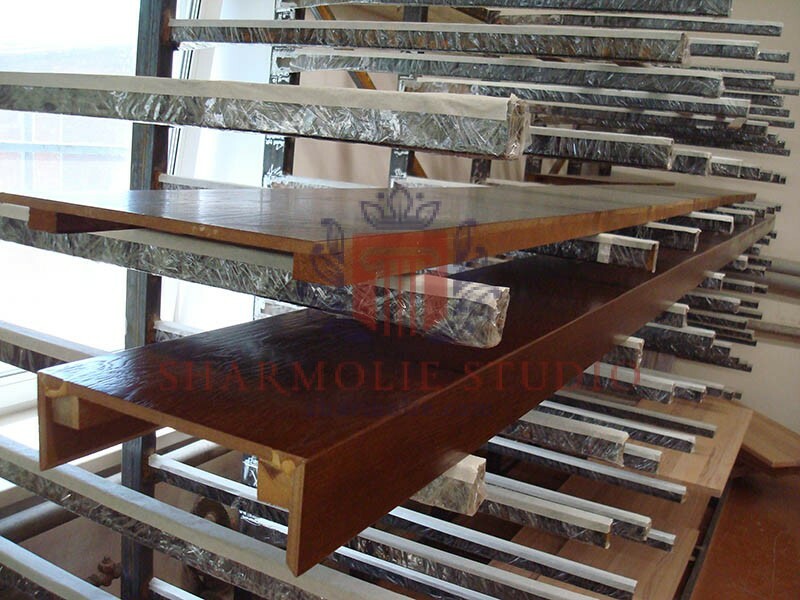 And we found the material that allows us to achieve all of these goals. 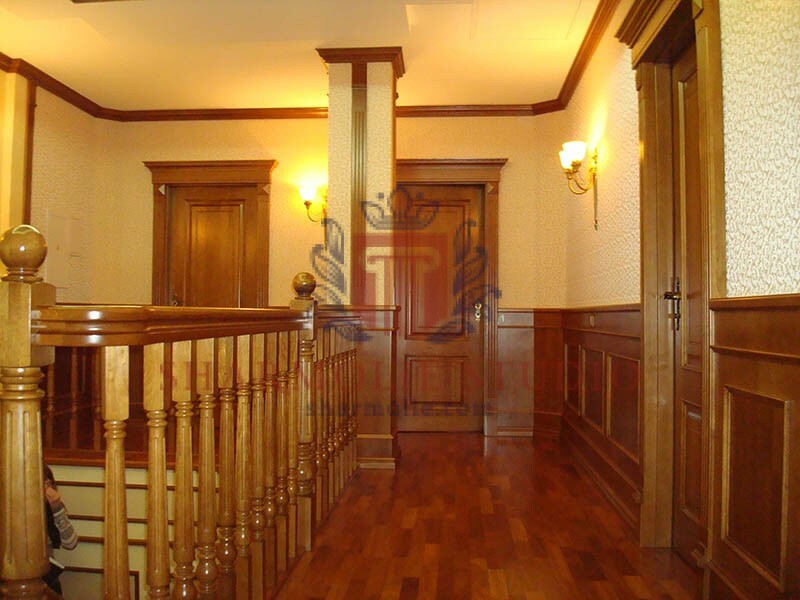 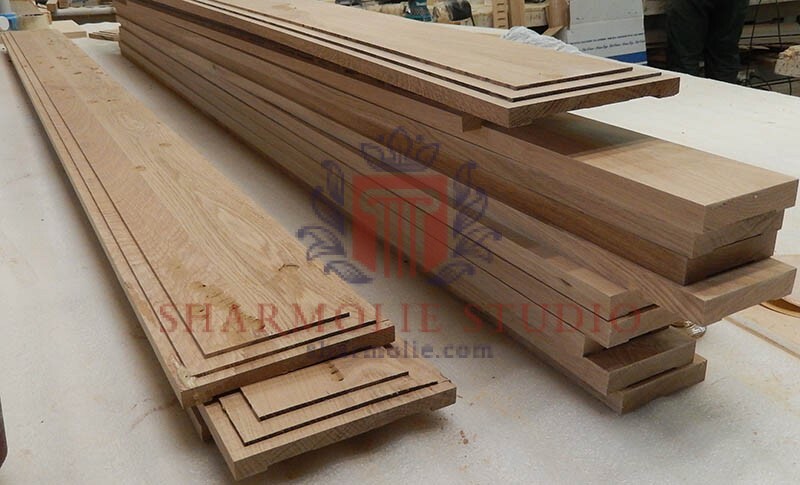 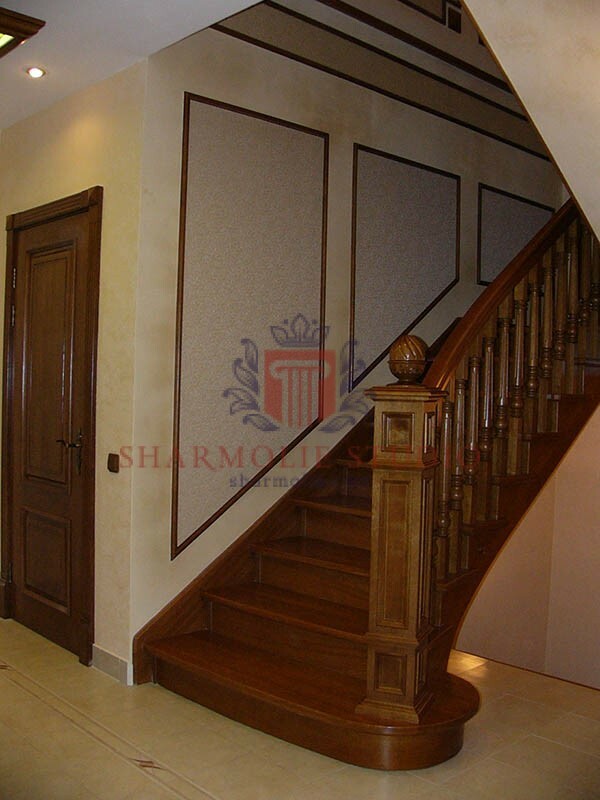 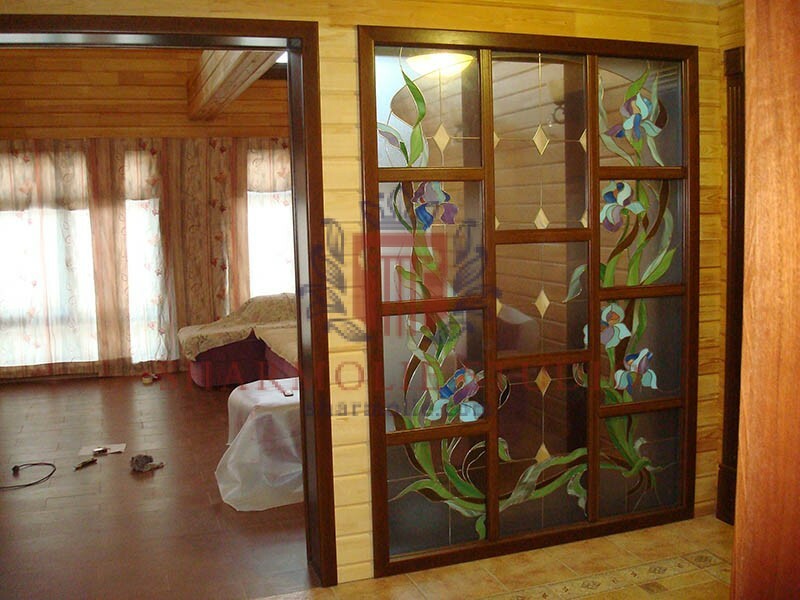 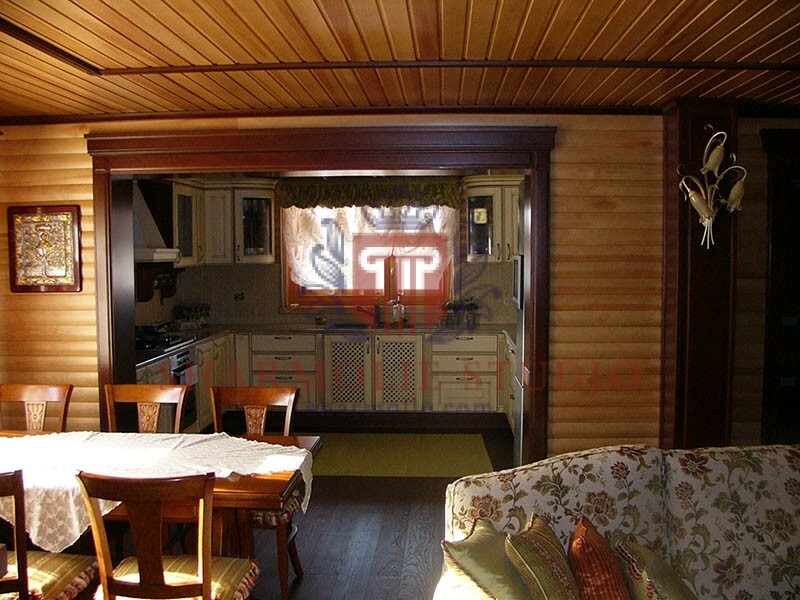 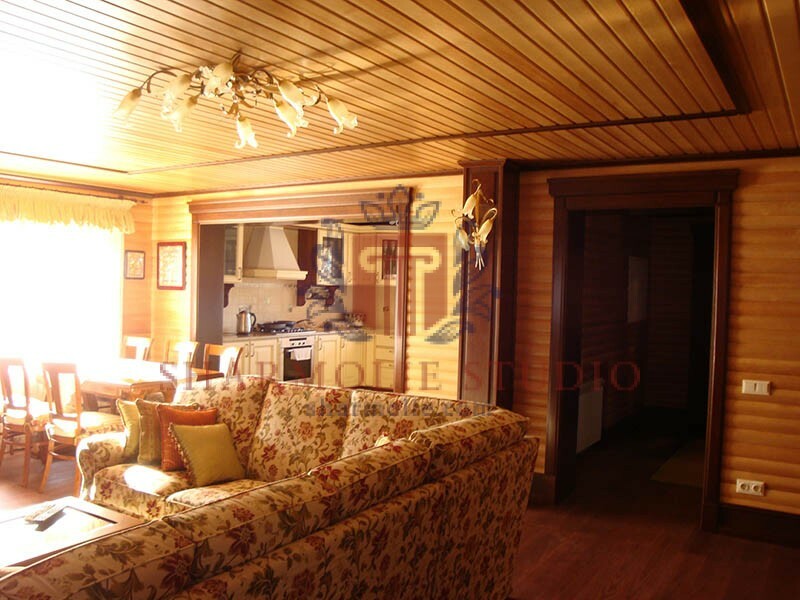 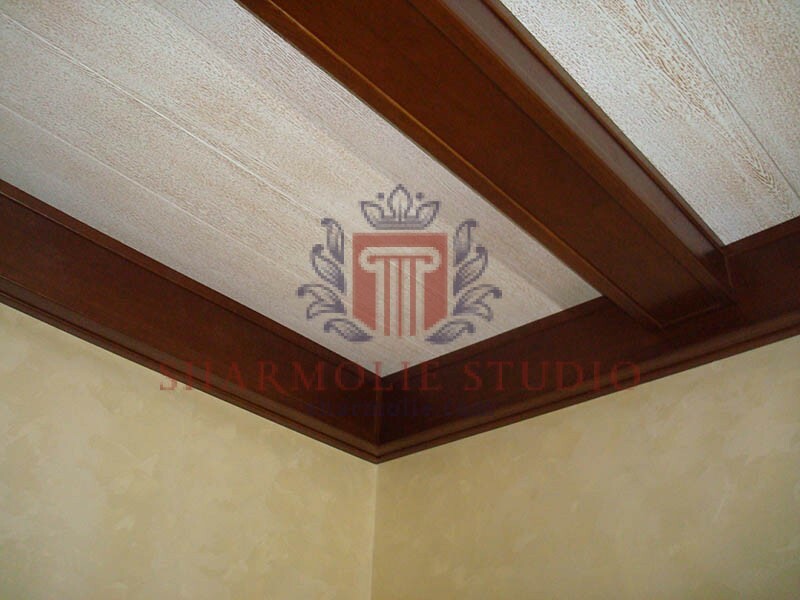 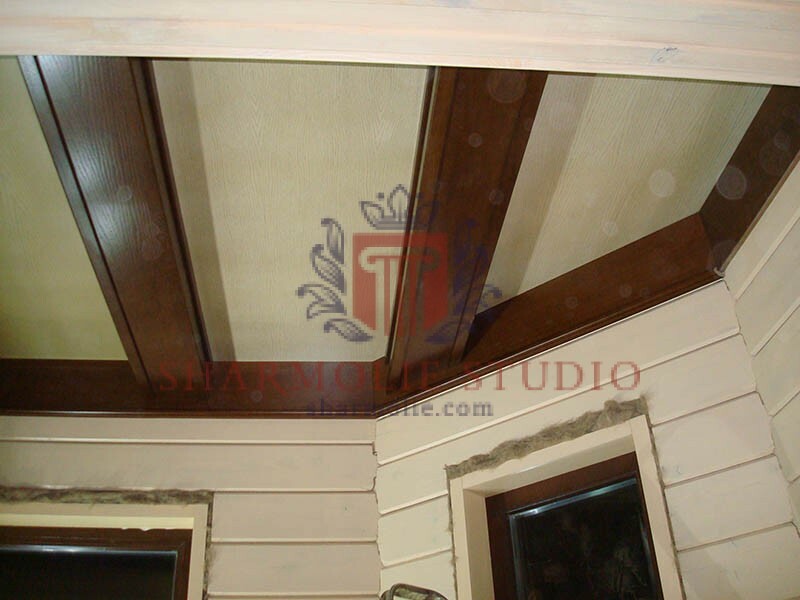 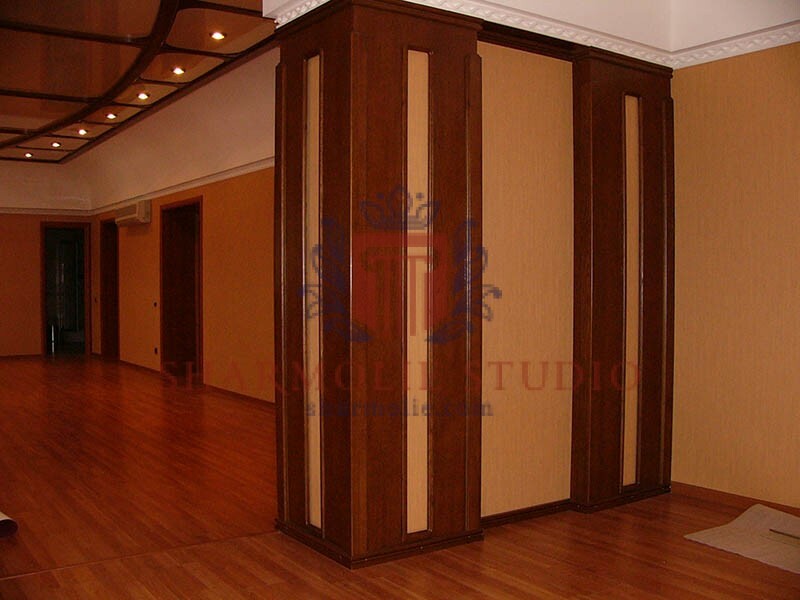 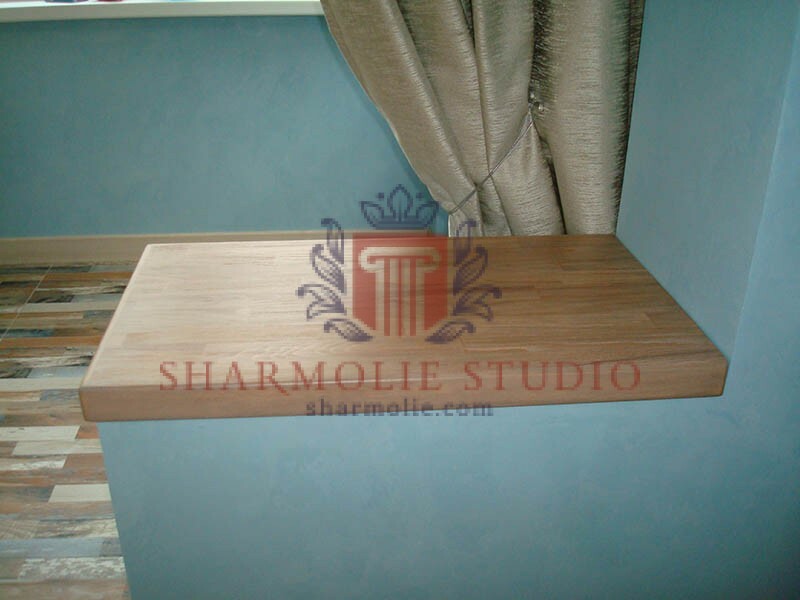 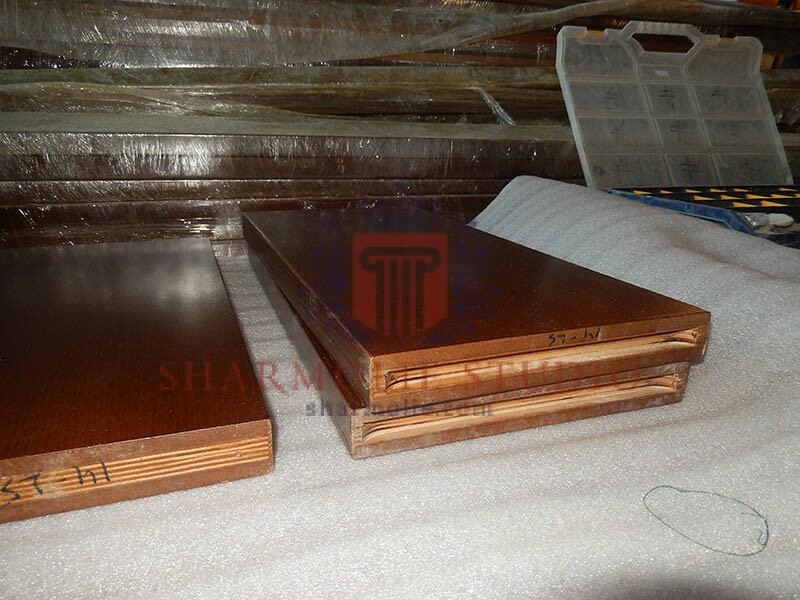 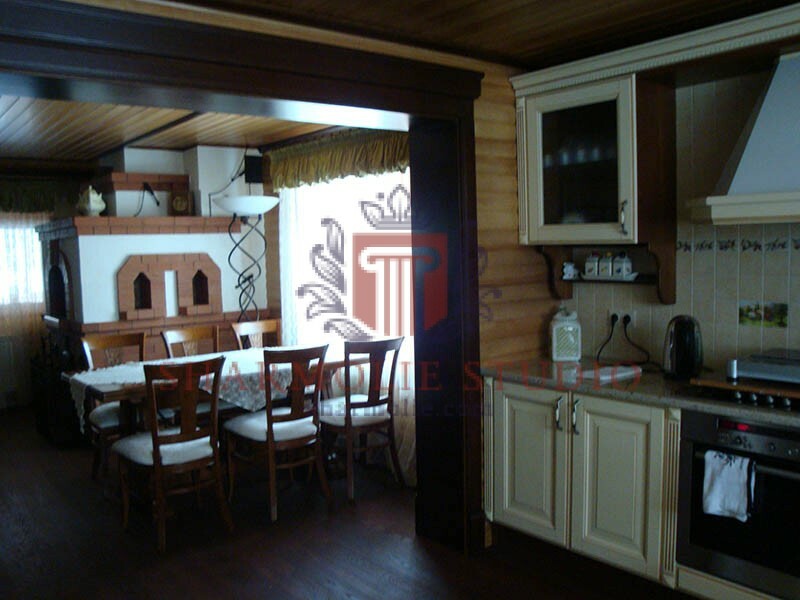 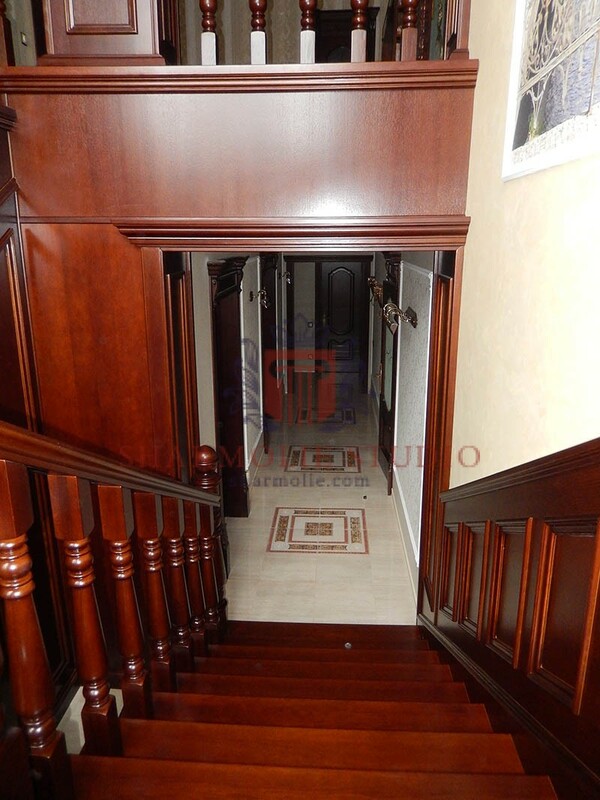 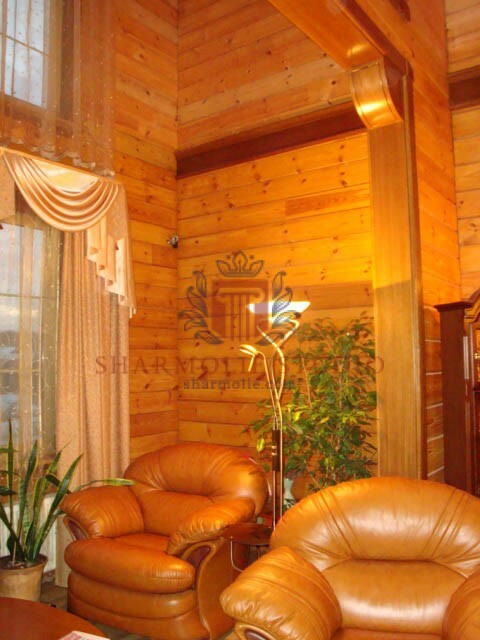 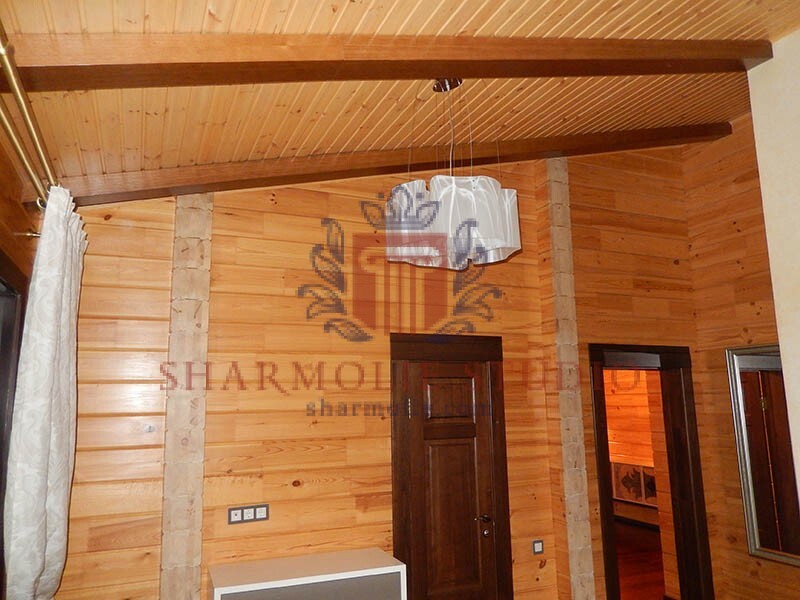 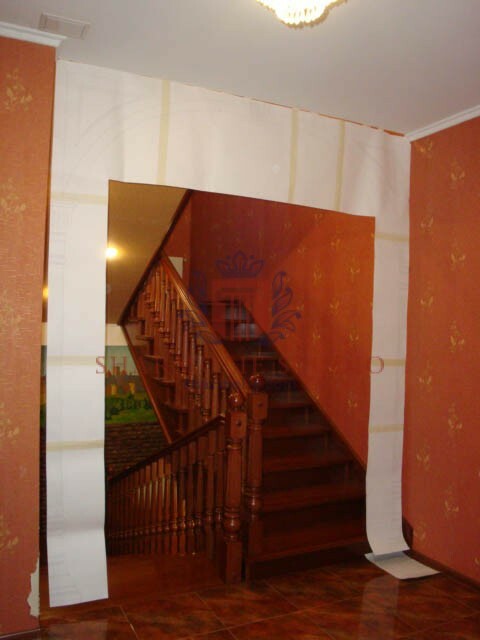 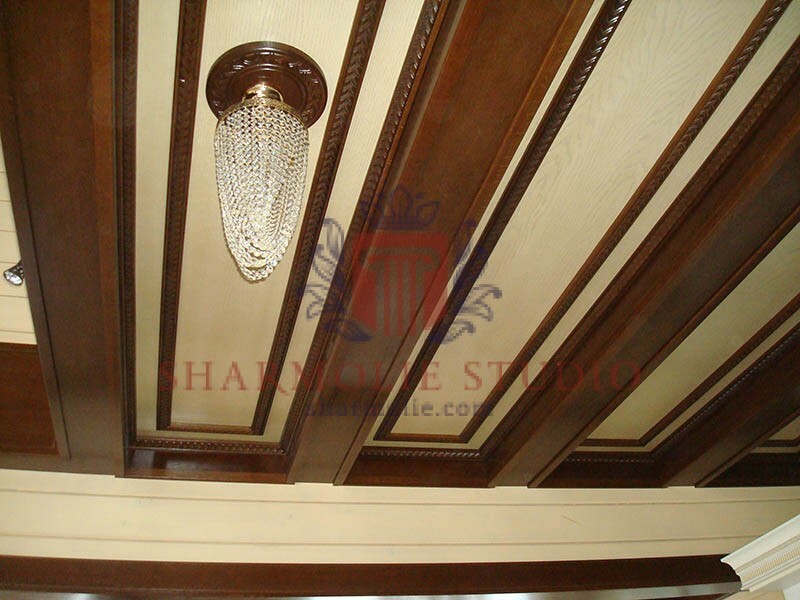 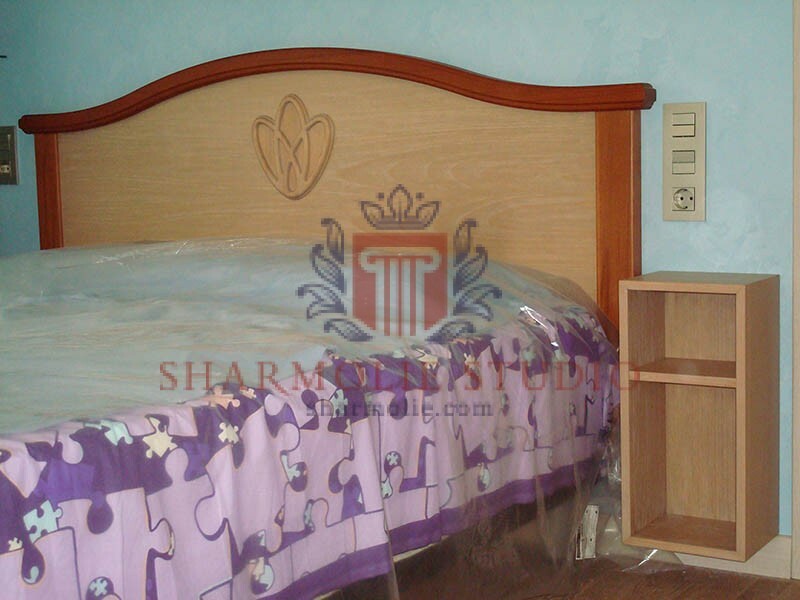 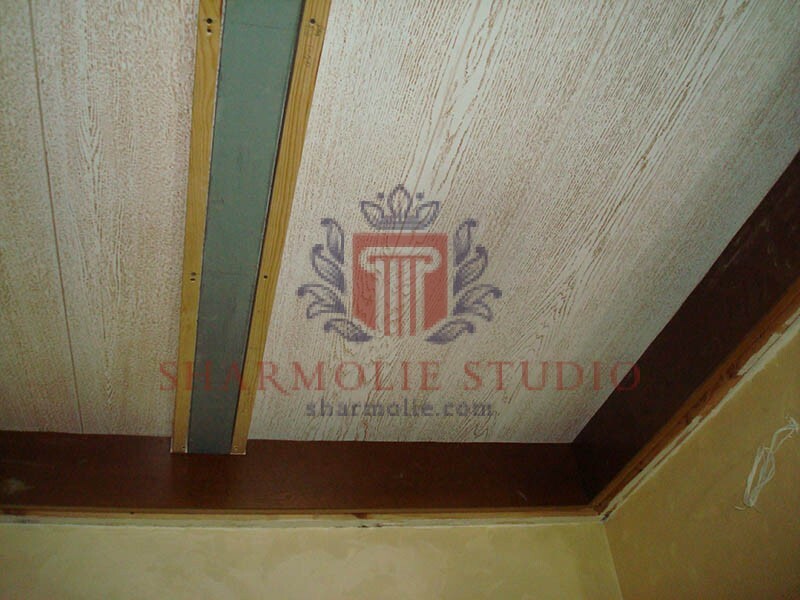 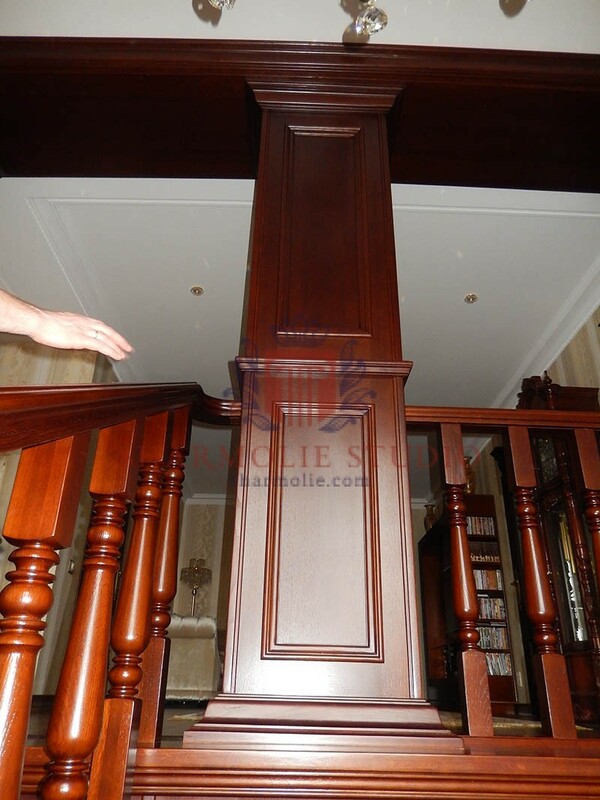 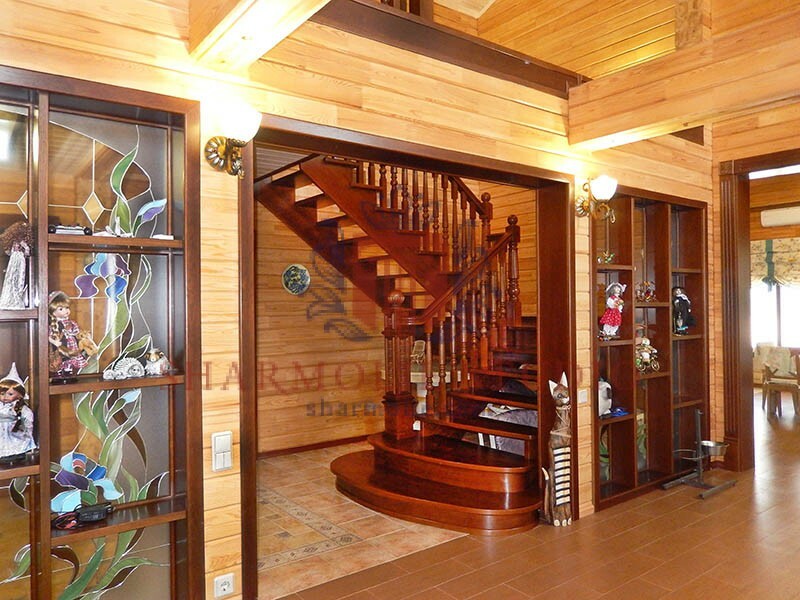 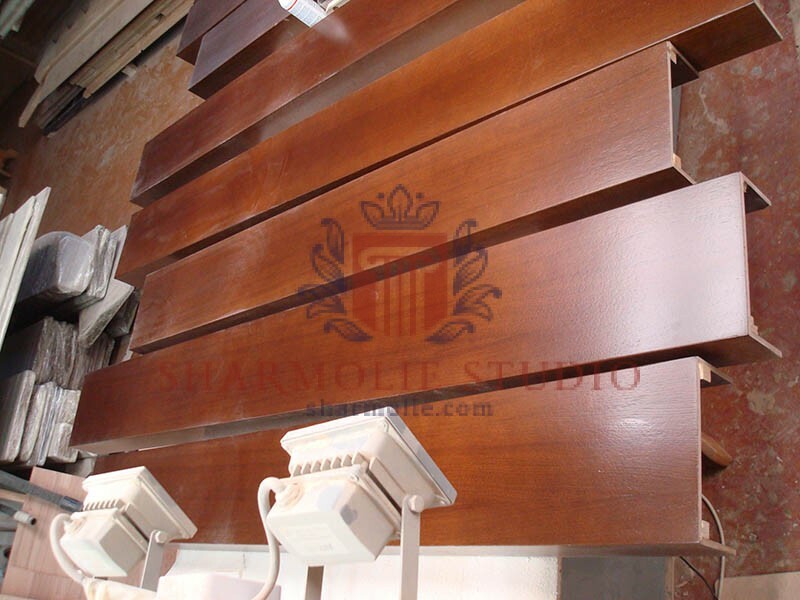 We are talking about wood-laminated board. 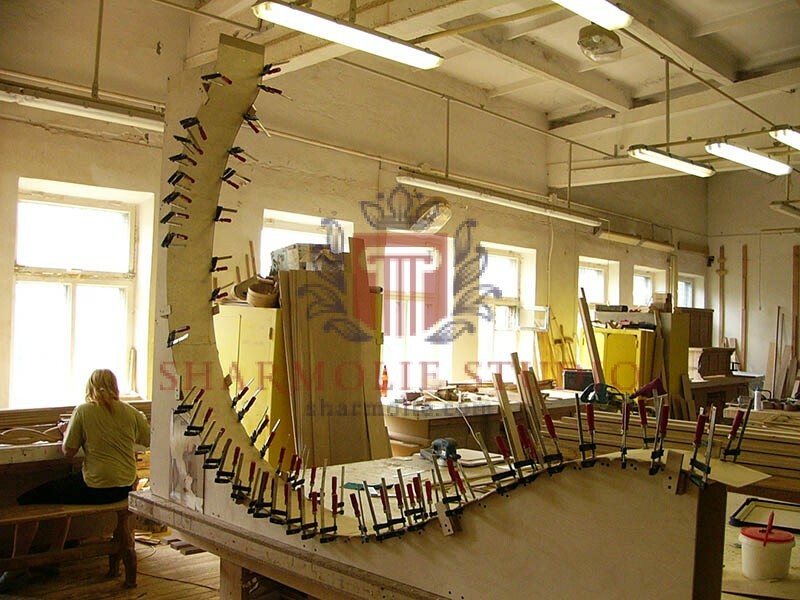 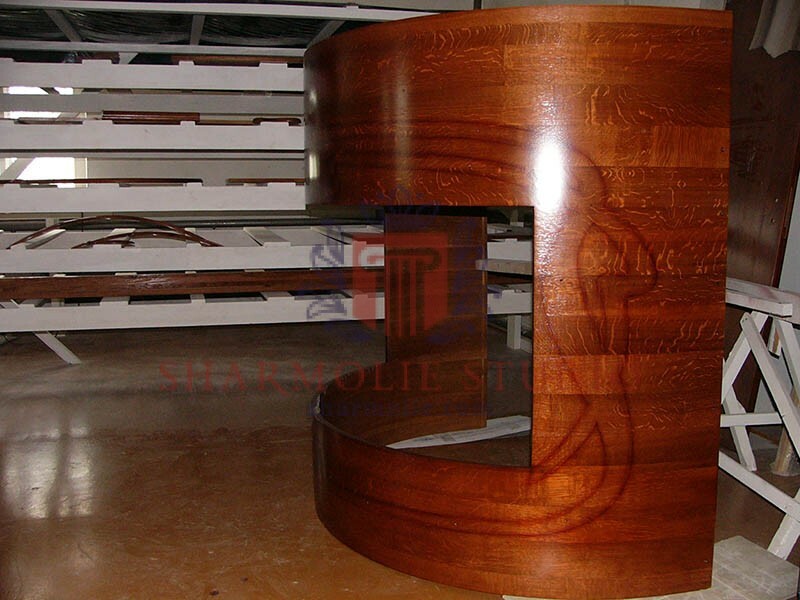 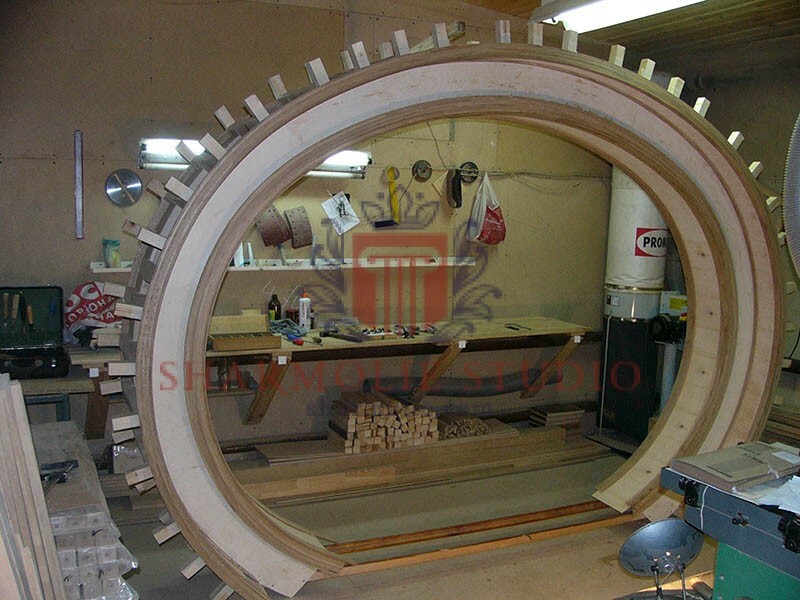 It is designed to be used in the production of various interior items. 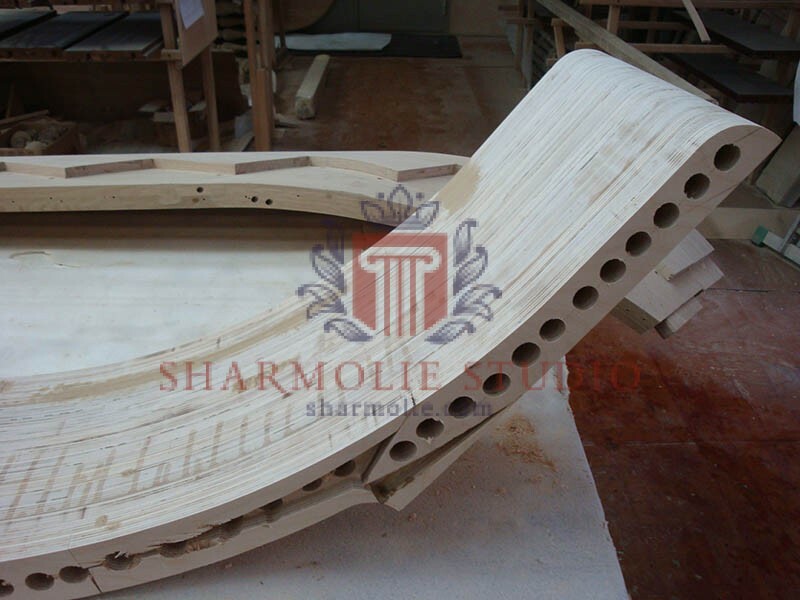 Our material is selected in such a way that it can withstand serious loads and maintain its important unique characteristics. 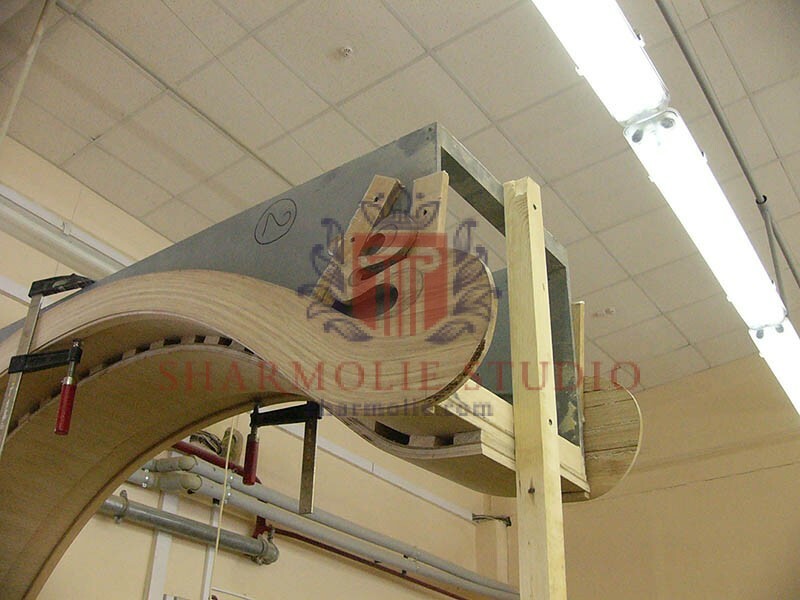 We work only with tested boards and we know well what they are made of. 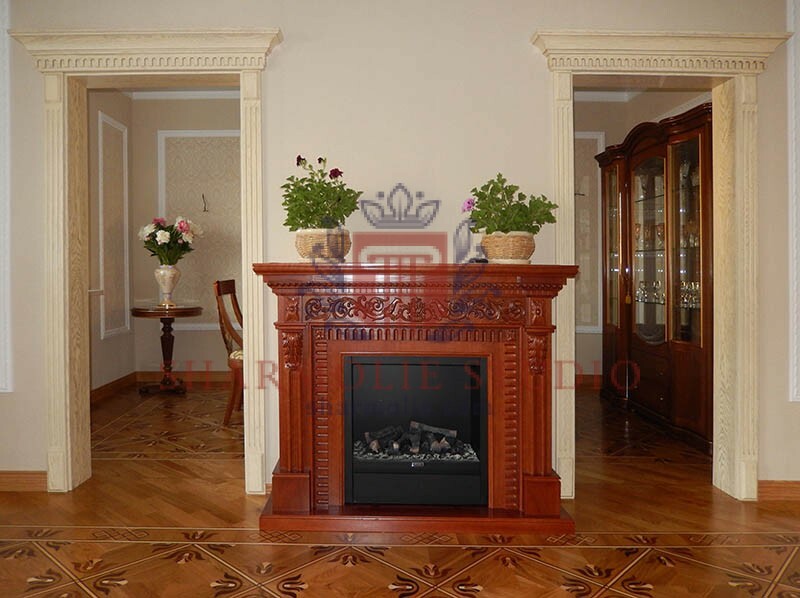 This indicates that you will not run into unpleasant chemical odors or harmful fumes. 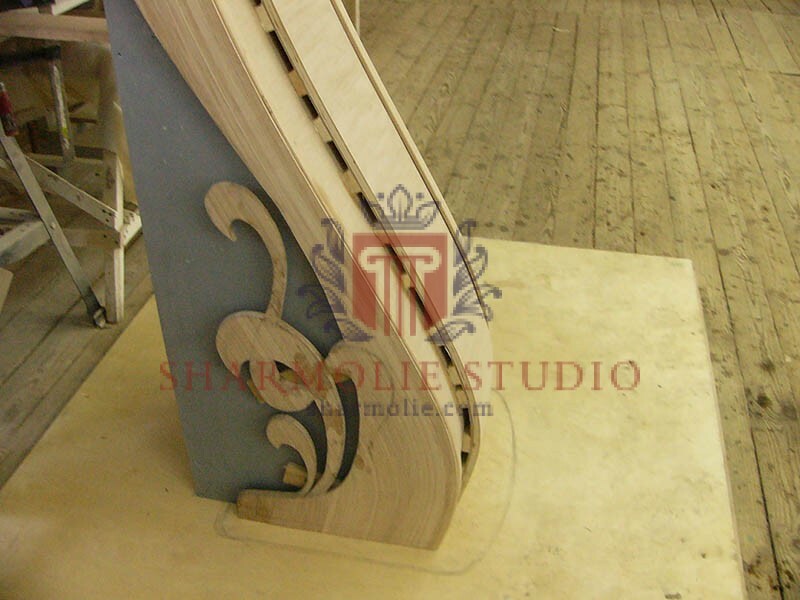 Using a wood-laminated board helps save our customers’ money. 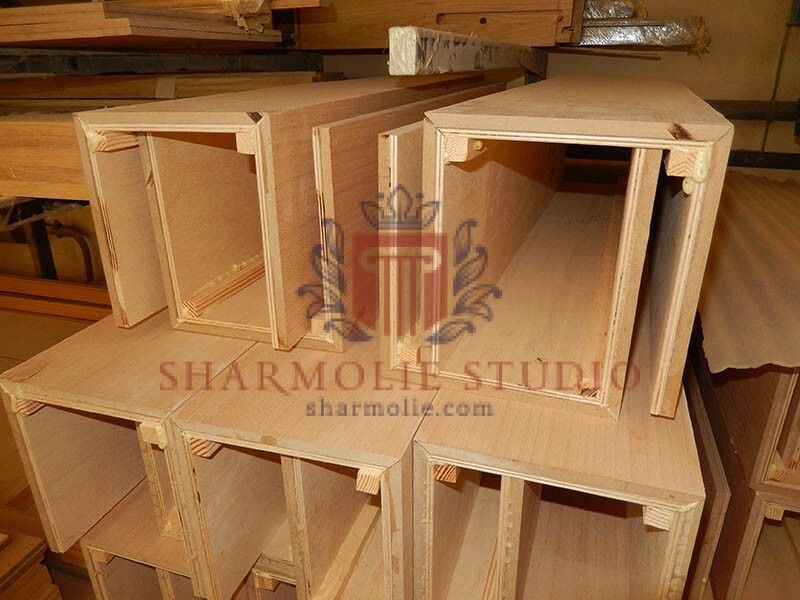 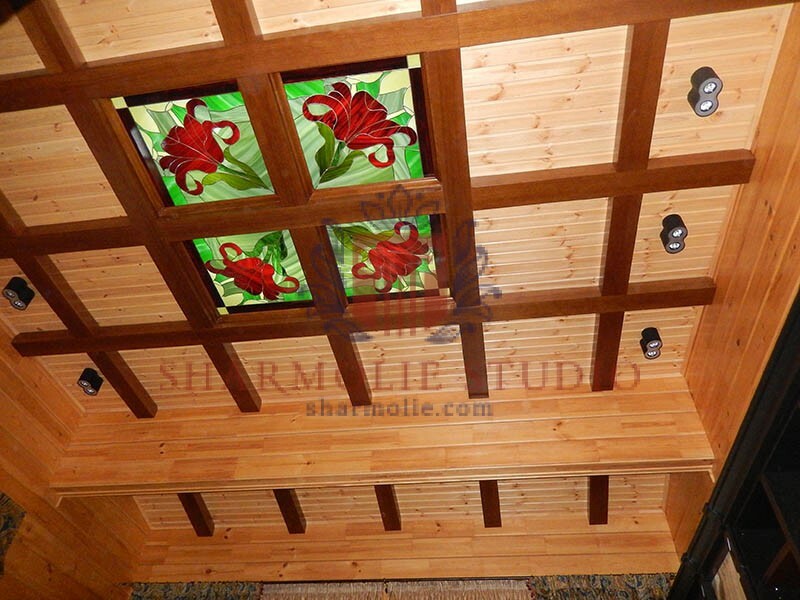 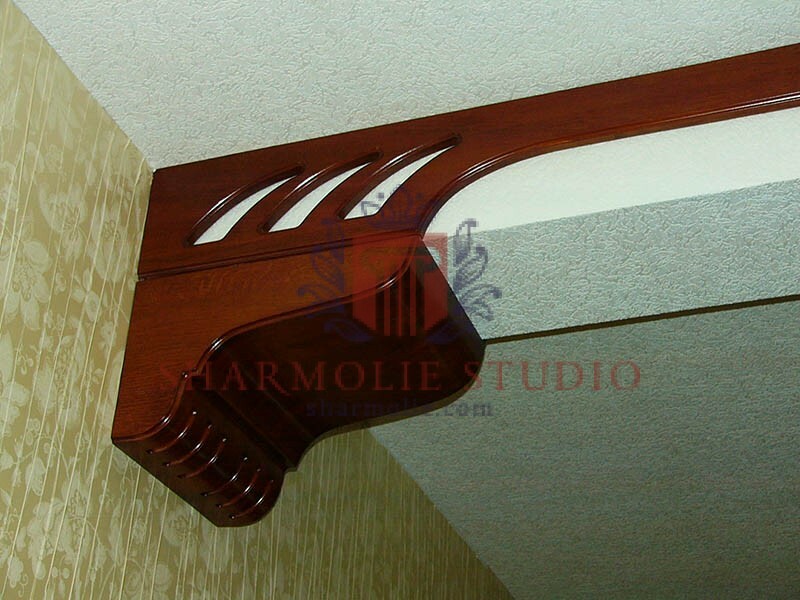 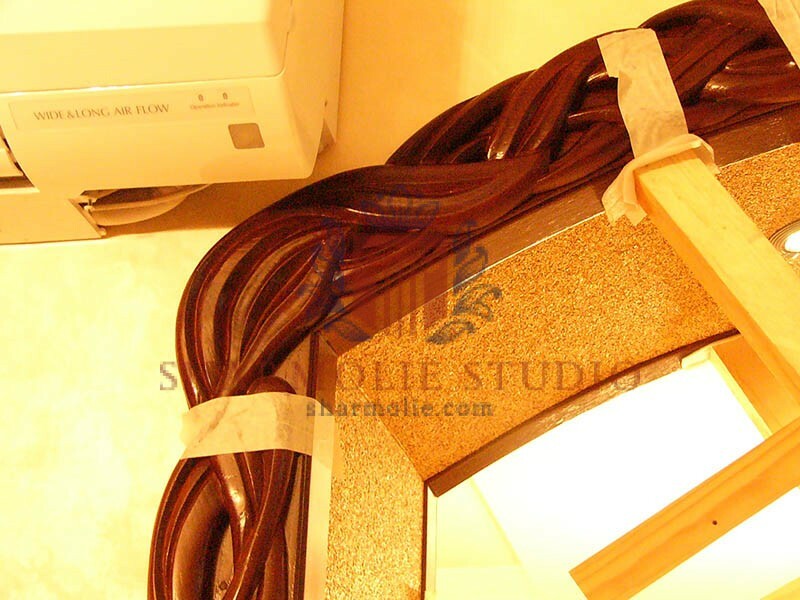 This material is cheaper than the solid wood and for some varieties of the product it fits better. 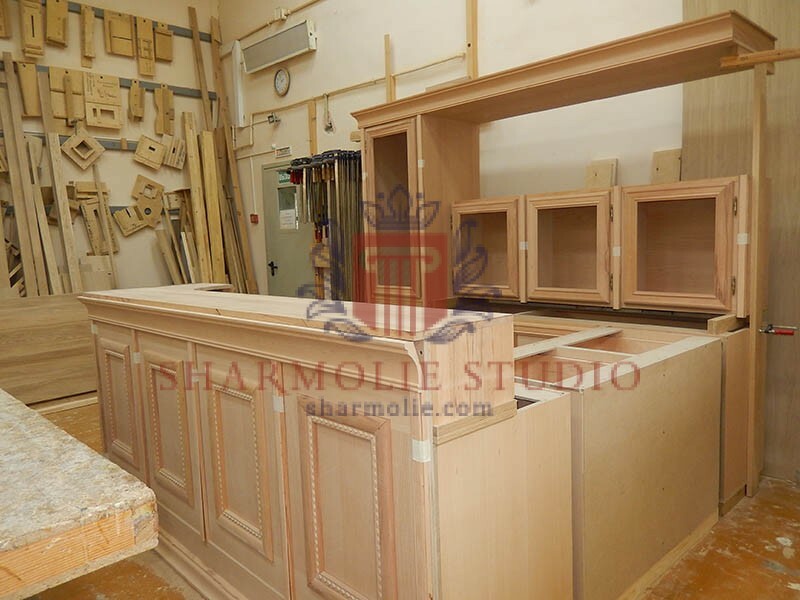 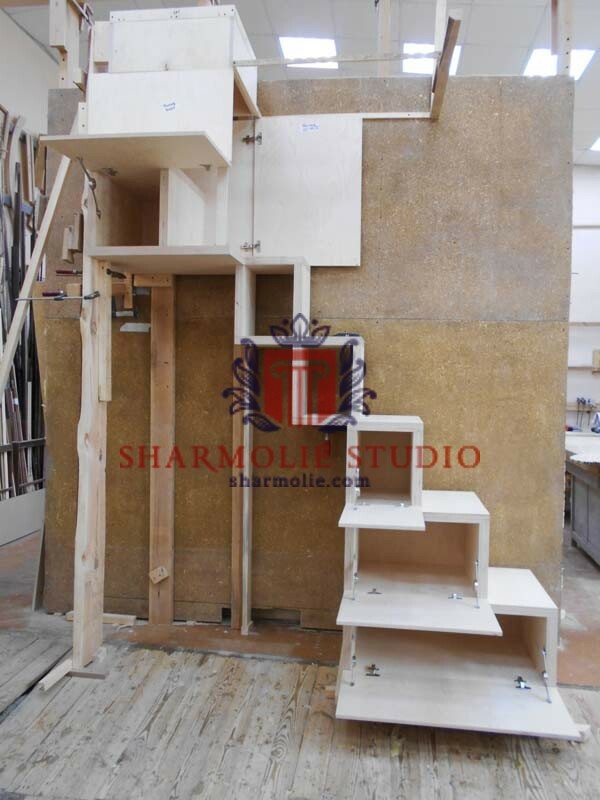 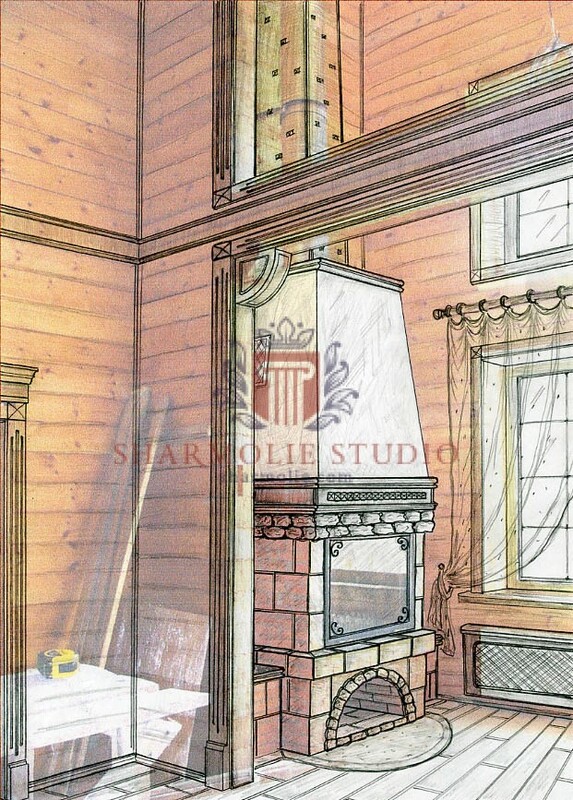 As a result, you can assemble items from it in your apartment or country house, don’t be afraid of high cost. 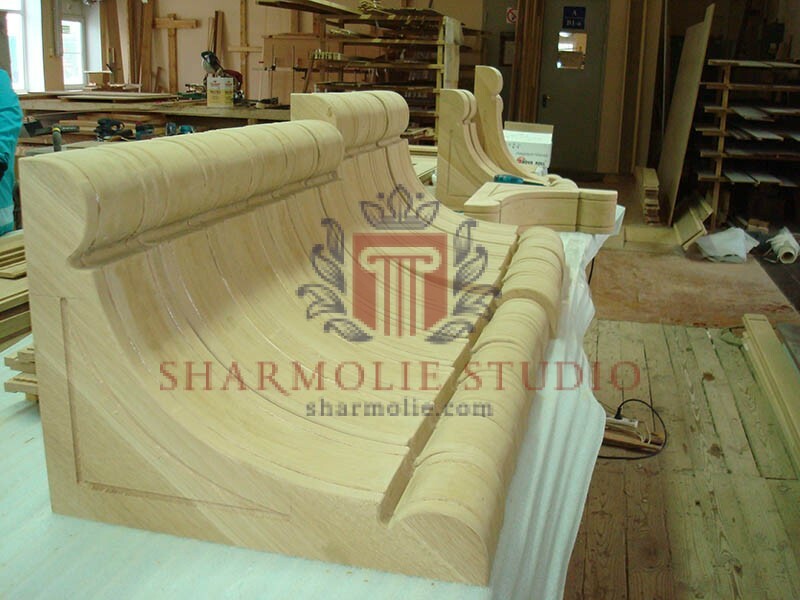 It’s aesthetics is another important feature of the material. 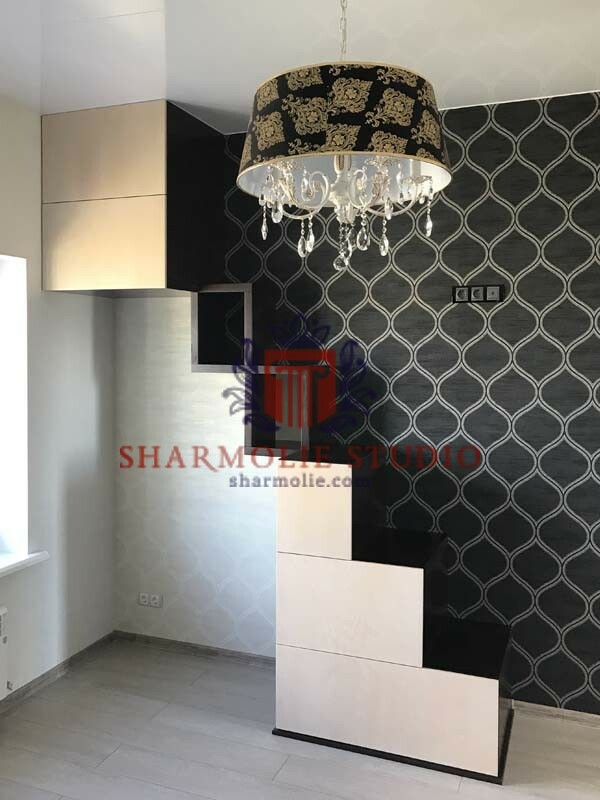 We work with your space and turn your needs, image and desires into a new, vibrant environment that all family enjoy living in. 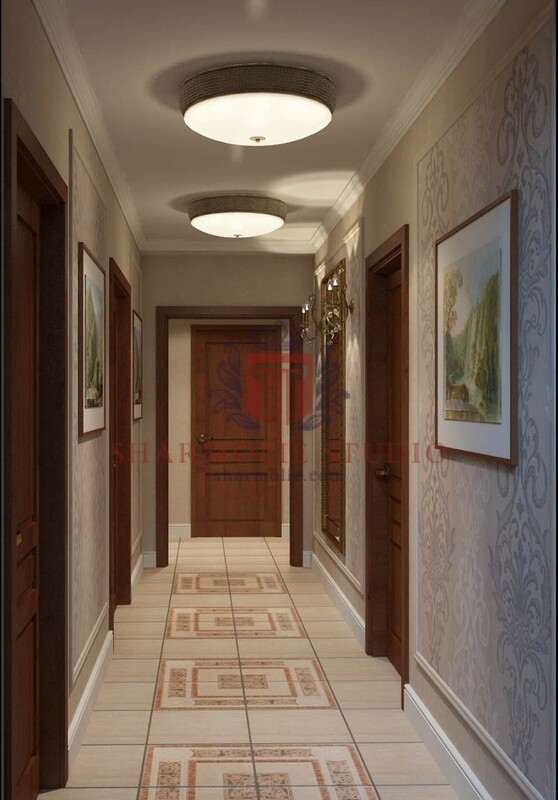 Our design teams optimize the flow of the room and create clean, cohesive decor that welcomes your guests and creates lasting first impressions. 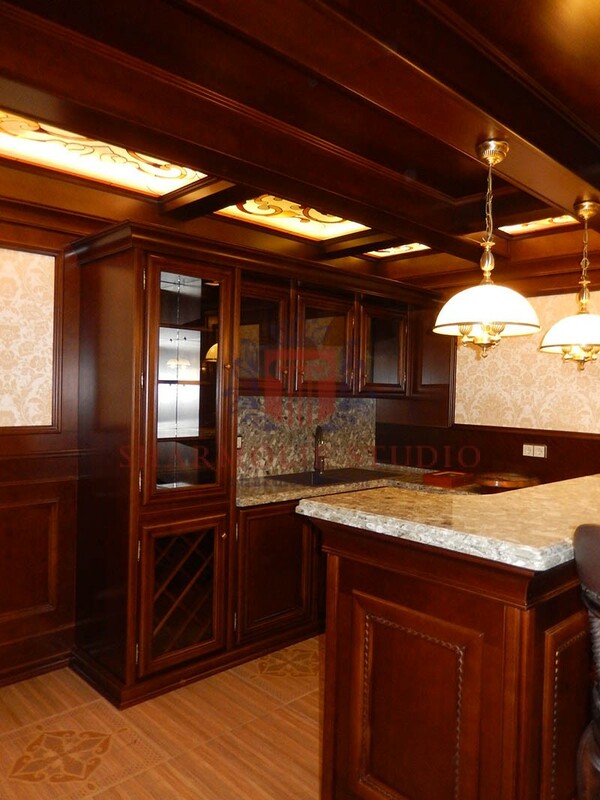 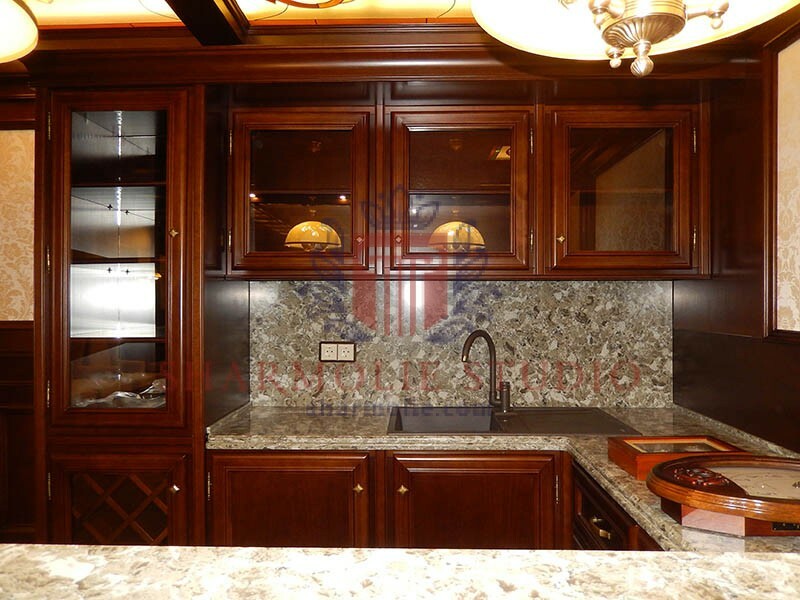 Each space is designed to maximize efficiency as well as comfort and class. 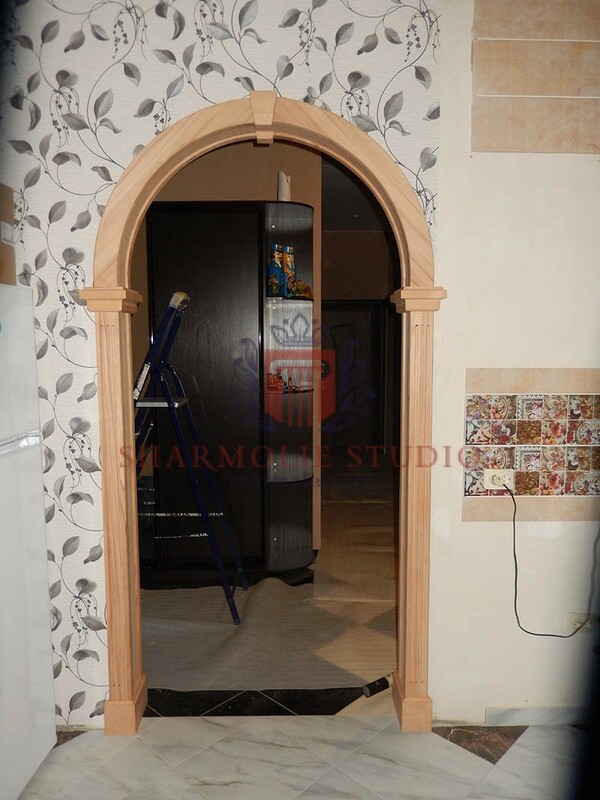 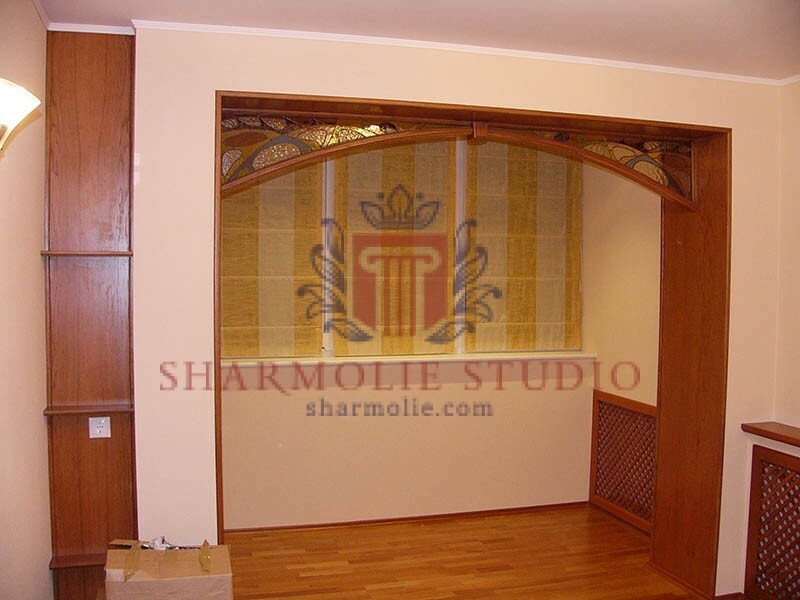 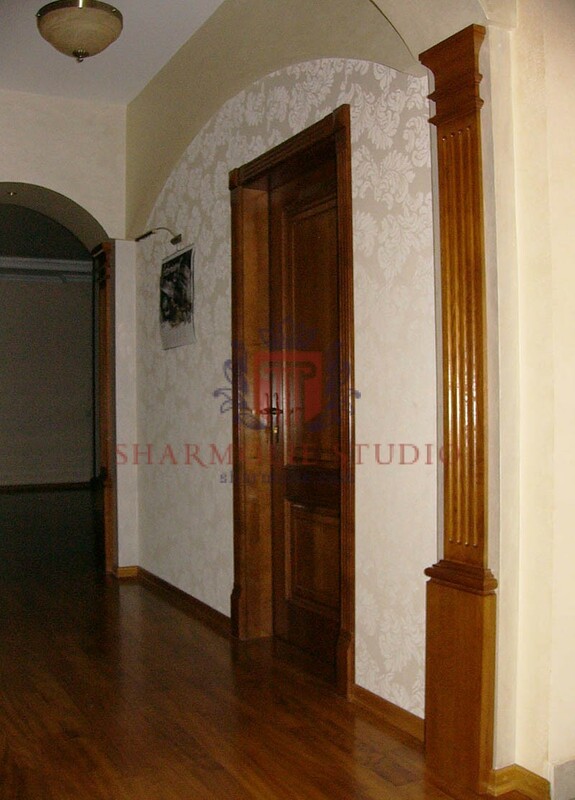 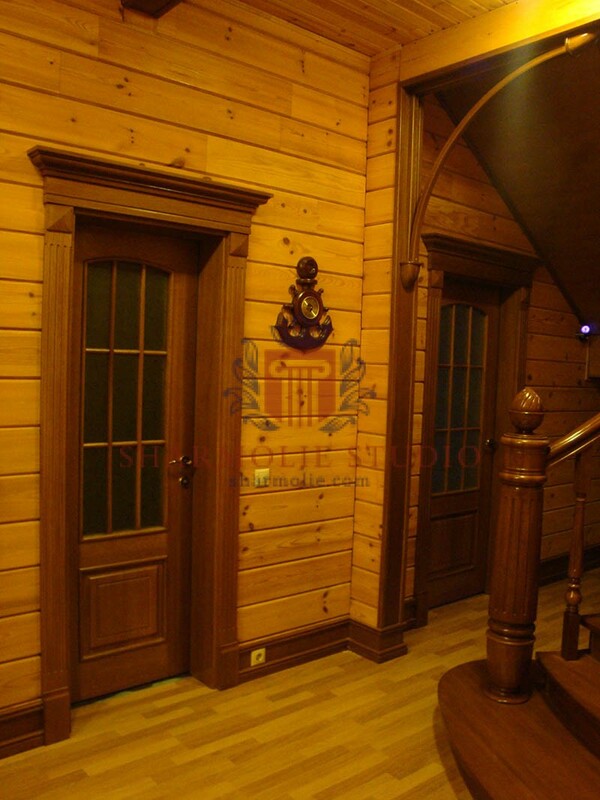 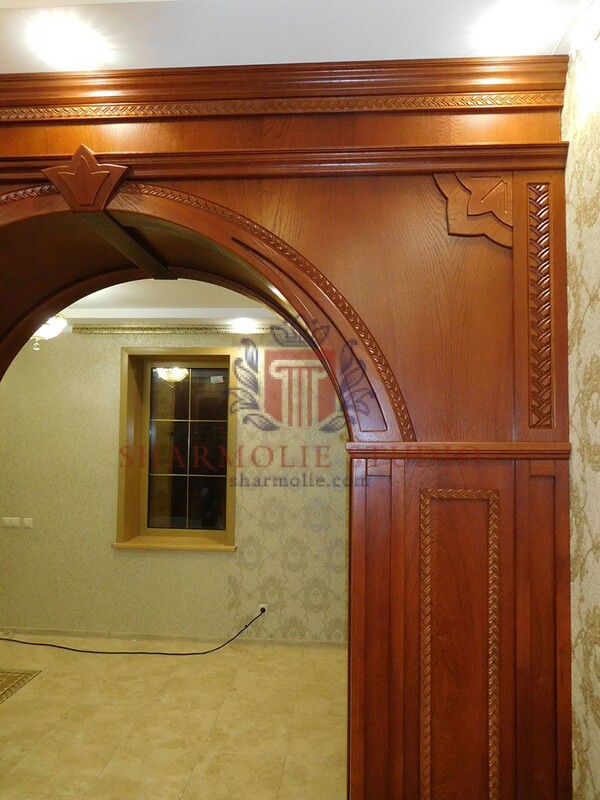 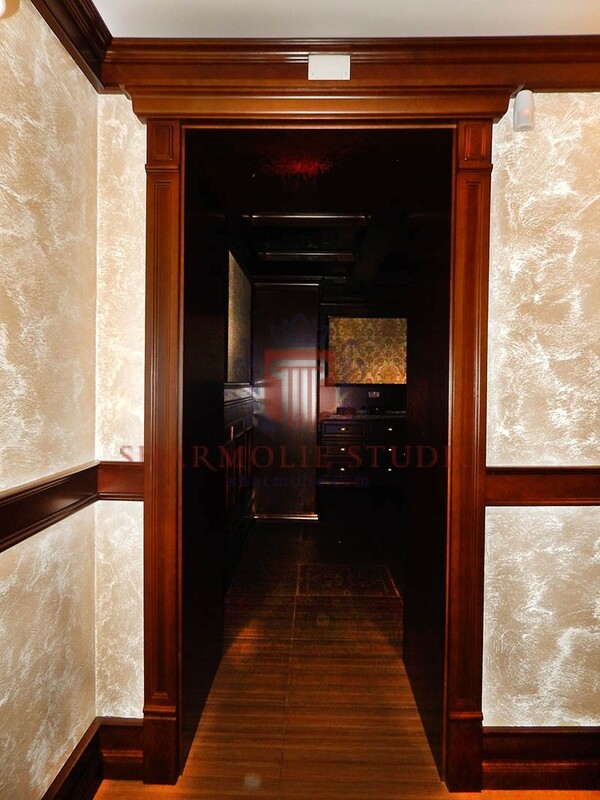 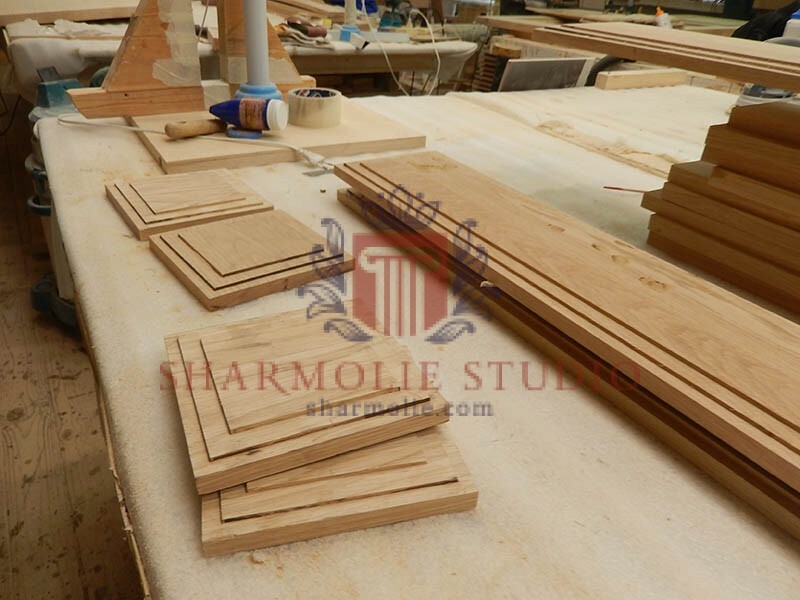 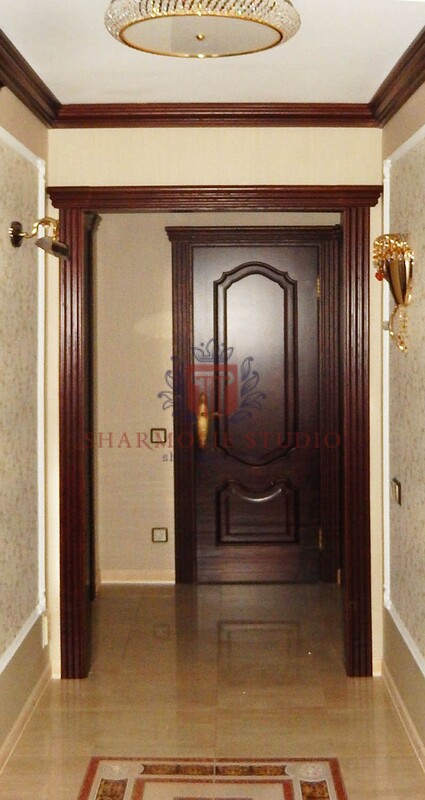 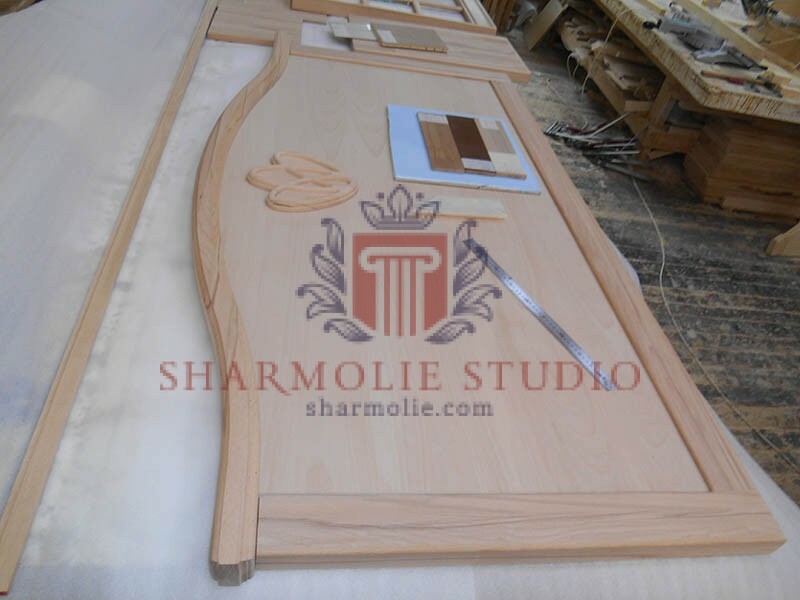 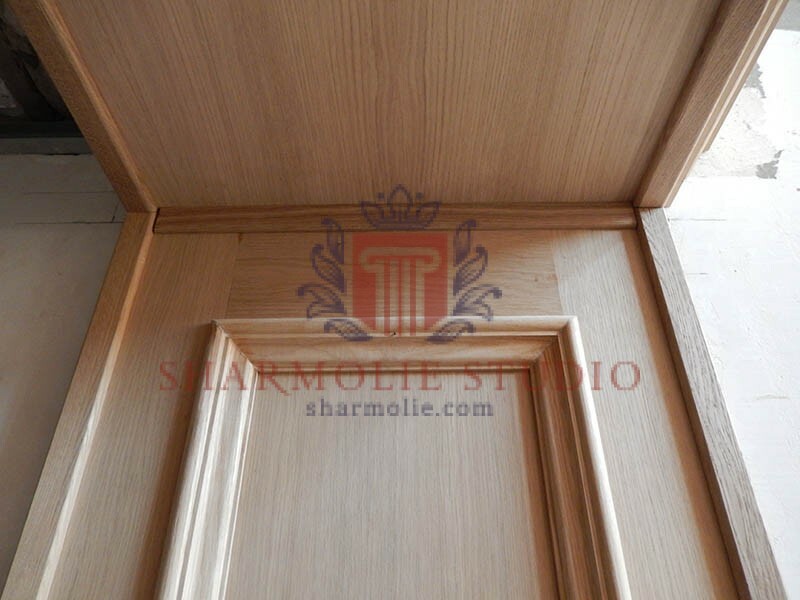 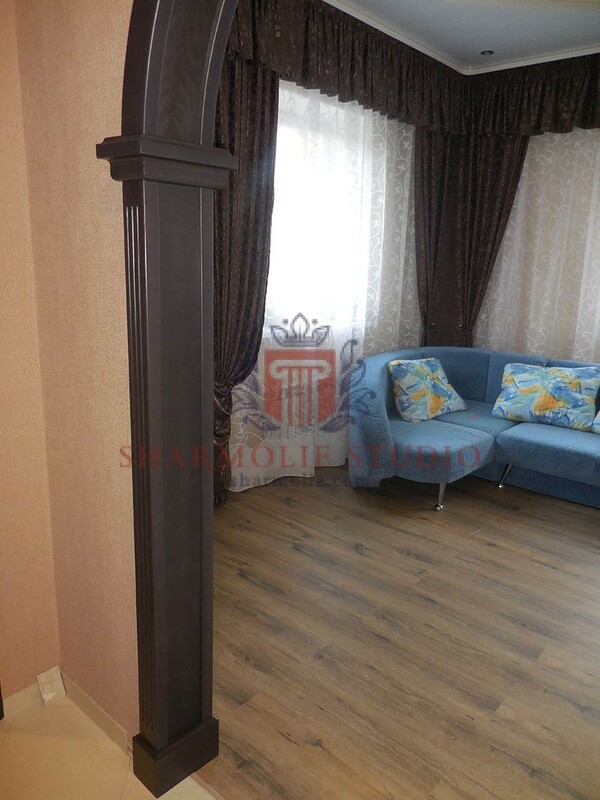 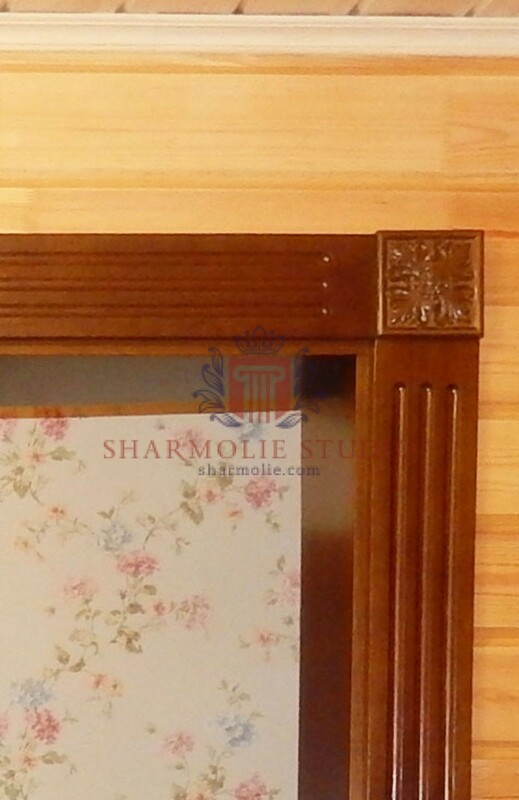 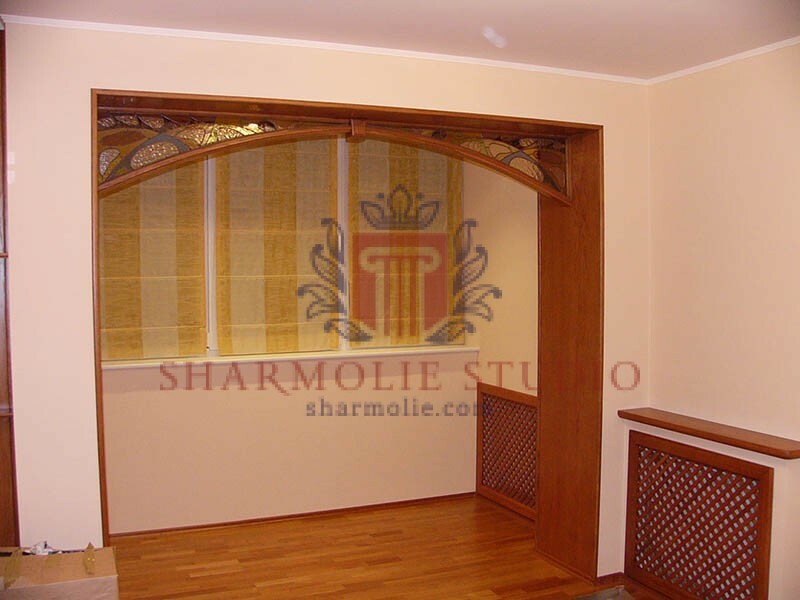 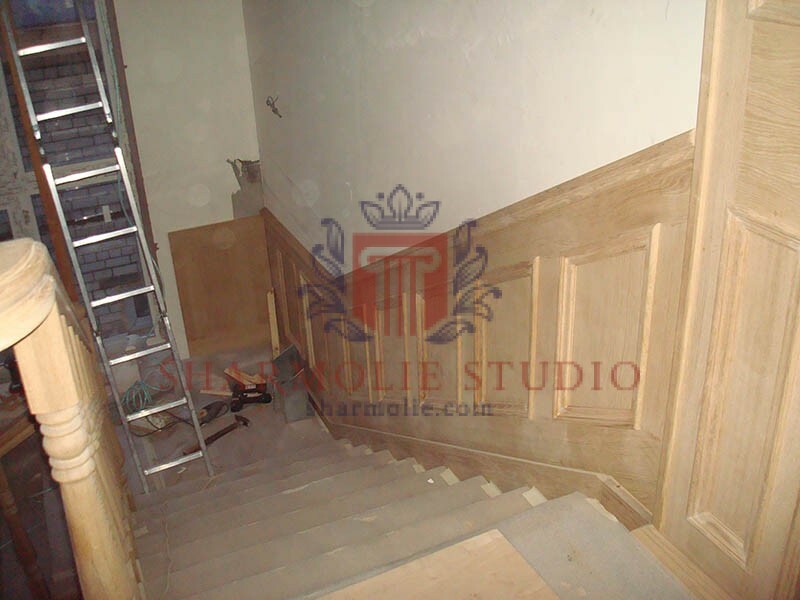 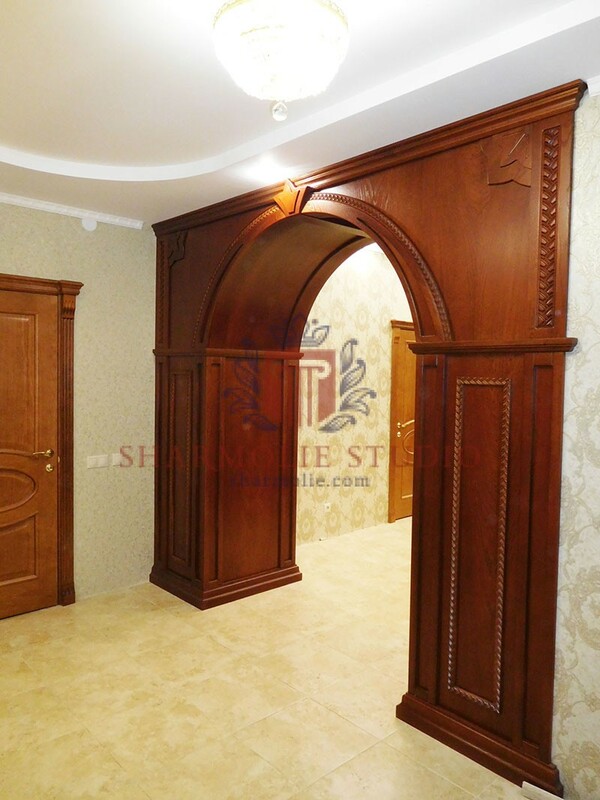 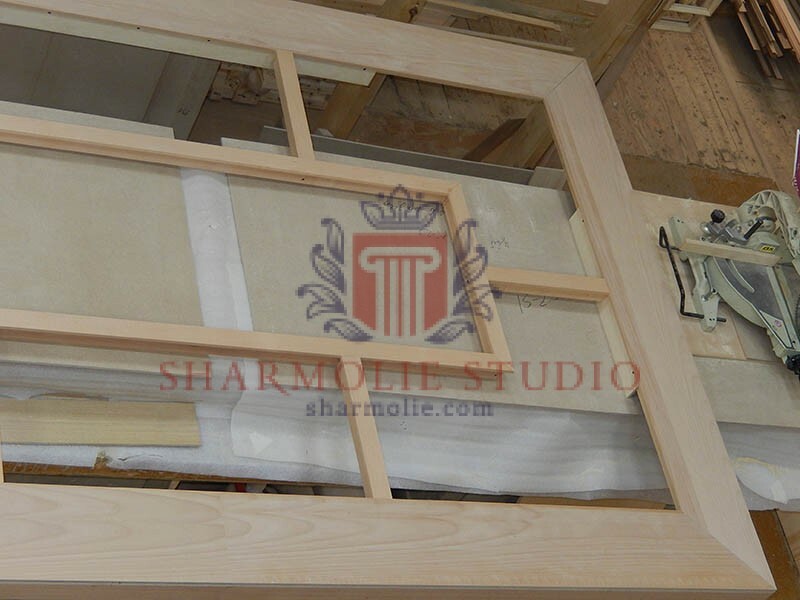 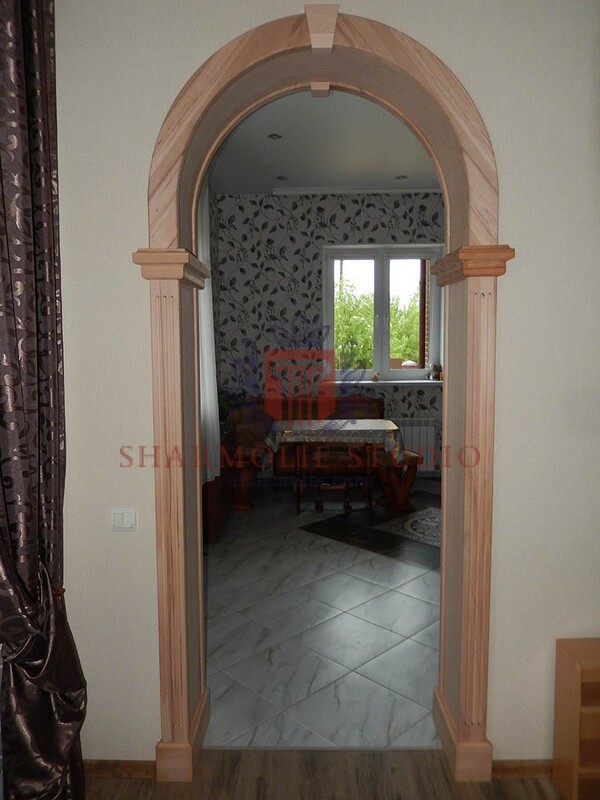 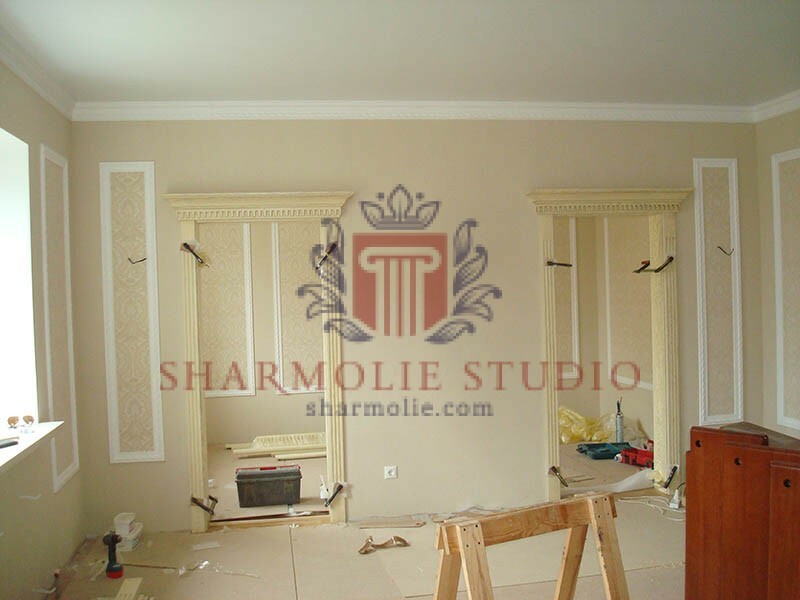 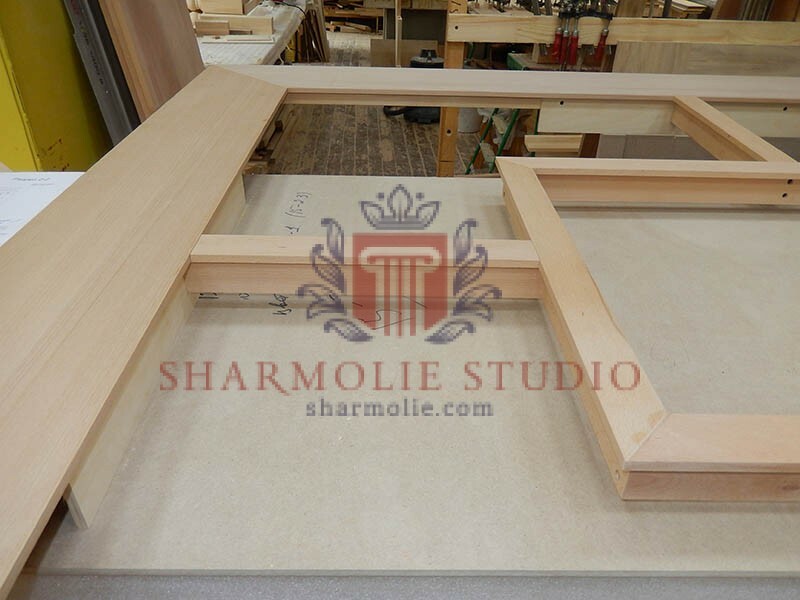 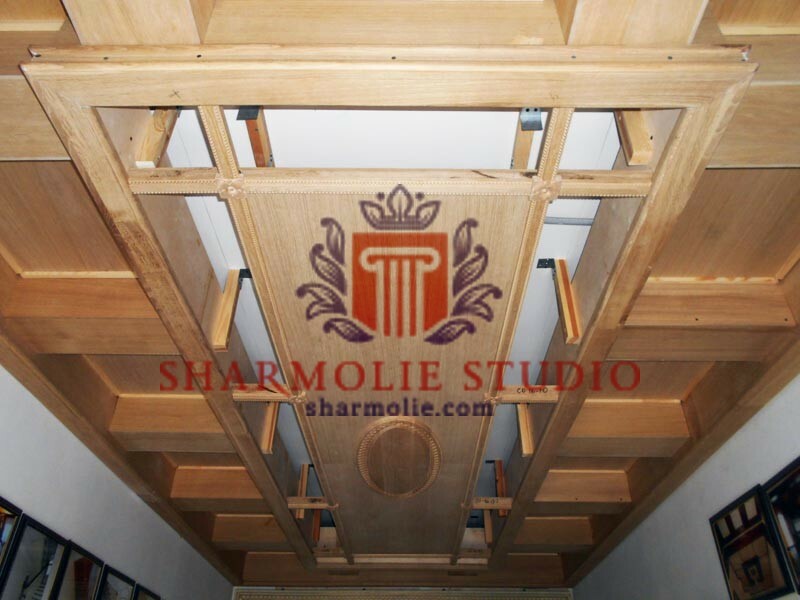 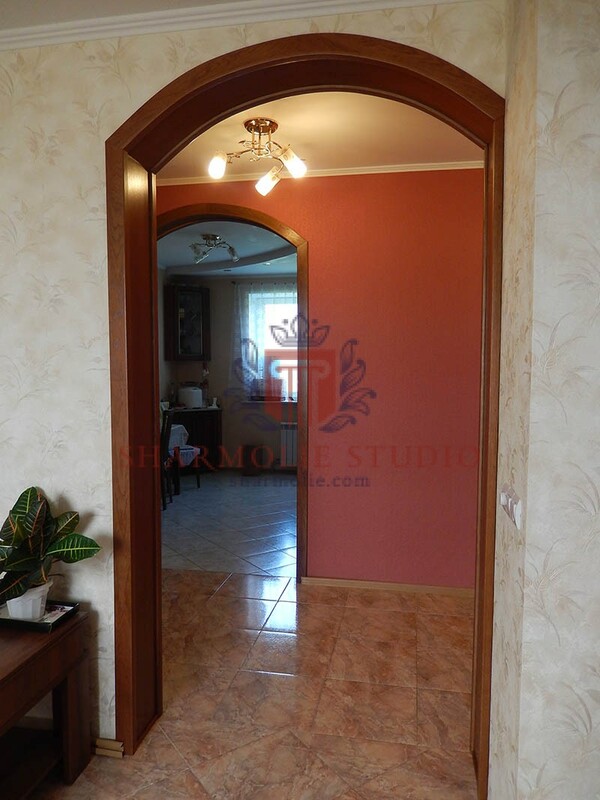 I ordered from Lesomodulya wooden door, the result is very happy. 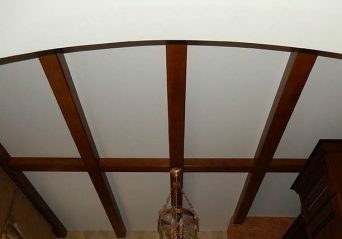 Brigade installation worked quickly and accurately. 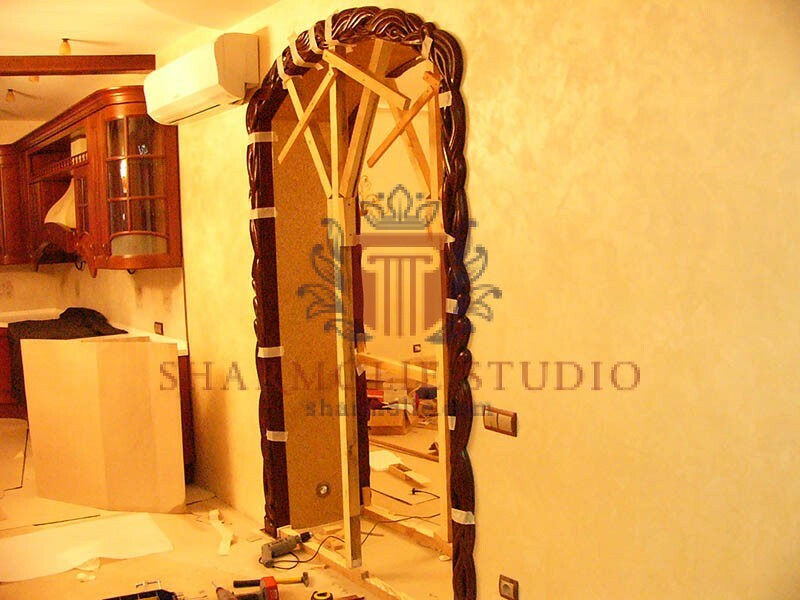 The guys are very polite, did everything well, removed all the trash after it broke the old door. 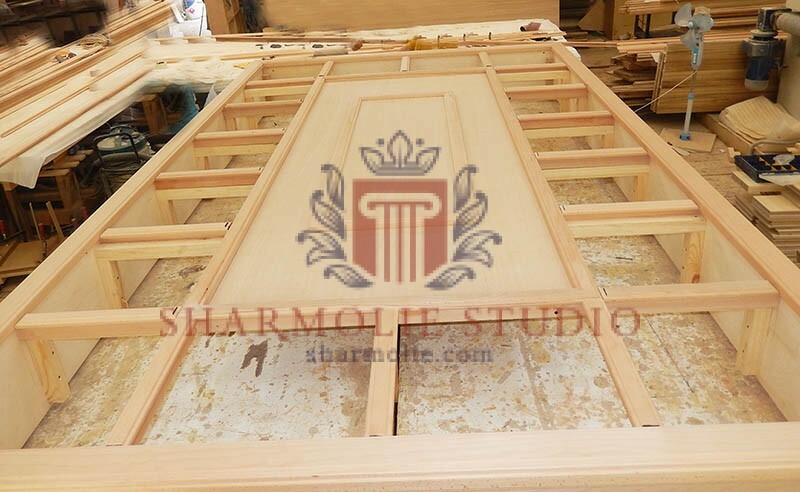 I ordered from Lesomodulya wooden door, the result is very happy. 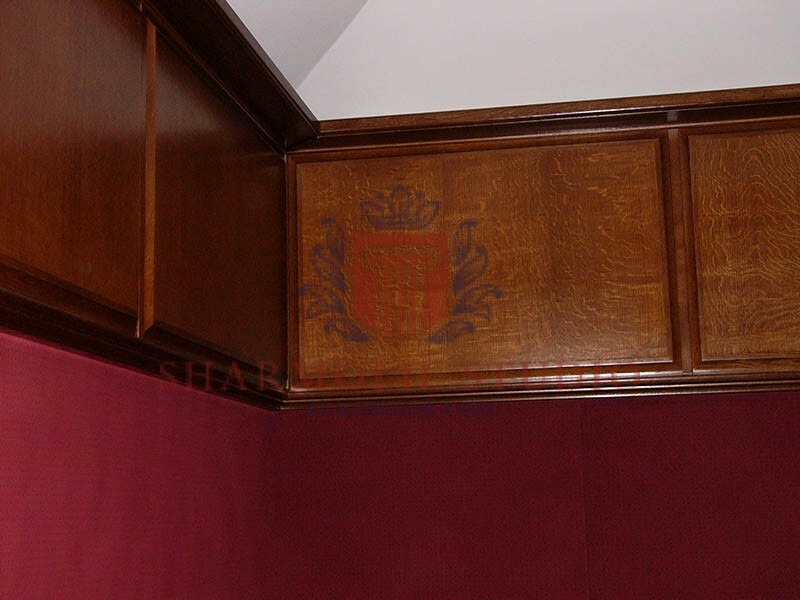 Brigade installation worked quickly and accurately. 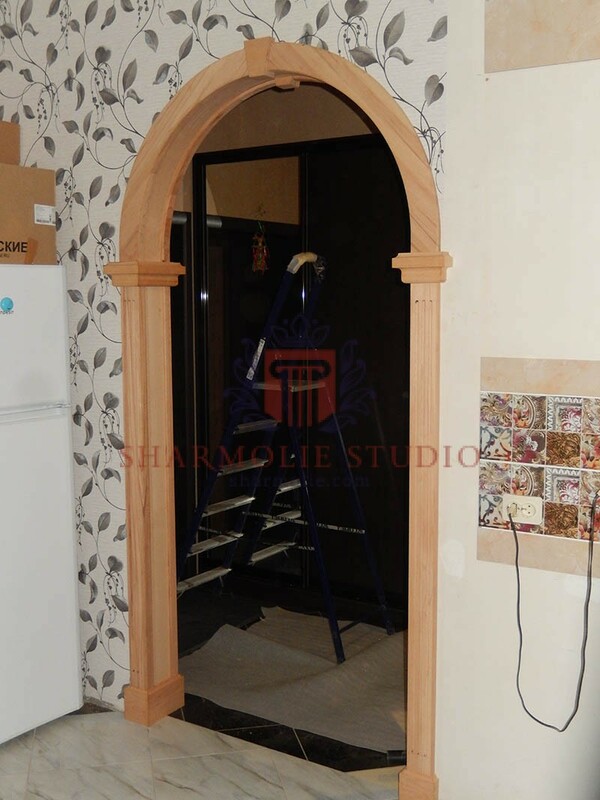 I ordered from Lesomodulya wooden door, the result is very happy. 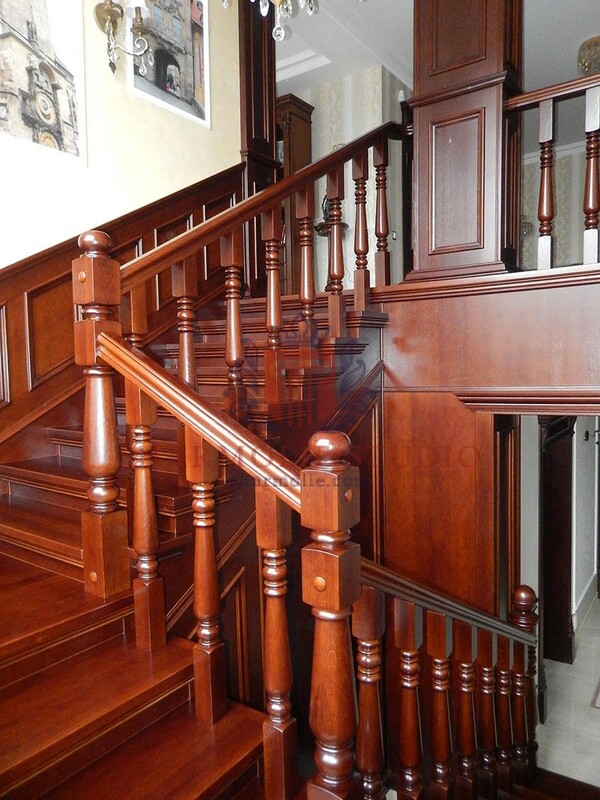 Brigade installation worked quickly and accurately. 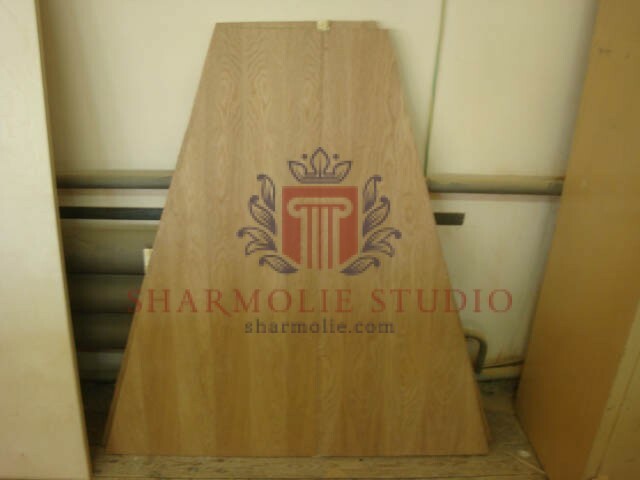 I ordered from Lesomodulya wooden door, the result is very happy. 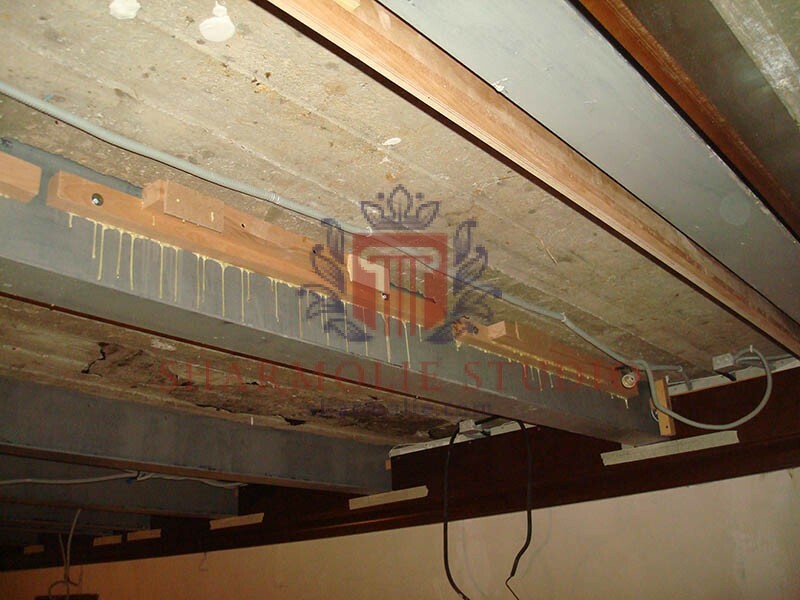 Brigade installation worked quickly and accurately. 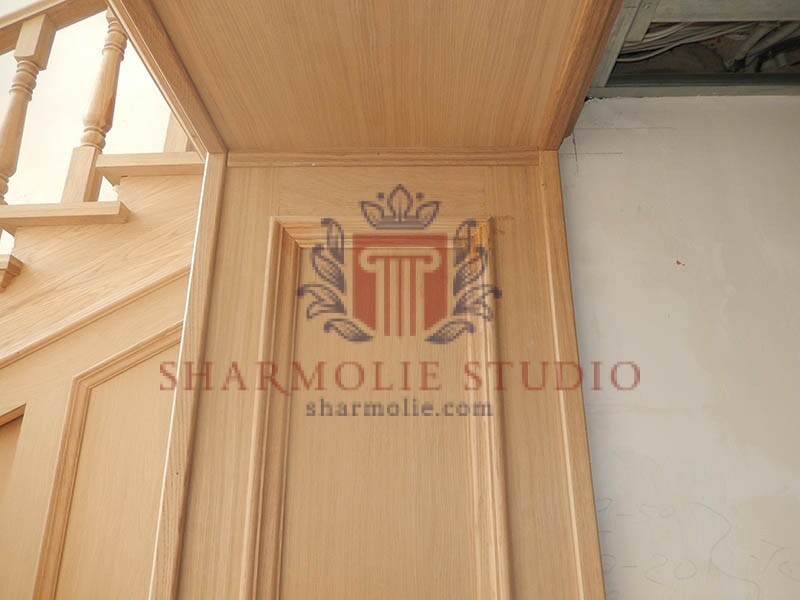 I ordered from Lesomodulya wooden door, the result is very happy. 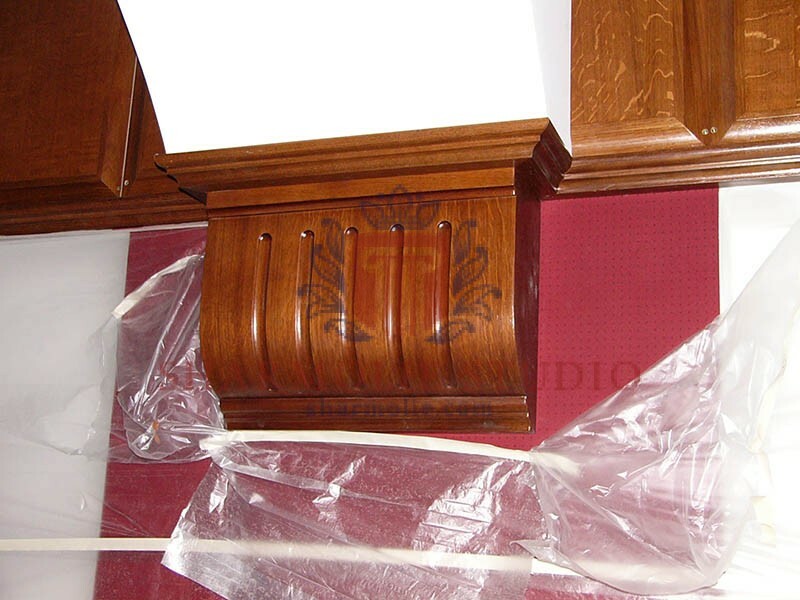 Brigade installation worked quickly and accurately. 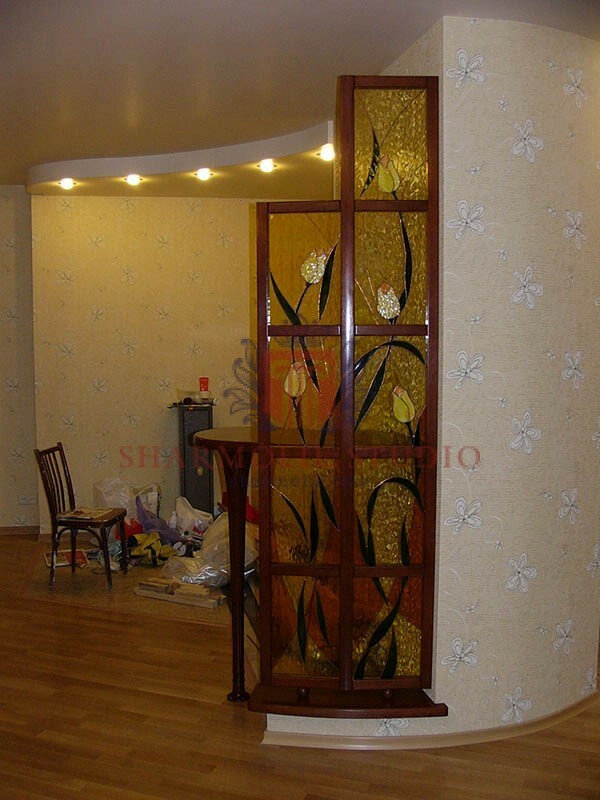 It is very important to deliver decor elements carefully and in time. 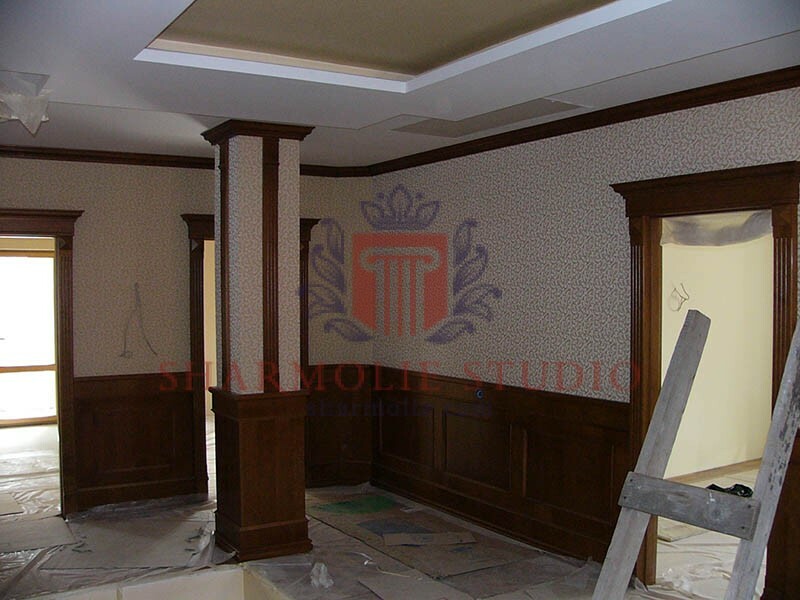 Our clients even can’t imagine what serious and professional work should be done. 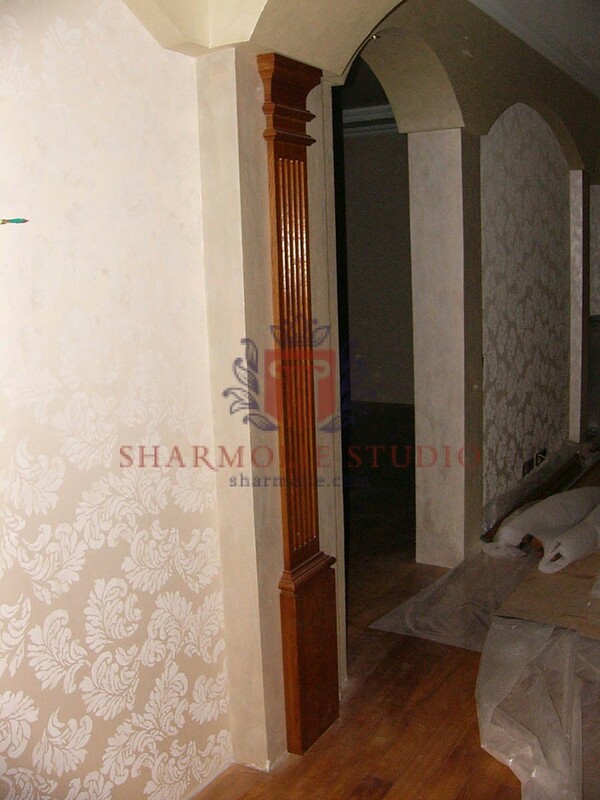 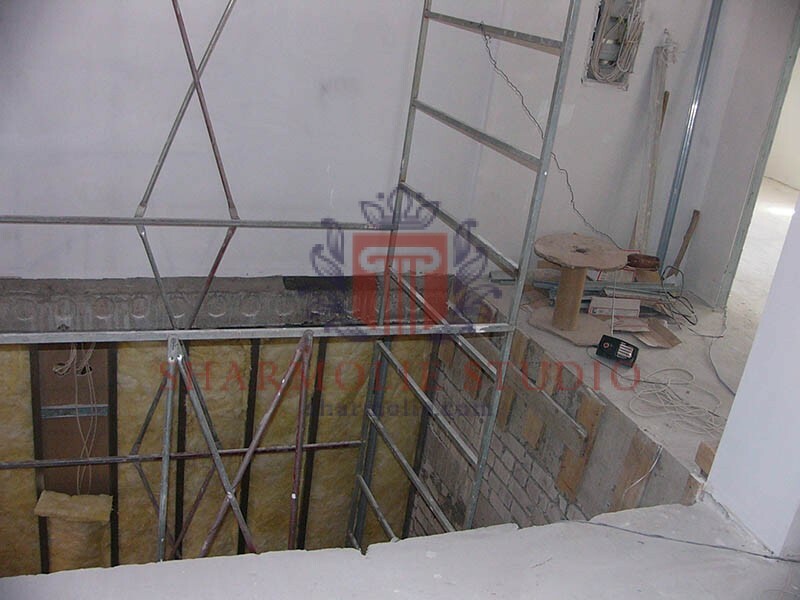 That’s why we thing about it at the step of planning decor project. 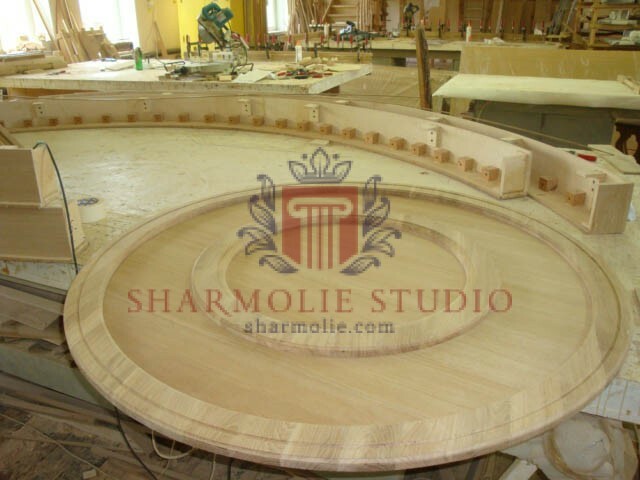 You can come to our manufacture and see all steps of producing. 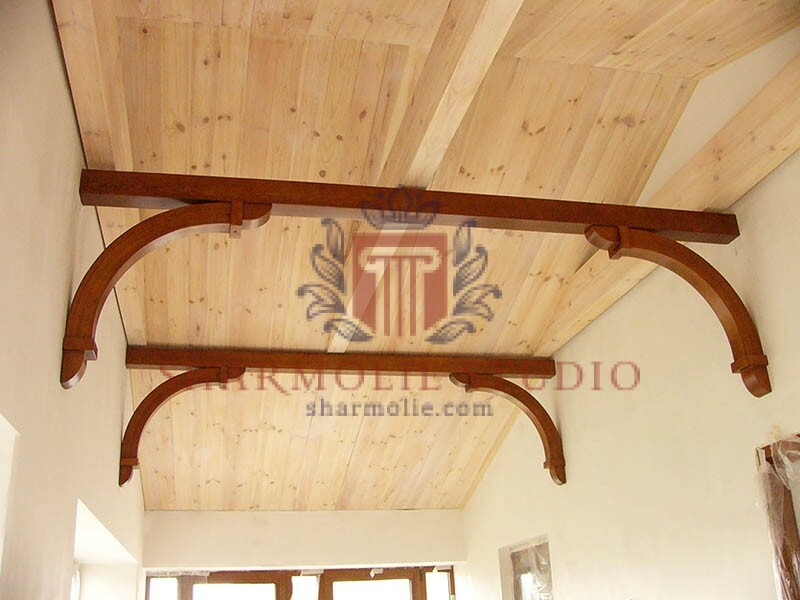 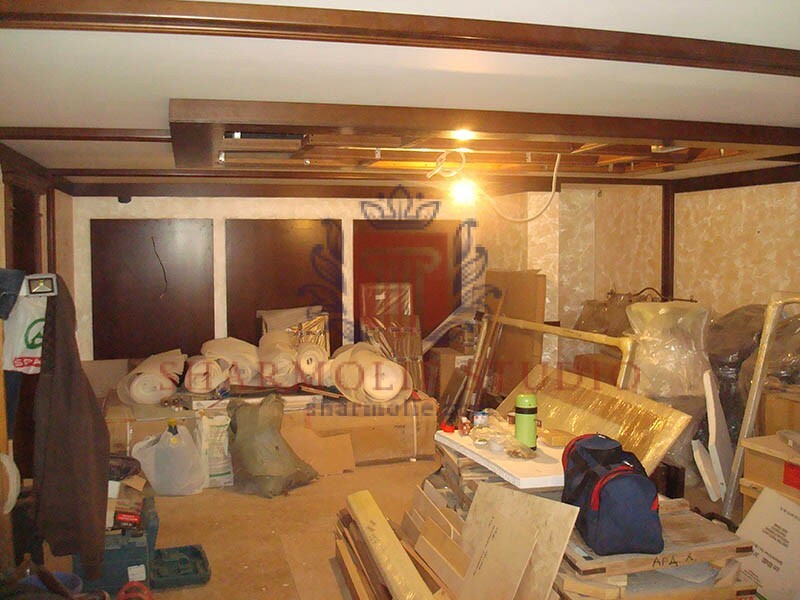 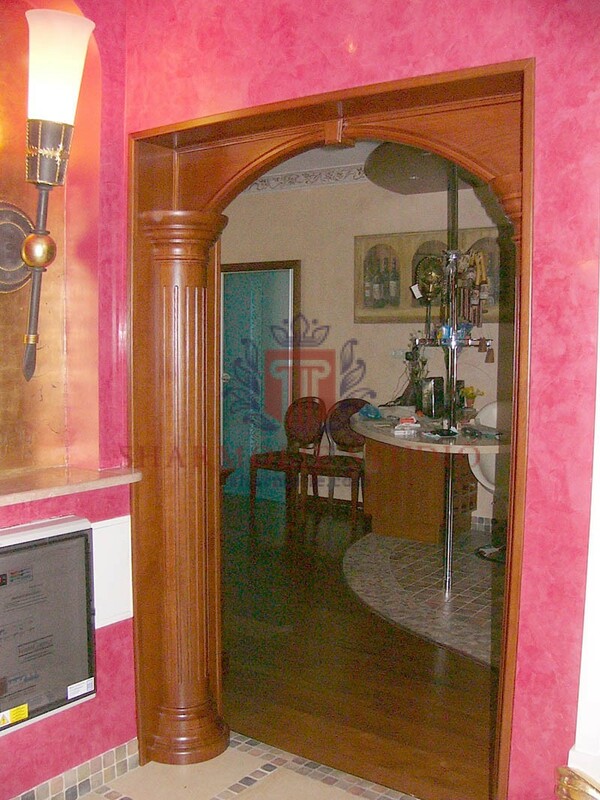 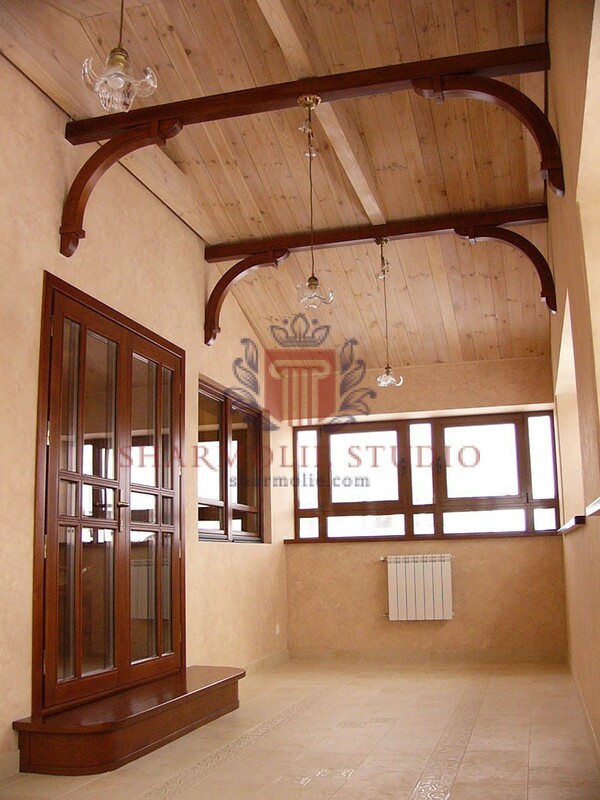 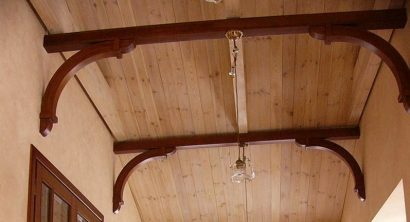 Ceiling beams, arches, portals and decor elements deliver and transport by corporative lorry absolutely free. 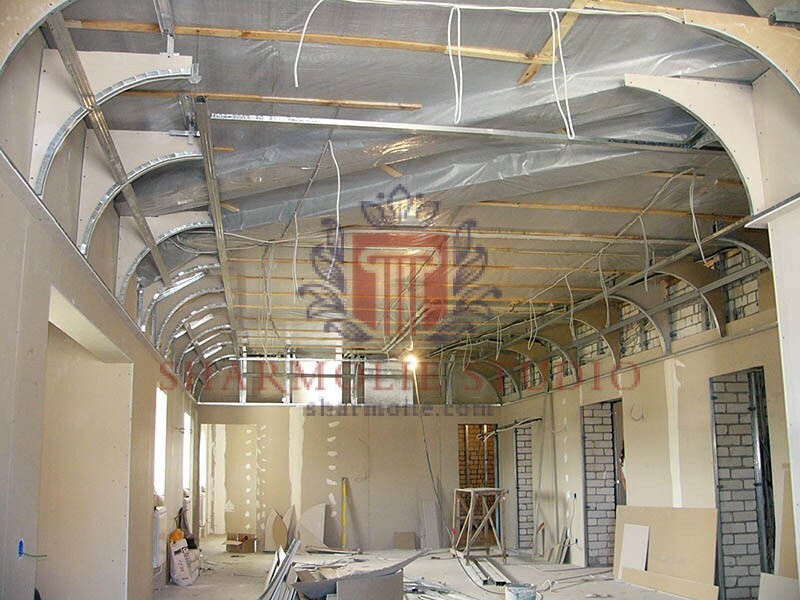 We are suggesting absolutely any kind pay methods’ for you. 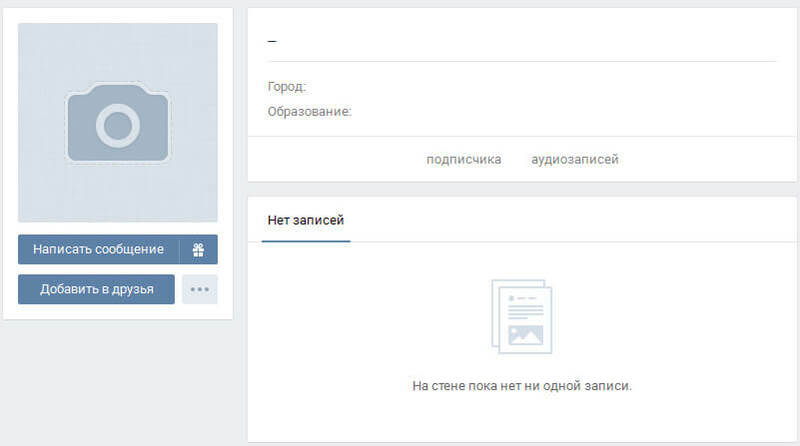 It will be bank transfer or maybe cash payments for our company. 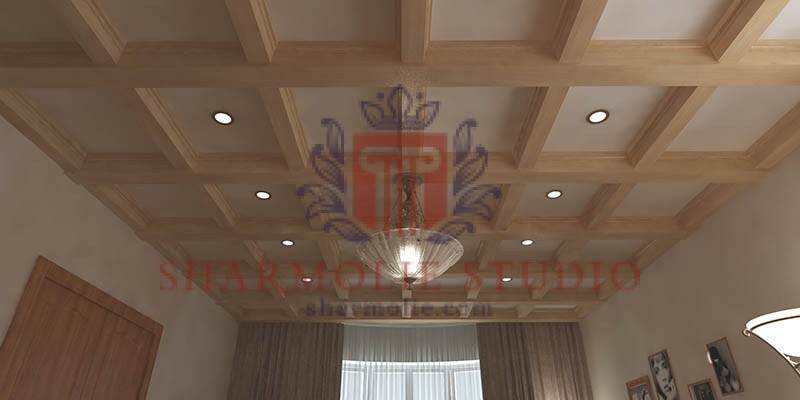 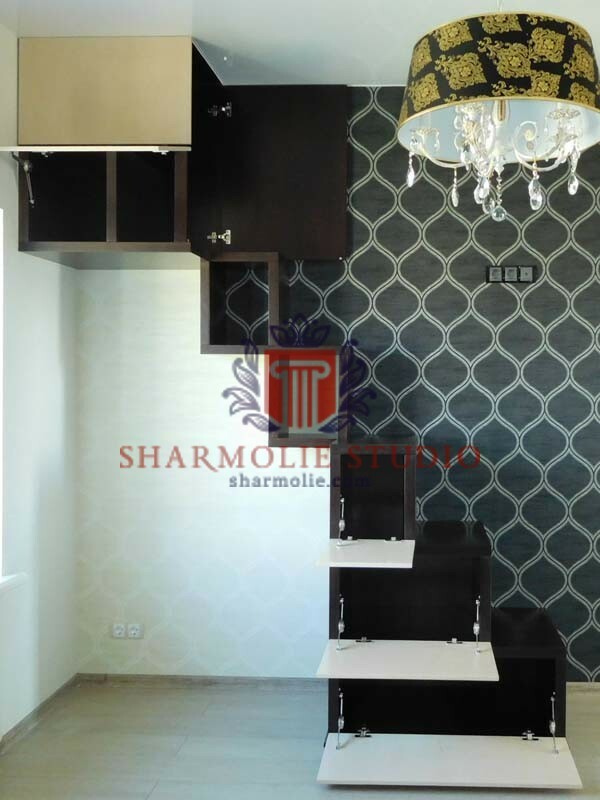 For qualitative assembling decor-project it is very importantly doing special sample, which includes photography’s and agreement specification. 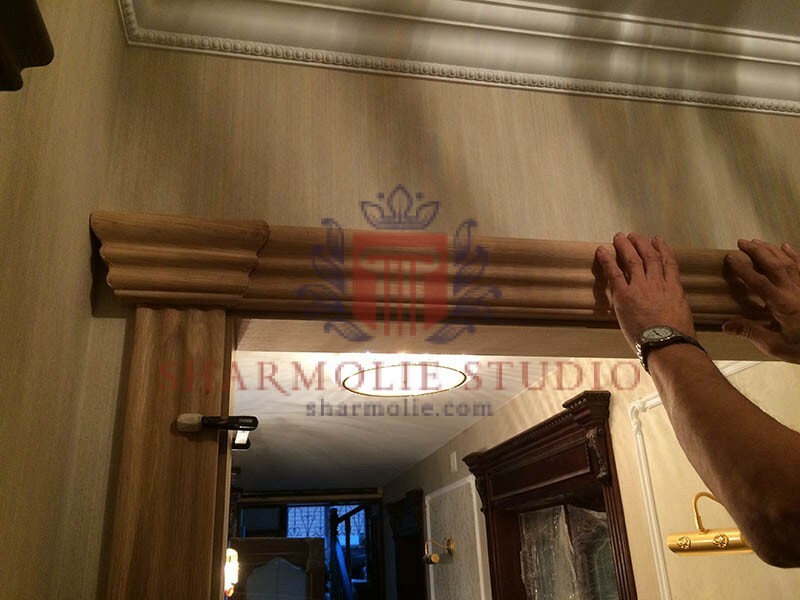 The final assembling of the decor –elements we always does free! 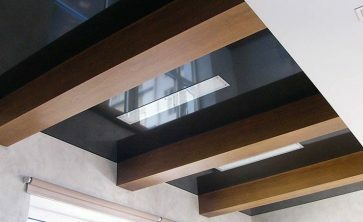 Order it now!